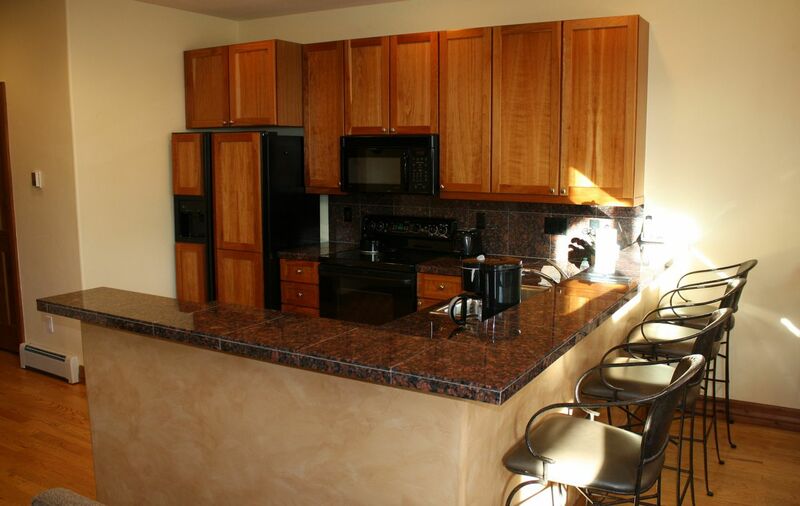 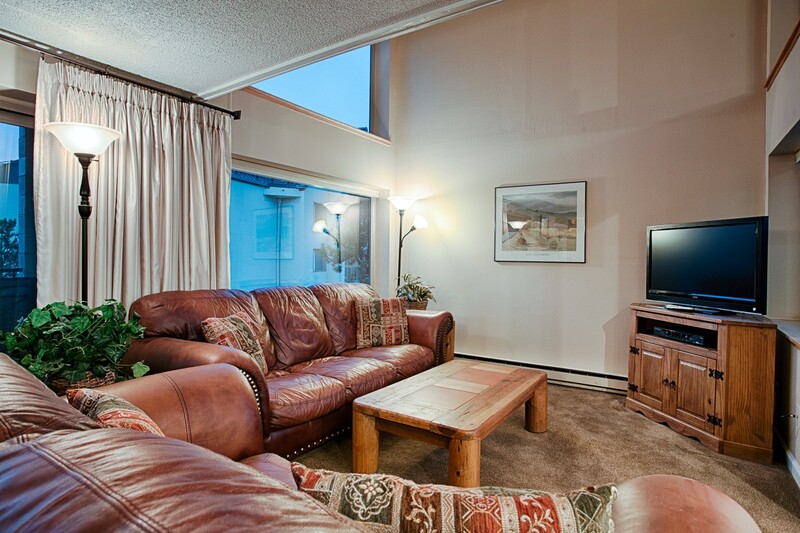 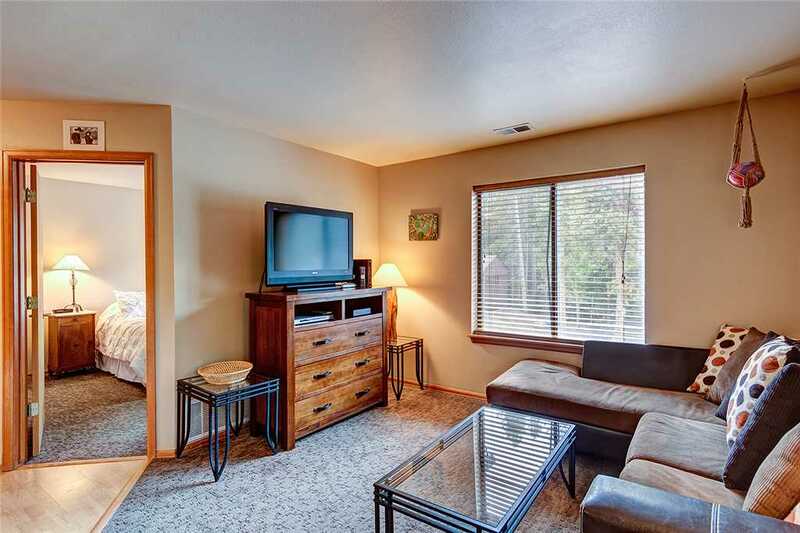 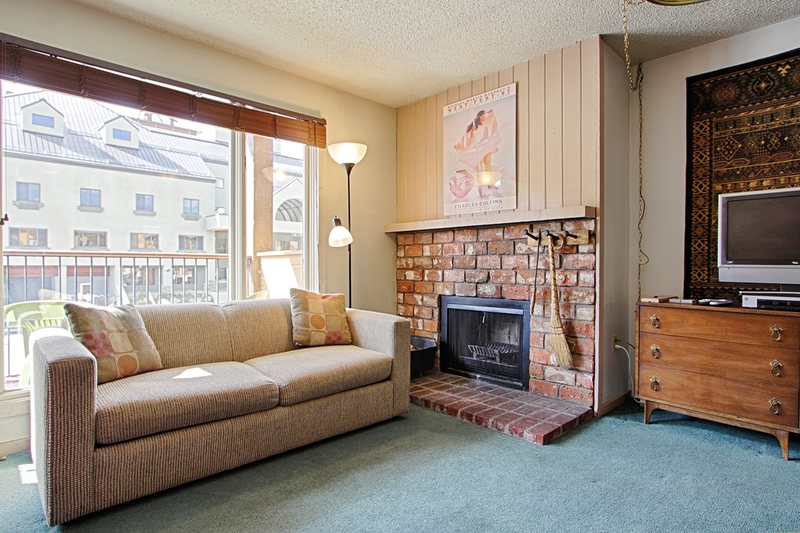 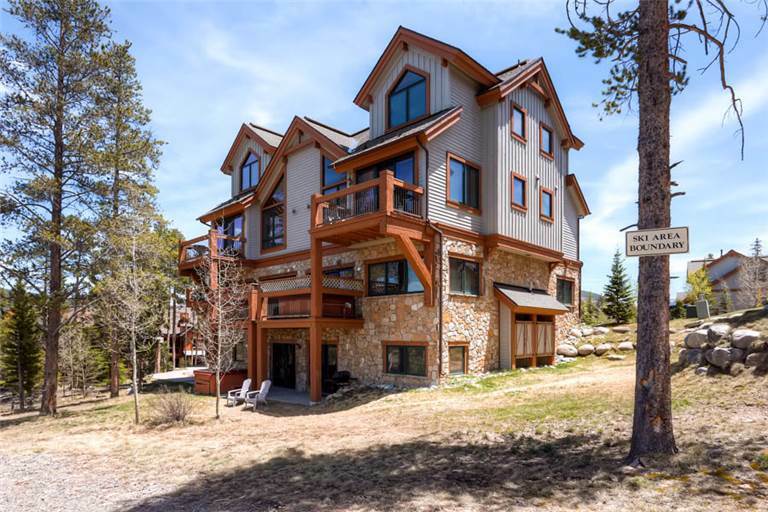 You will find tranquility, privacy and breathtaking panoramic views from this gorgeous townhome. 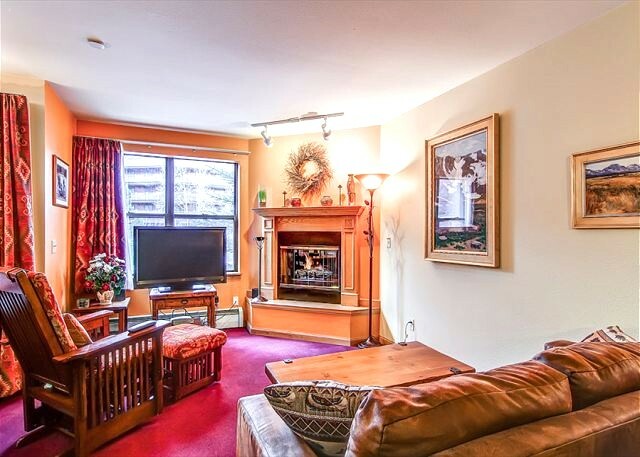 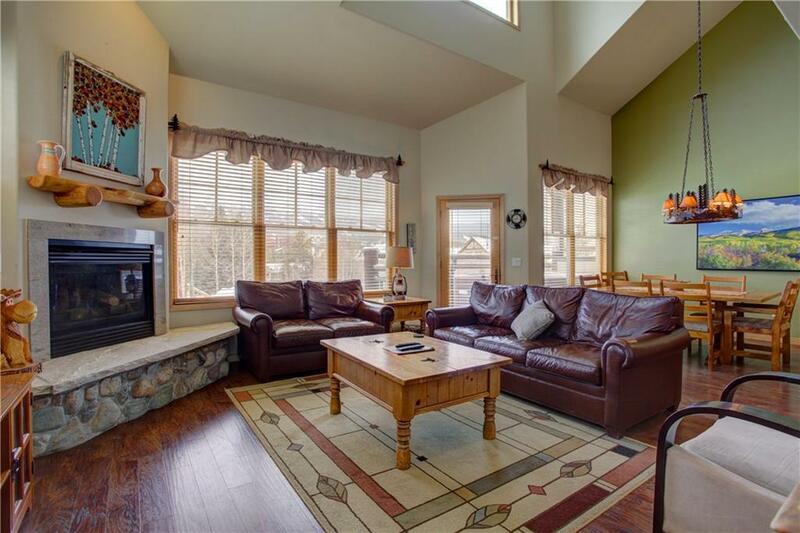 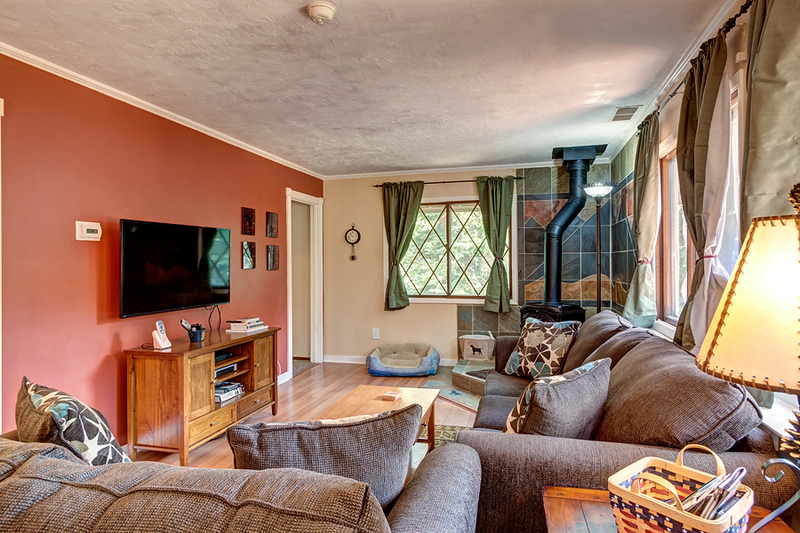 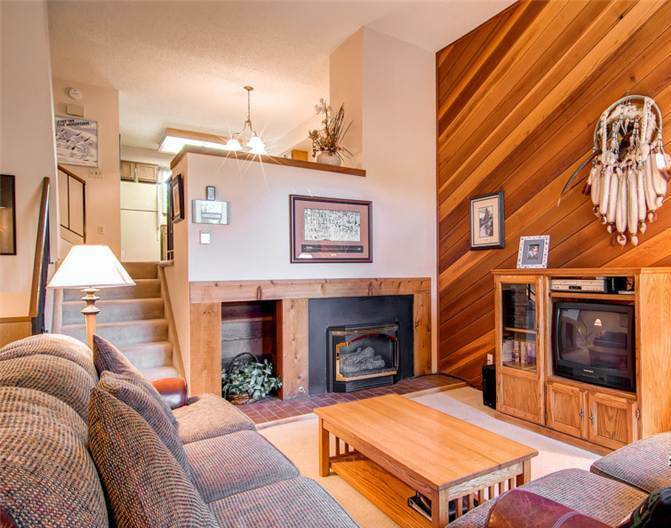 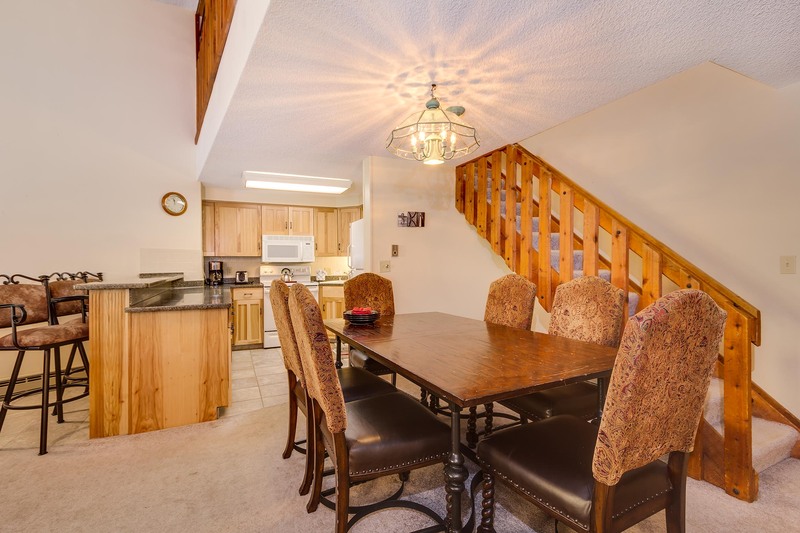 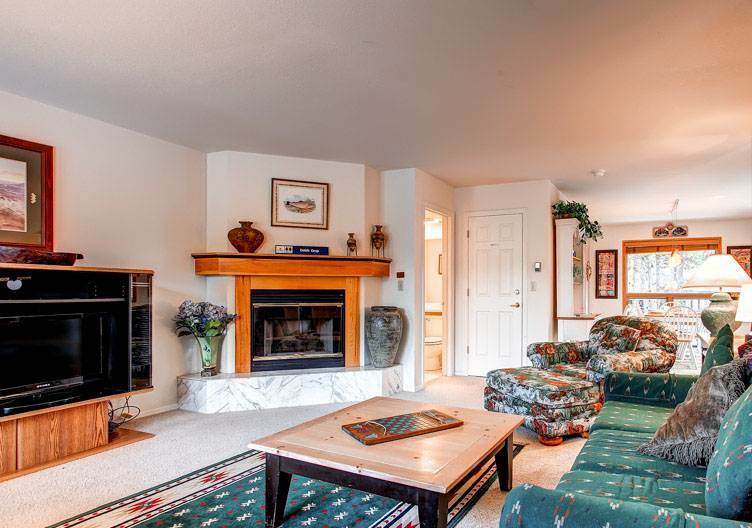 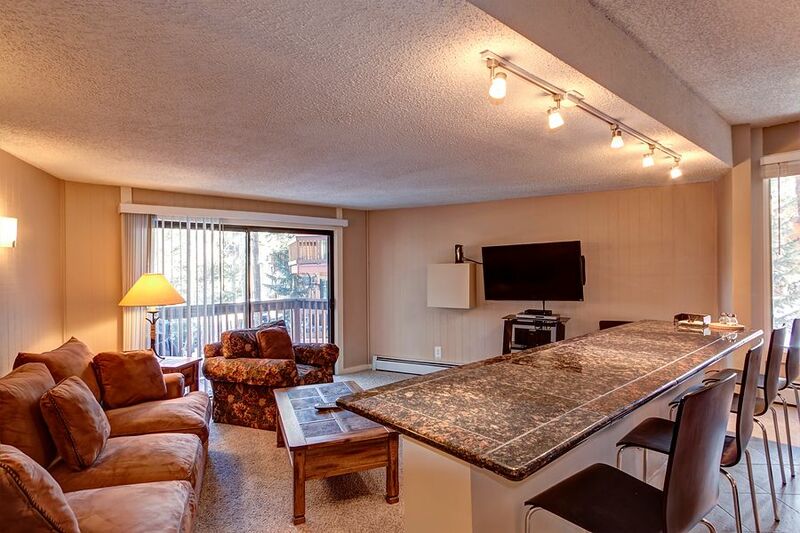 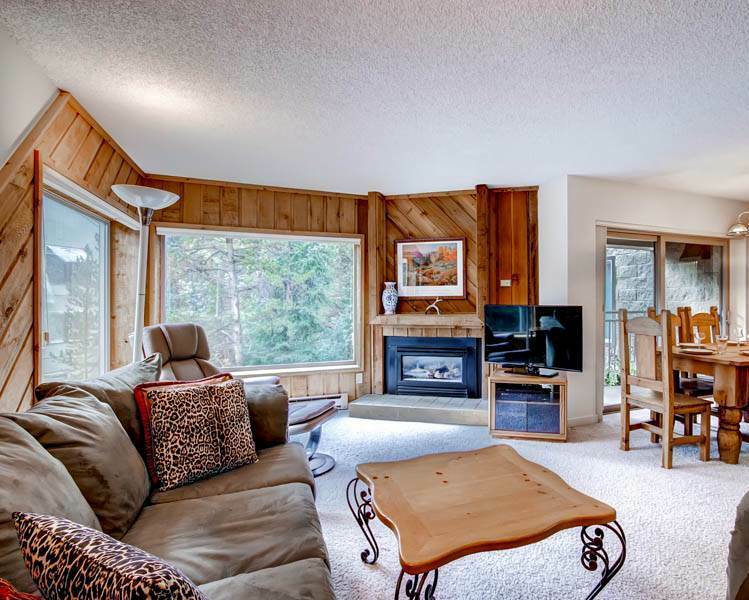 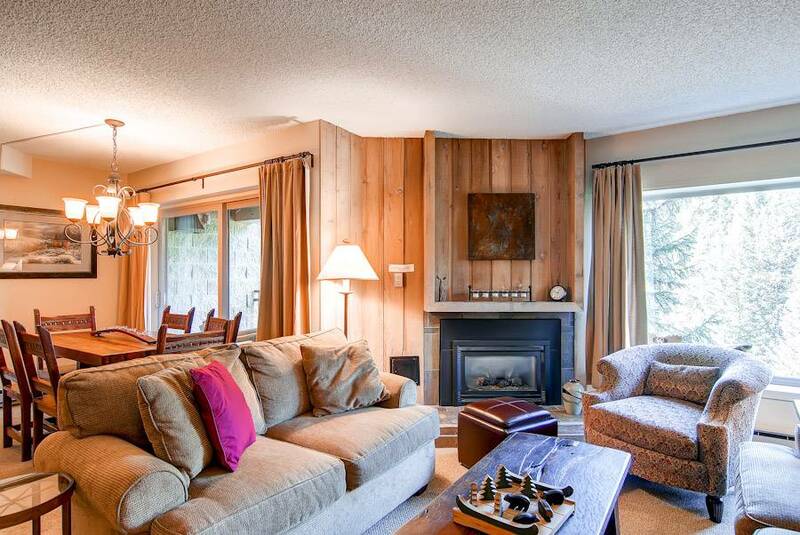 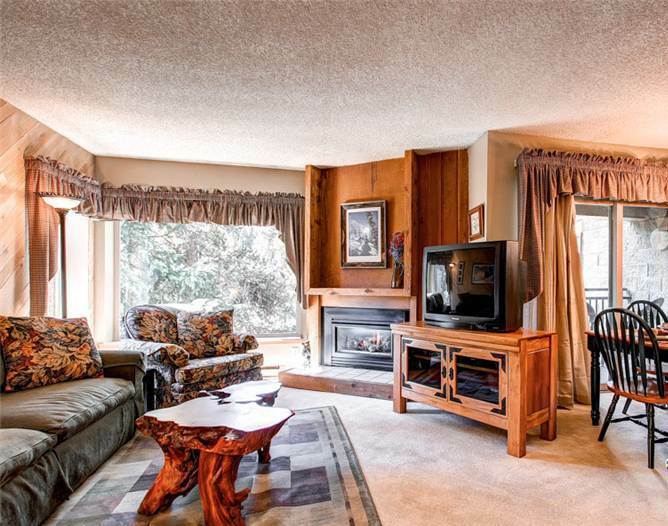 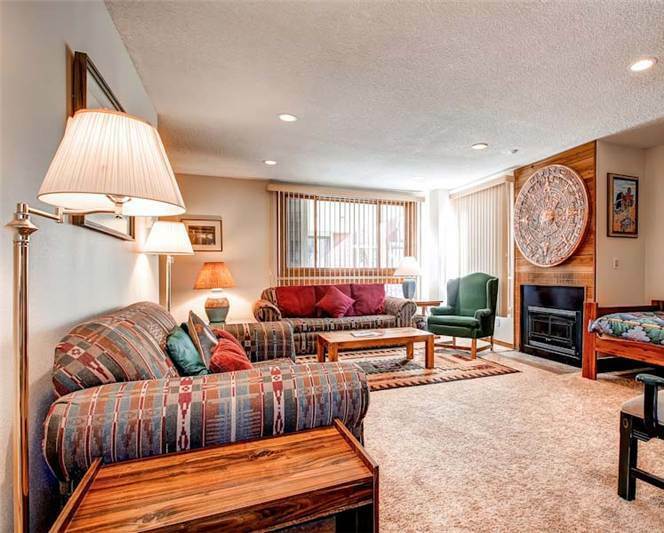 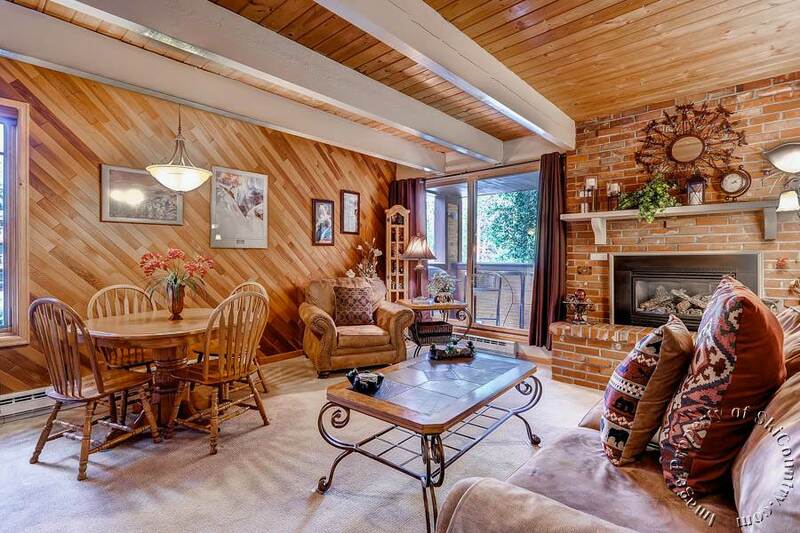 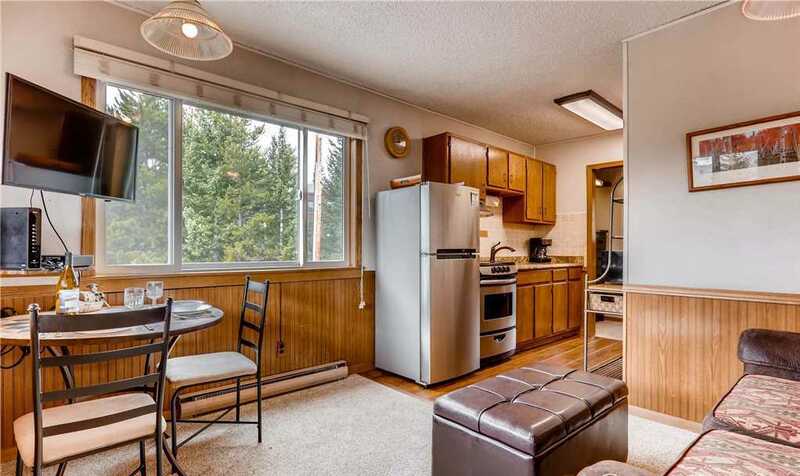 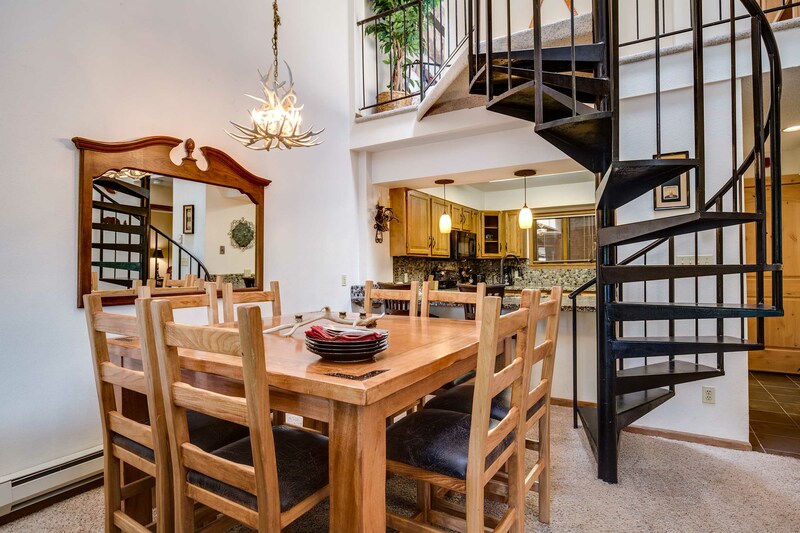 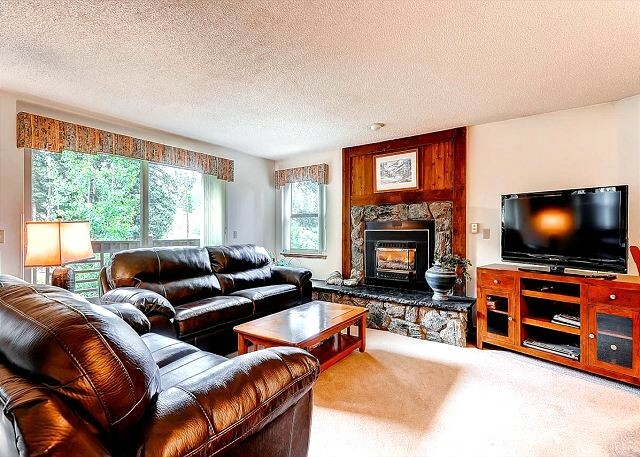 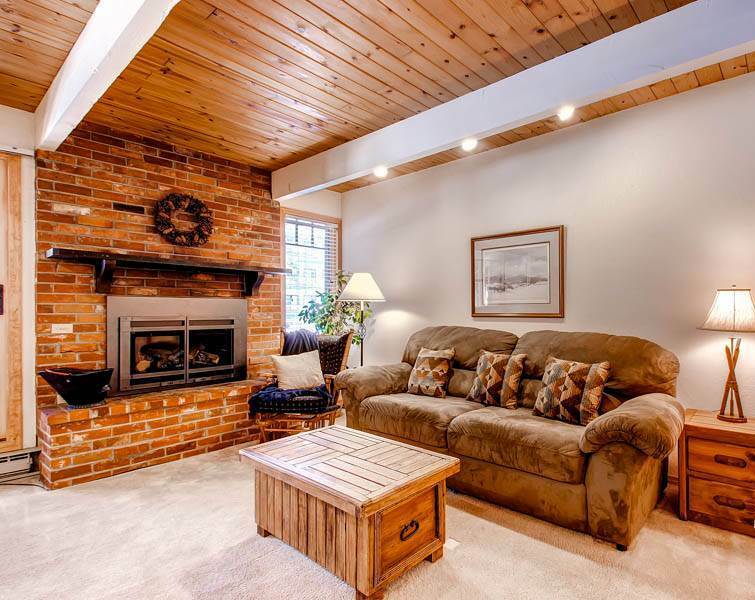 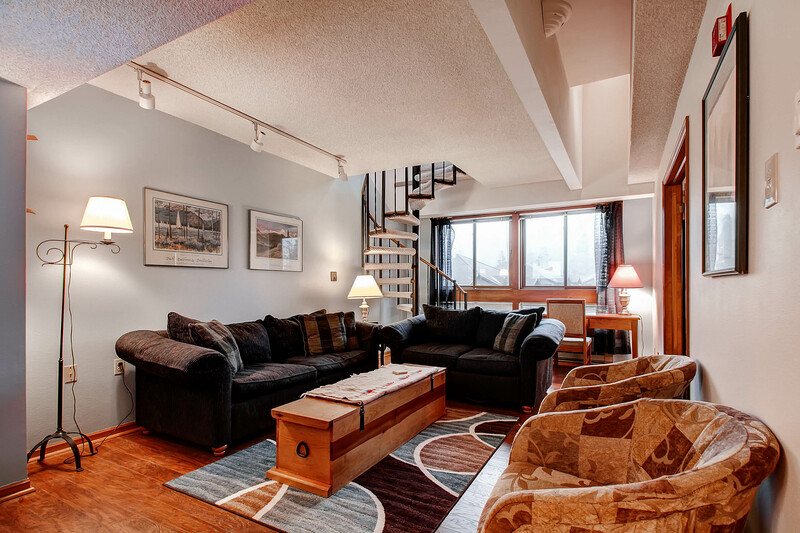 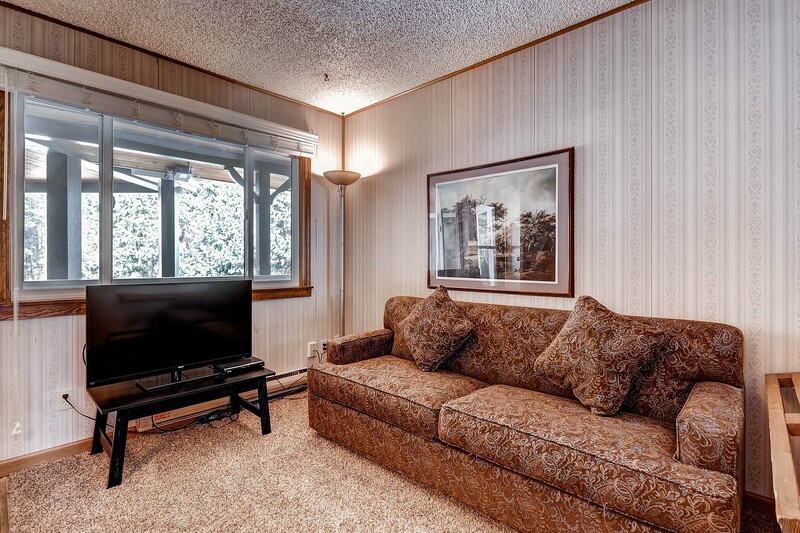 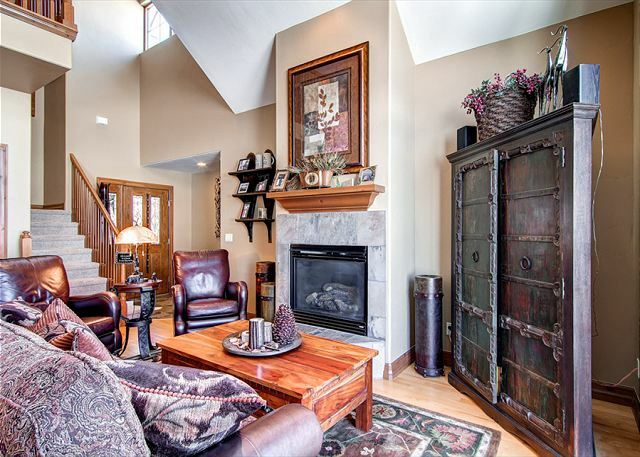 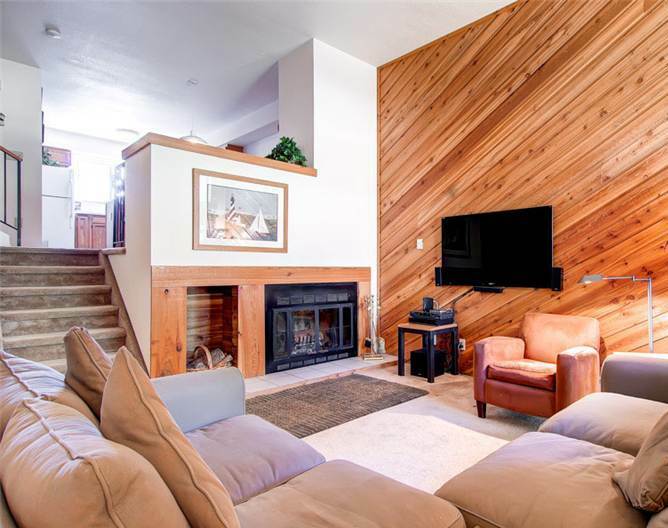 This spacious multi-level property offers towering ceilings, large windows and an inviting main floor entertaining space. 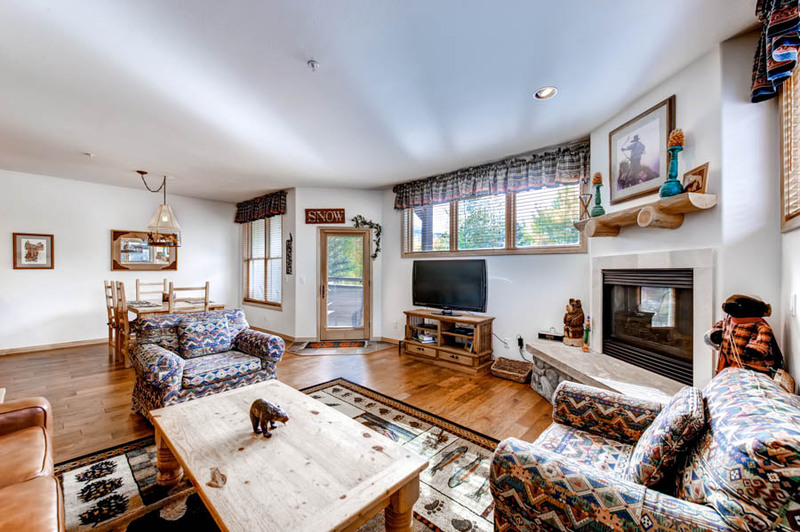 With two decks, amazing southern exposure and the perfect layout for families and groups, guests will want to return year after year! 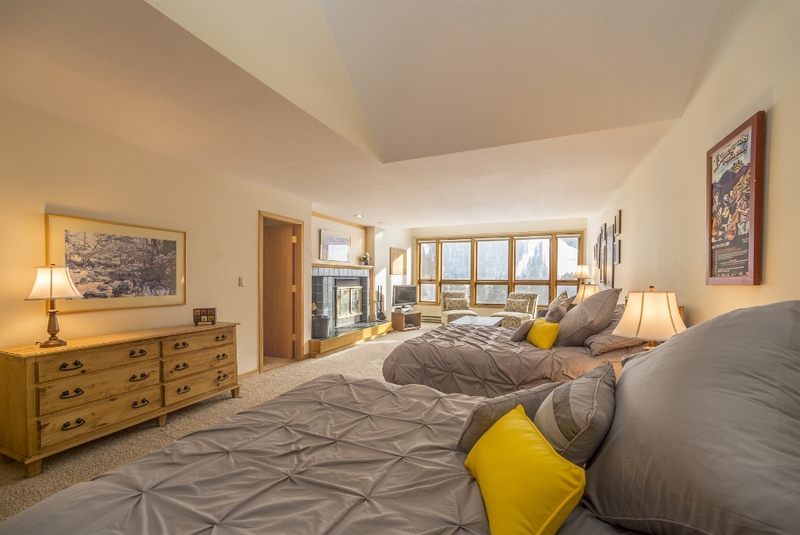 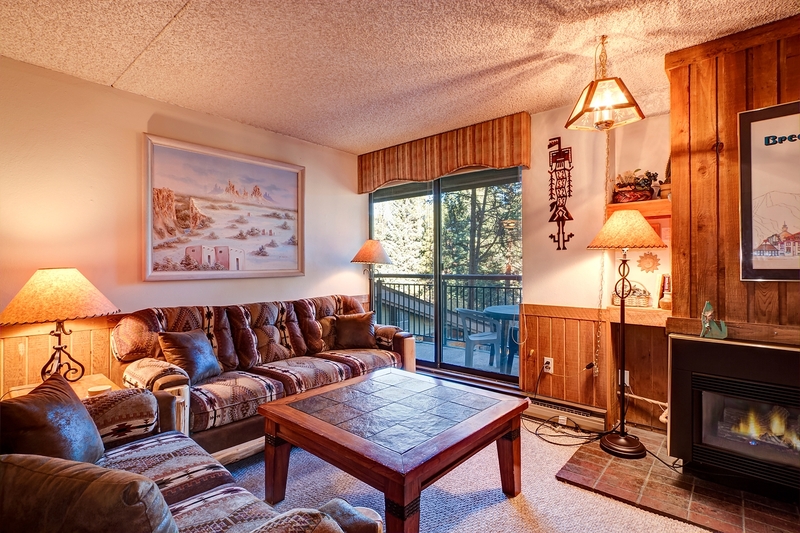 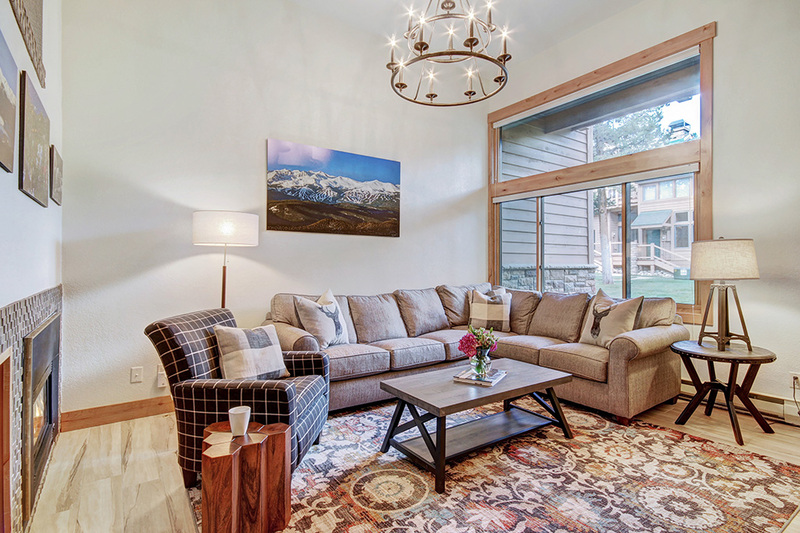 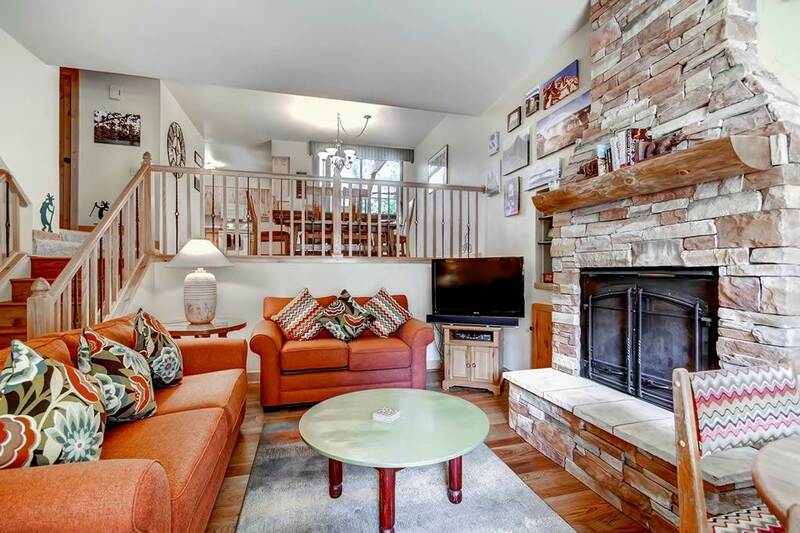 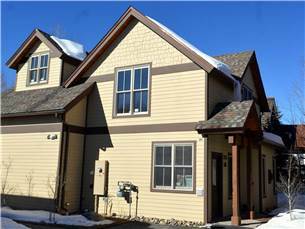 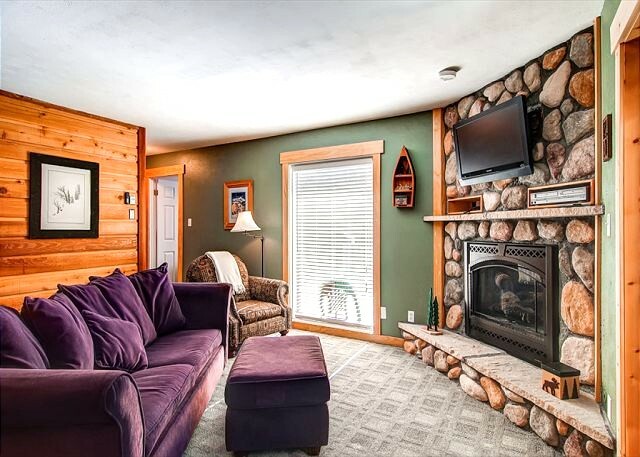 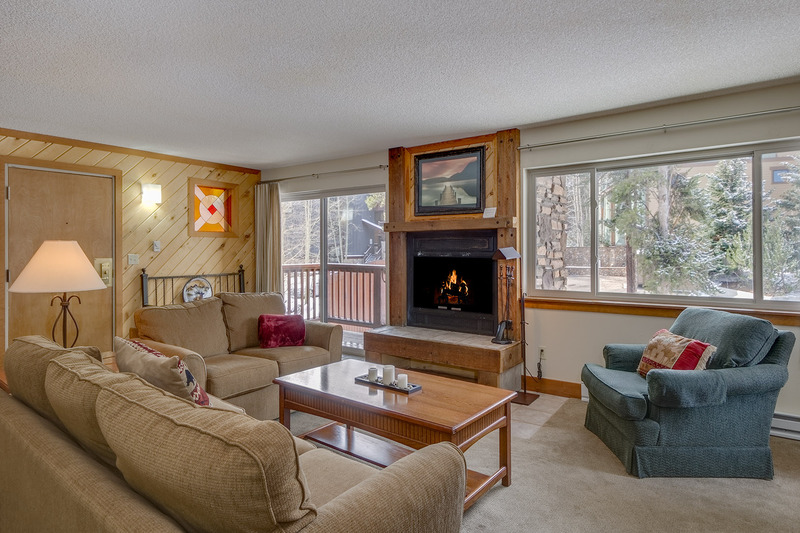 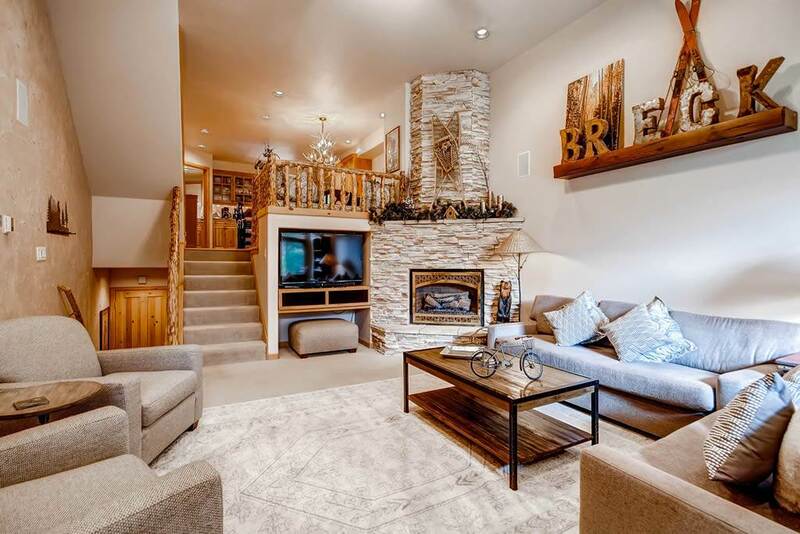 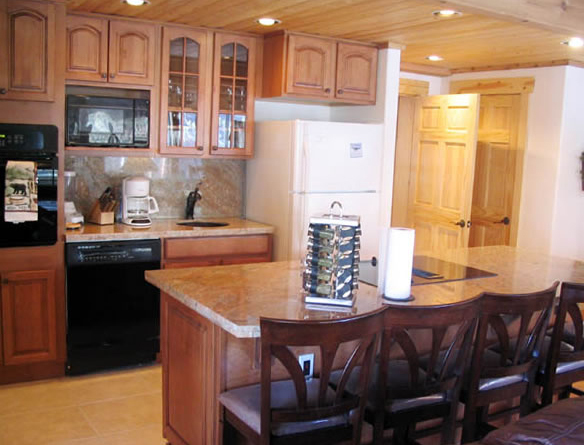 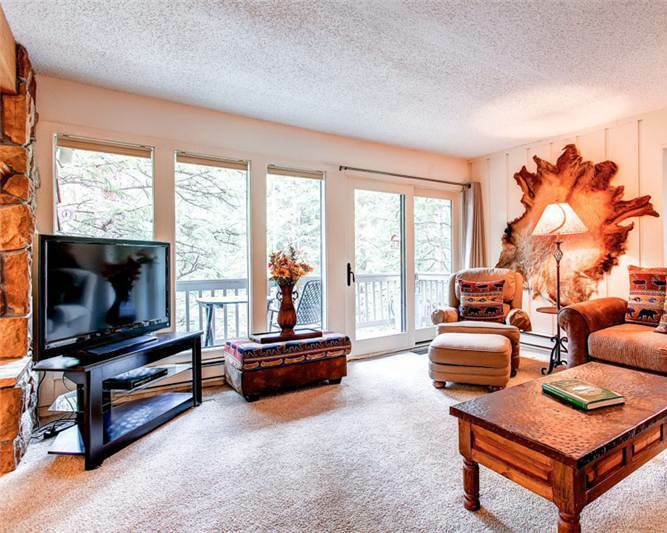 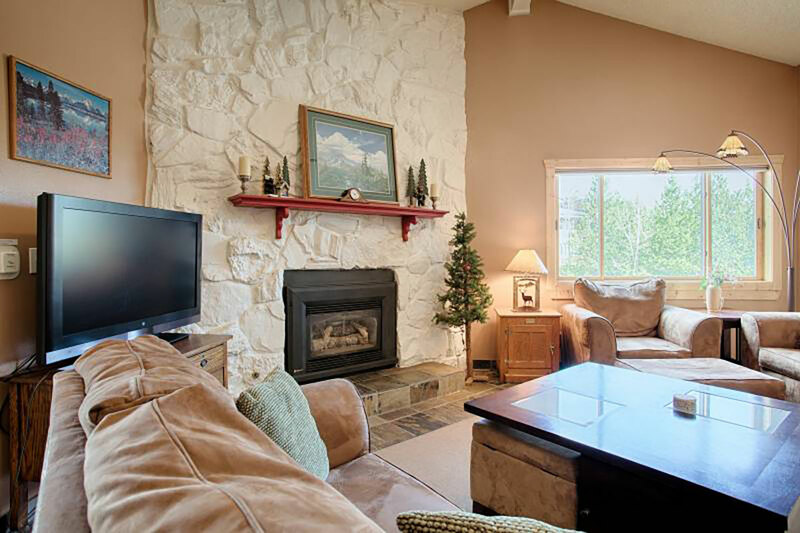 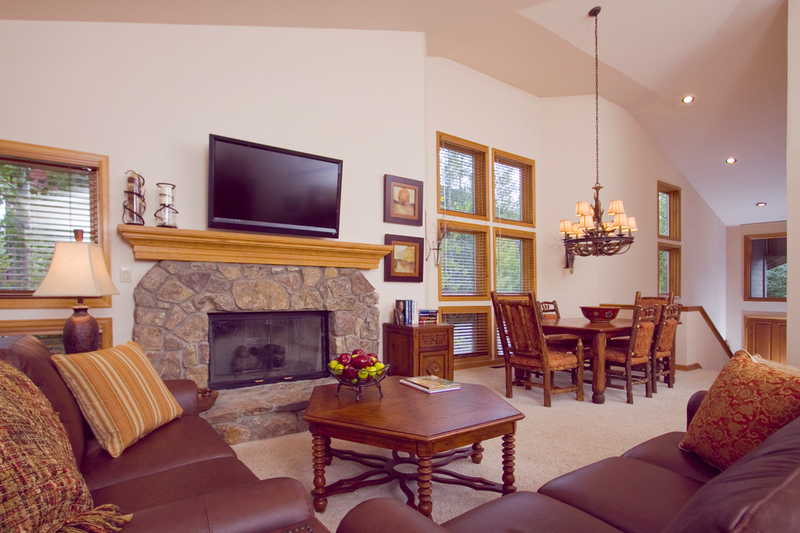 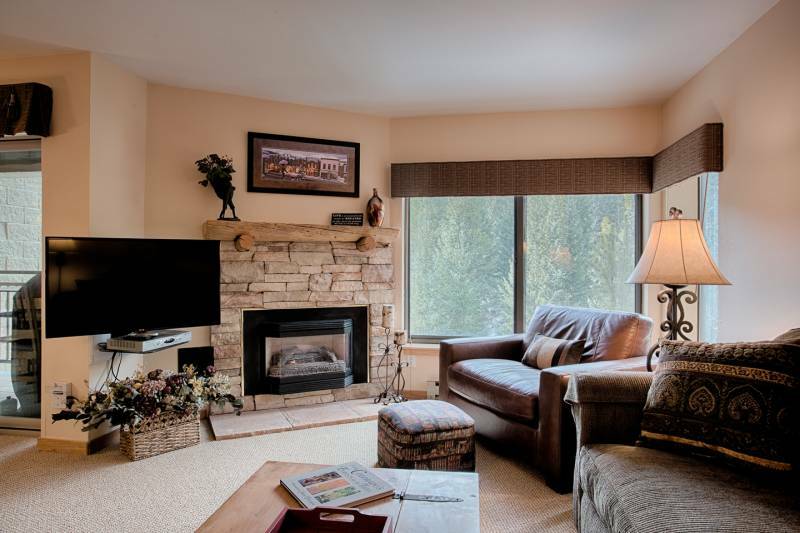 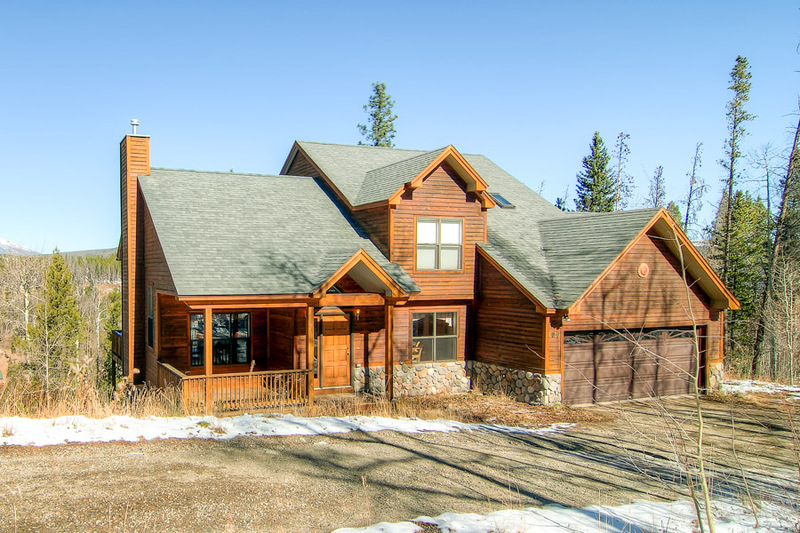 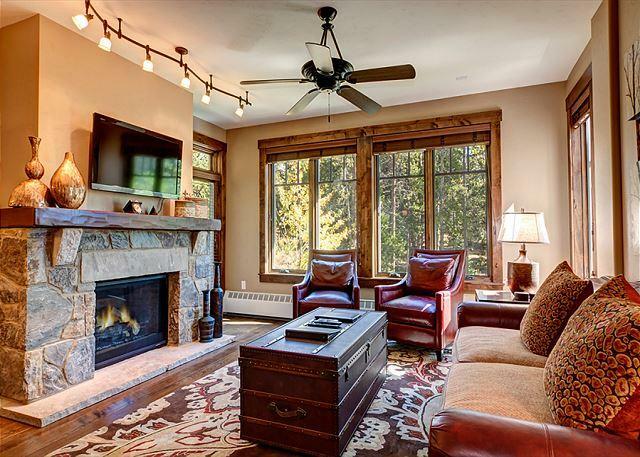 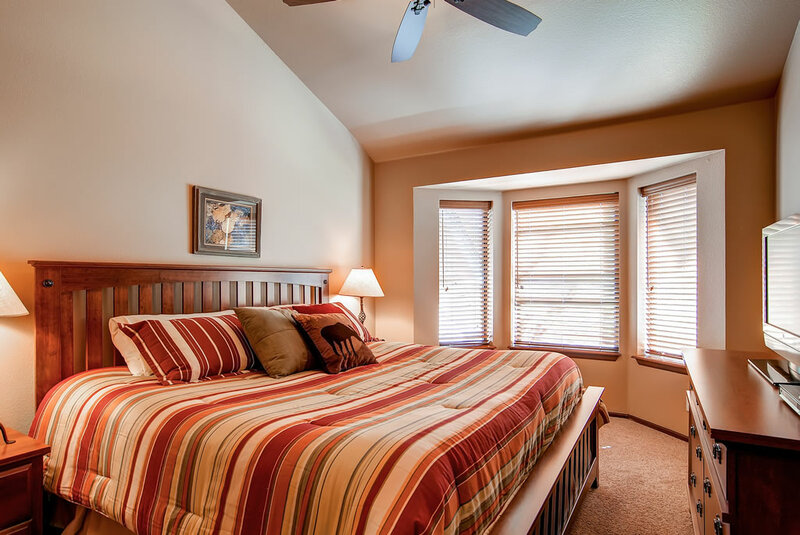 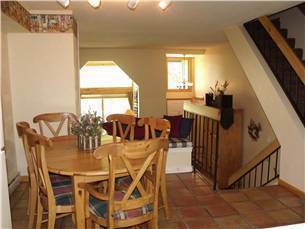 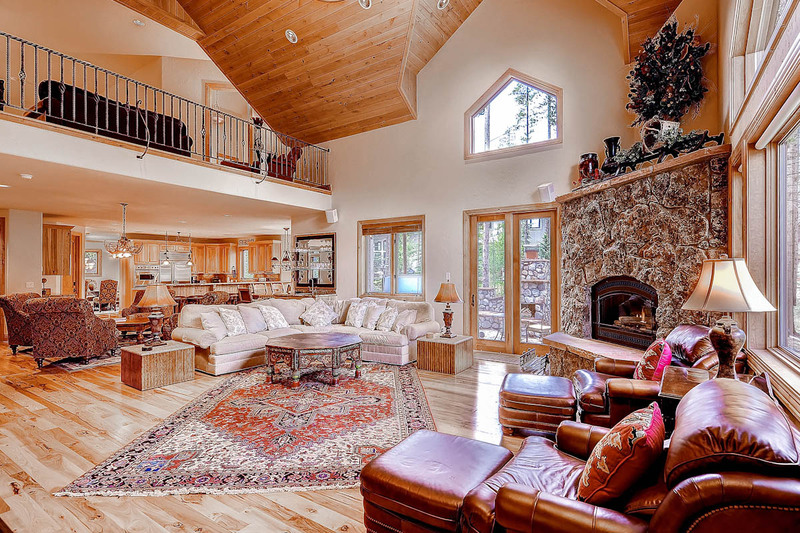 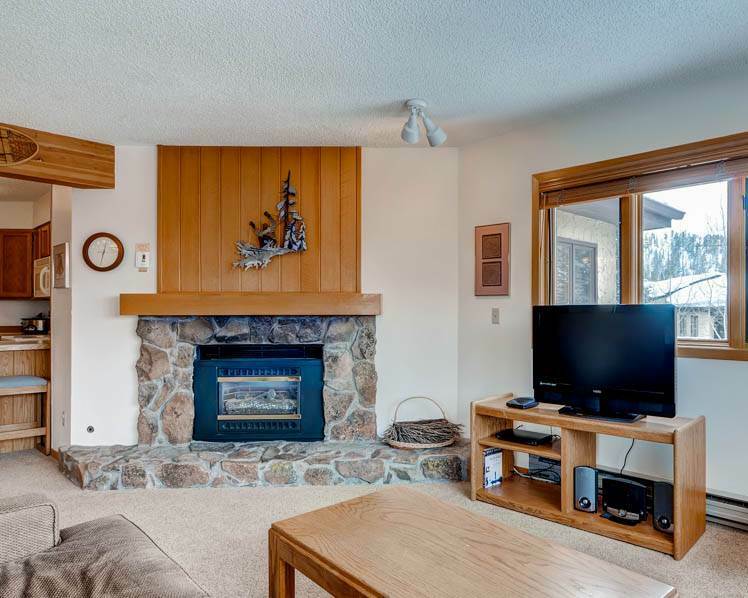 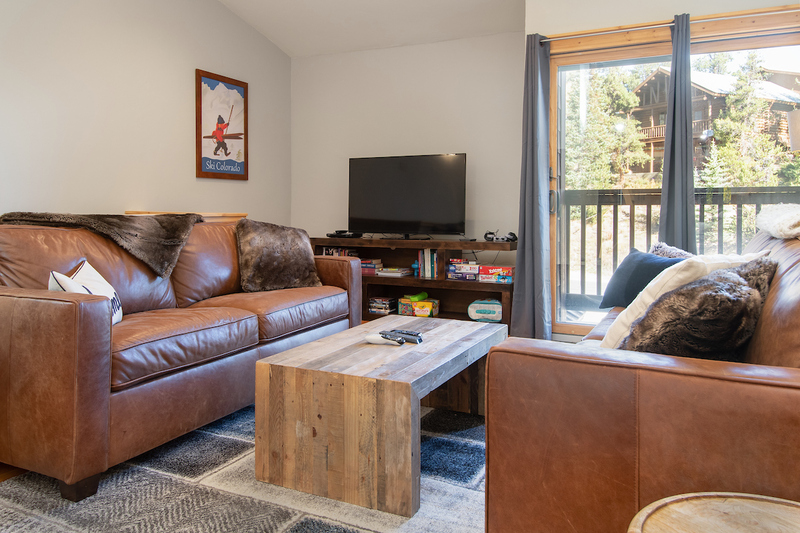 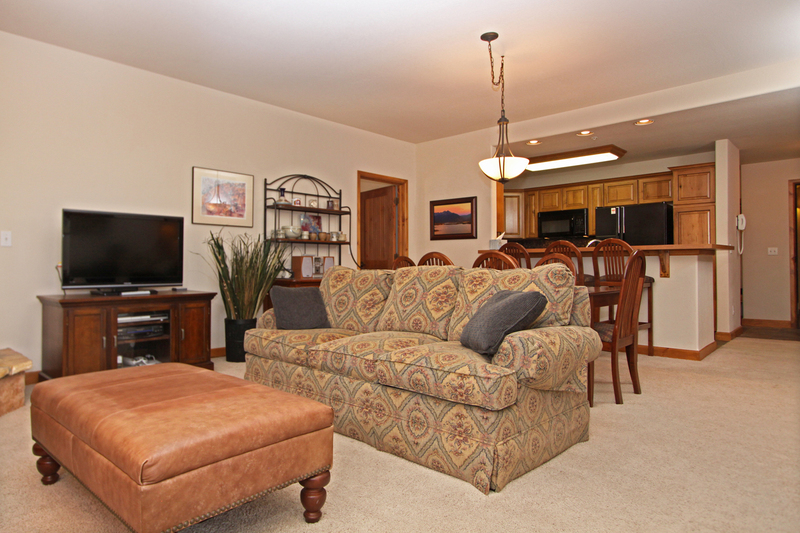 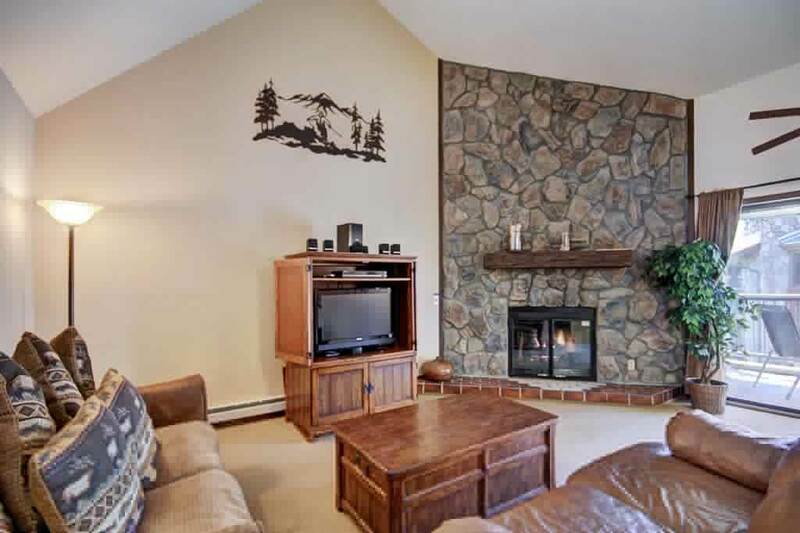 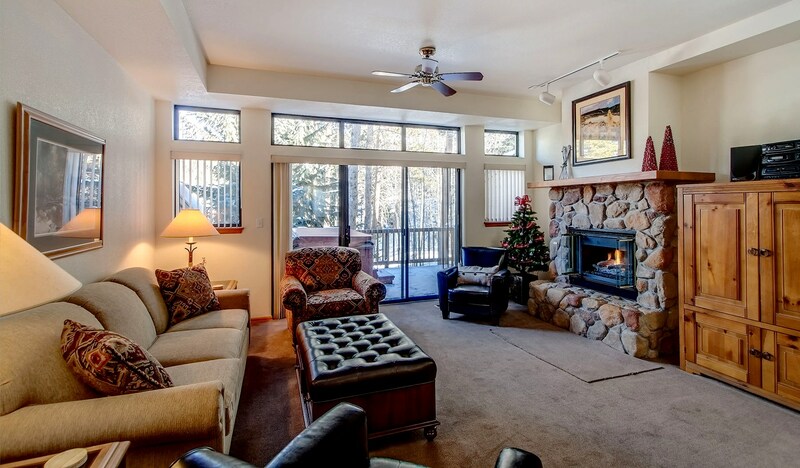 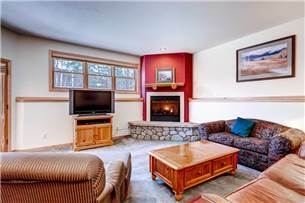 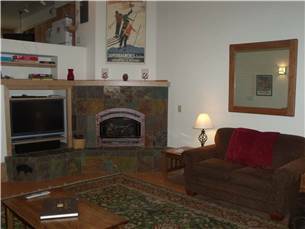 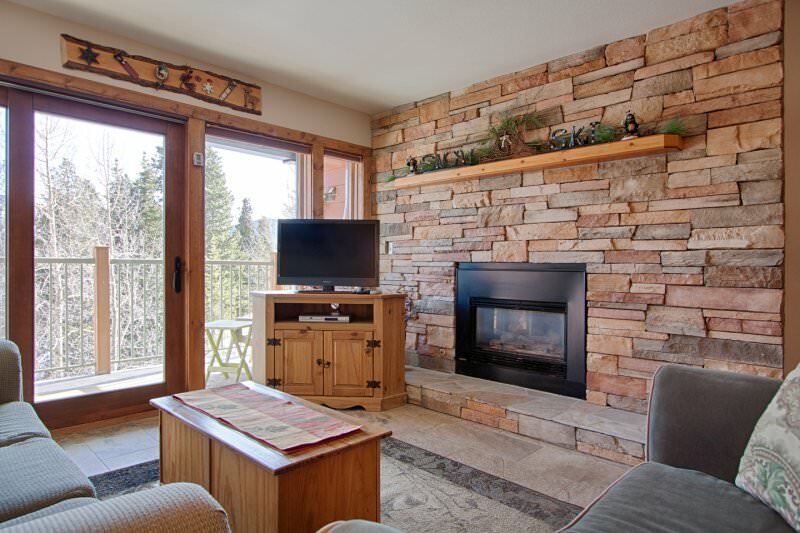 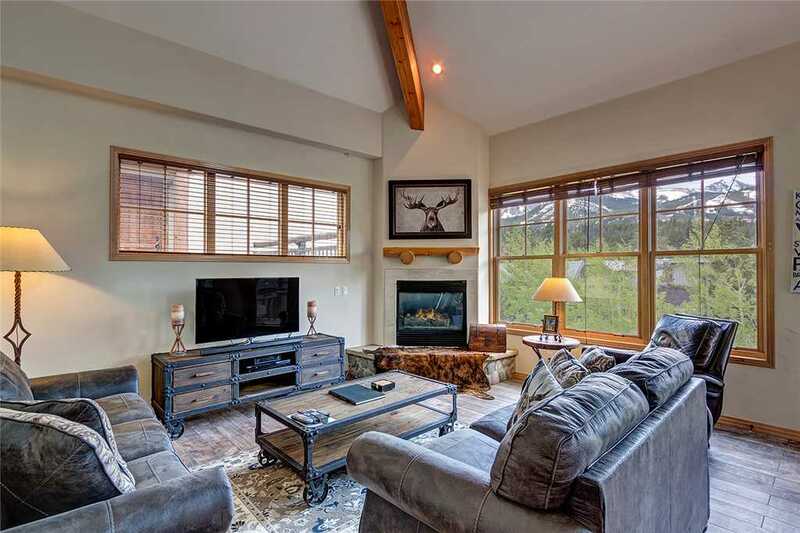 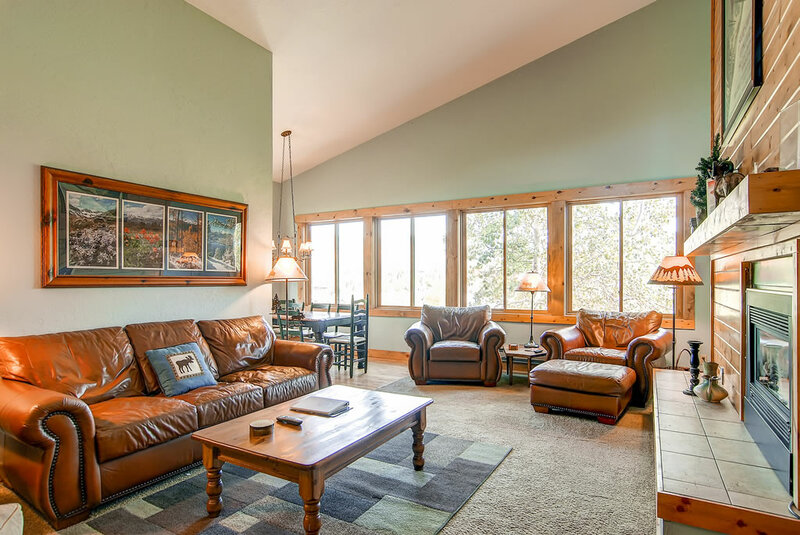 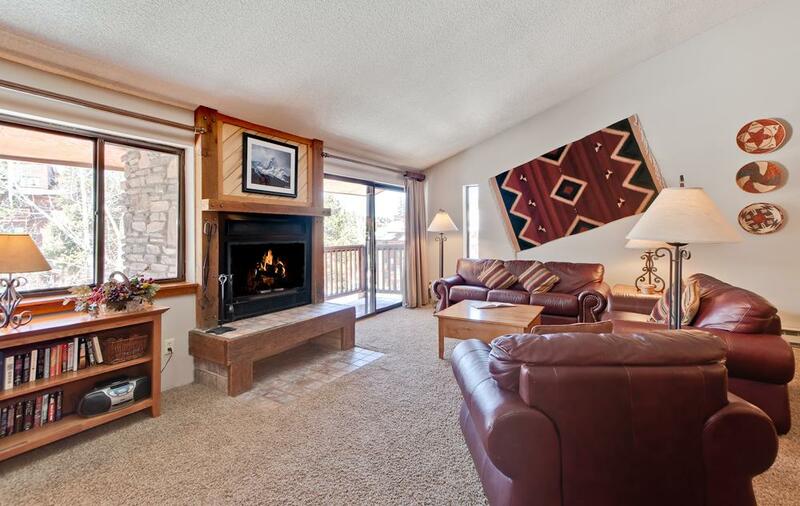 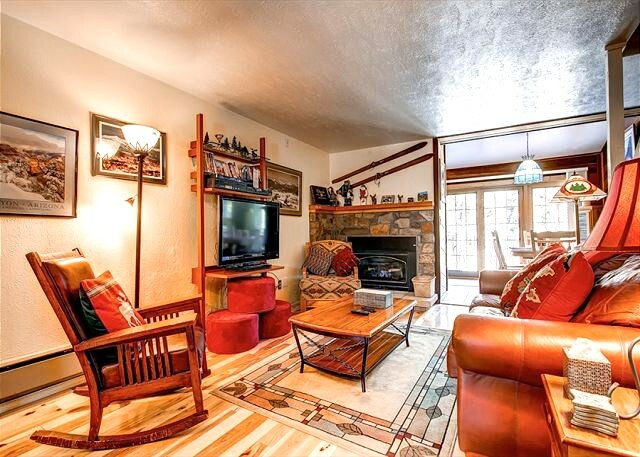 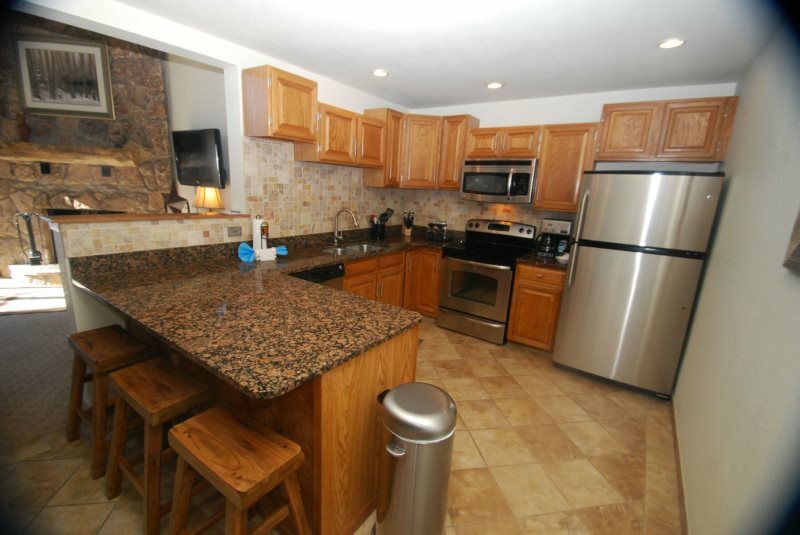 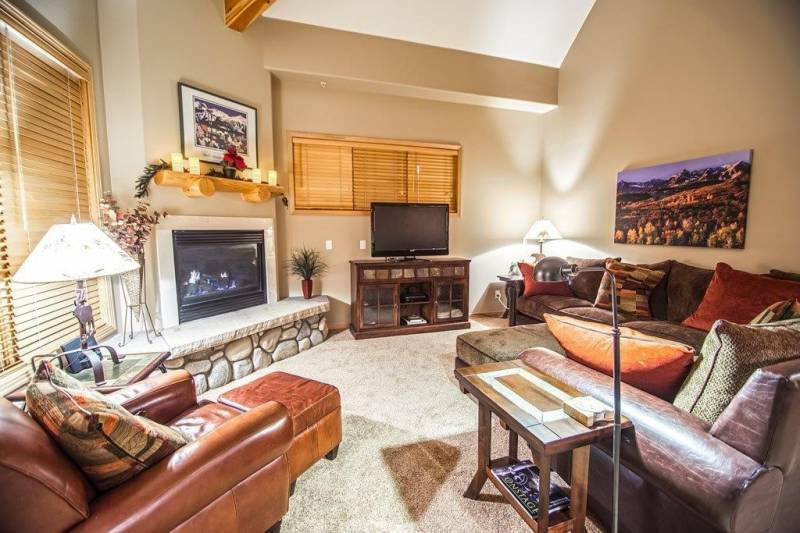 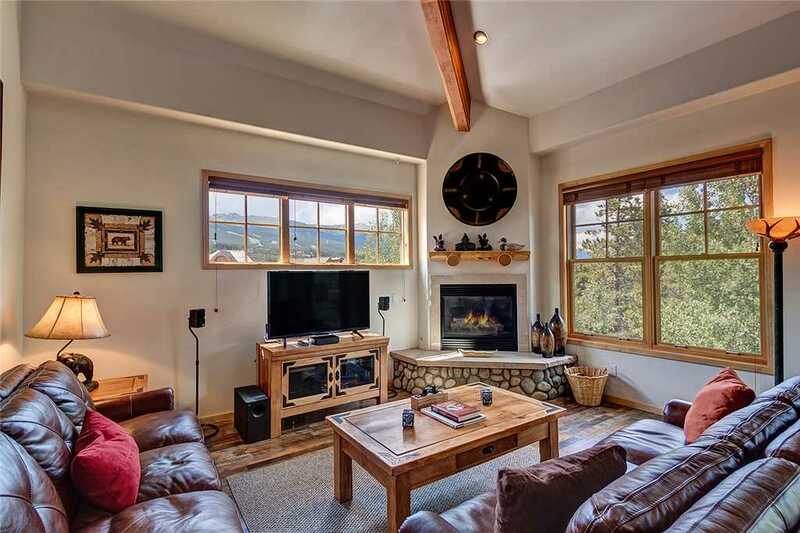 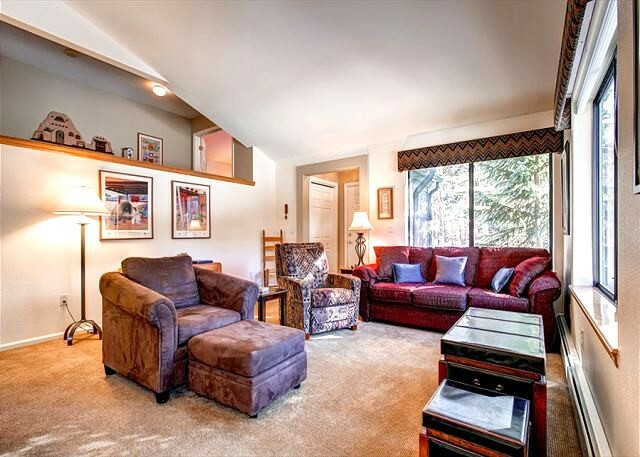 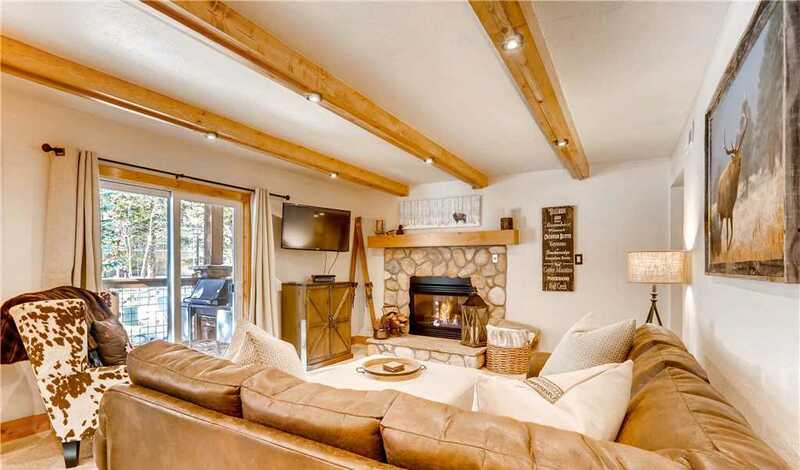 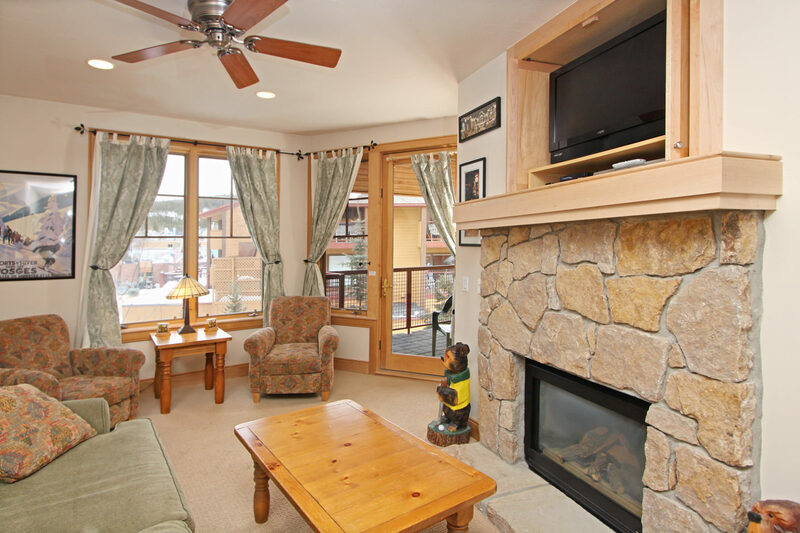 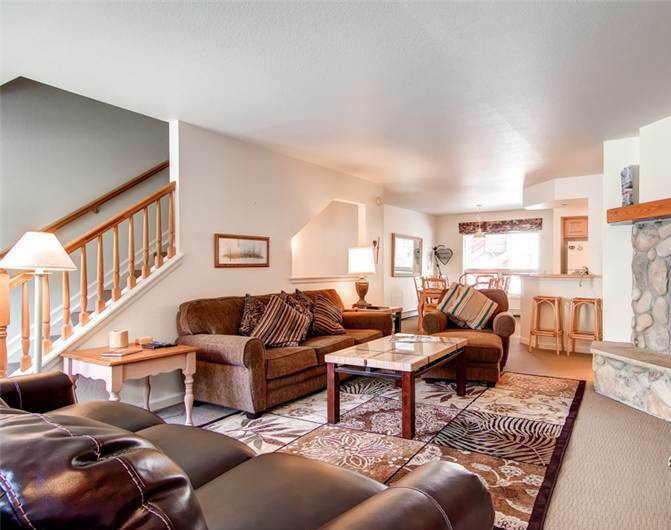 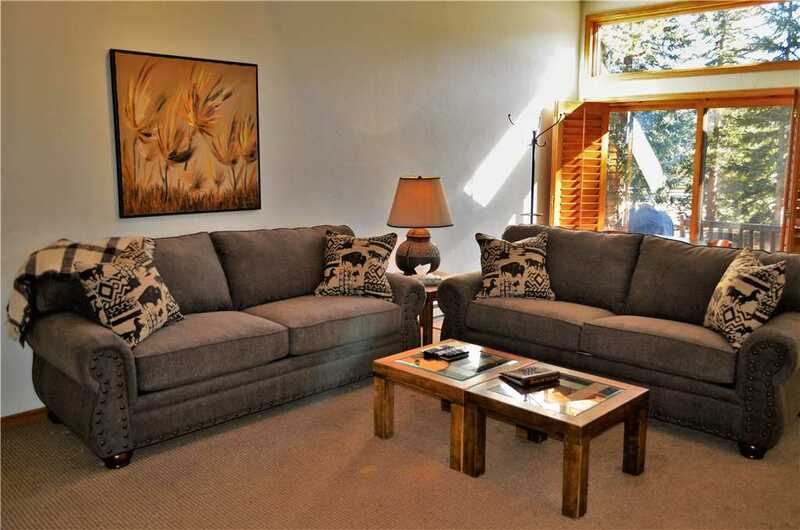 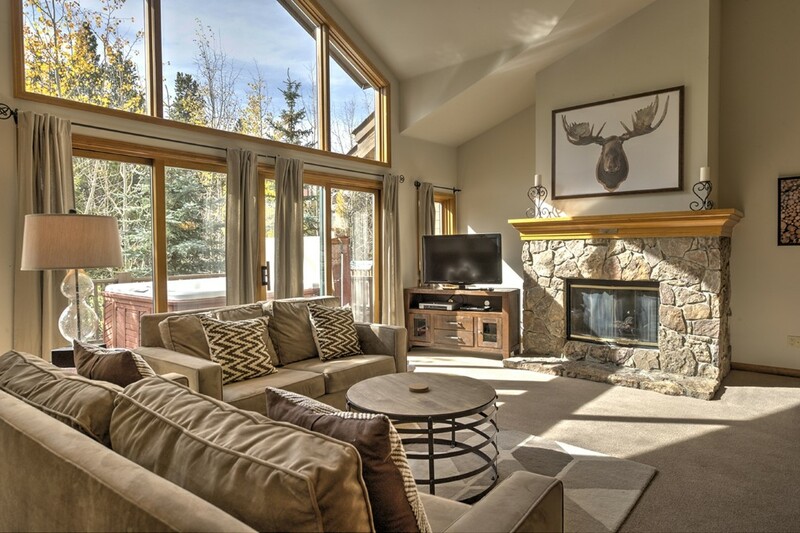 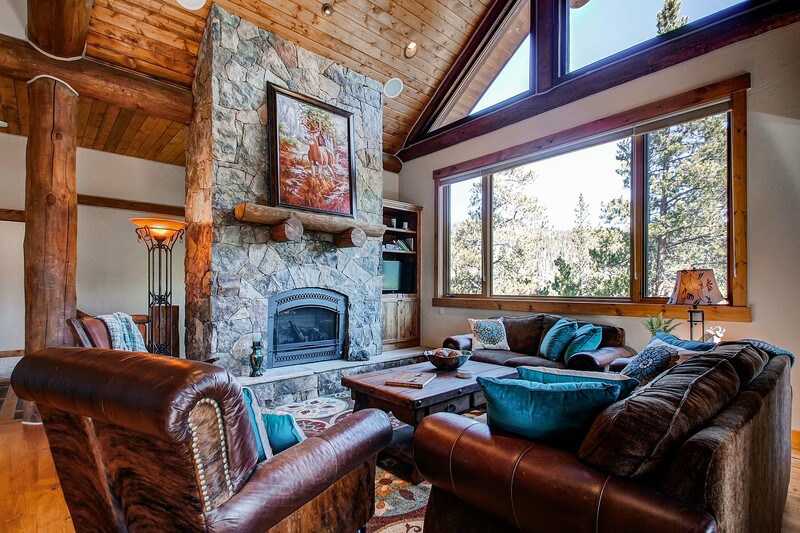 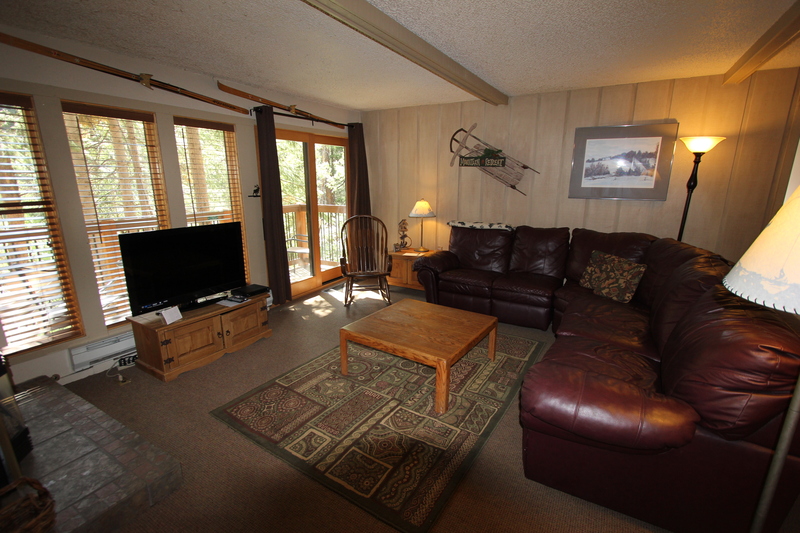 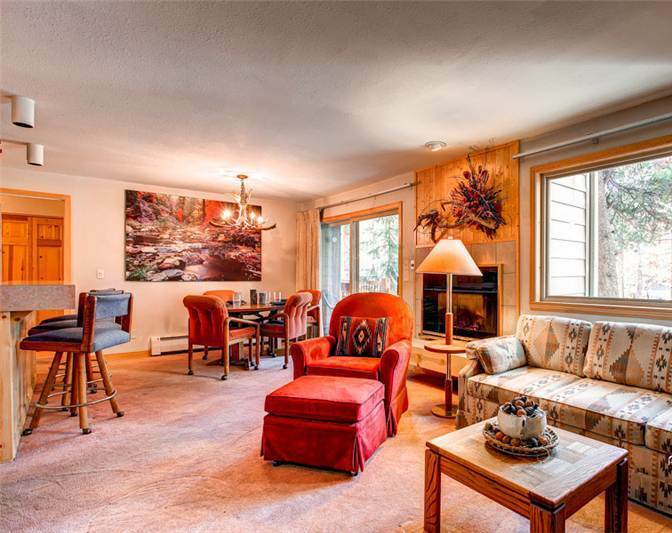 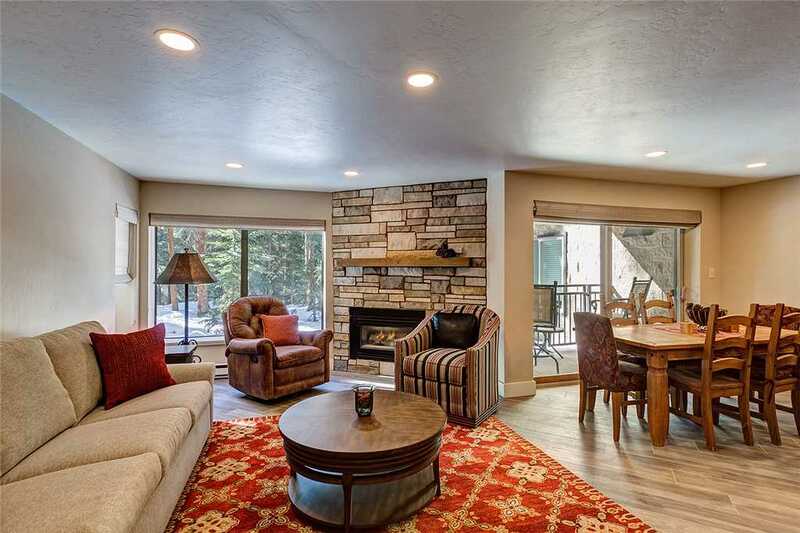 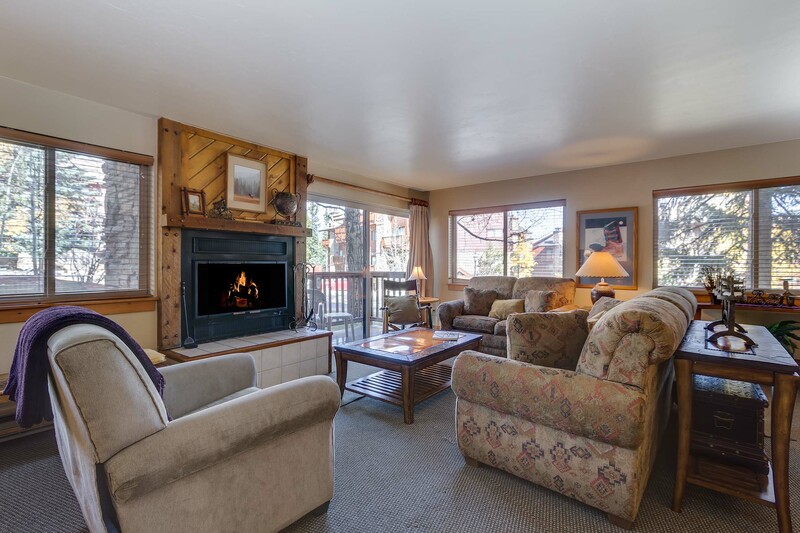 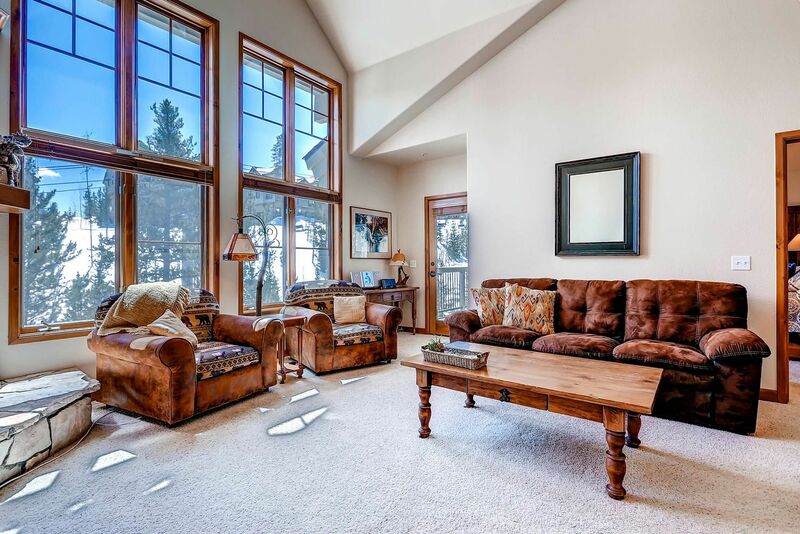 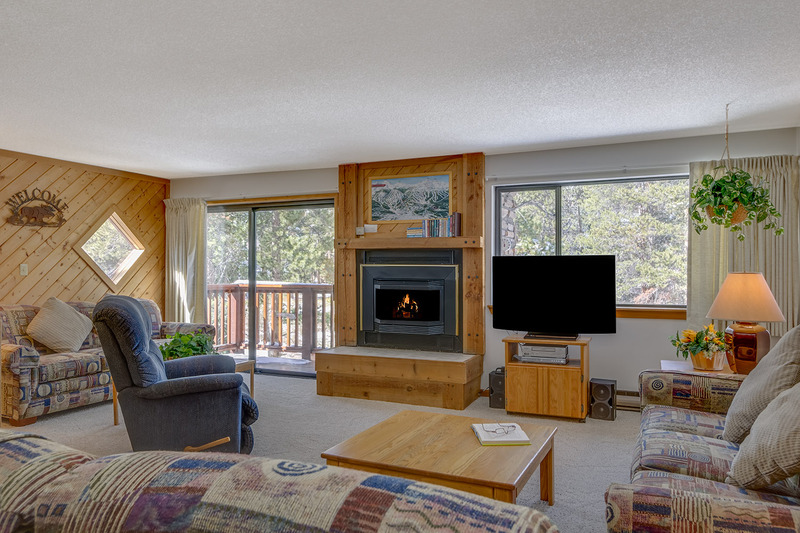 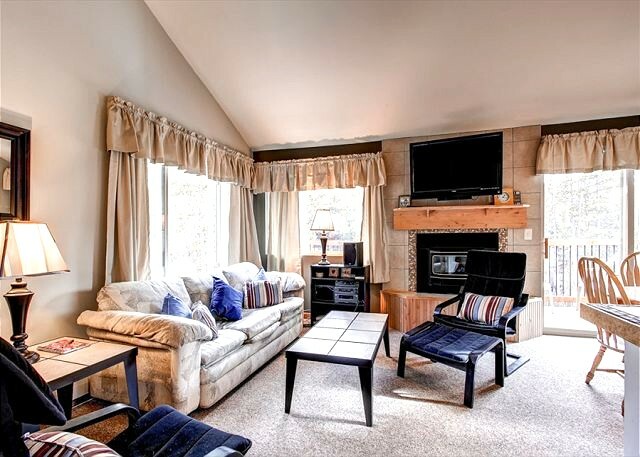 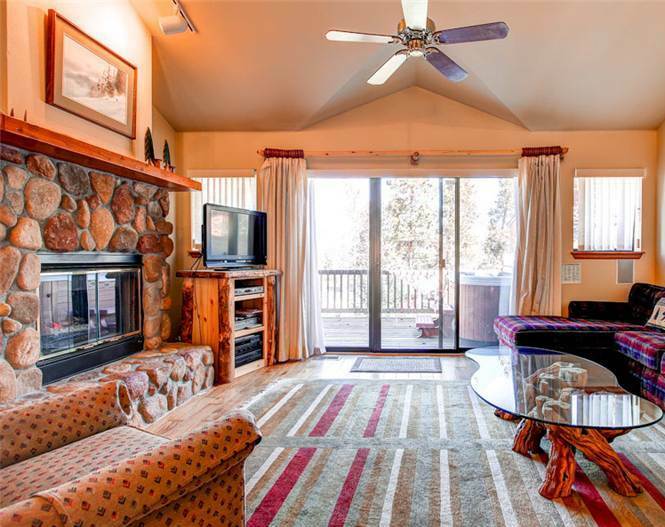 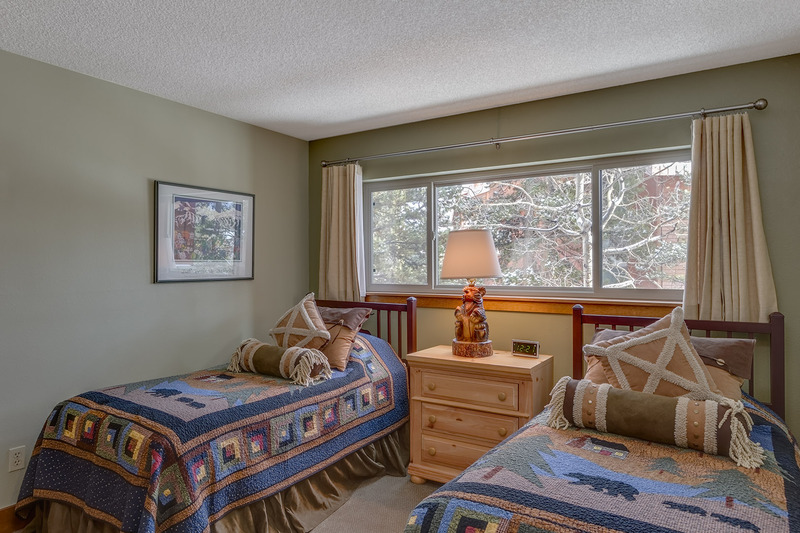 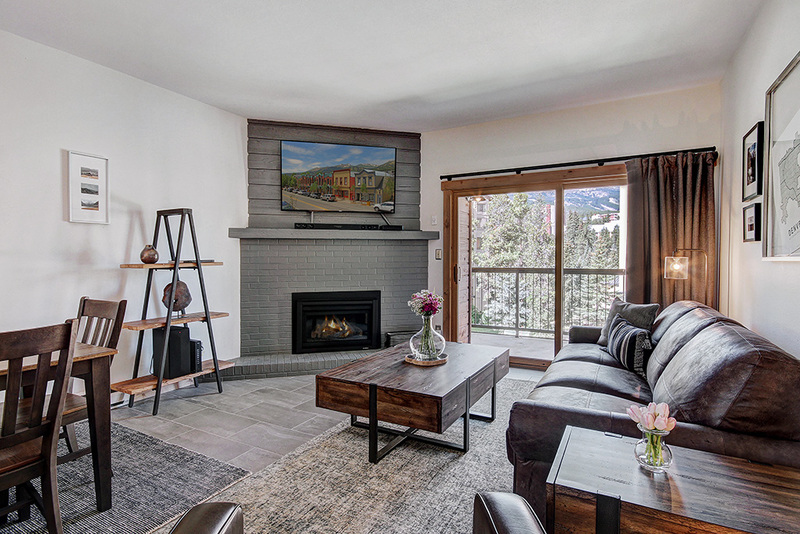 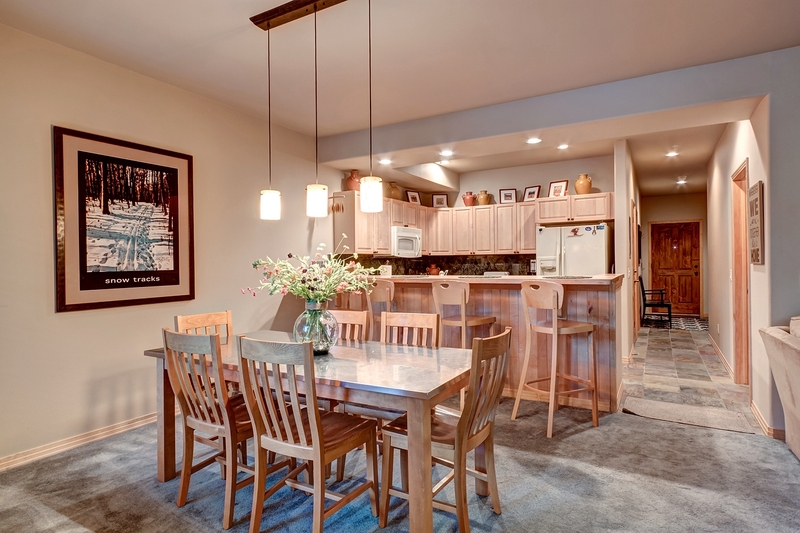 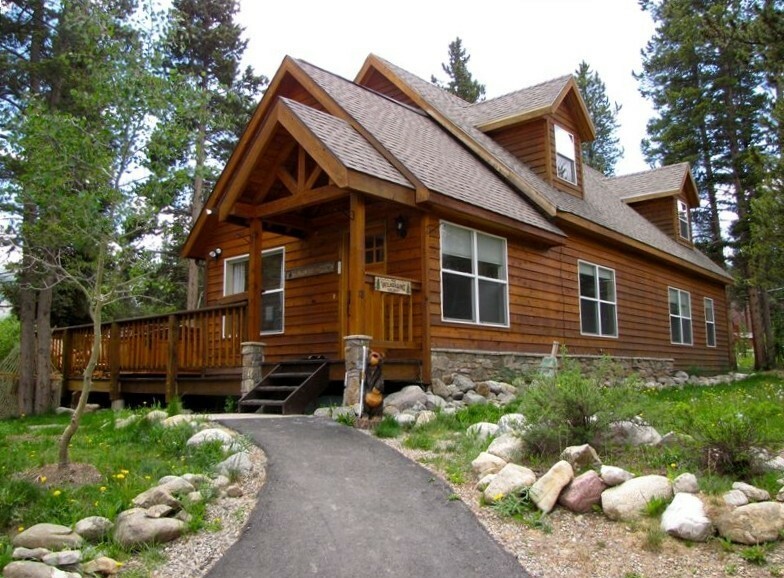 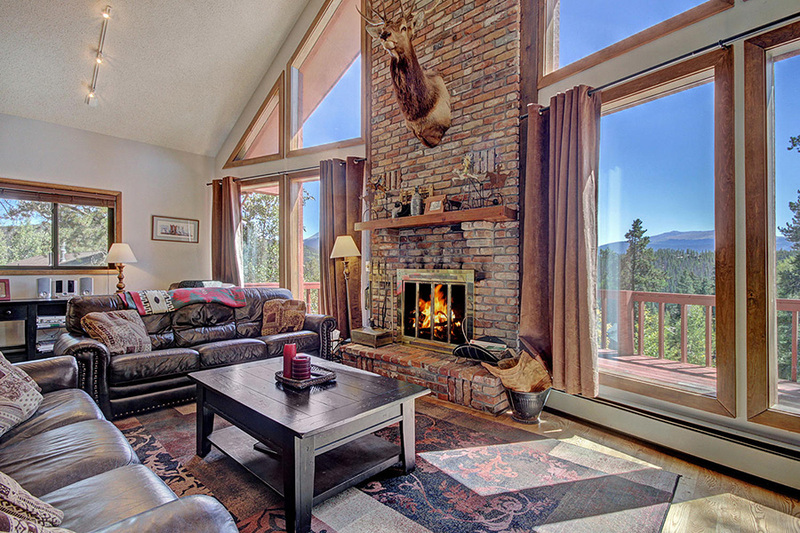 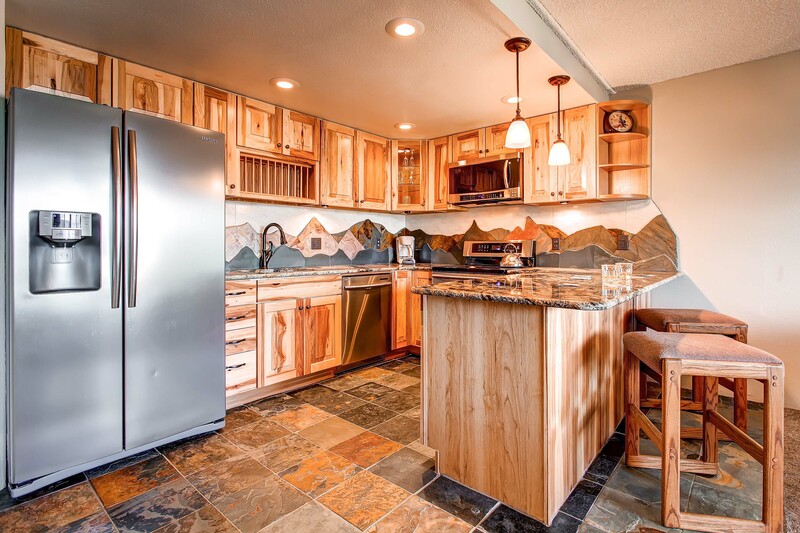 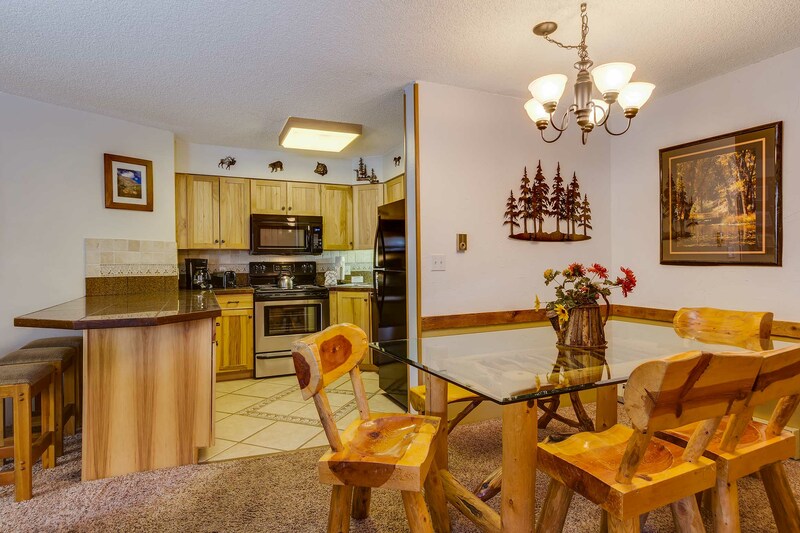 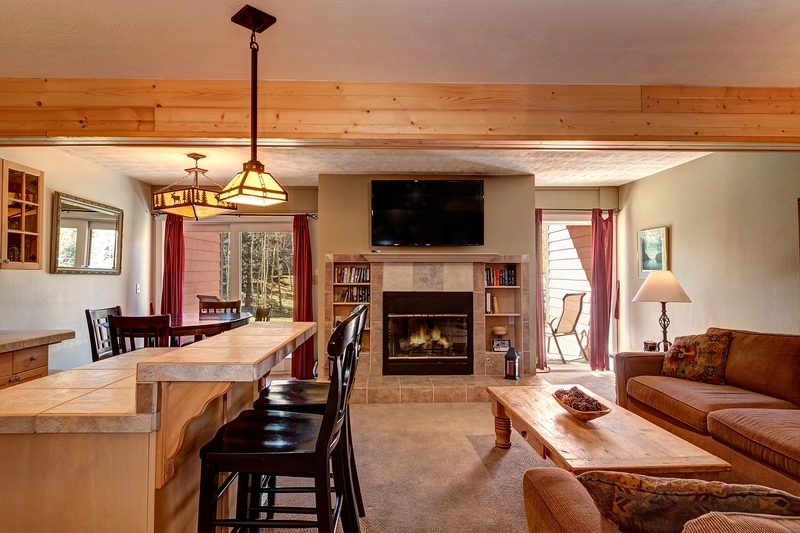 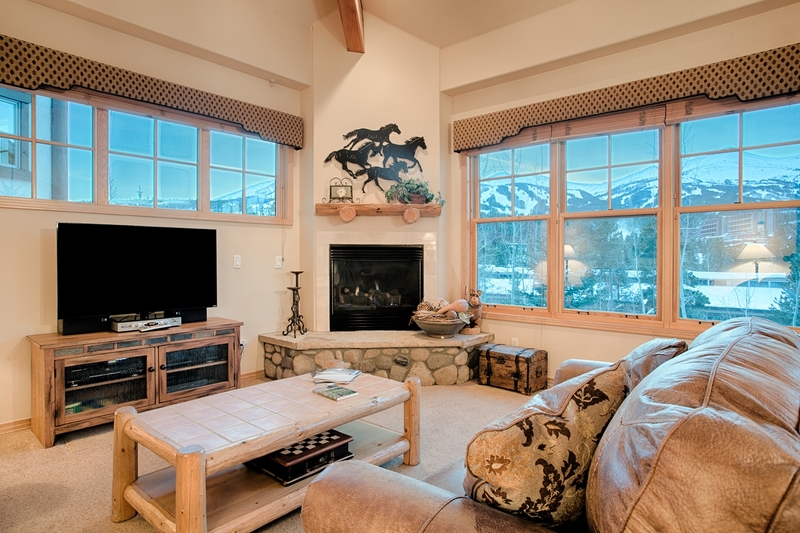 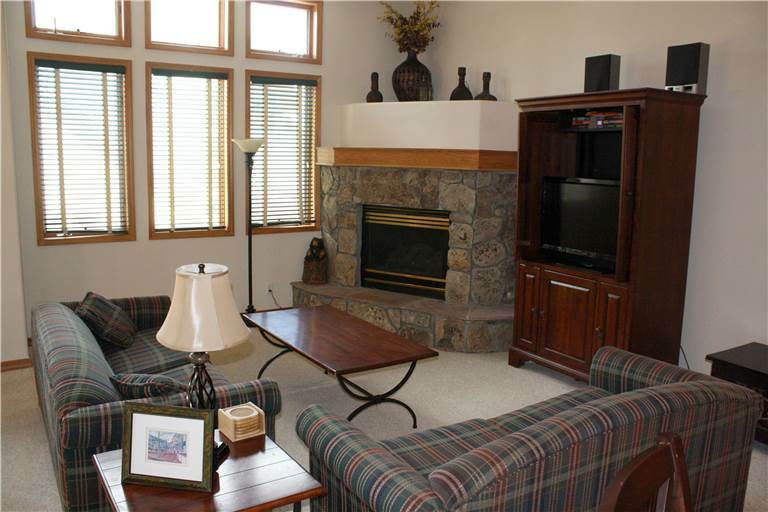 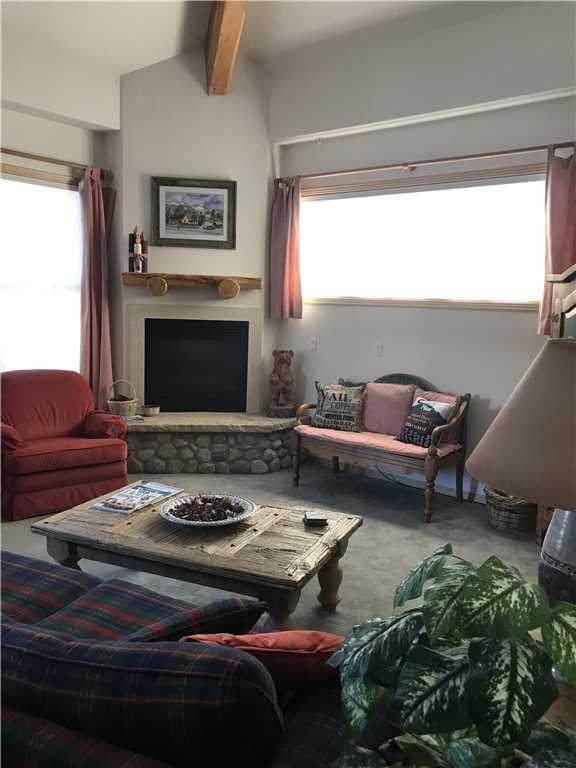 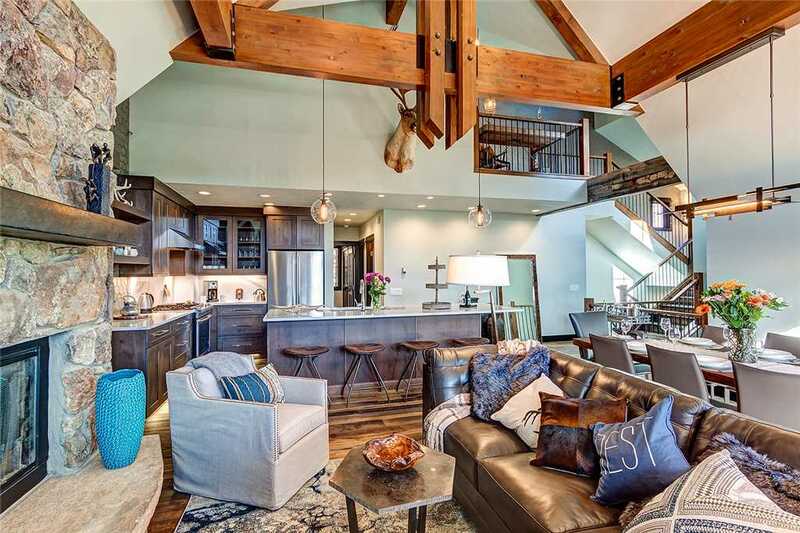 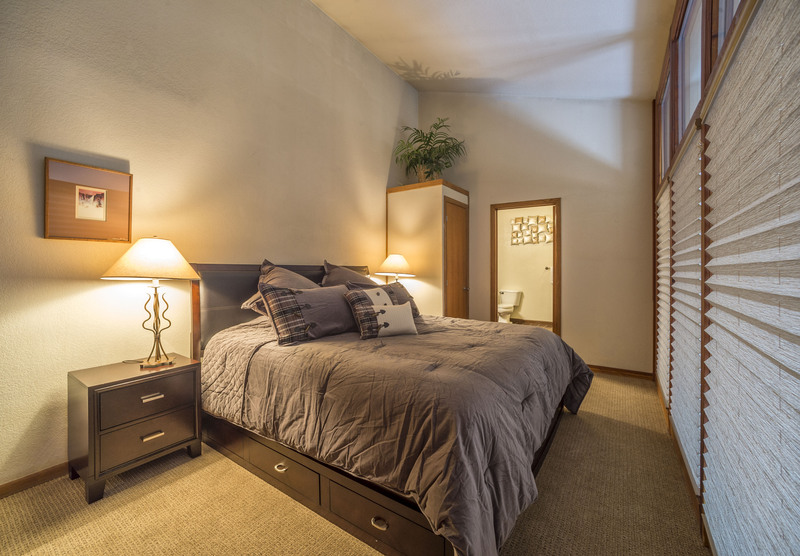 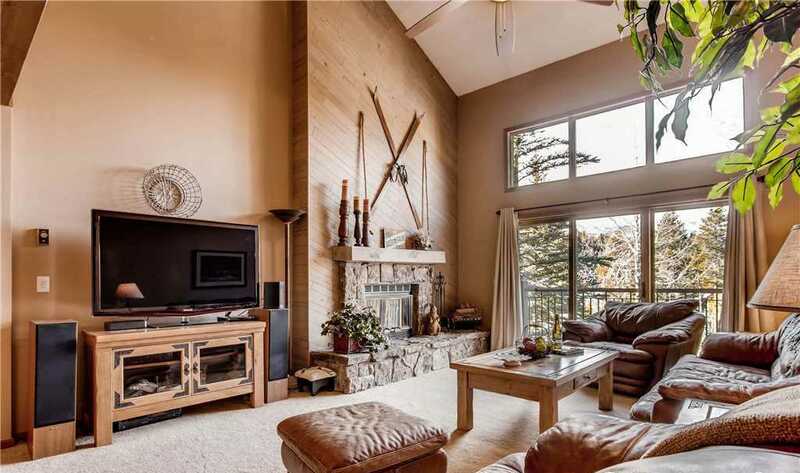 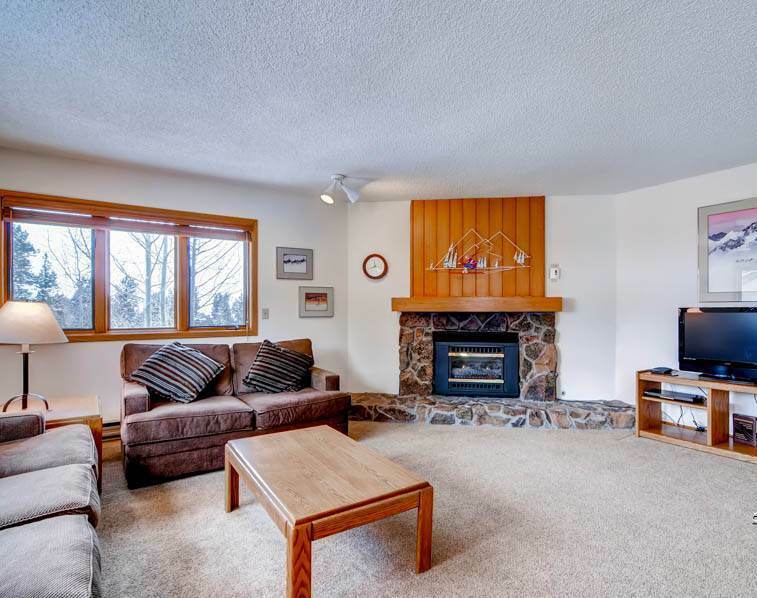 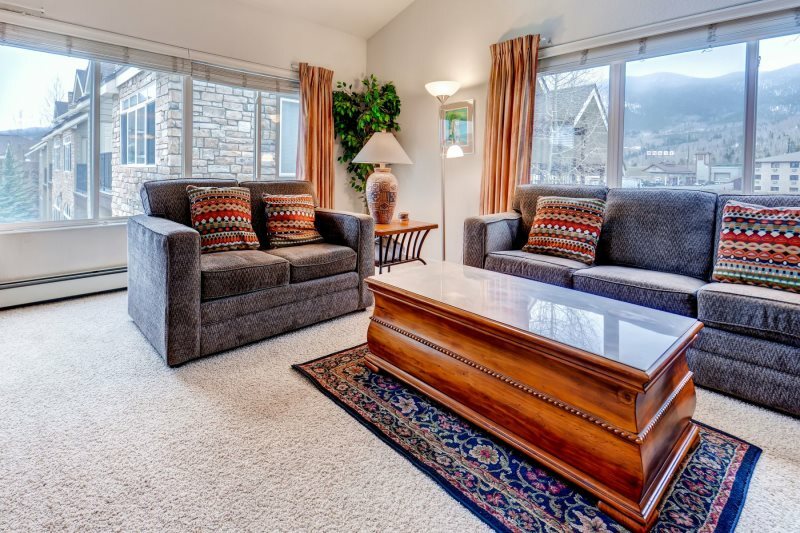 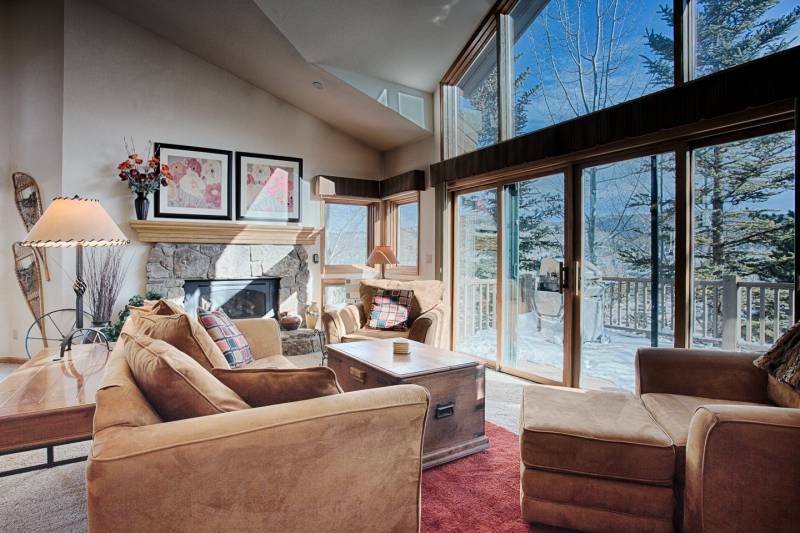 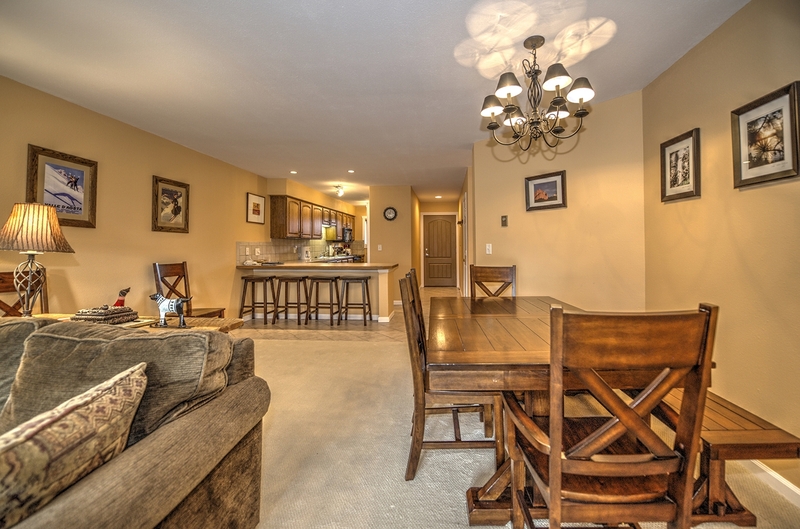 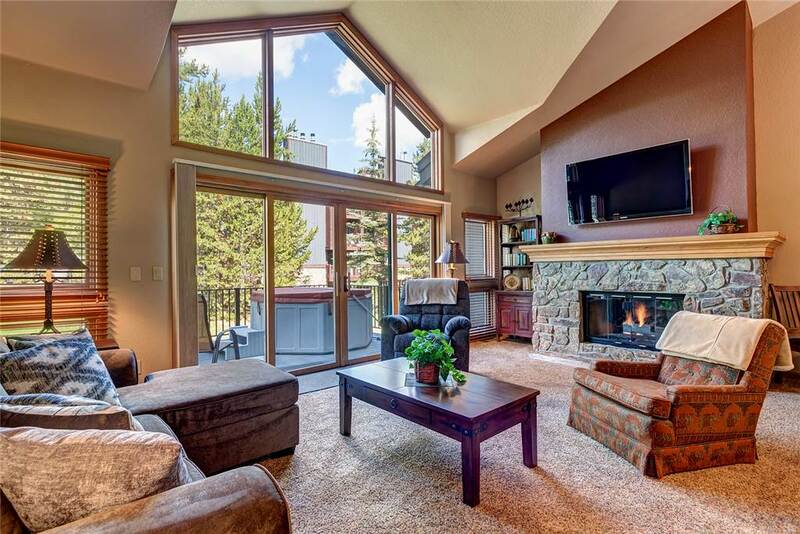 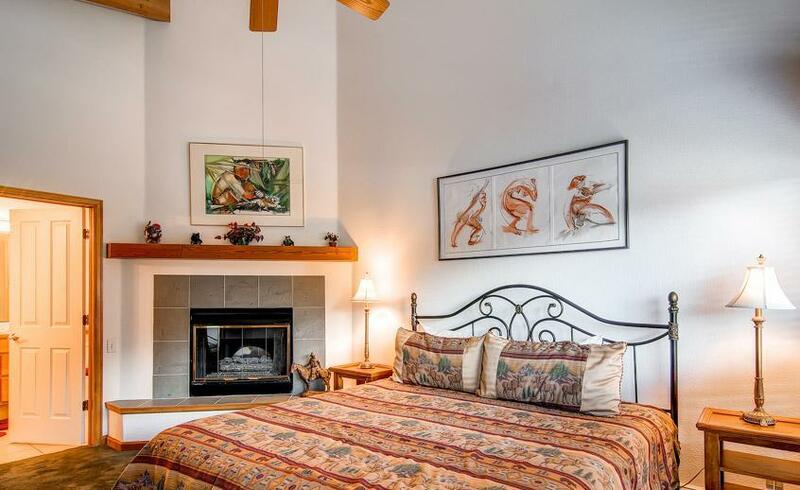 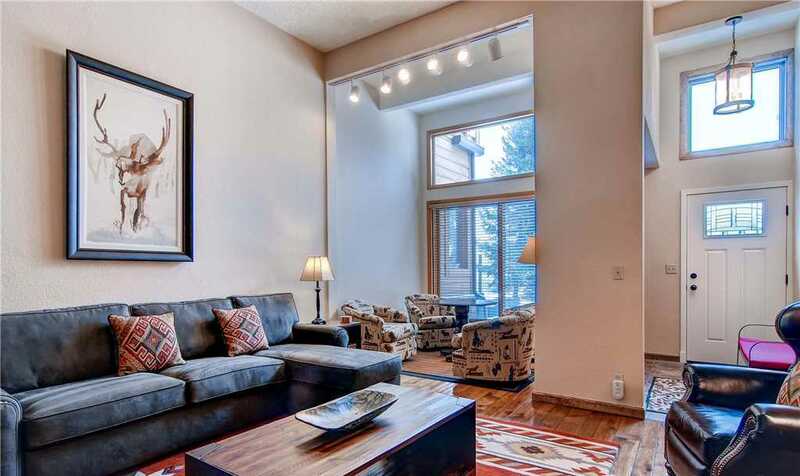 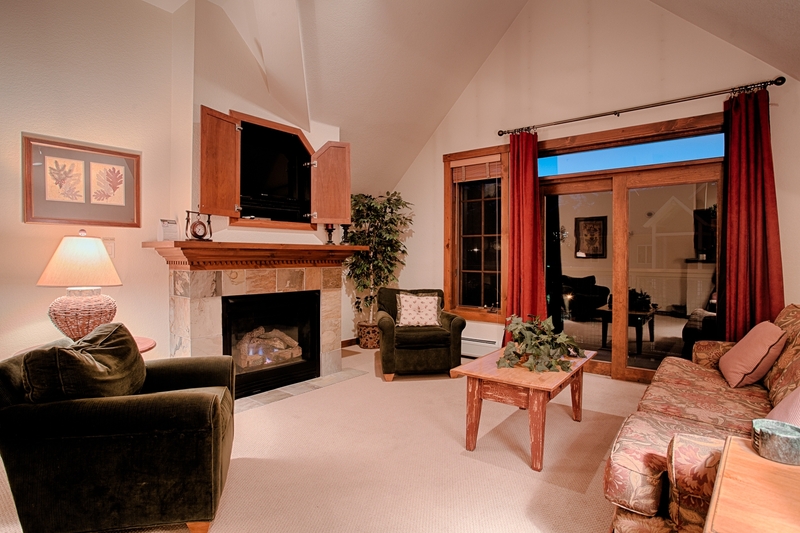 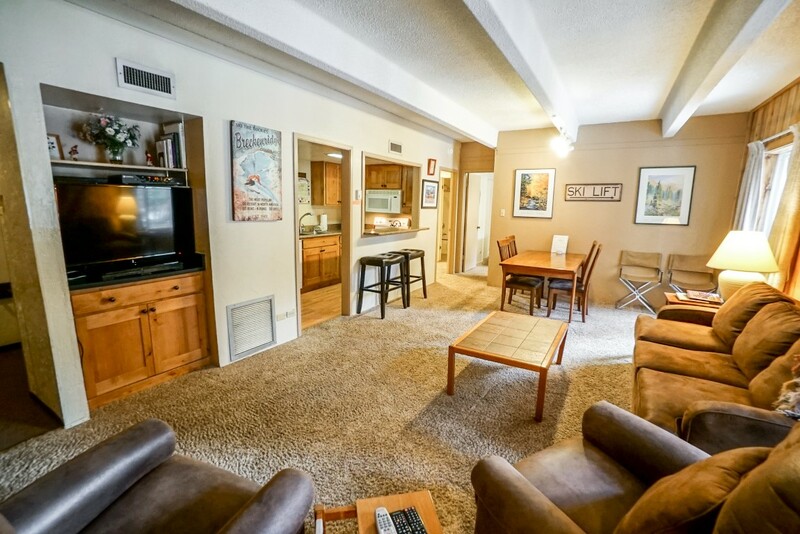 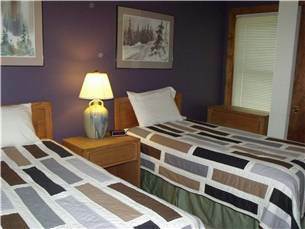 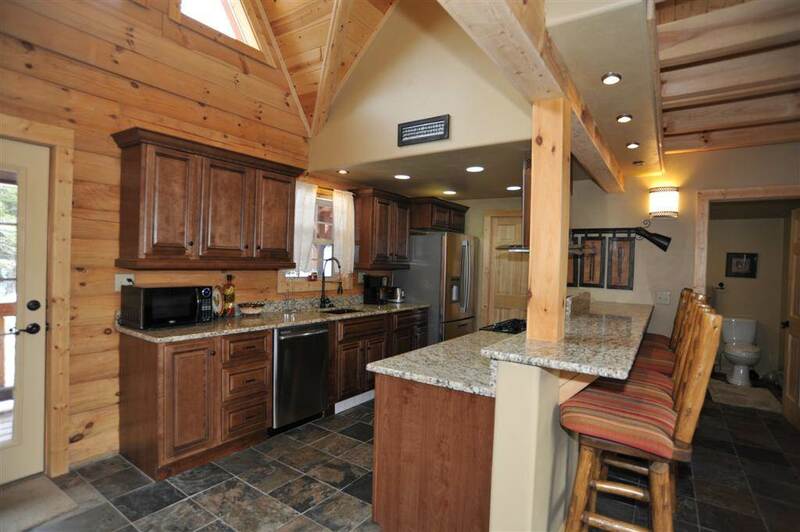 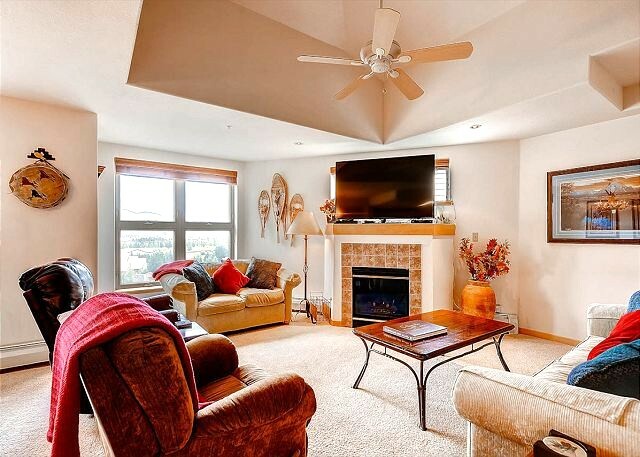 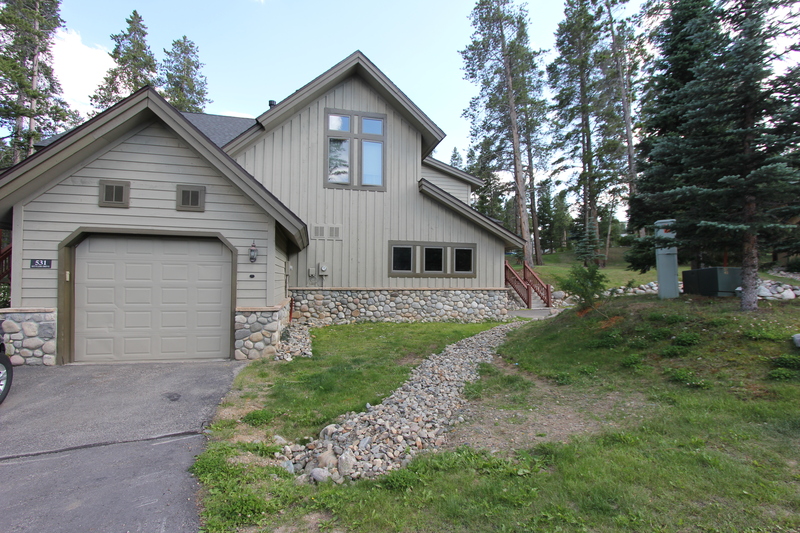 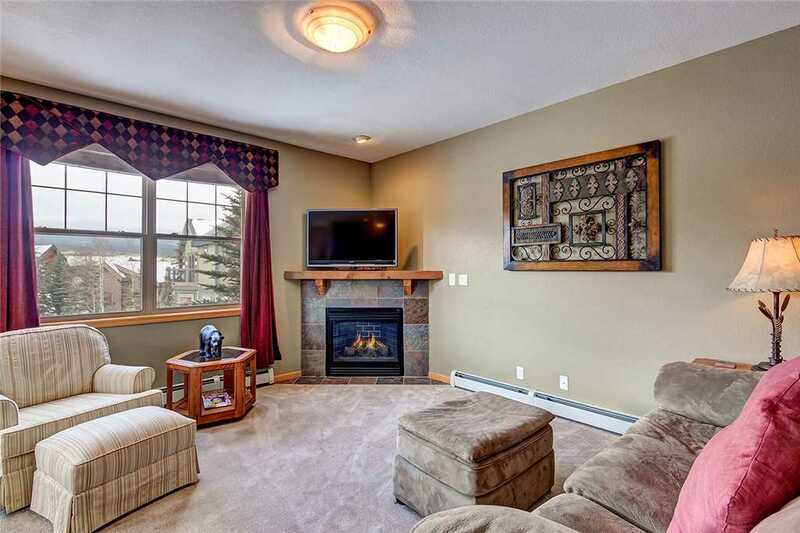 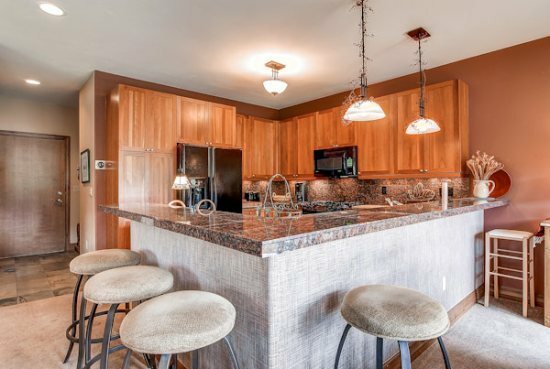 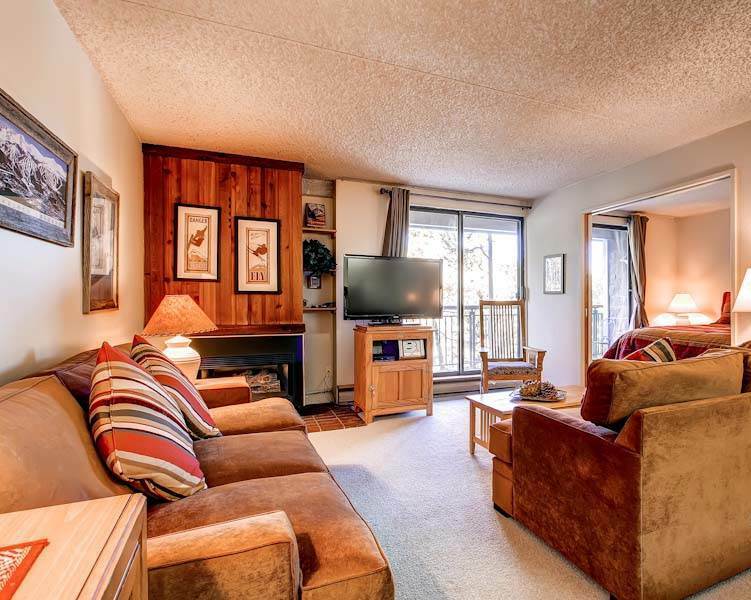 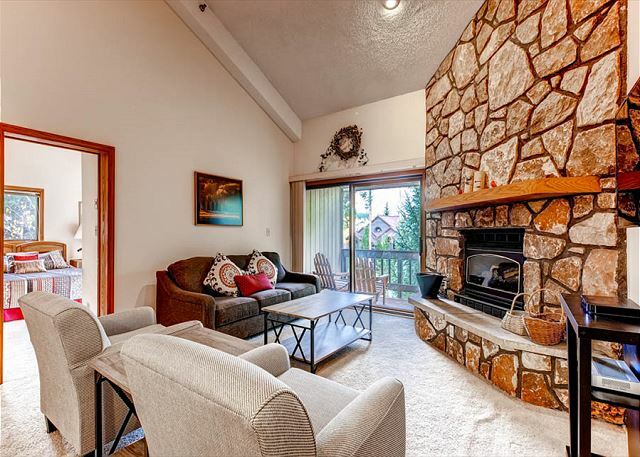 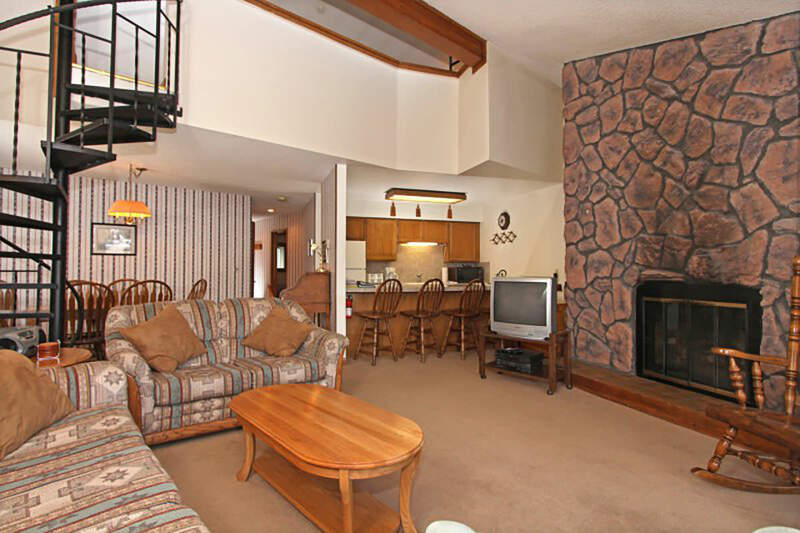 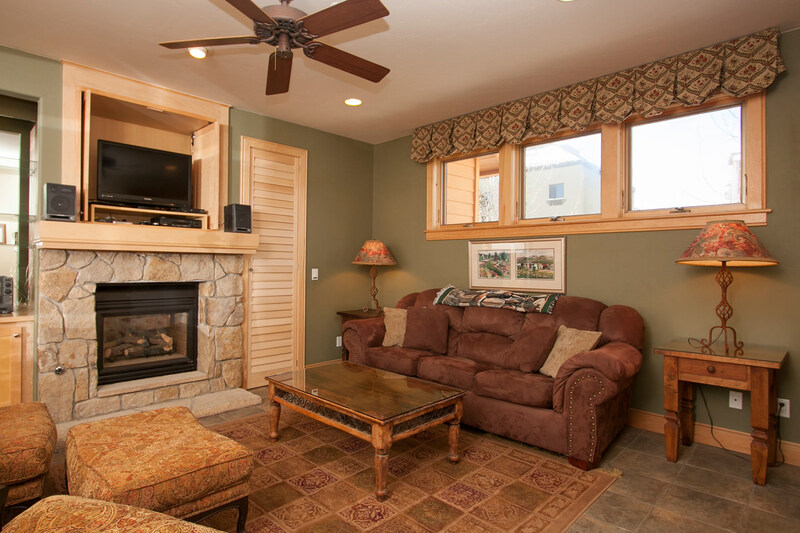 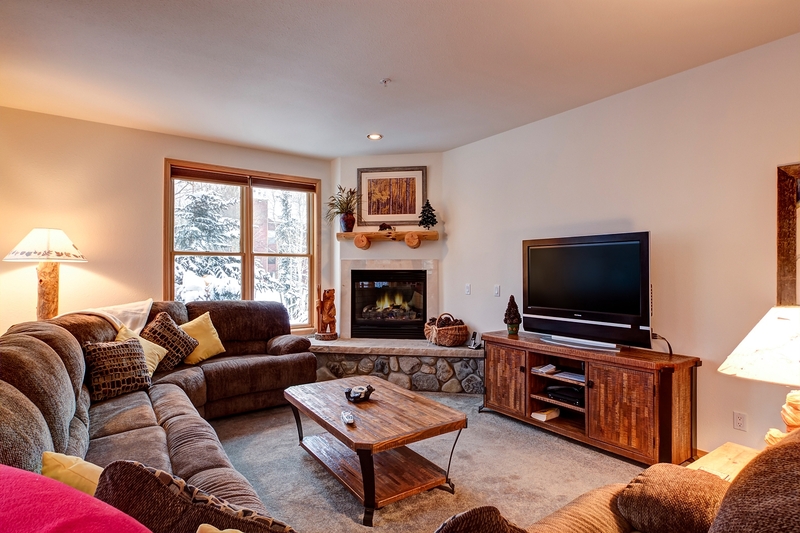 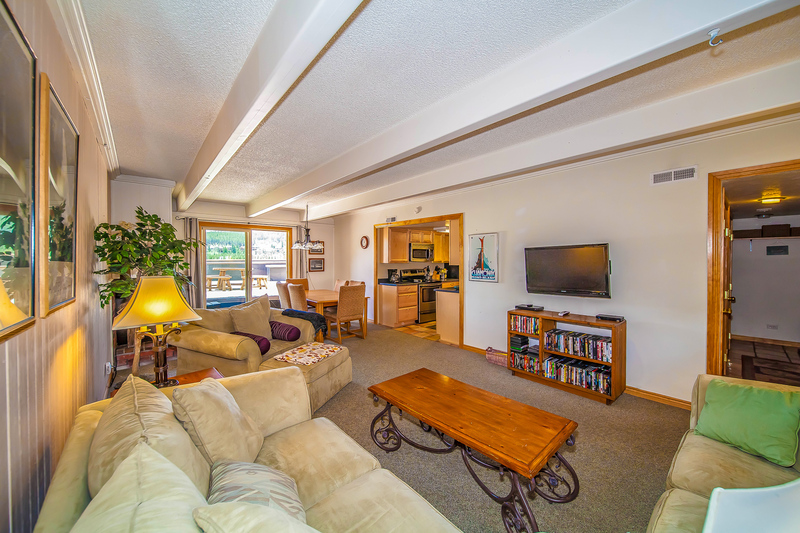 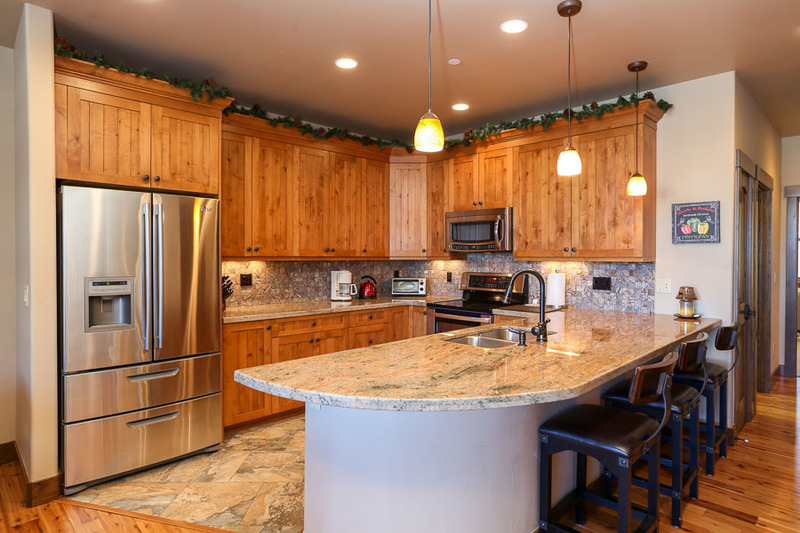 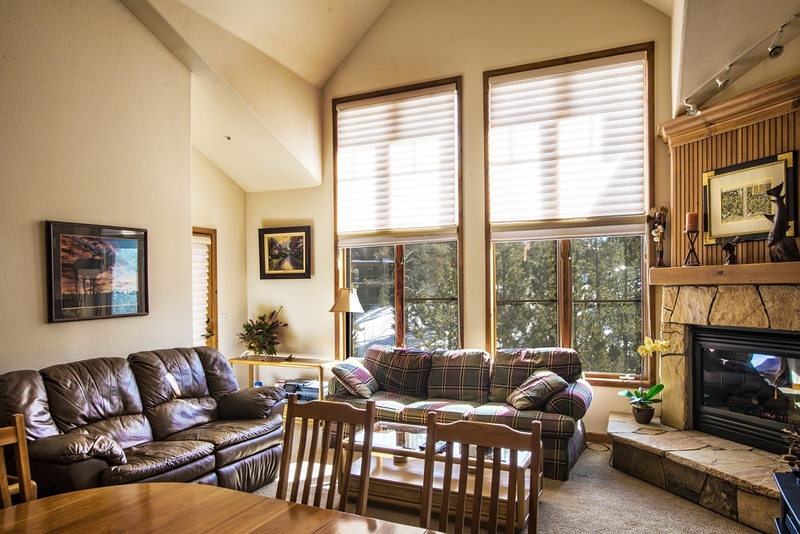 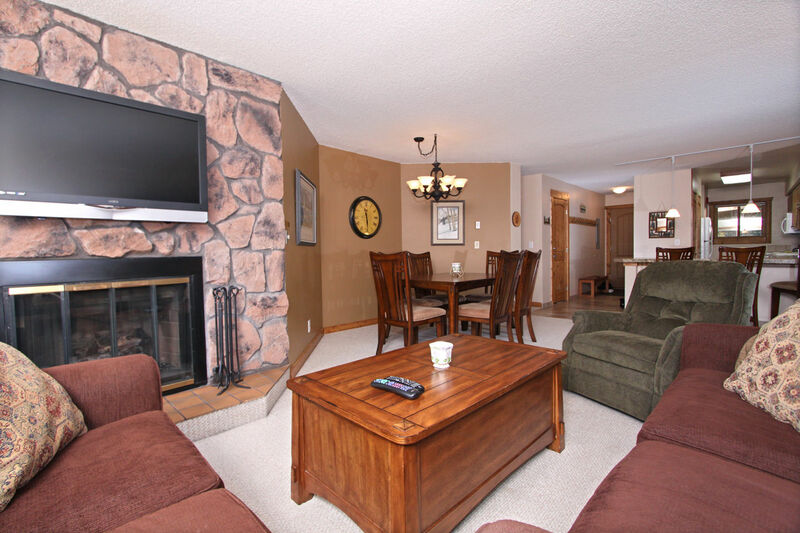 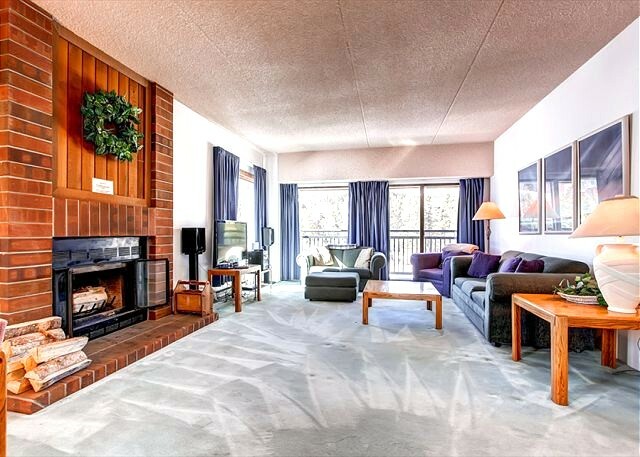 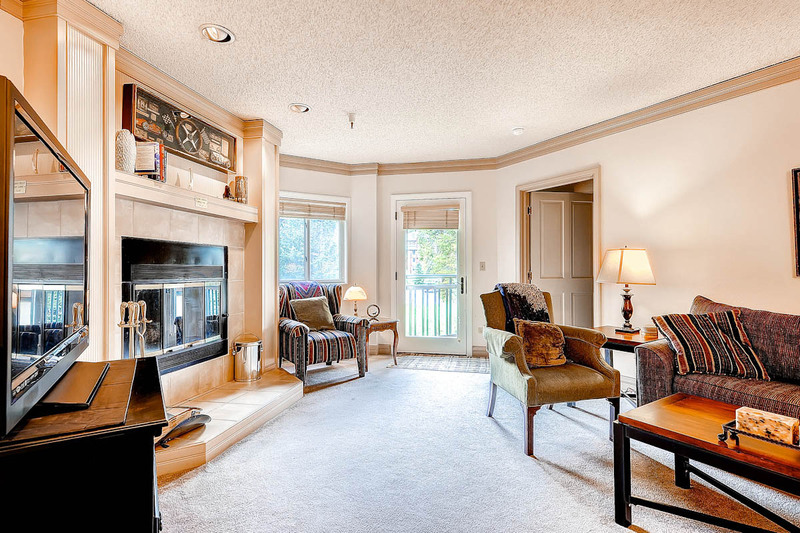 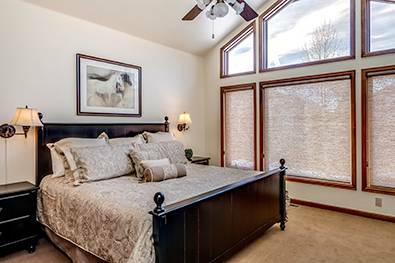 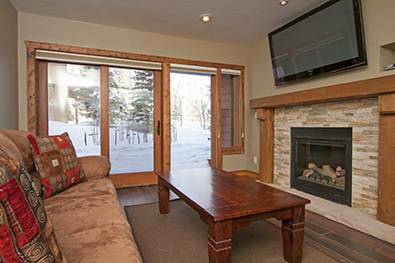 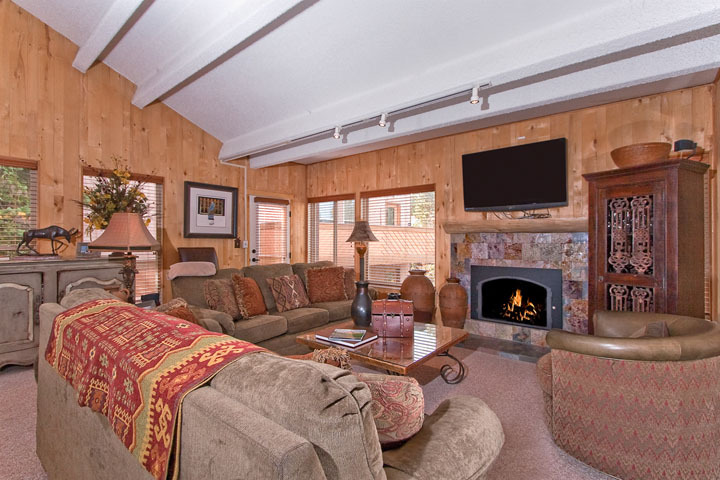 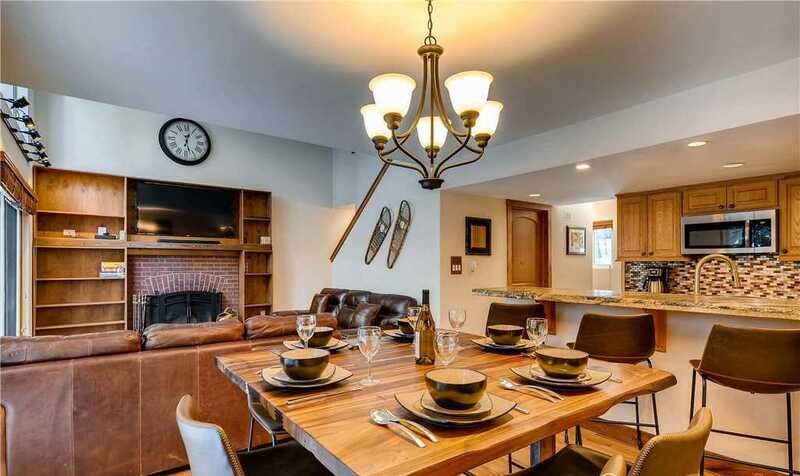 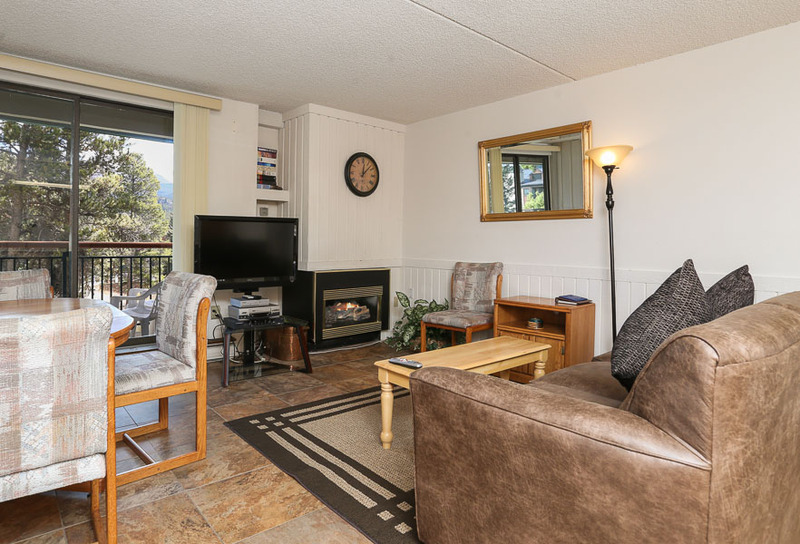 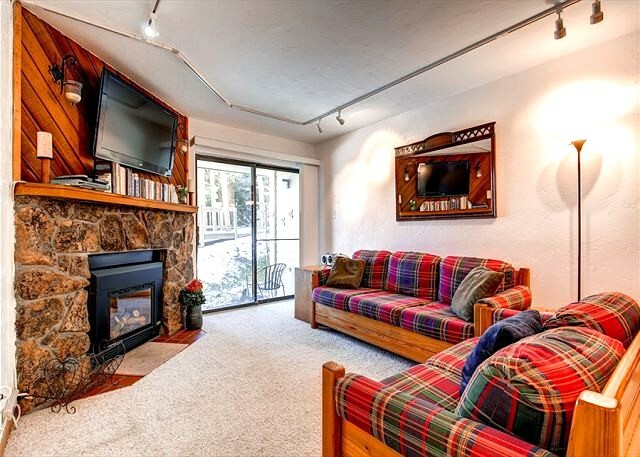 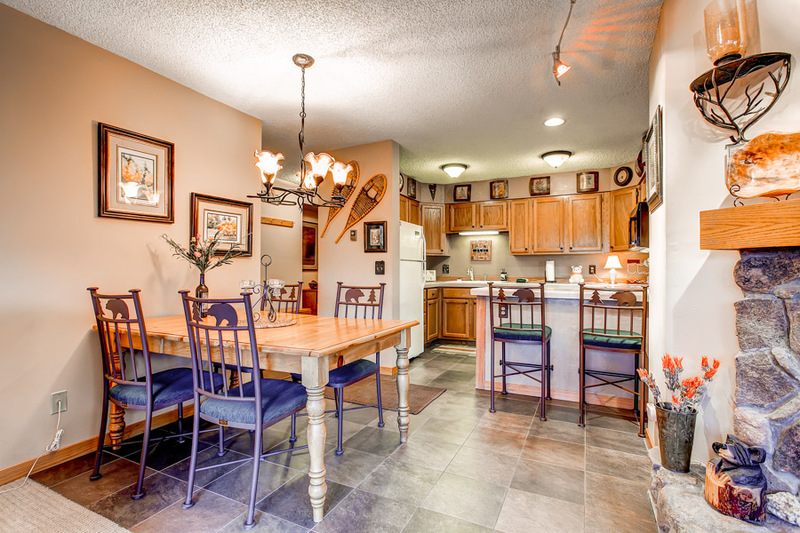 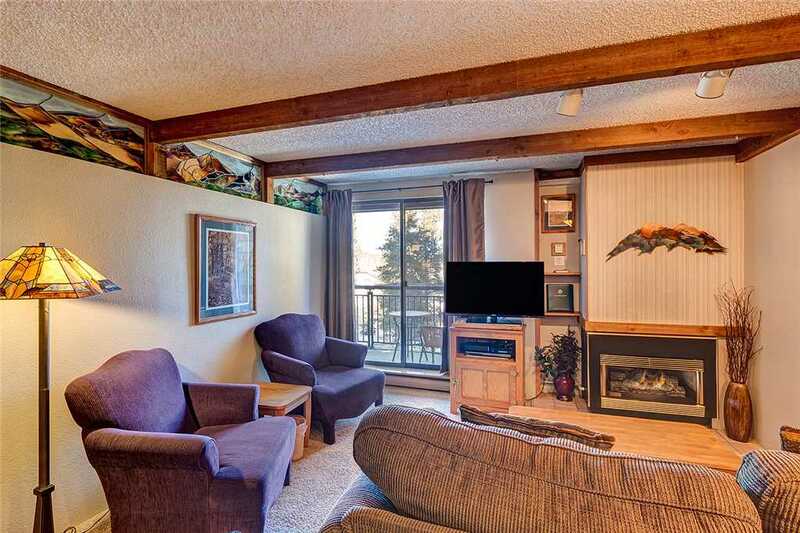 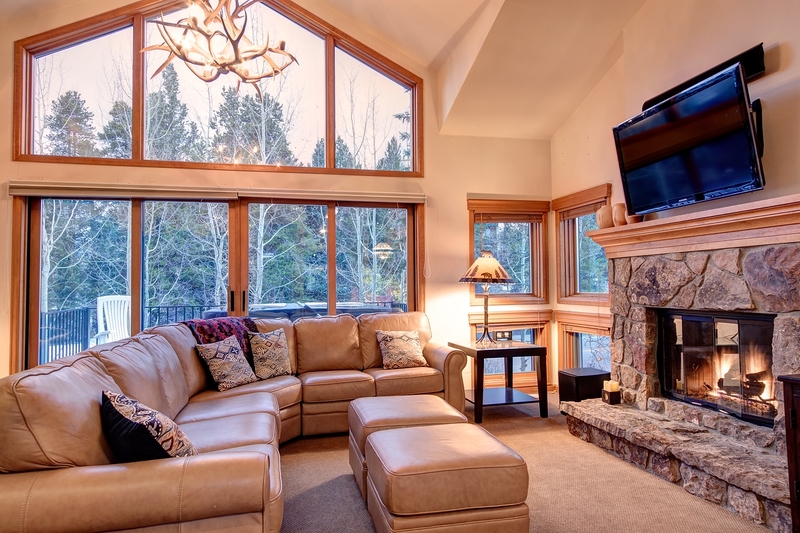 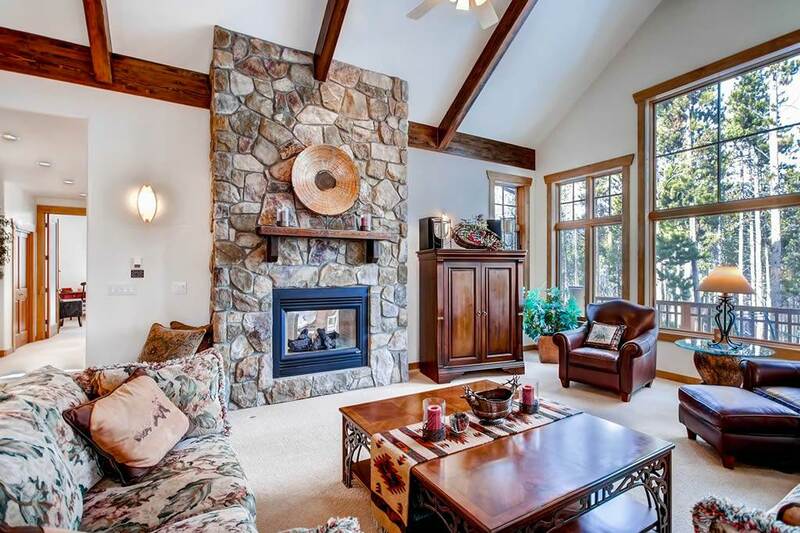 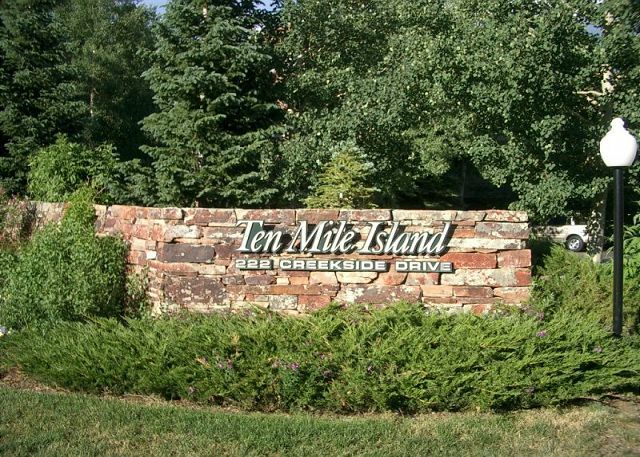 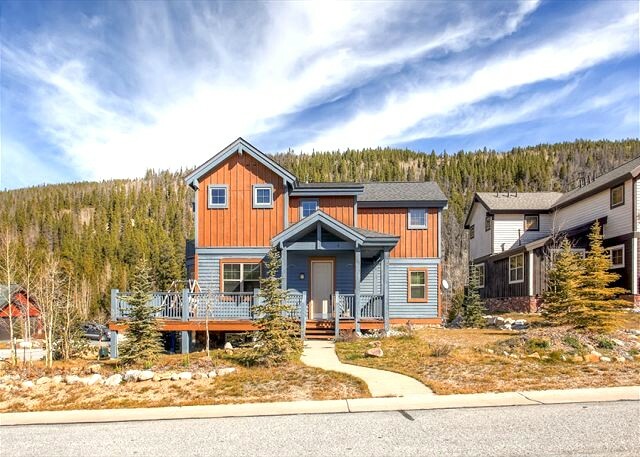 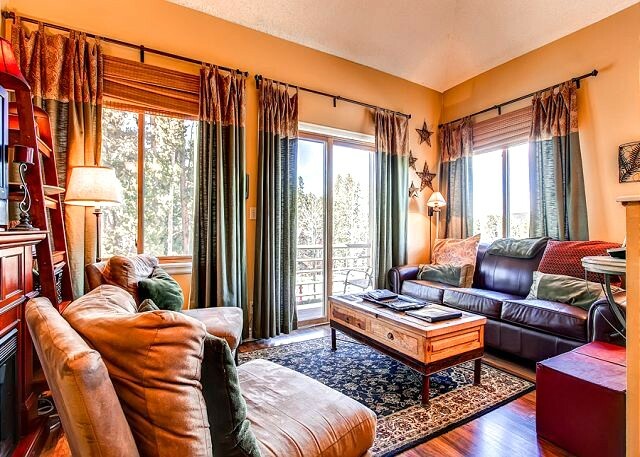 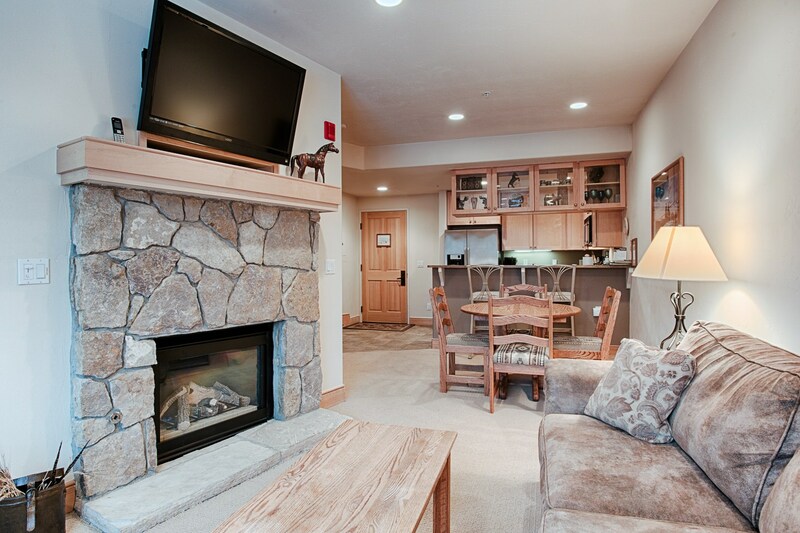 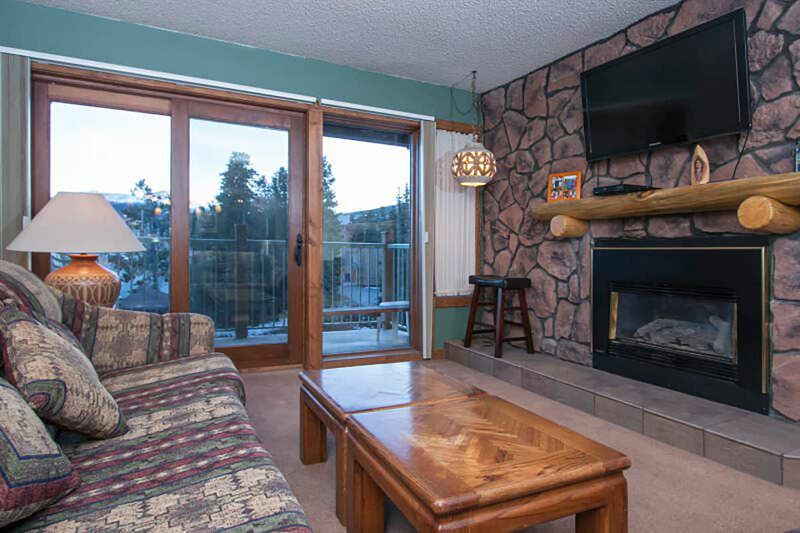 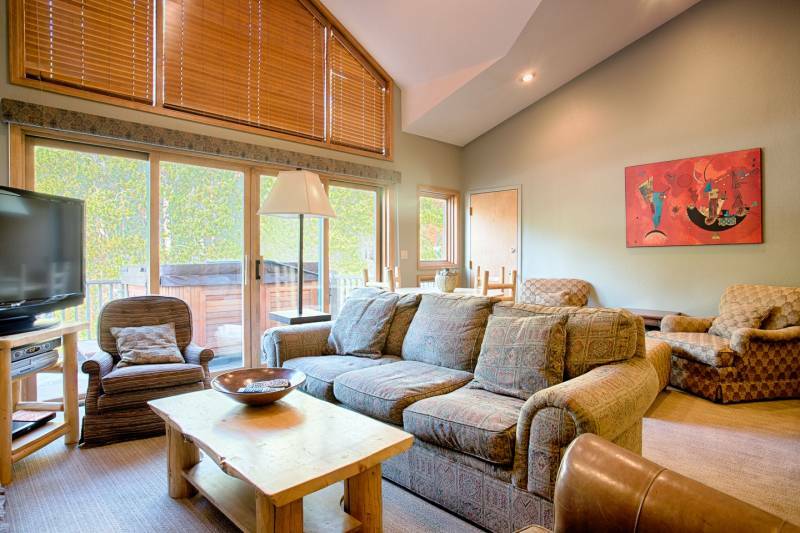 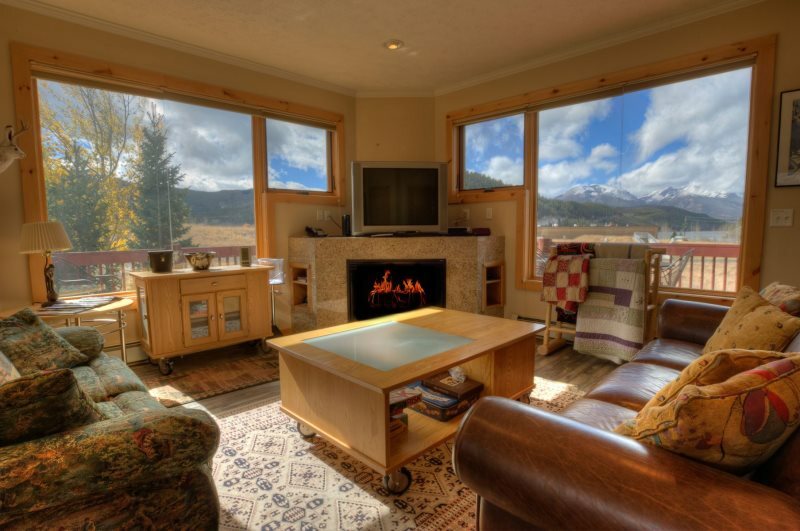 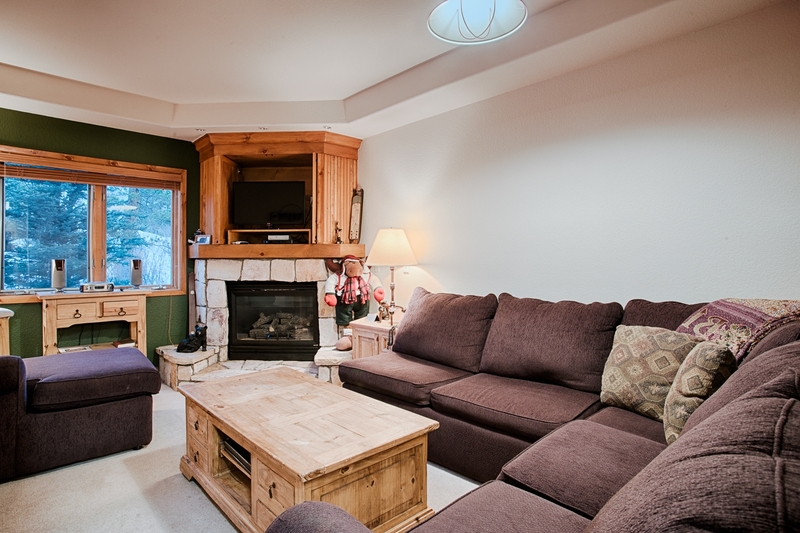 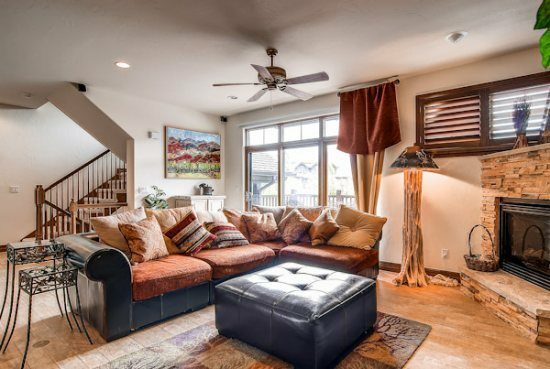 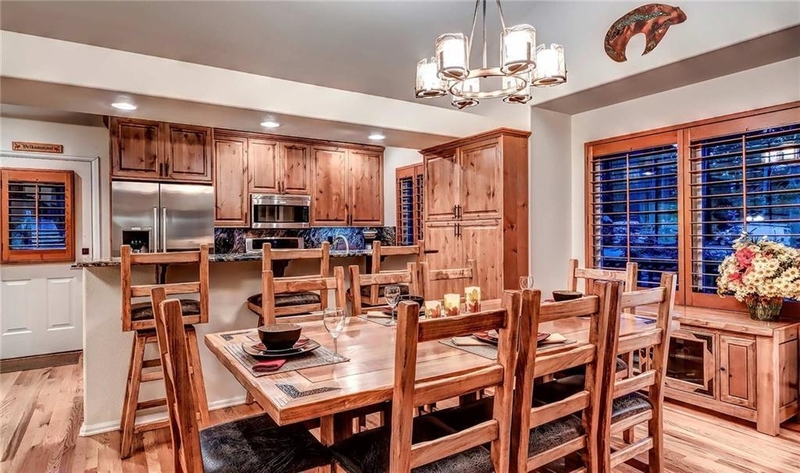 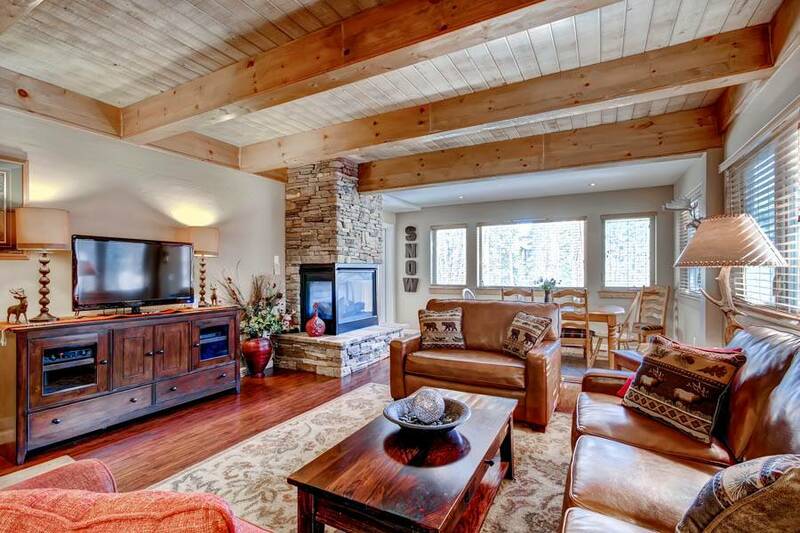 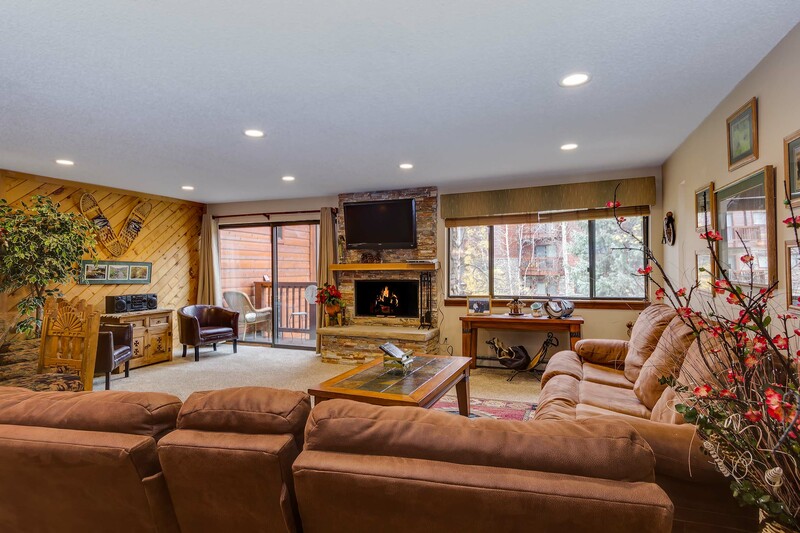 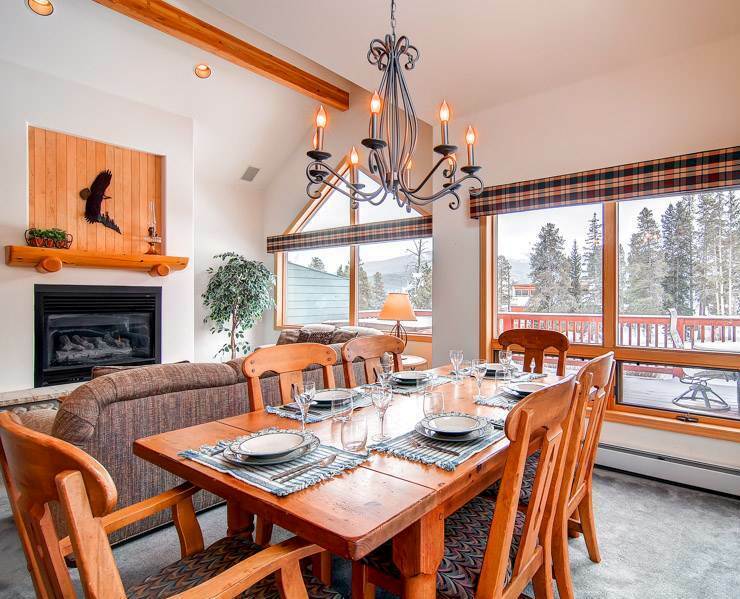 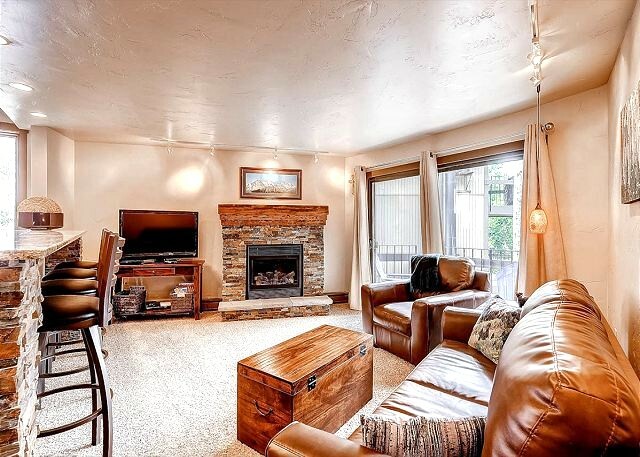 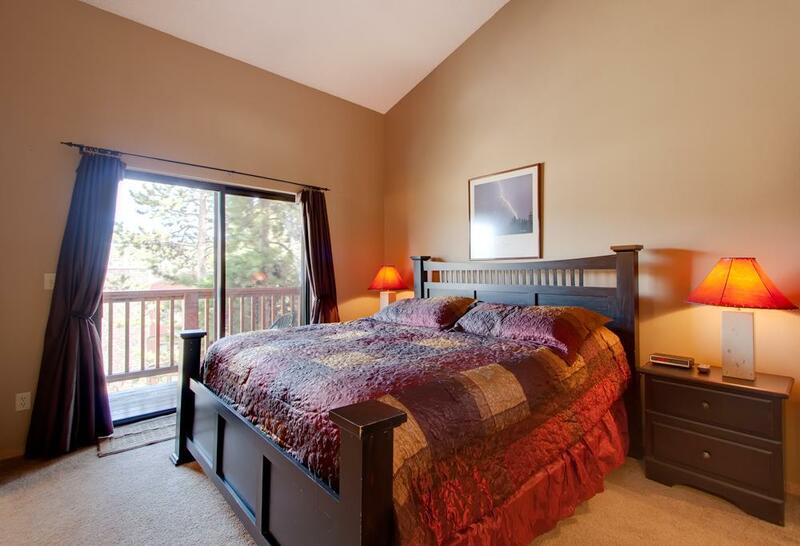 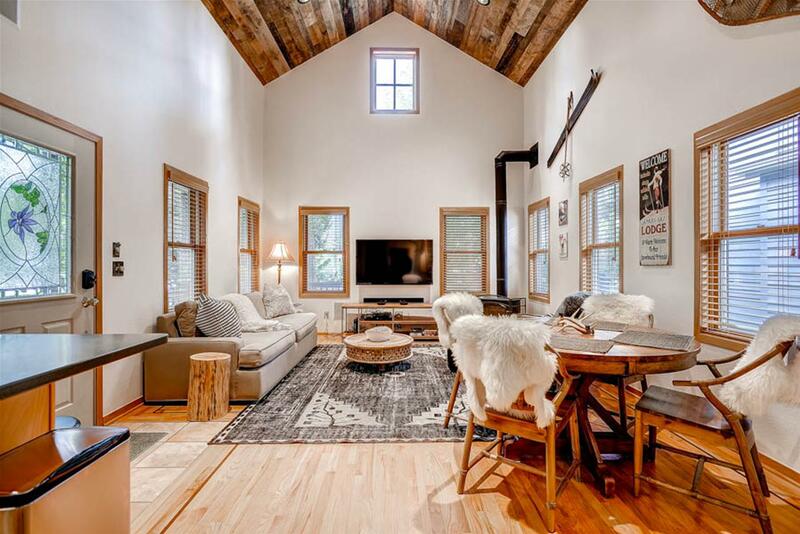 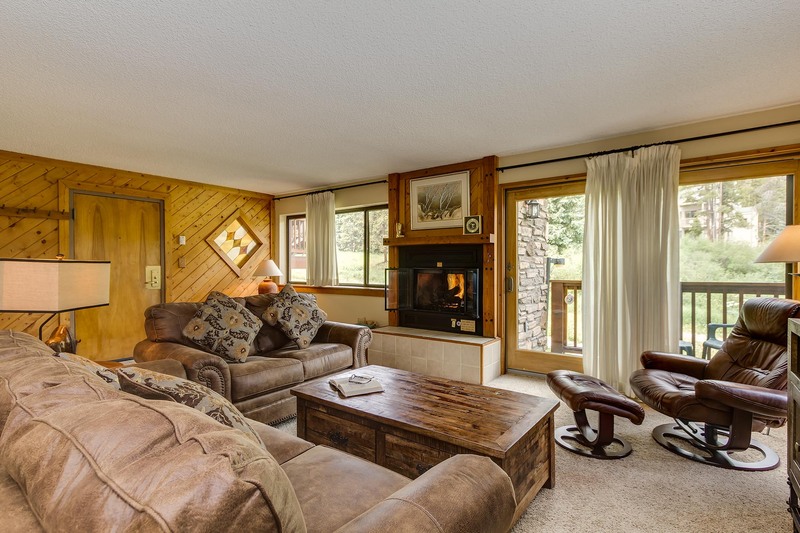 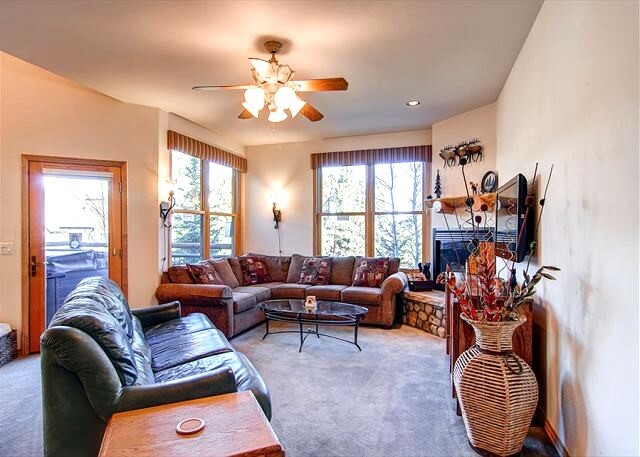 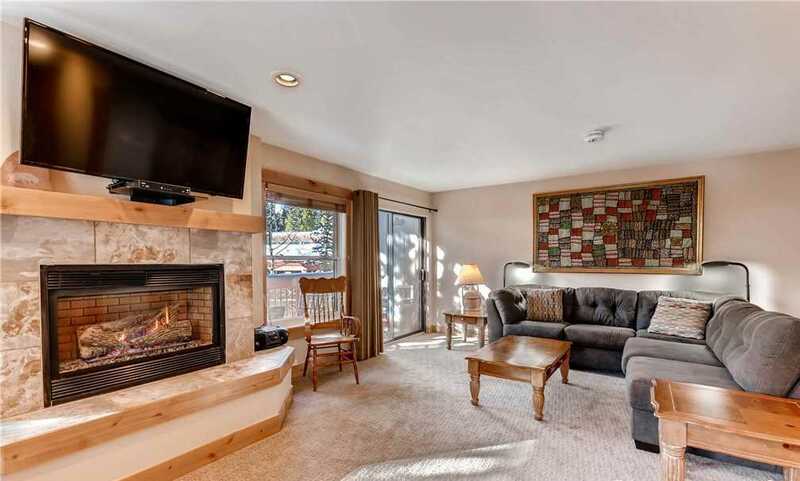 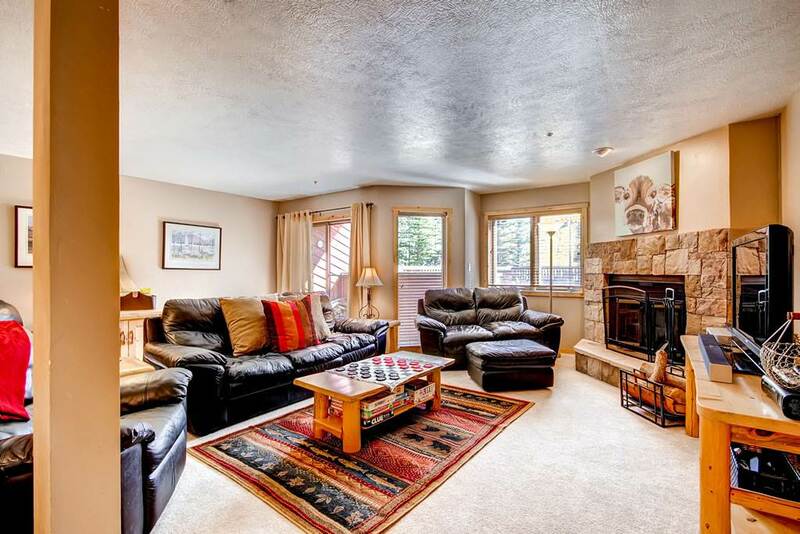 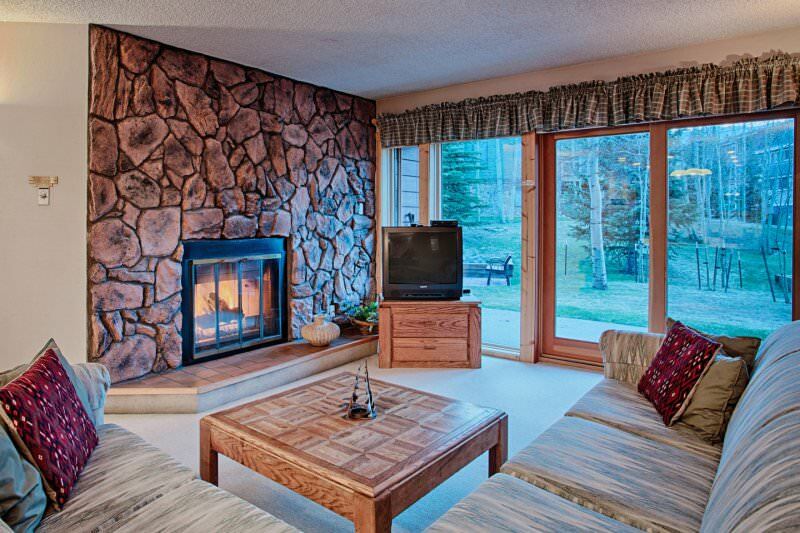 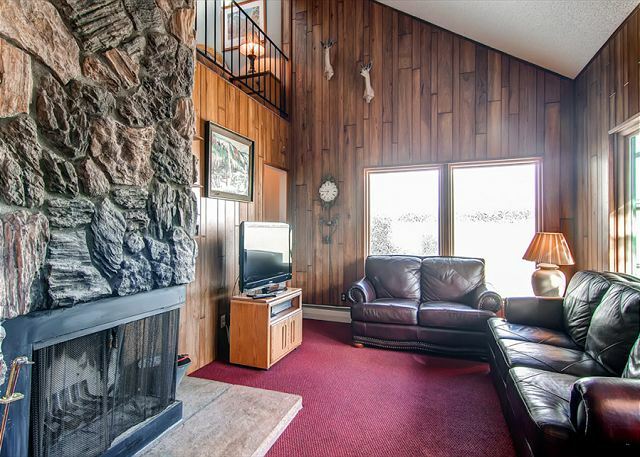 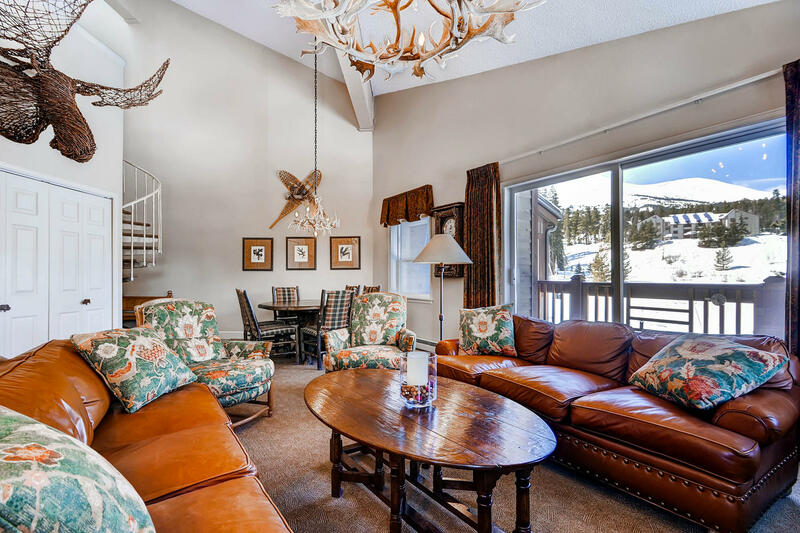 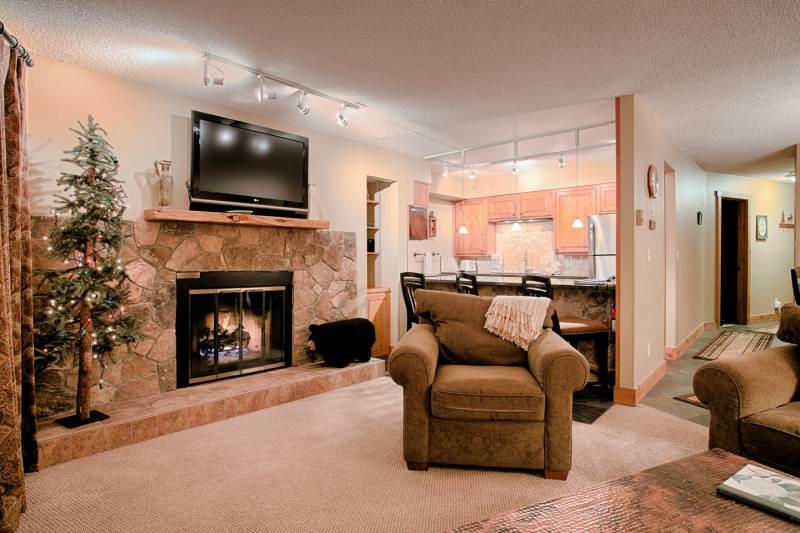 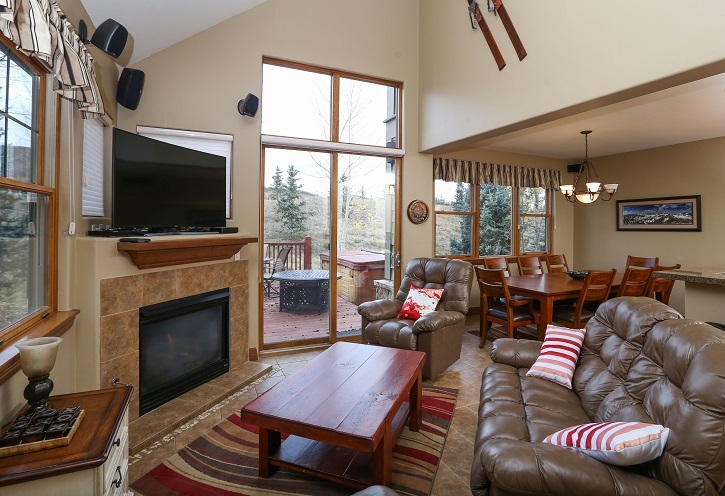 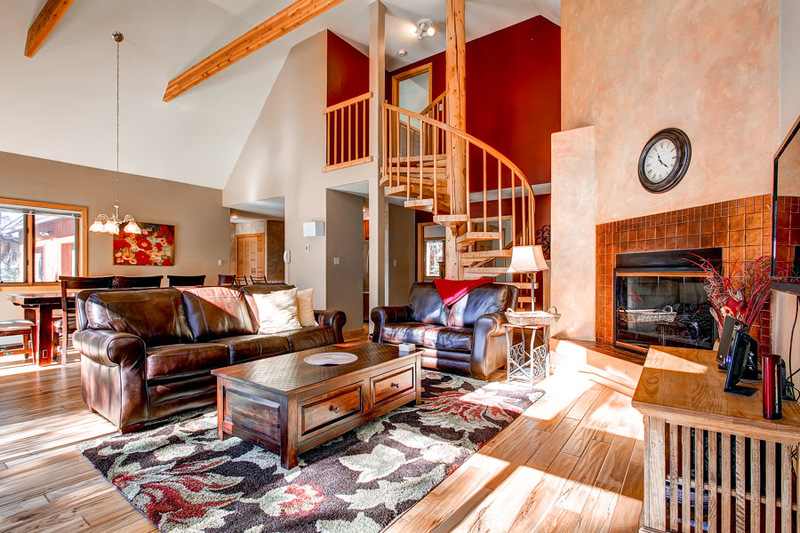 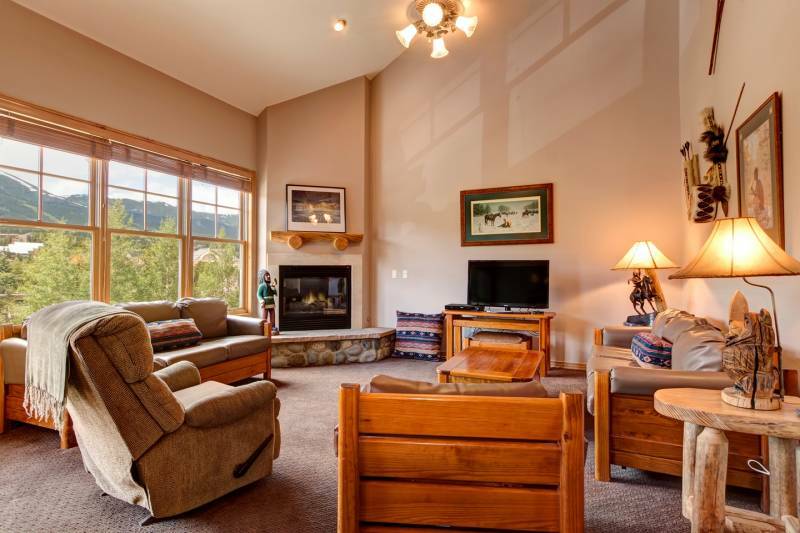 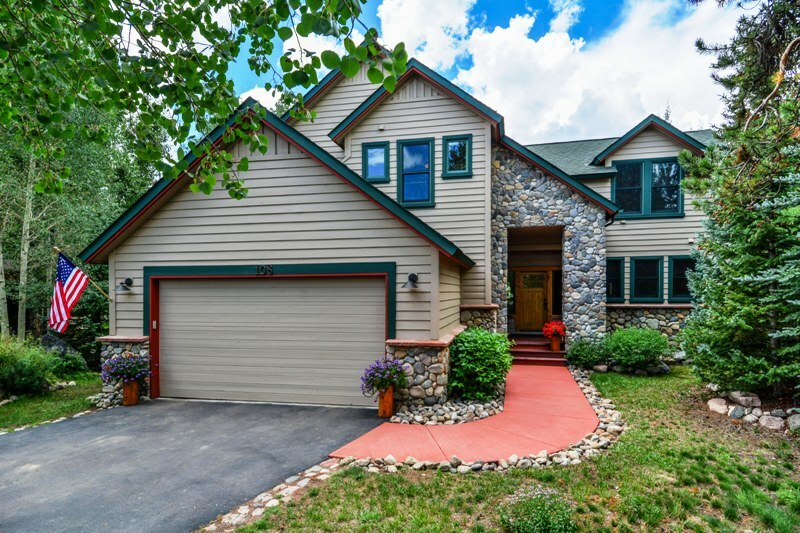 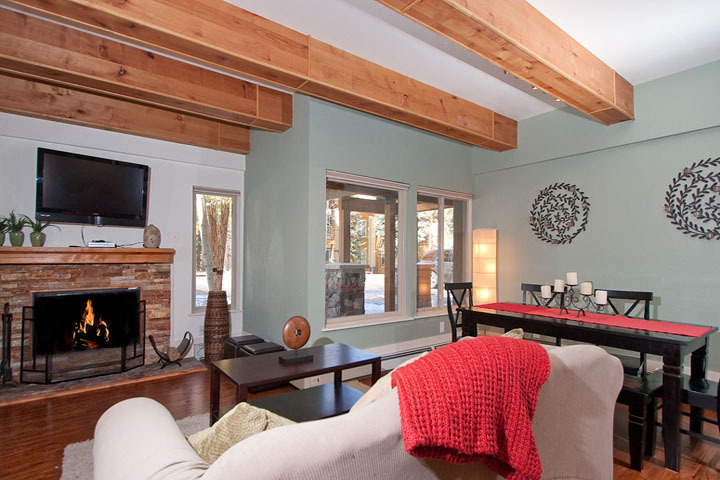 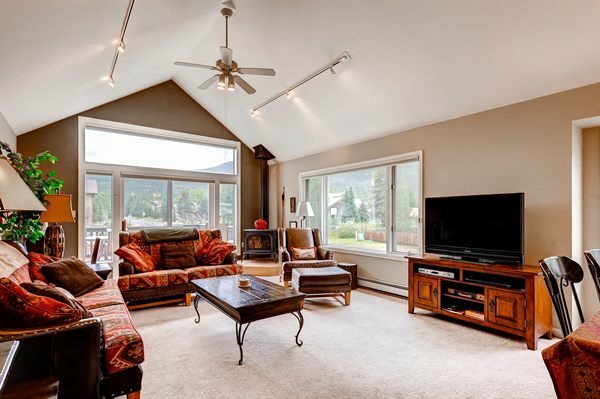 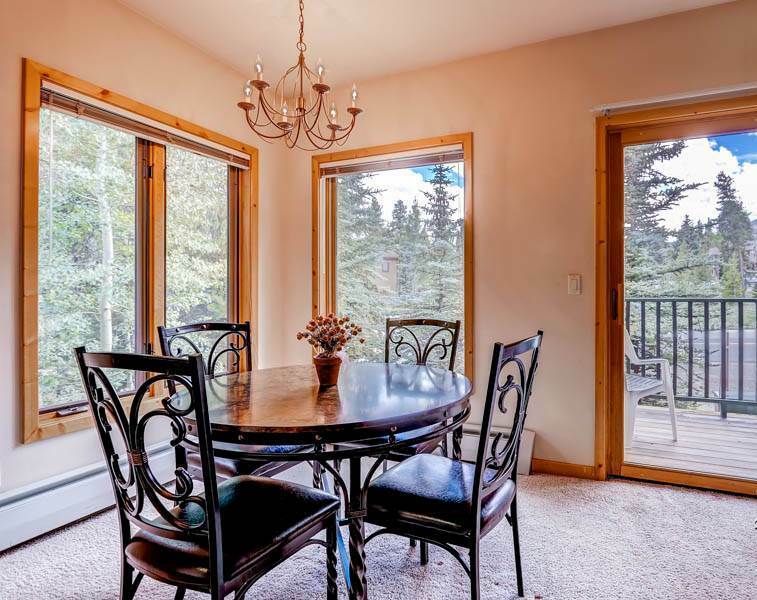 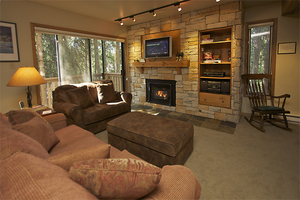 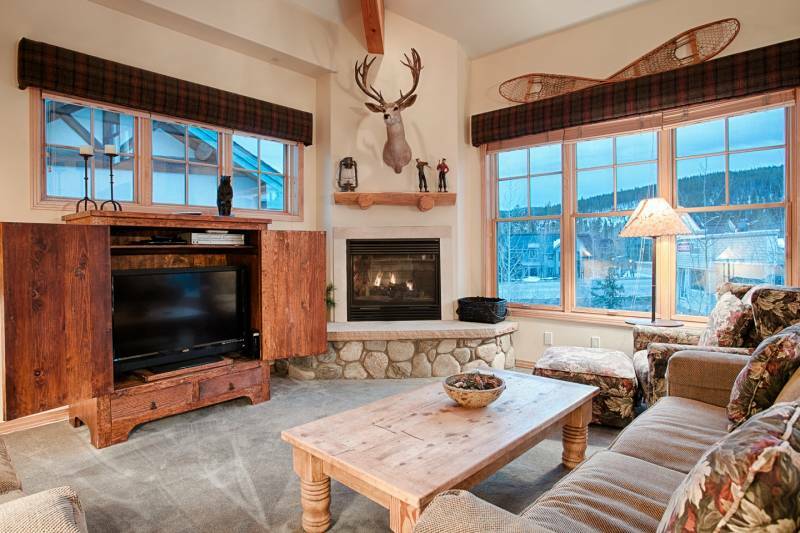 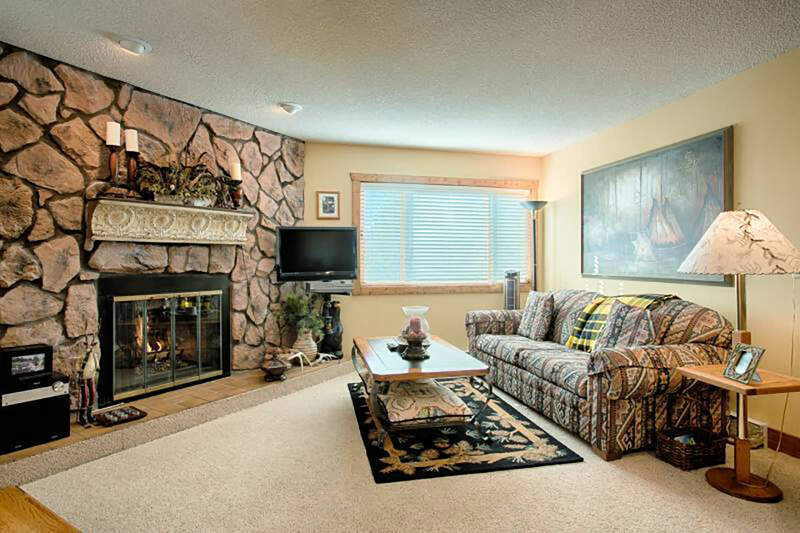 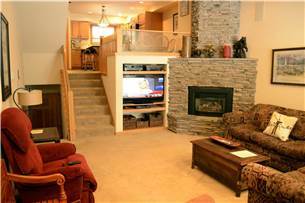 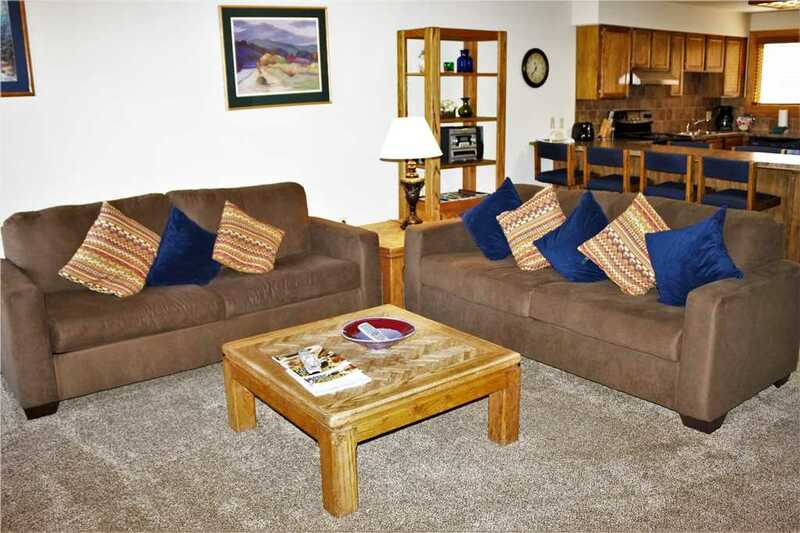 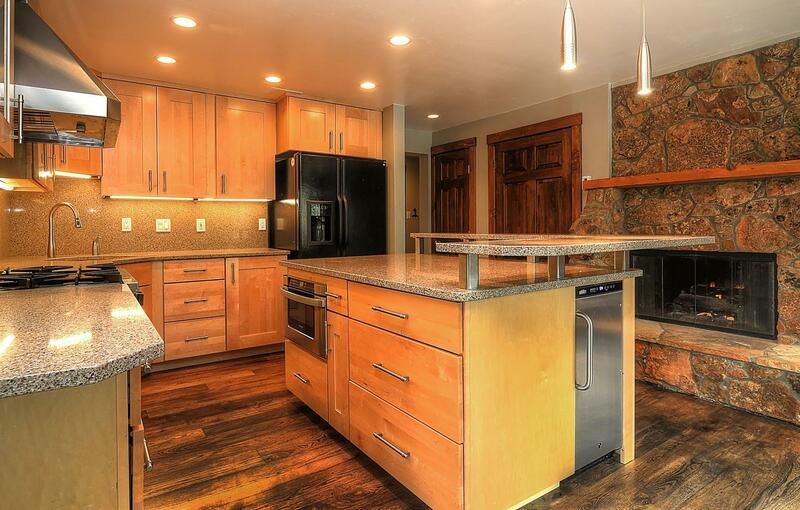 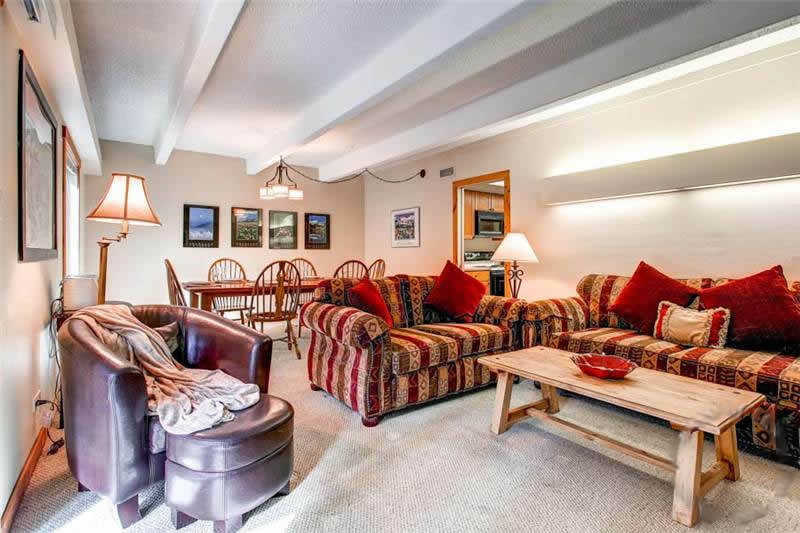 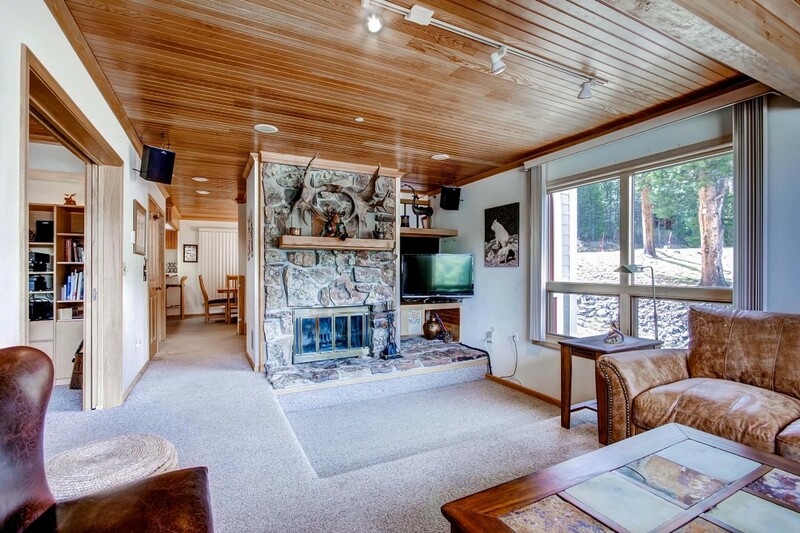 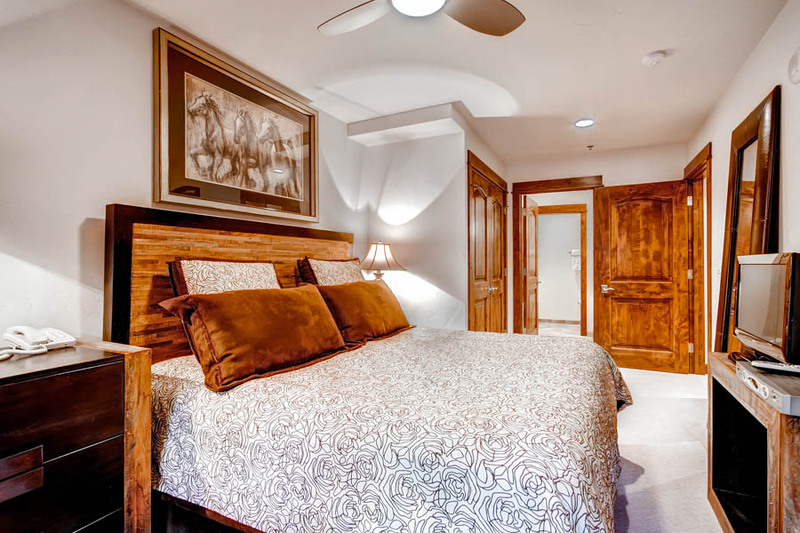 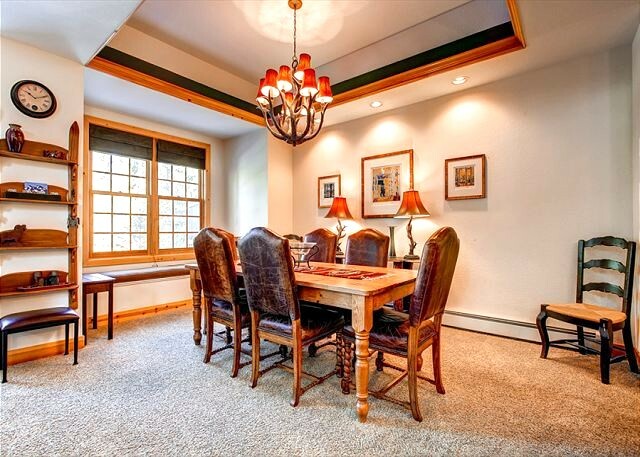 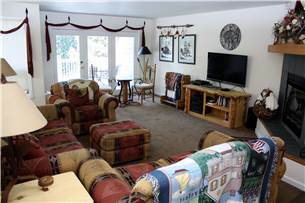 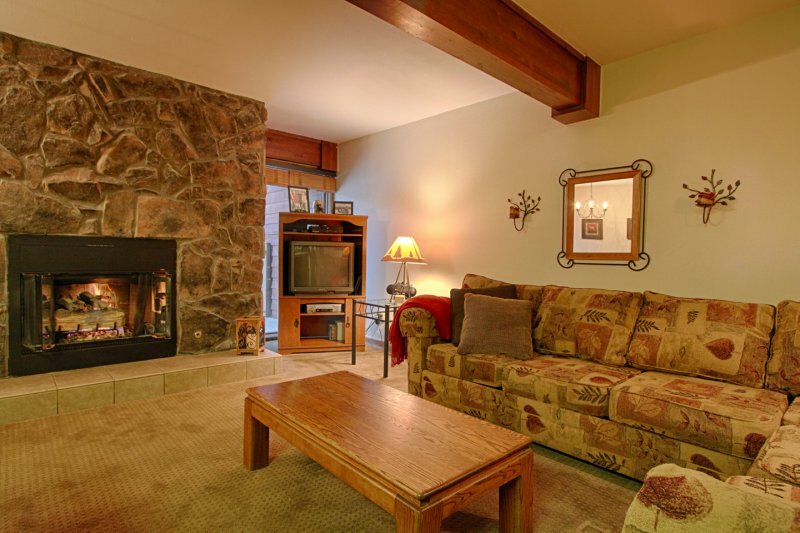 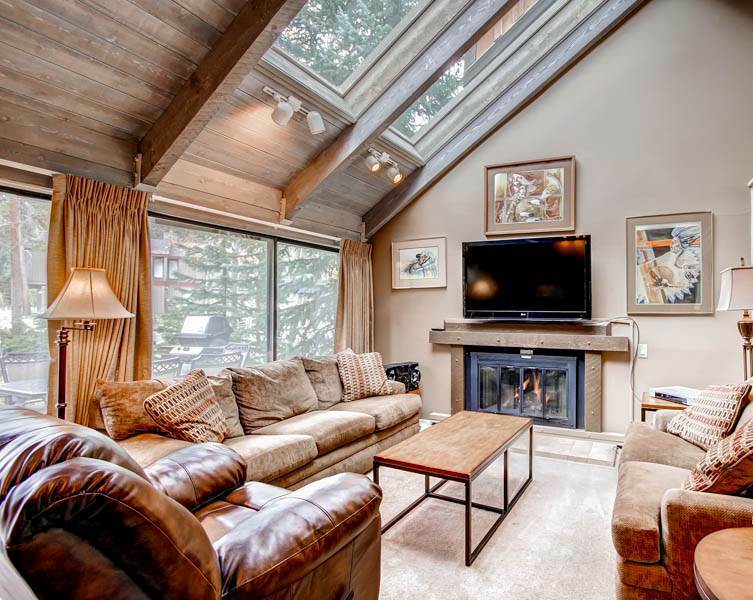 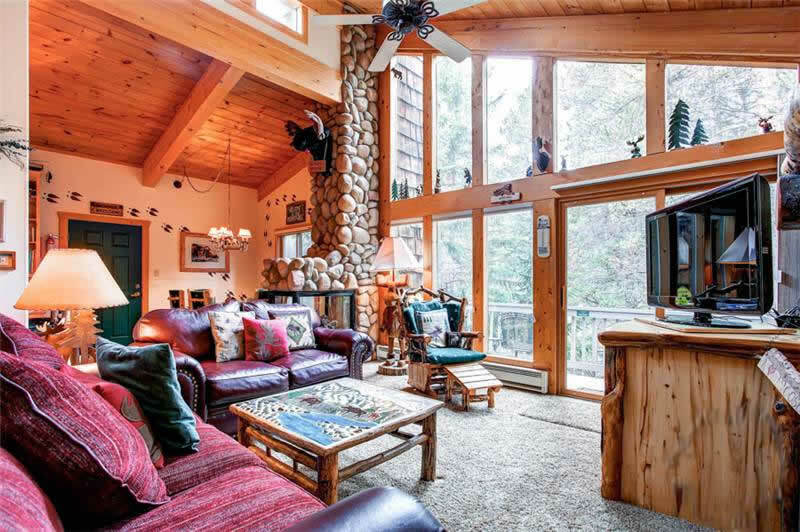 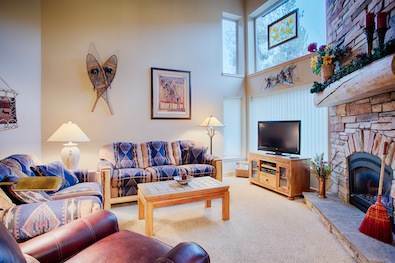 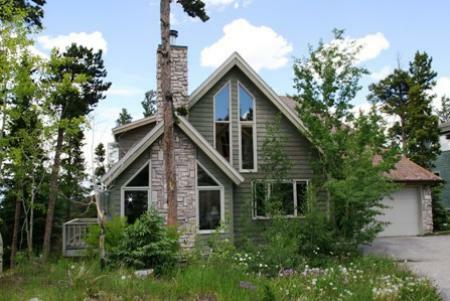 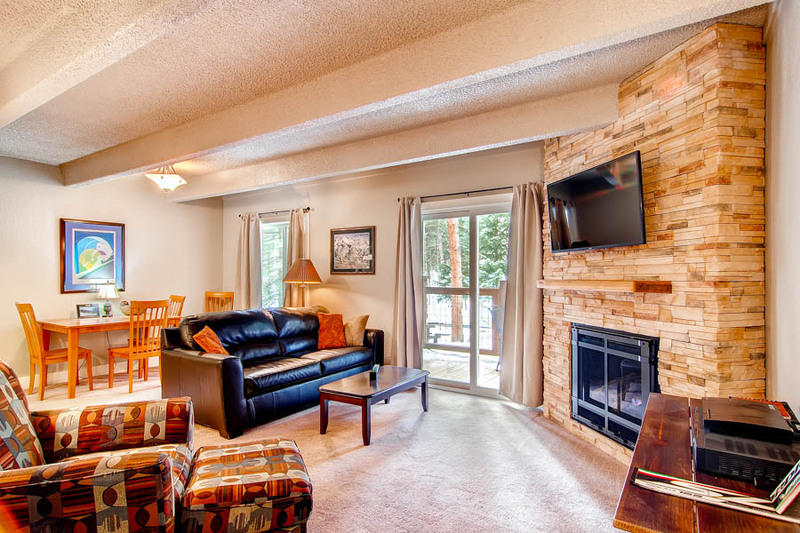 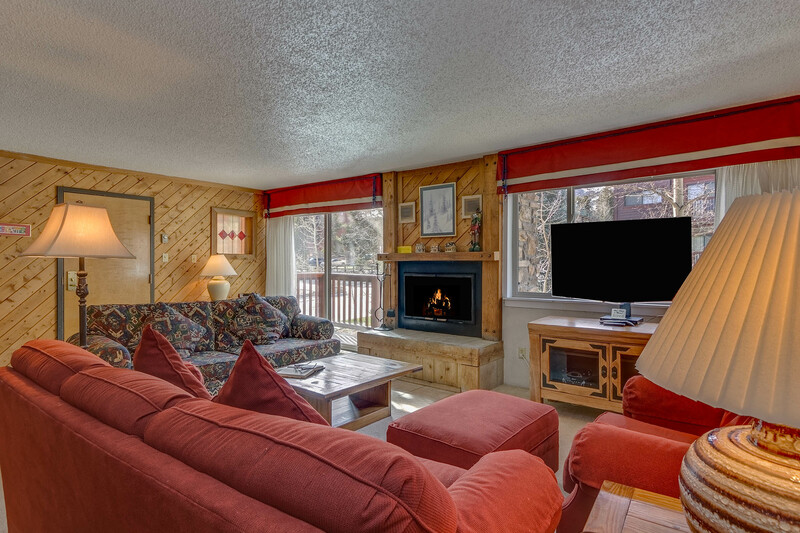 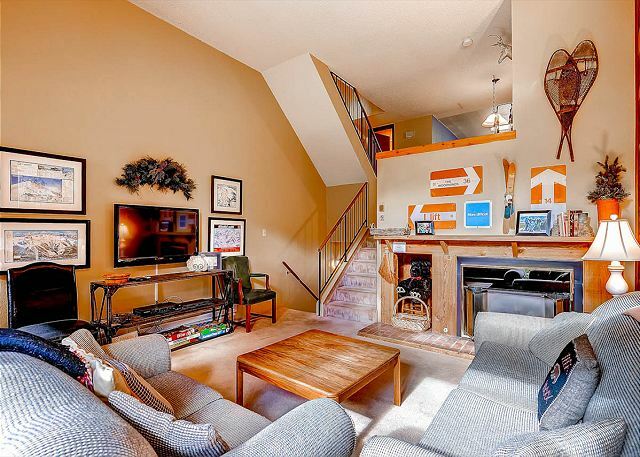 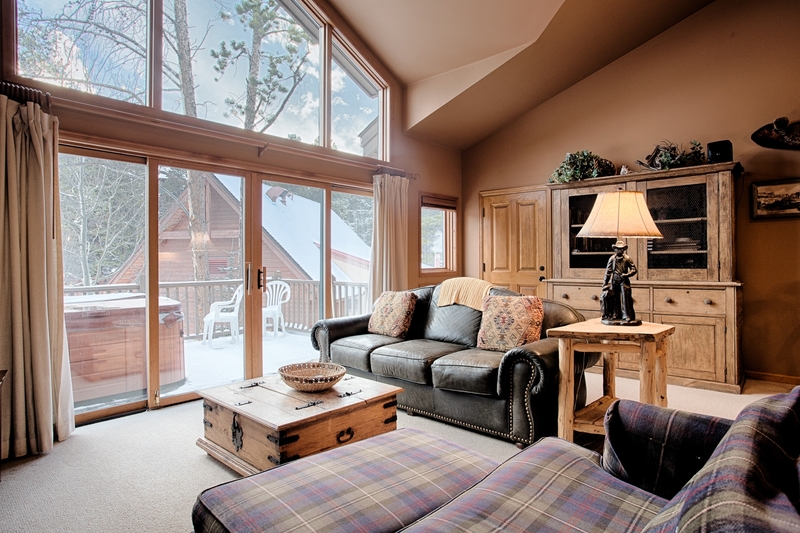 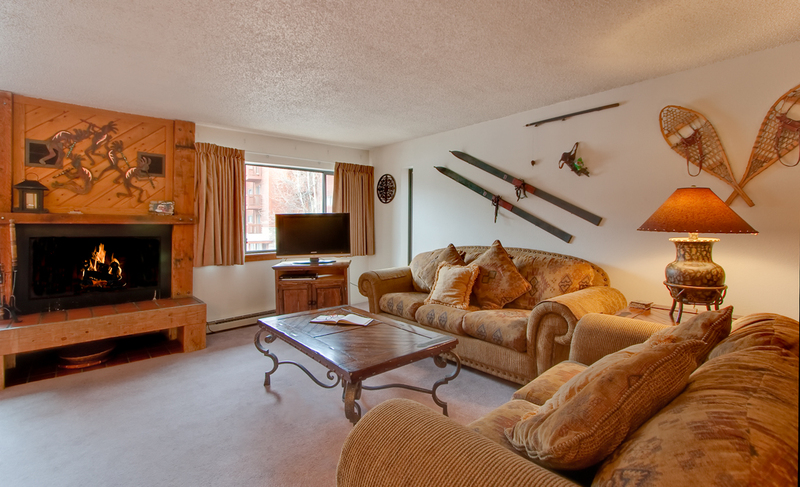 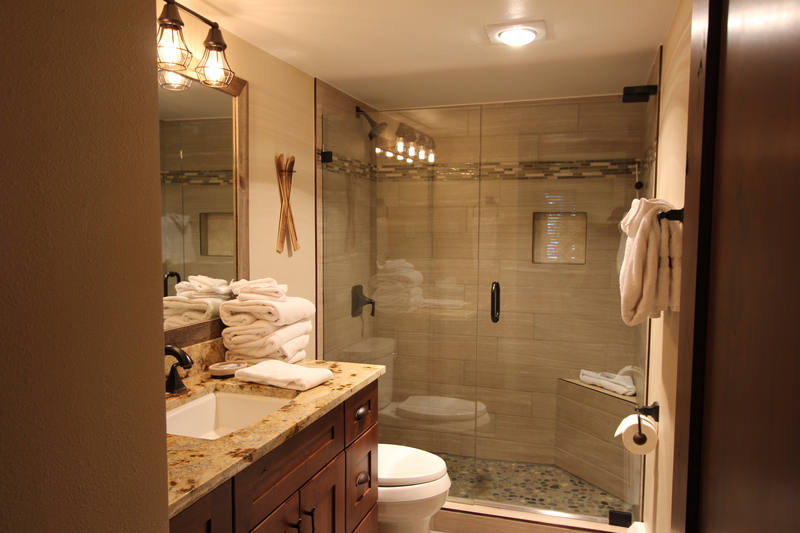 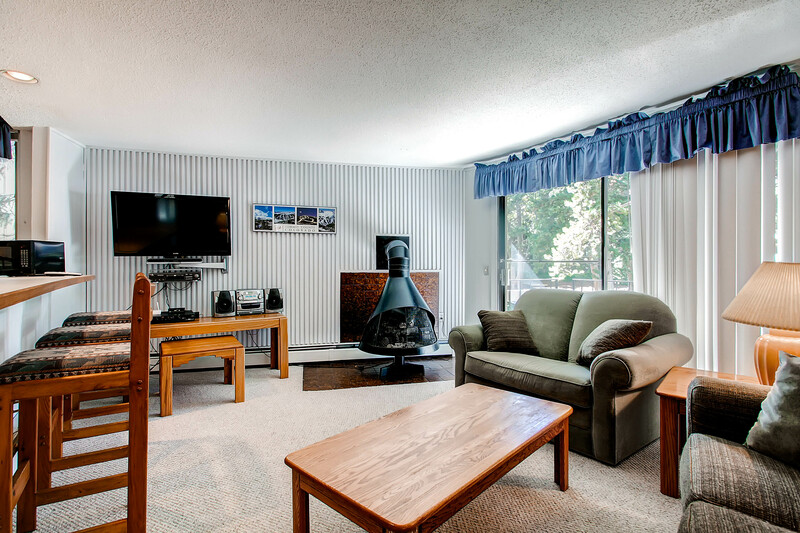 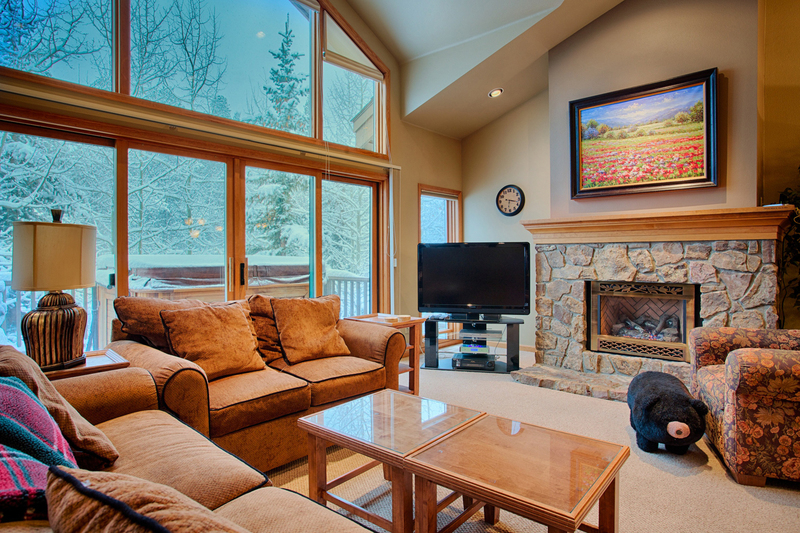 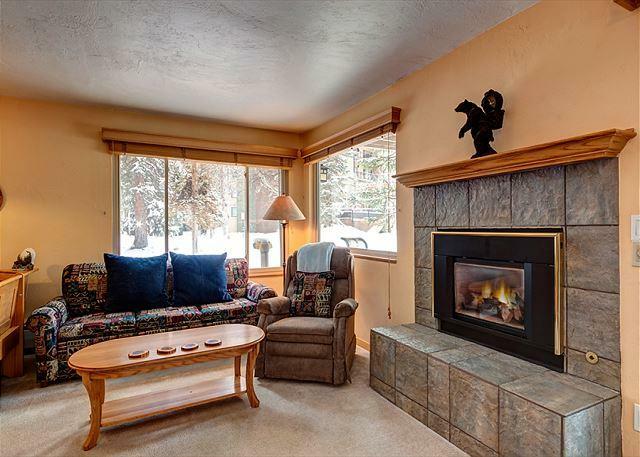 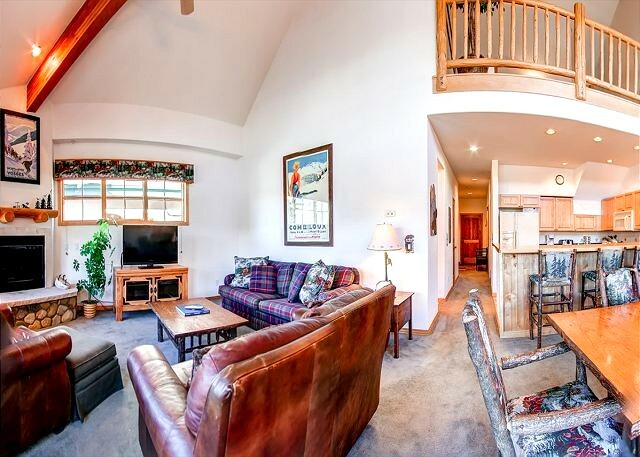 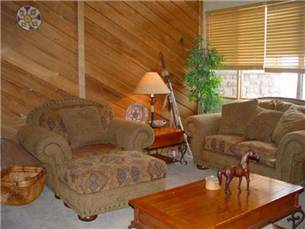 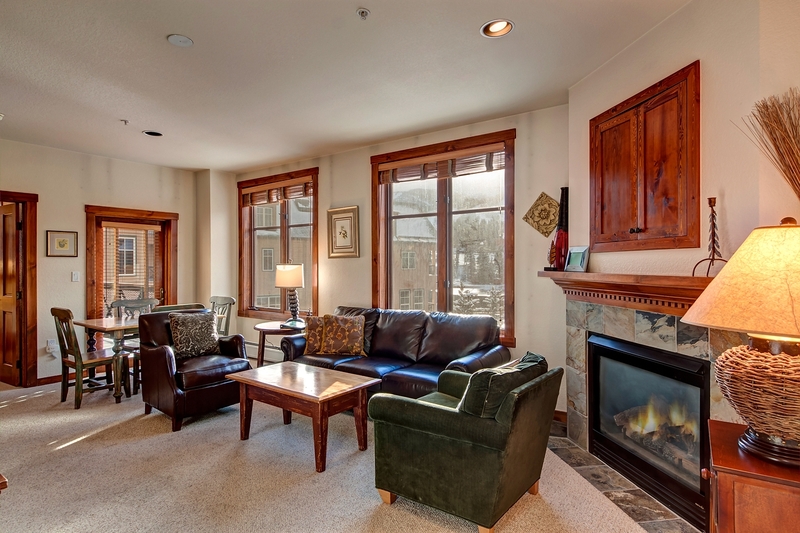 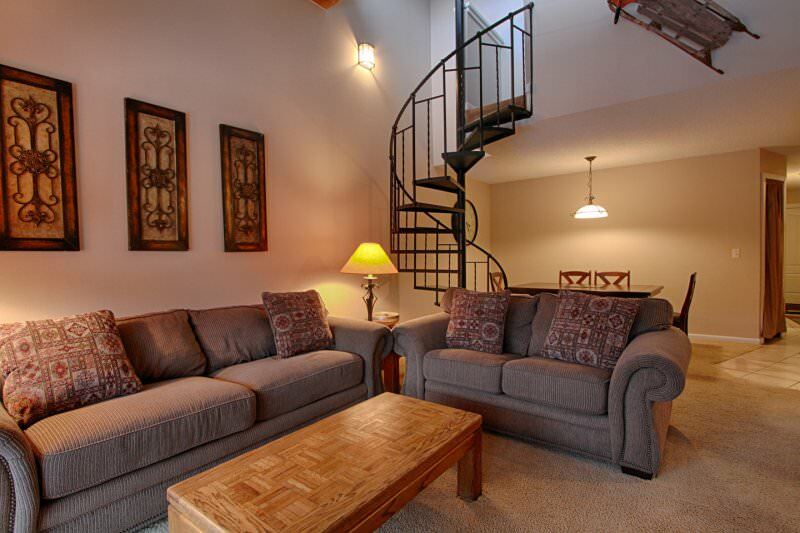 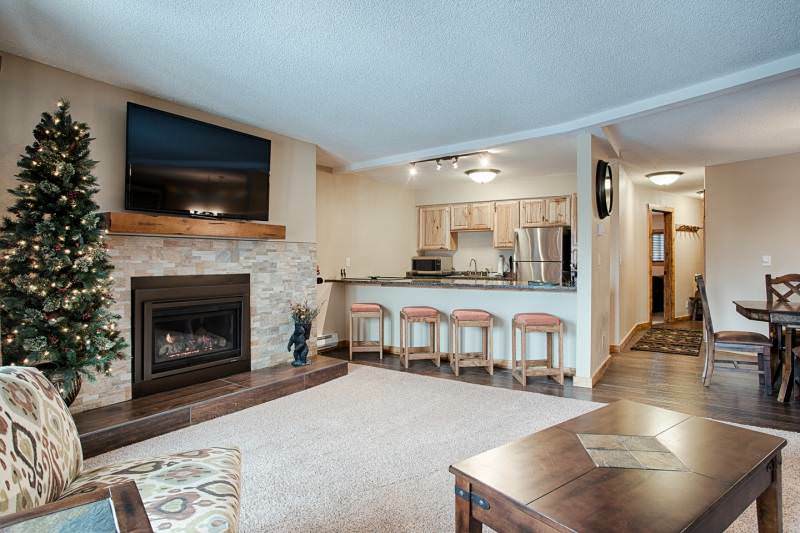 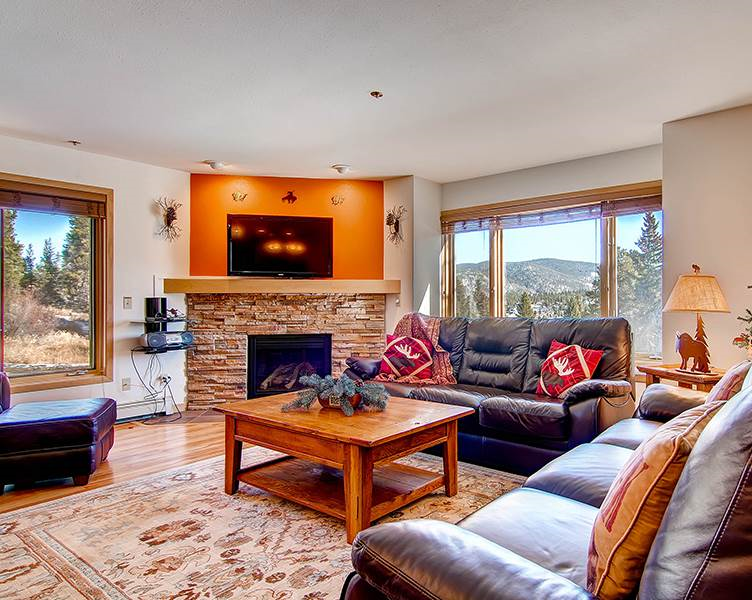 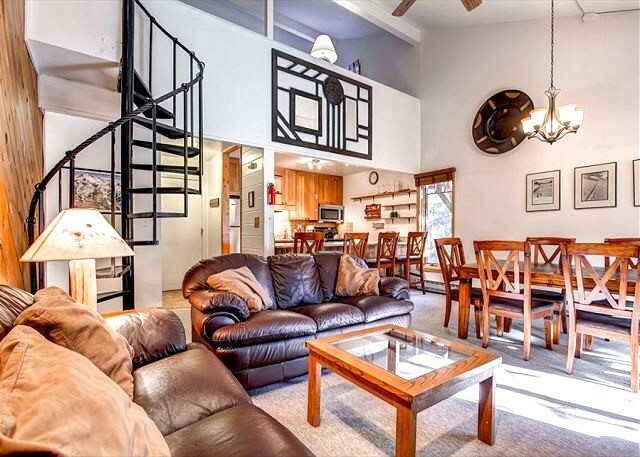 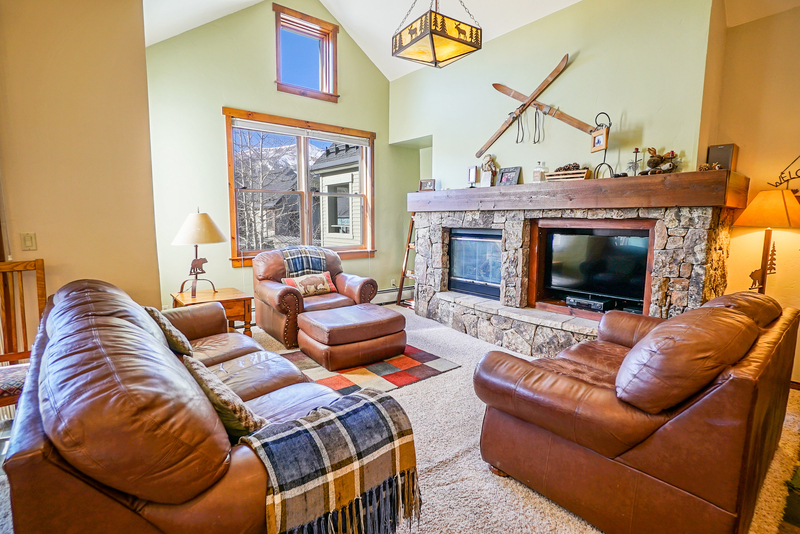 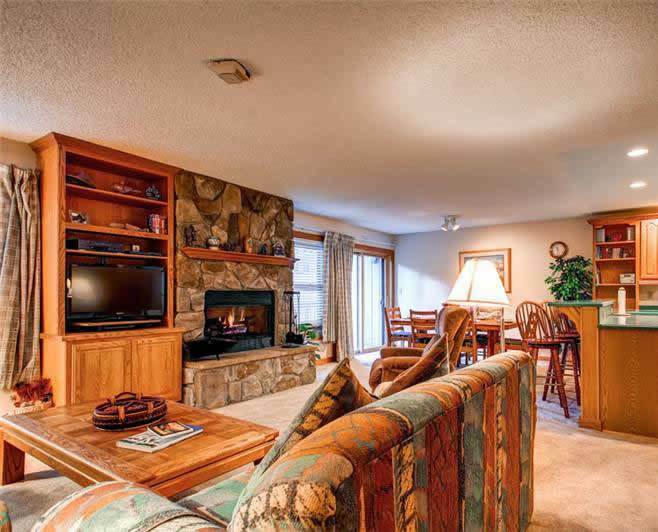 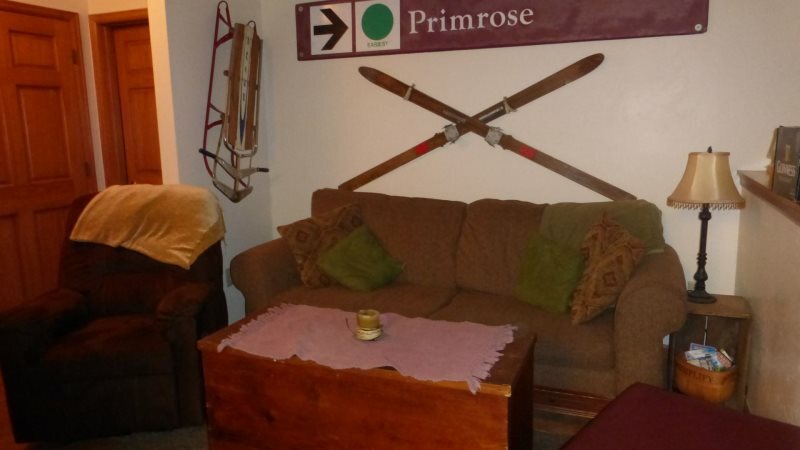 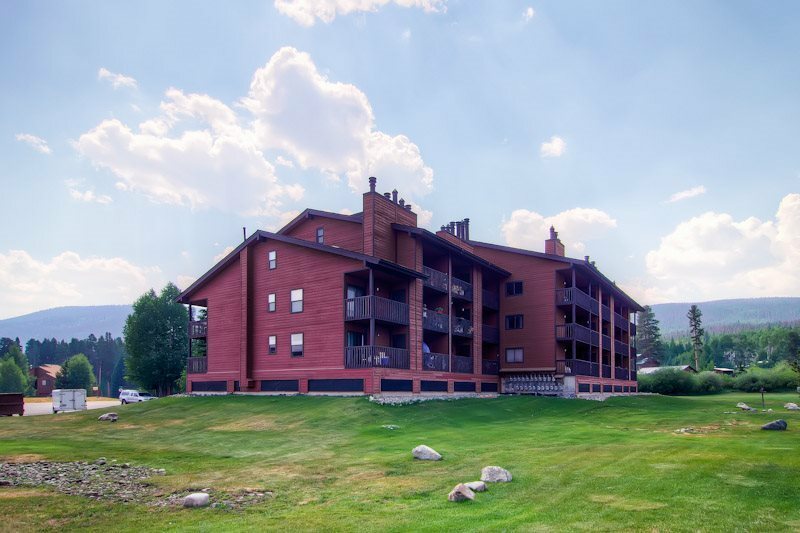 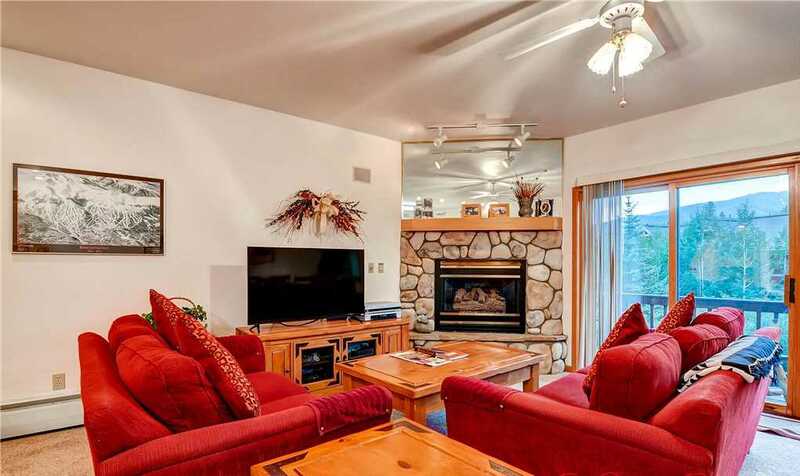 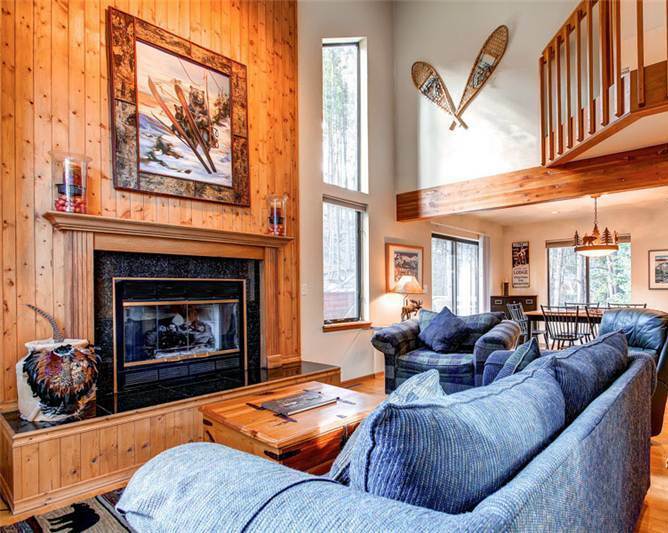 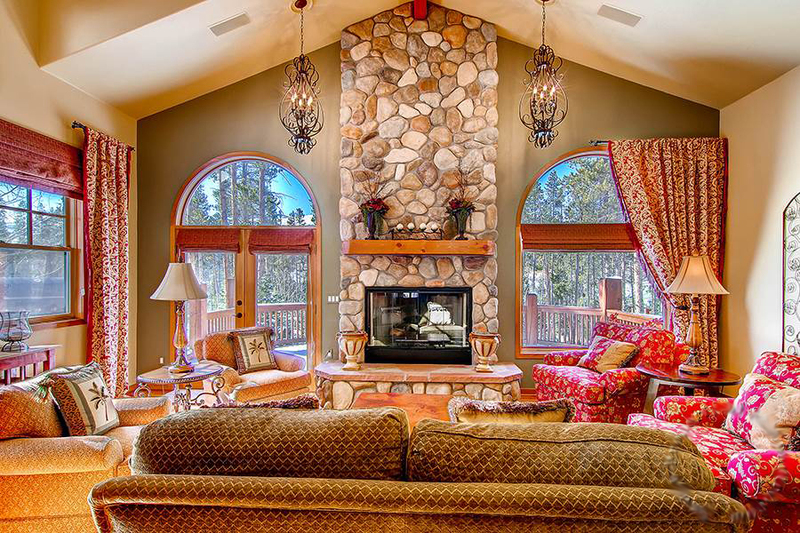 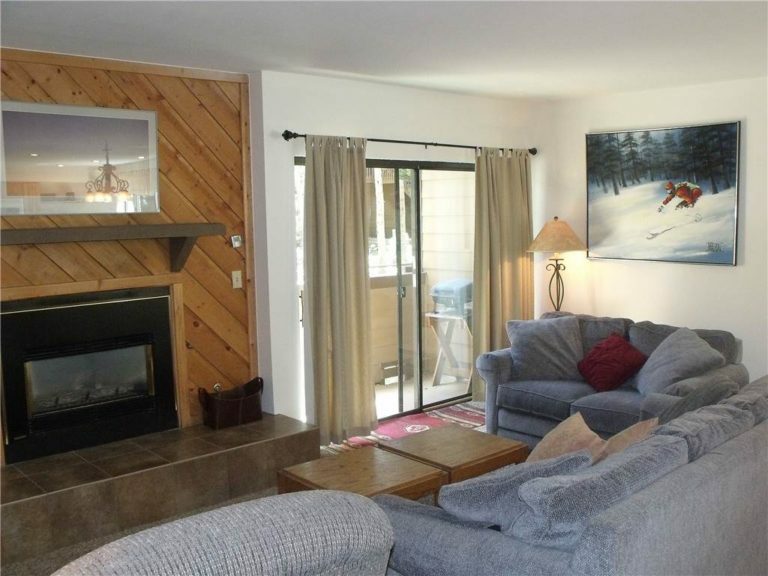 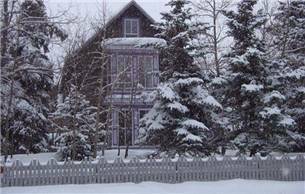 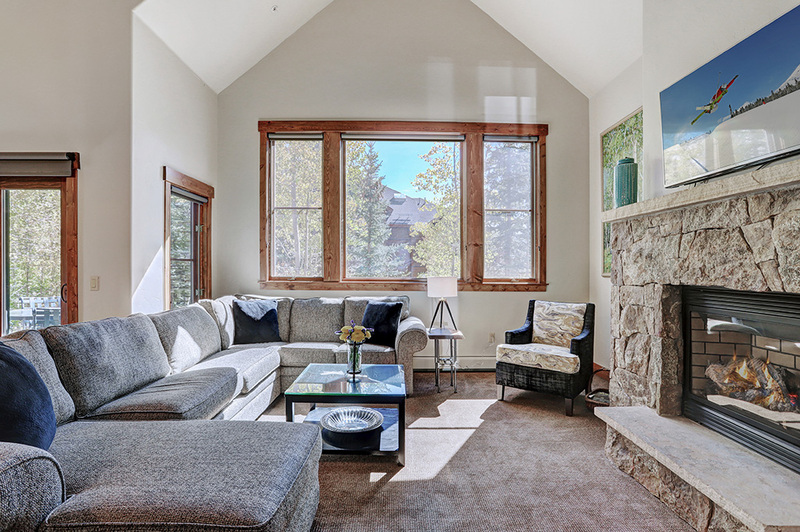 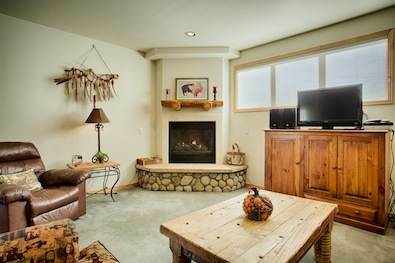 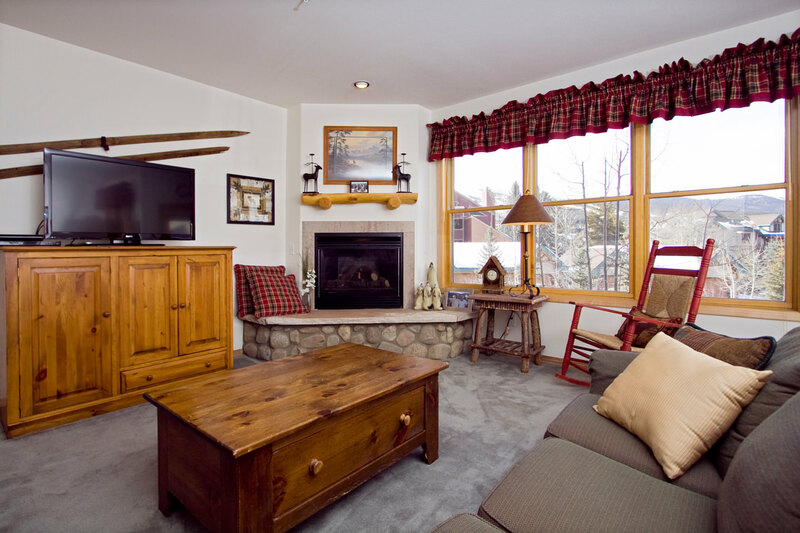 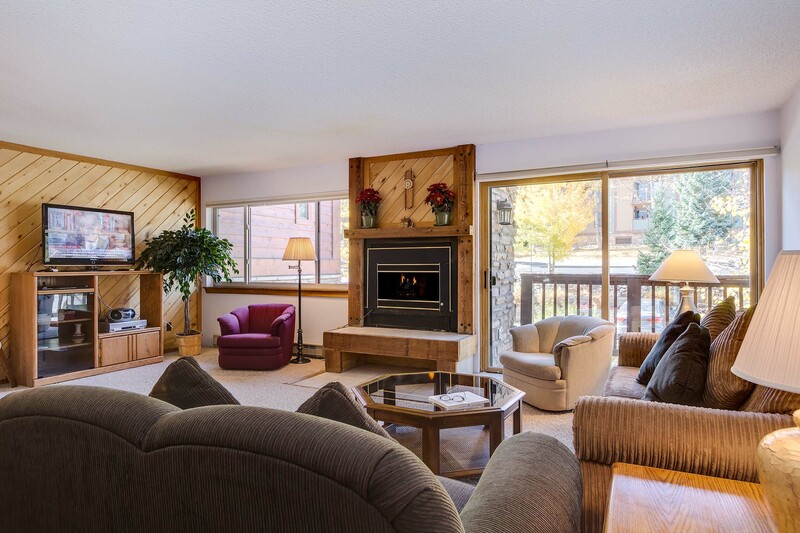 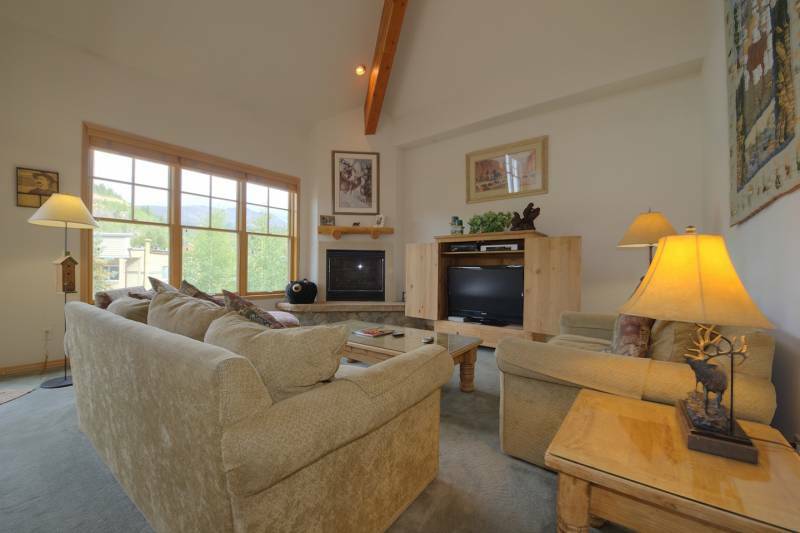 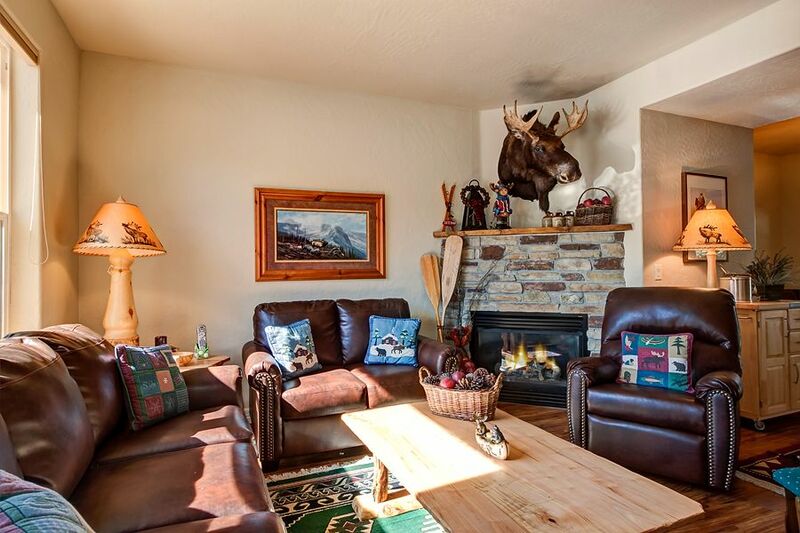 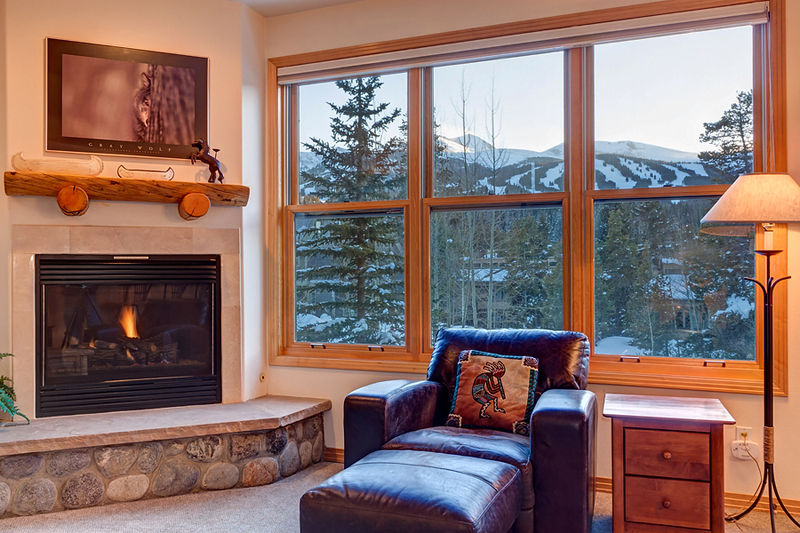 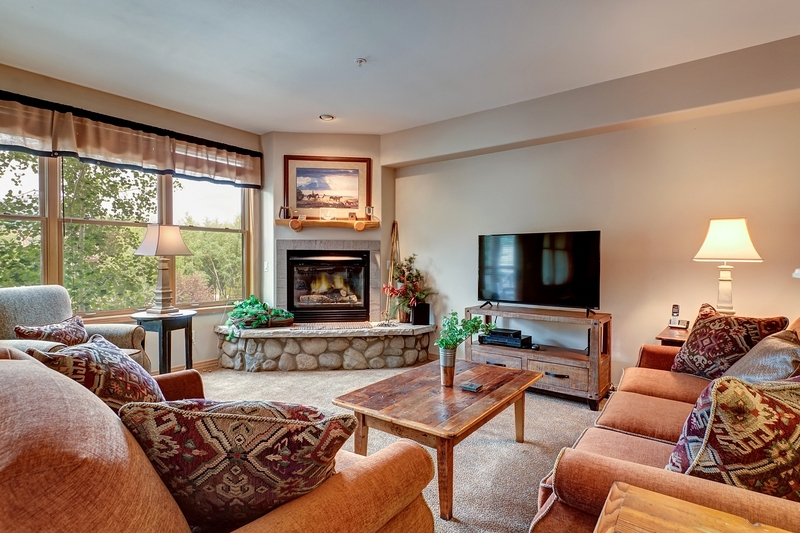 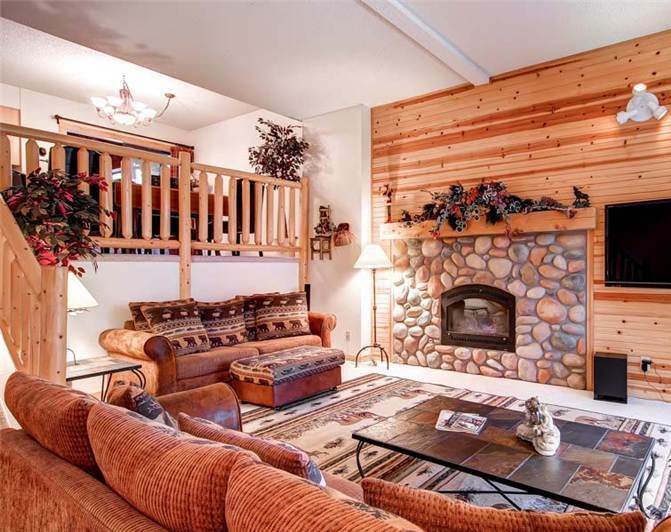 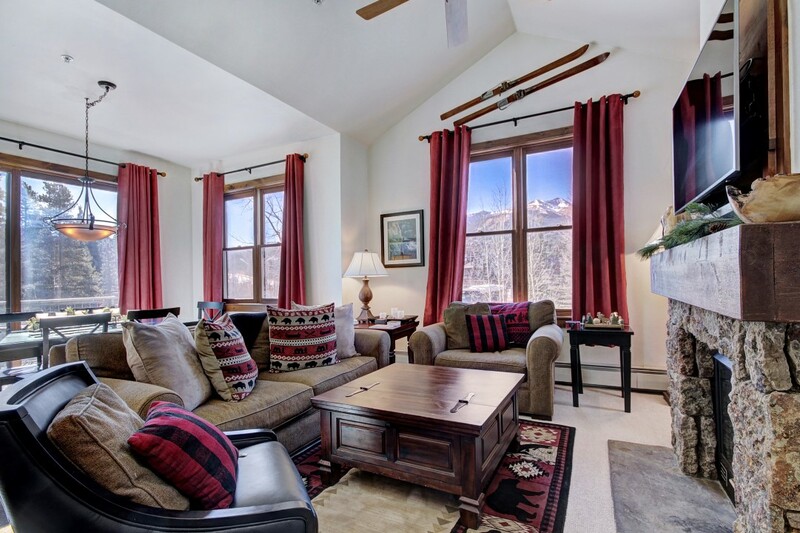 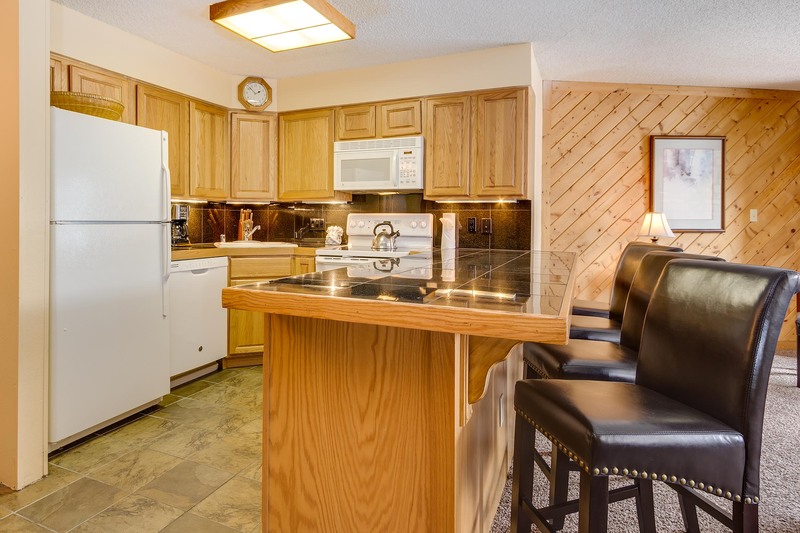 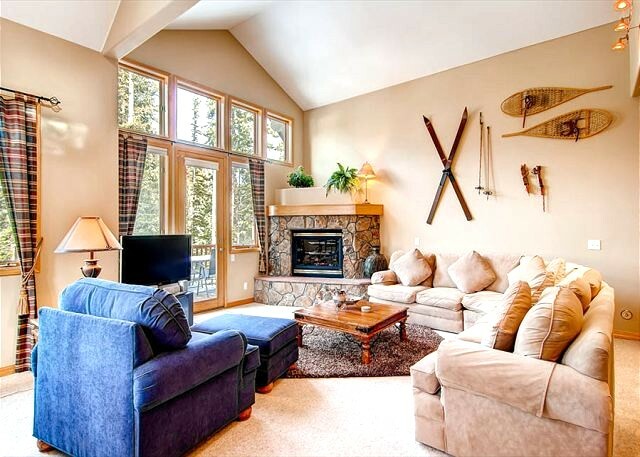 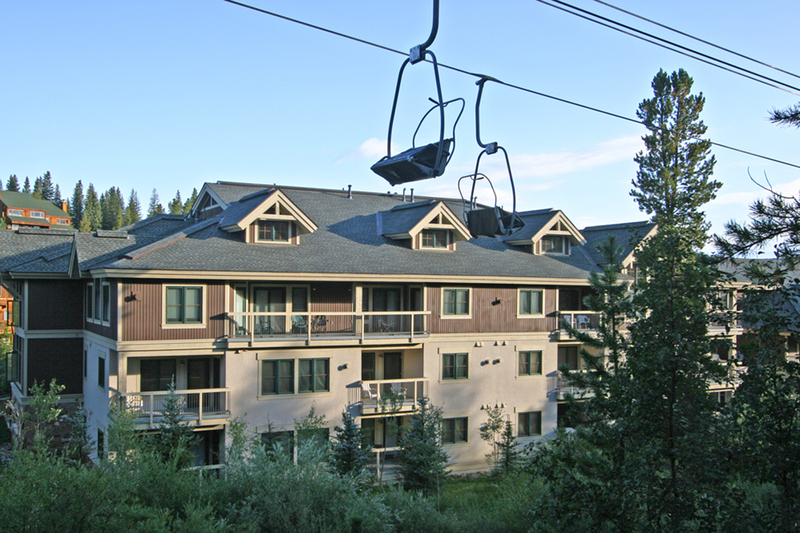 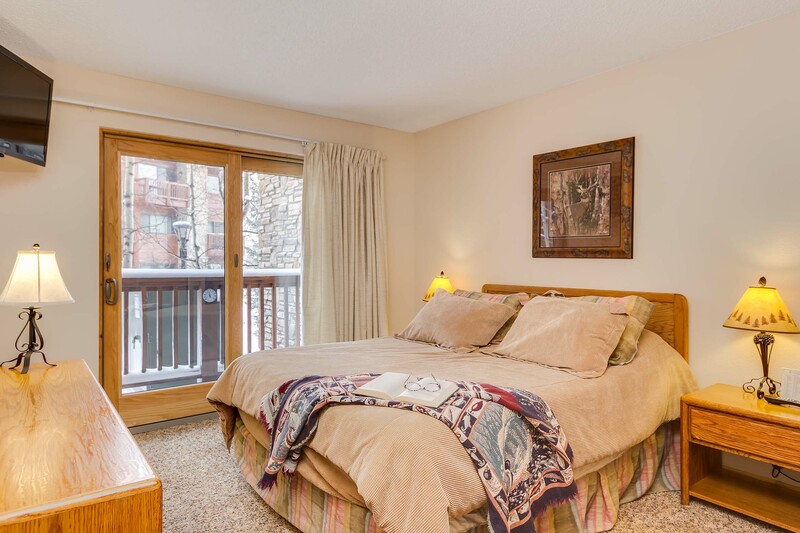 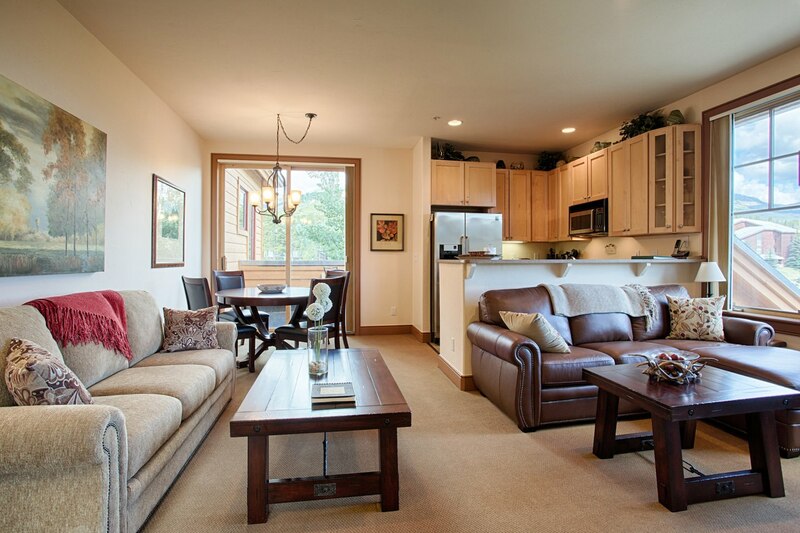 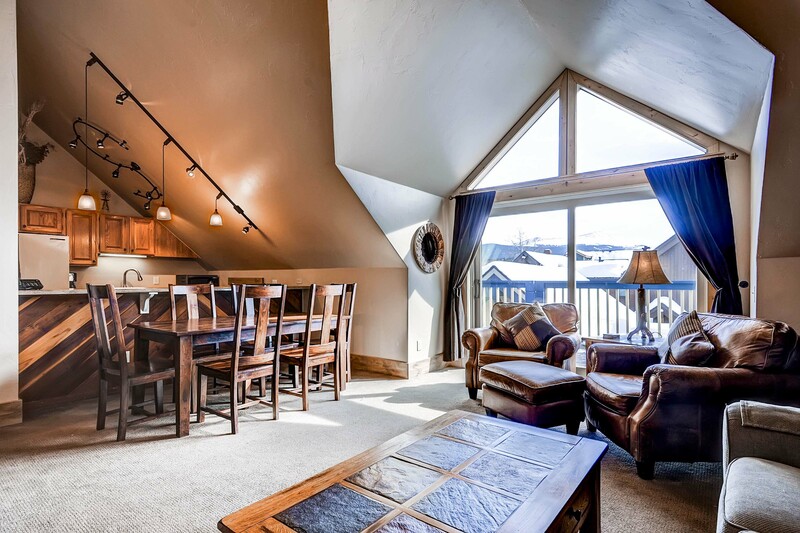 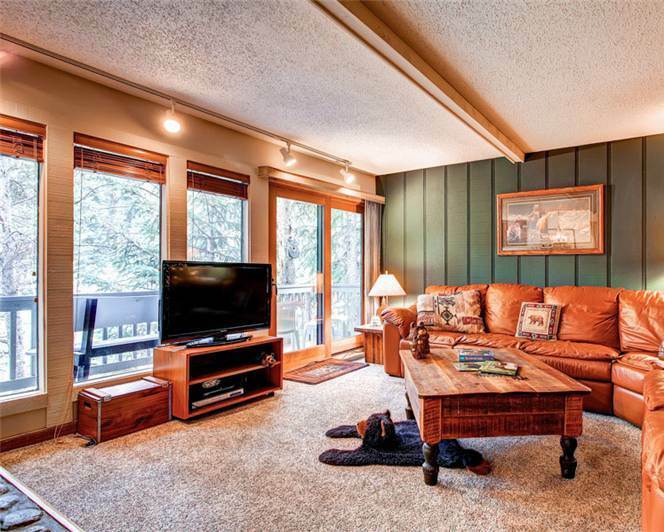 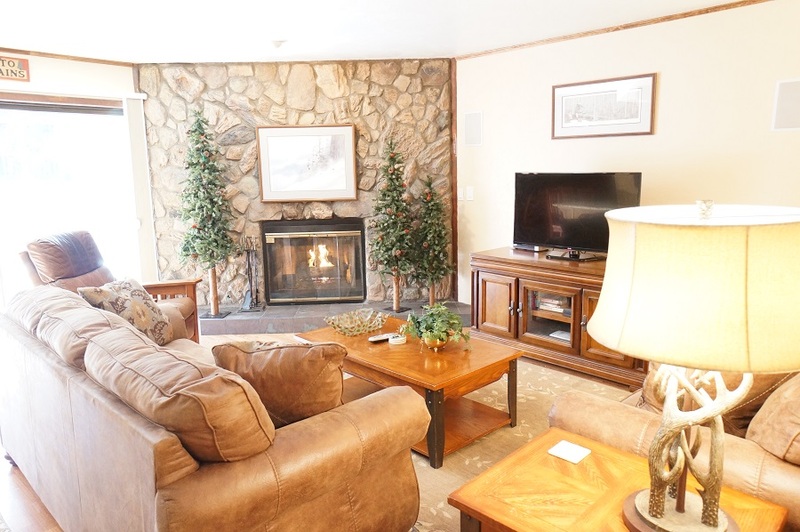 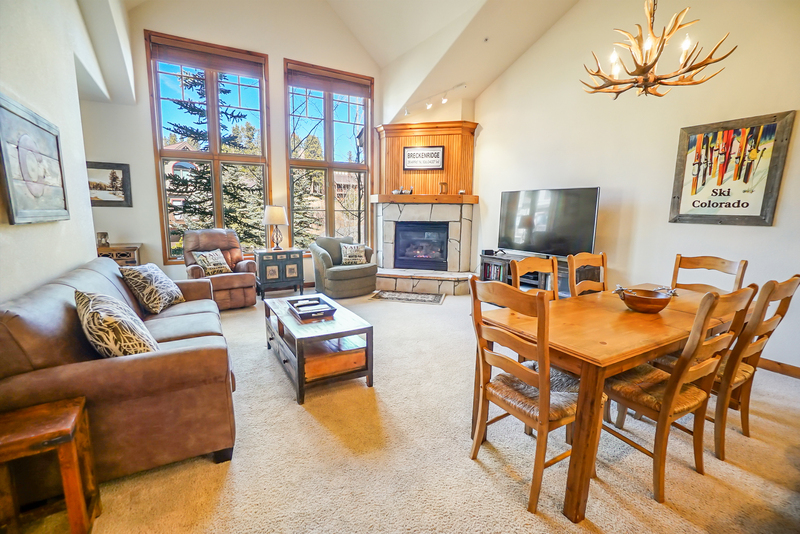 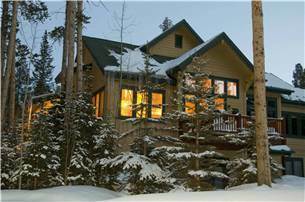 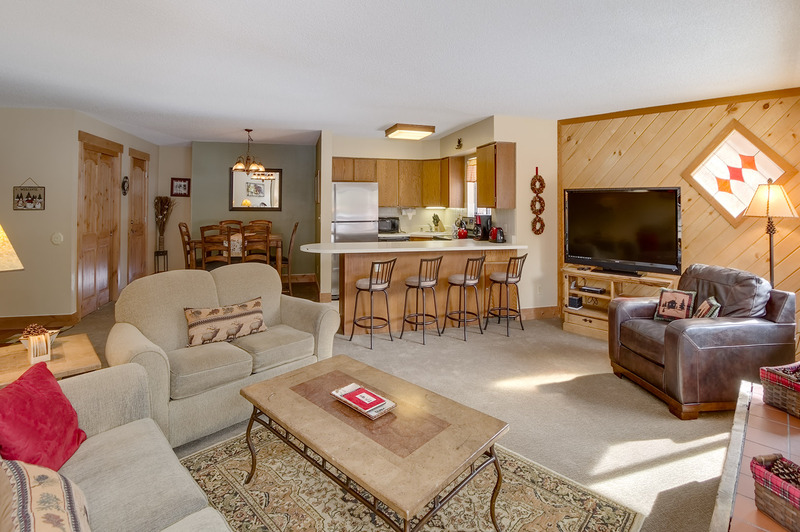 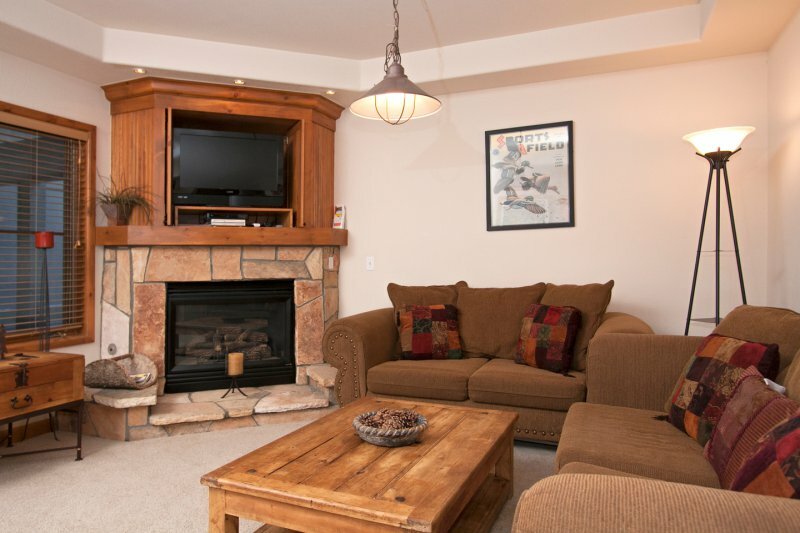 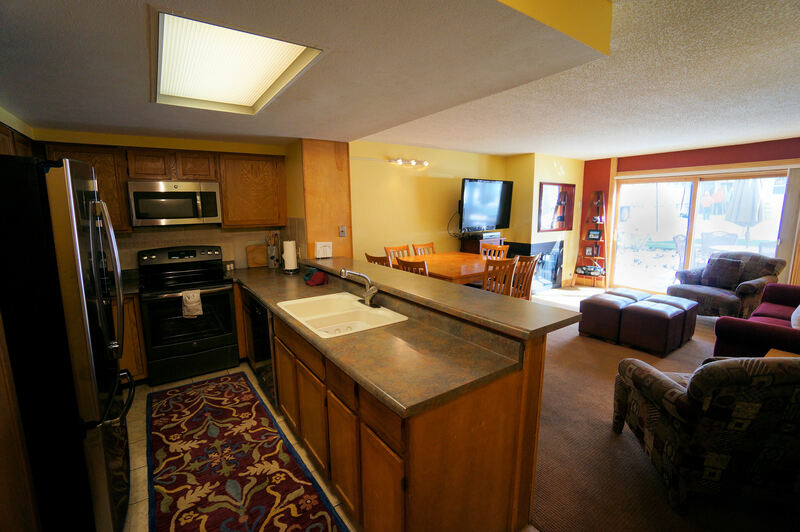 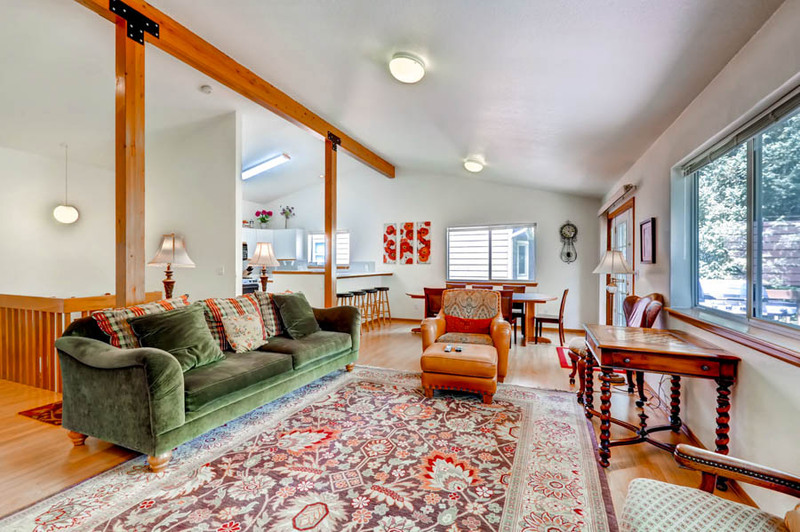 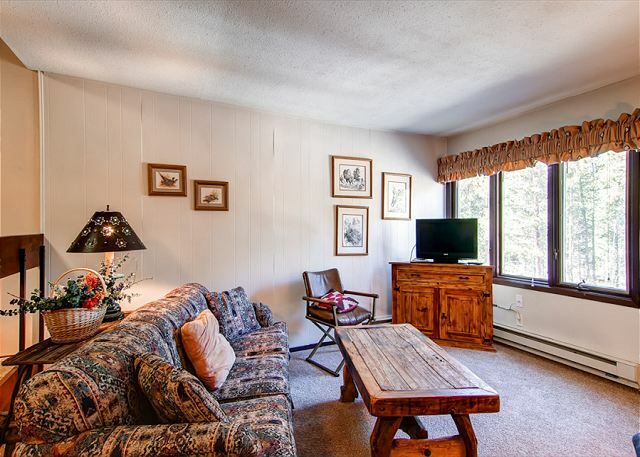 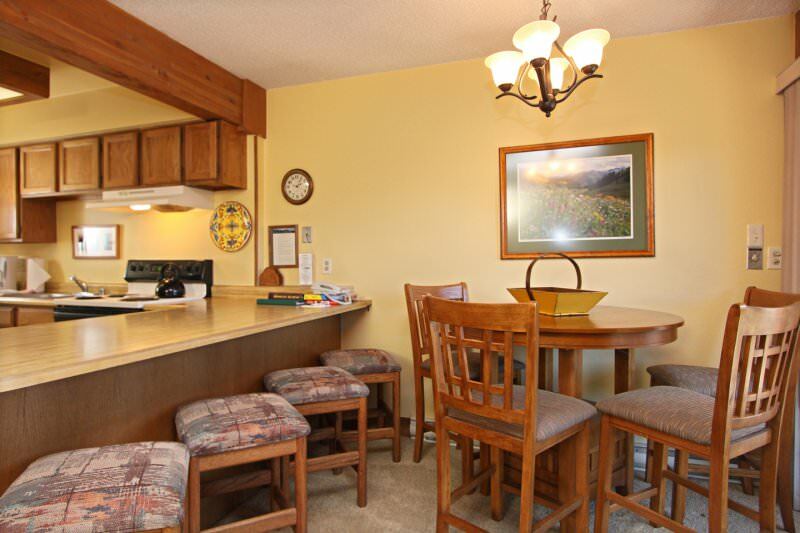 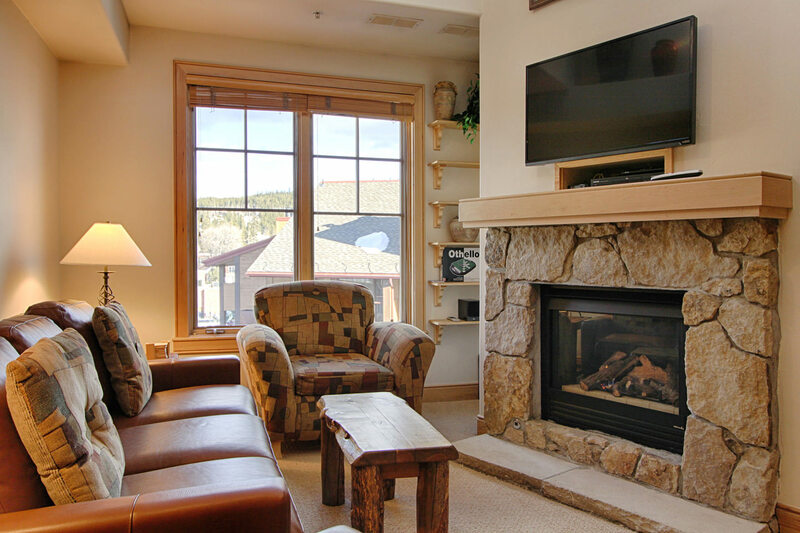 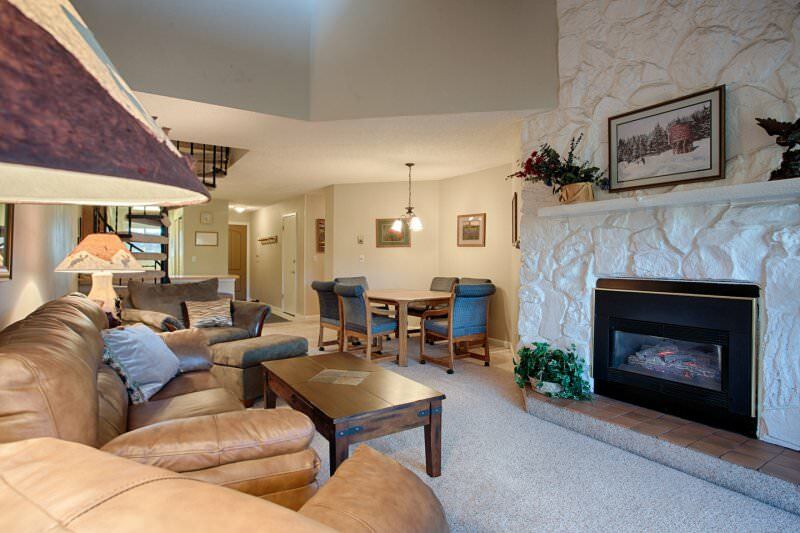 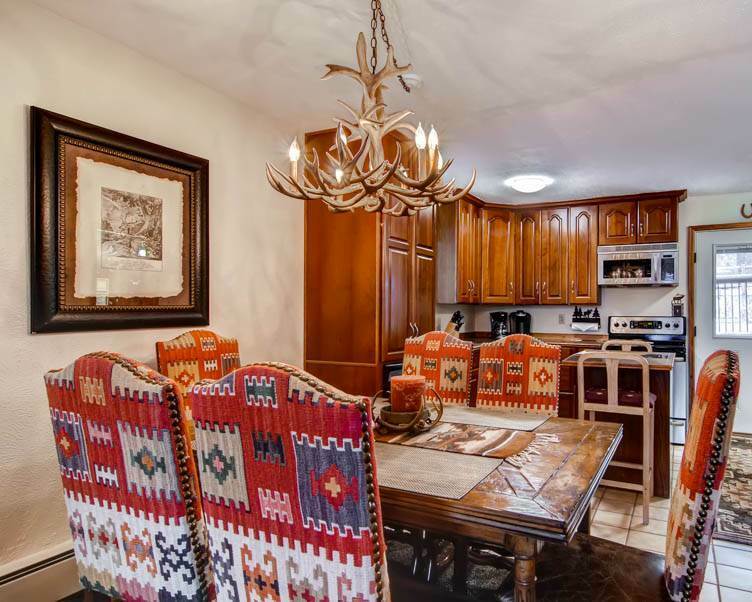 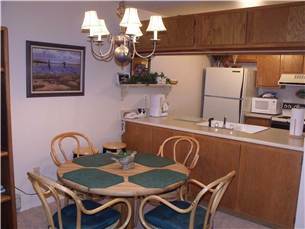 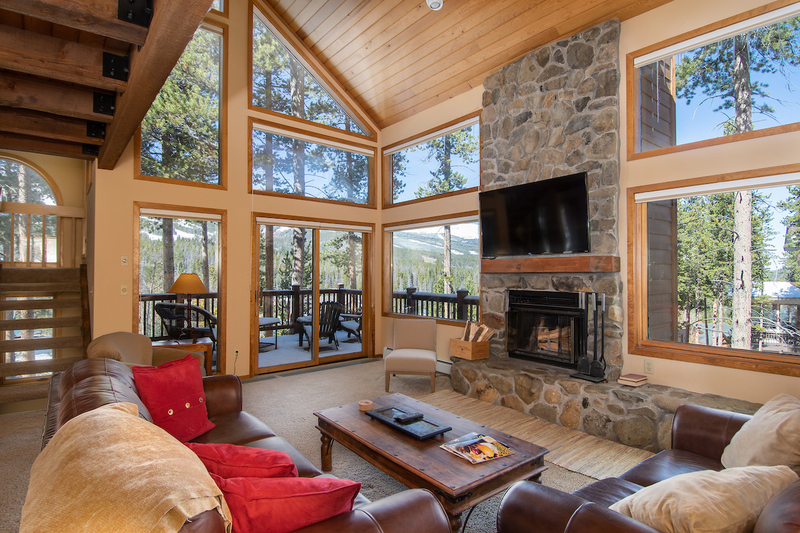 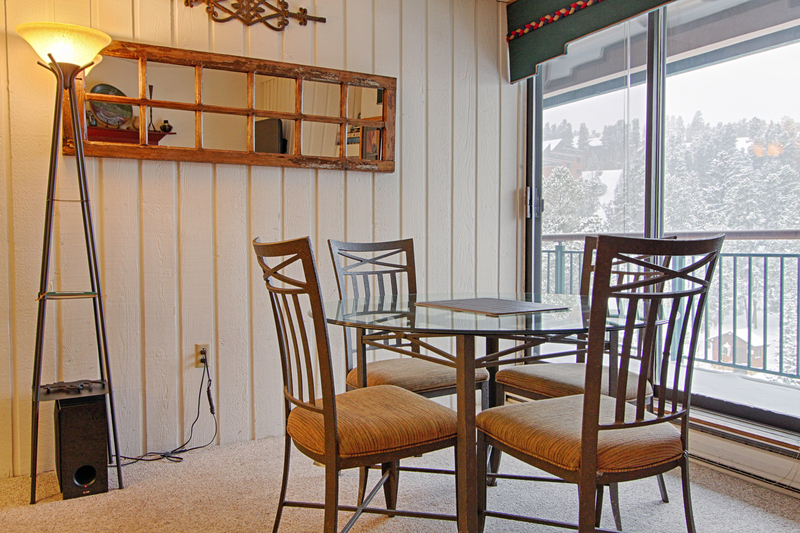 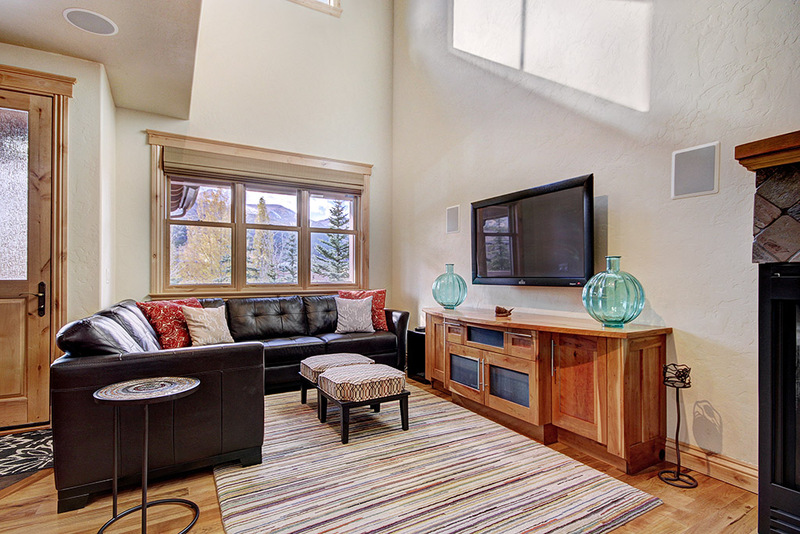 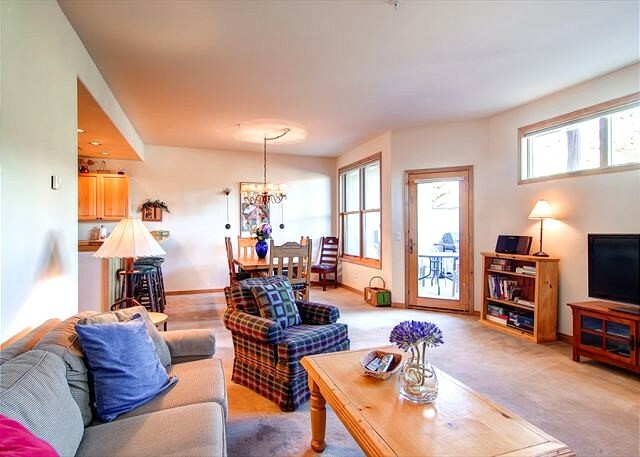 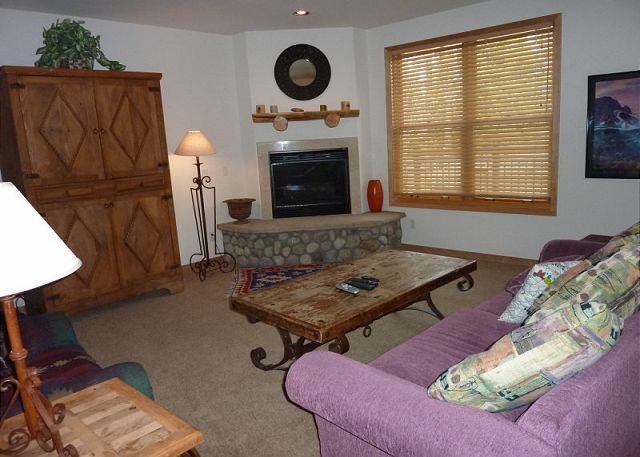 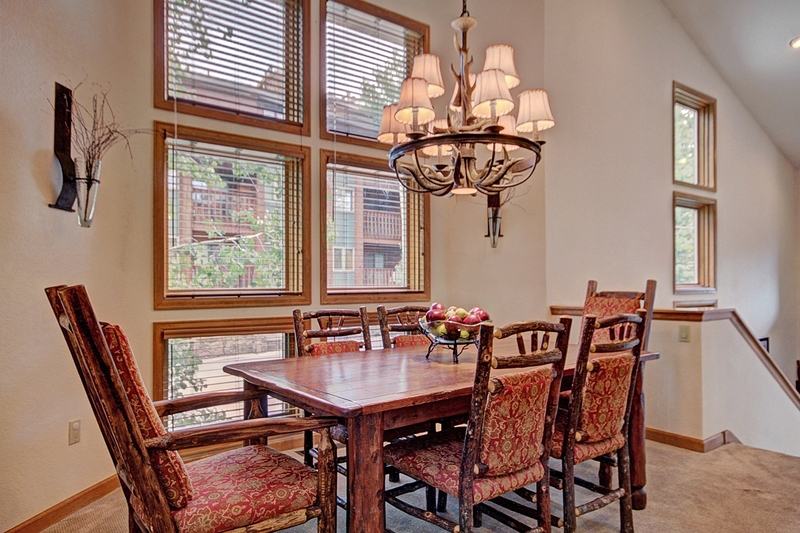 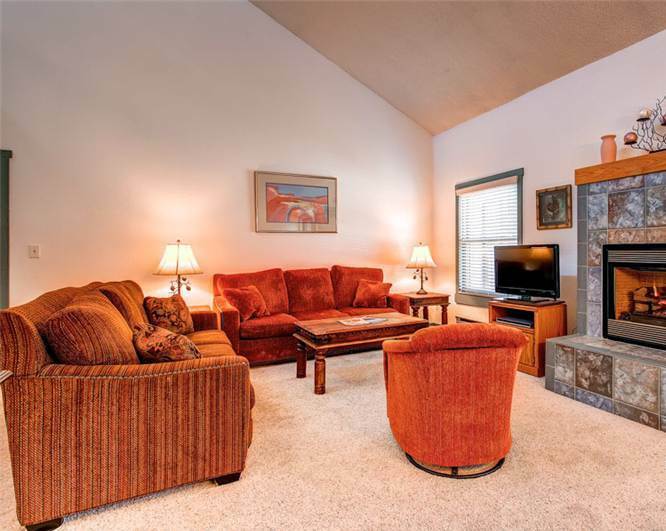 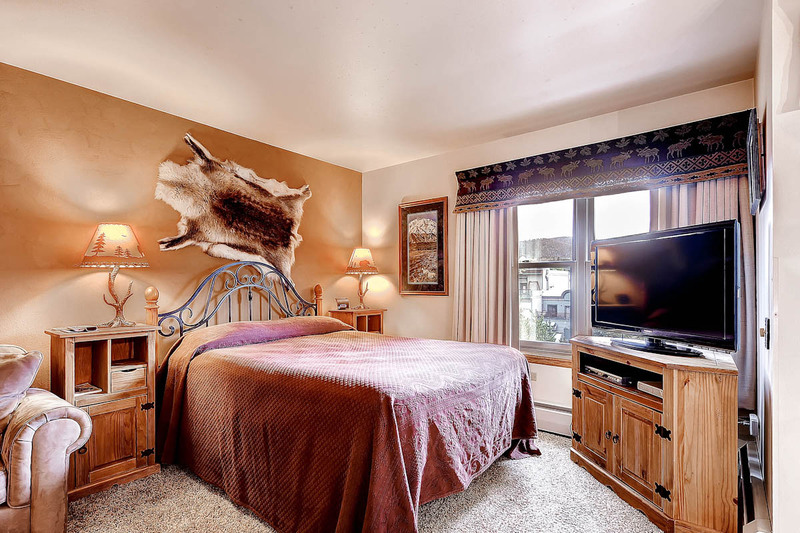 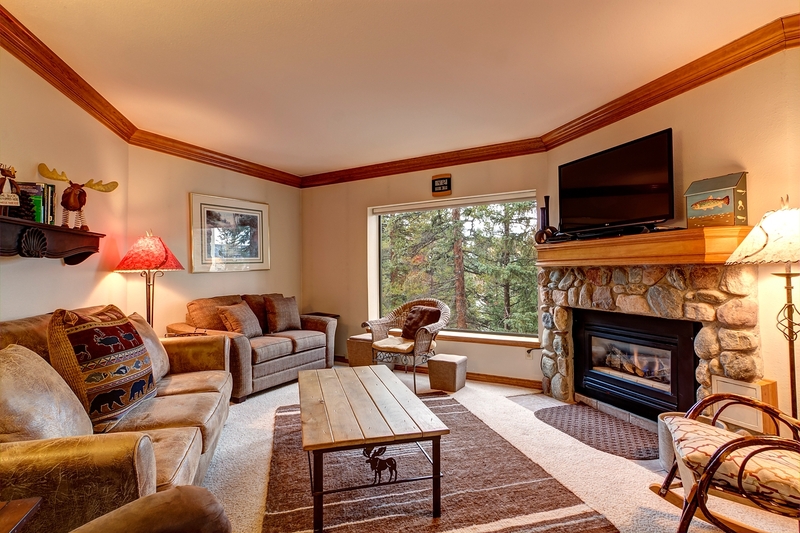 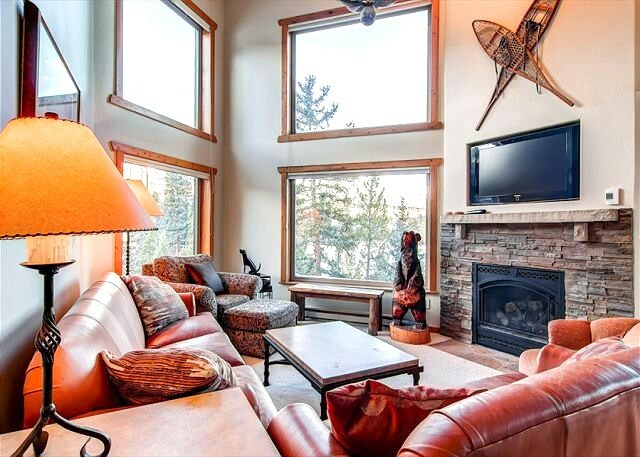 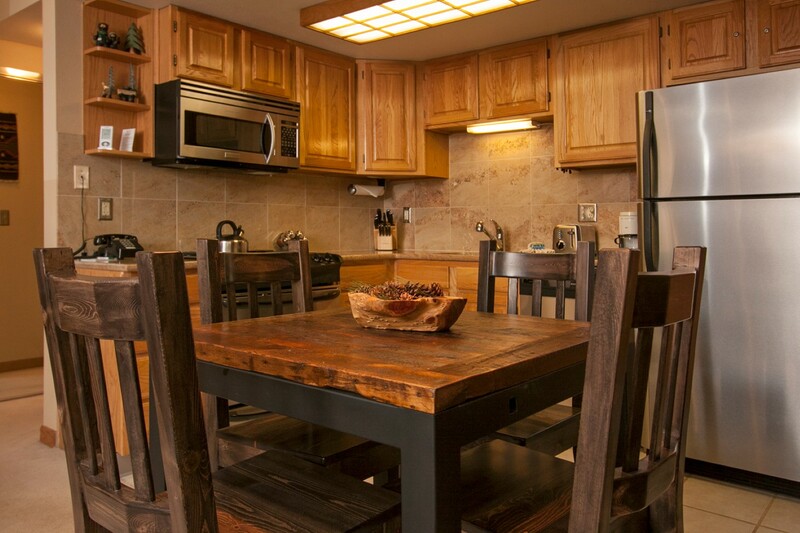 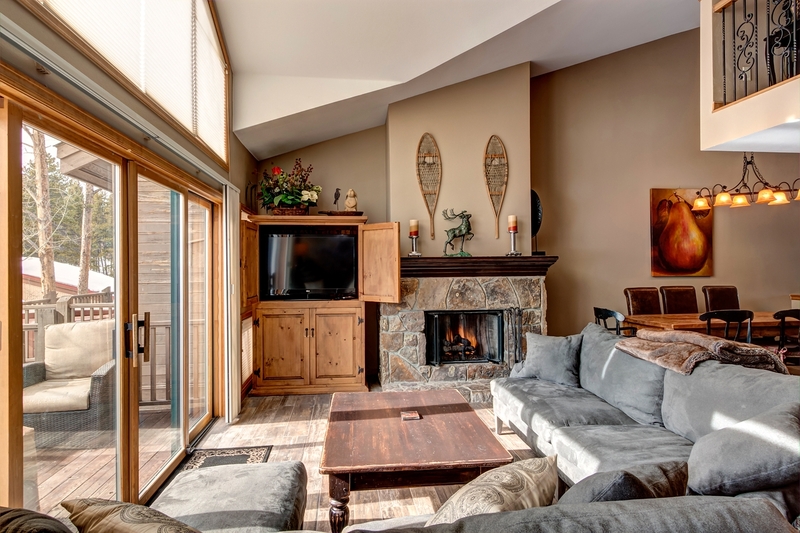 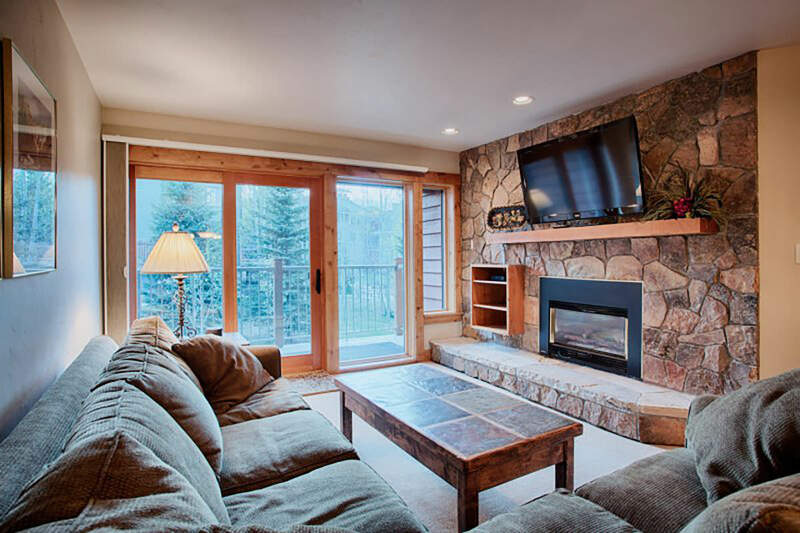 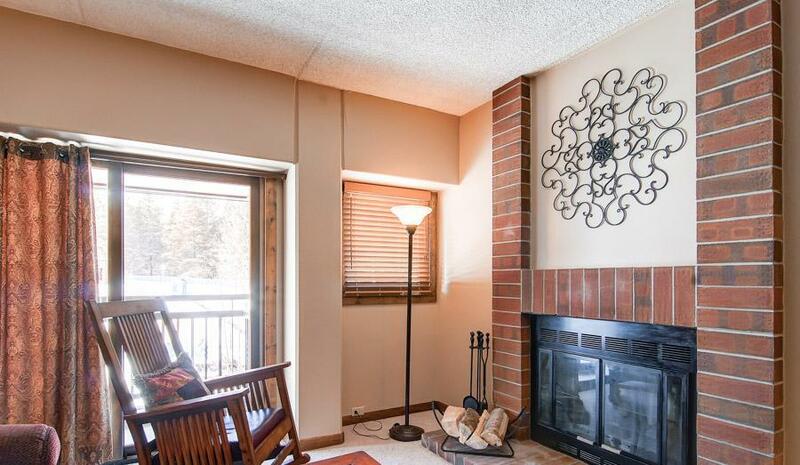 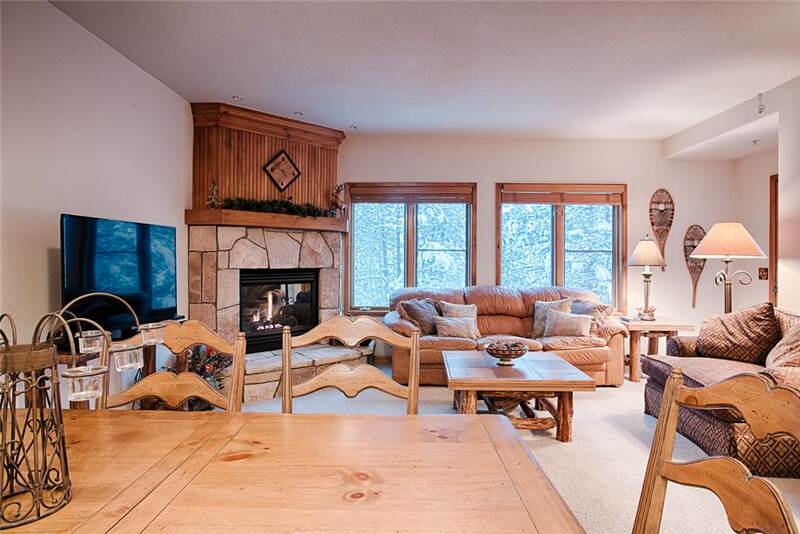 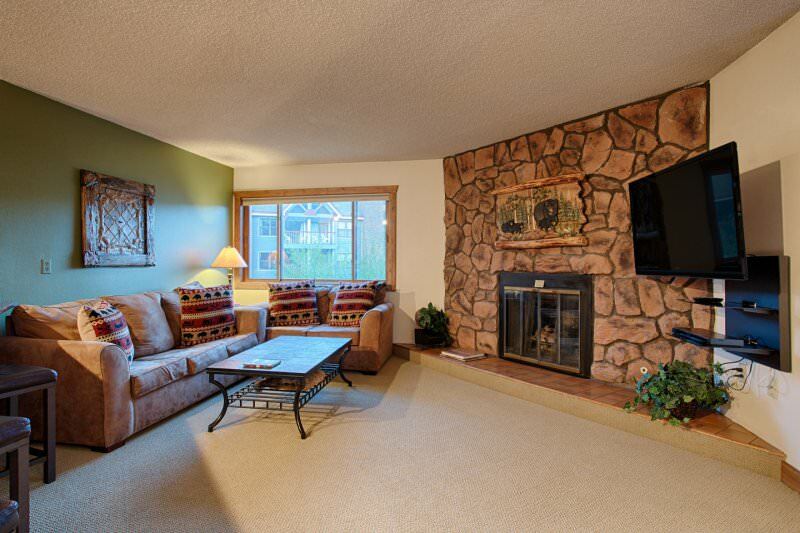 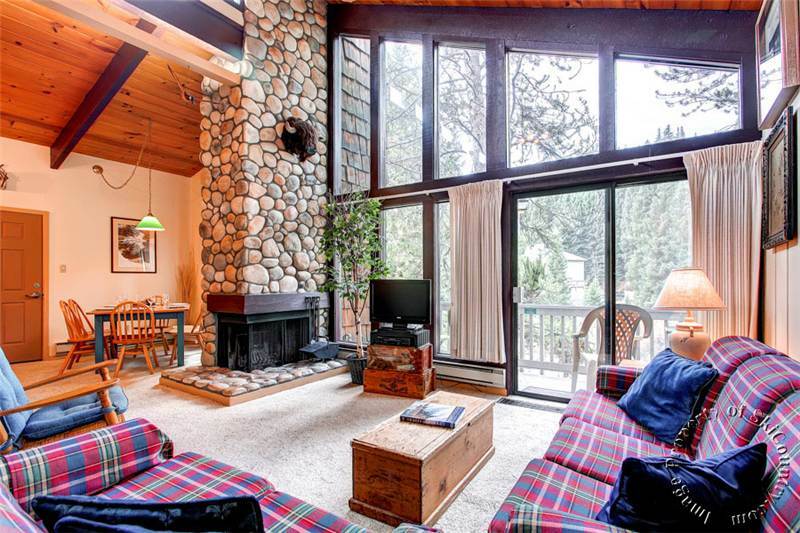 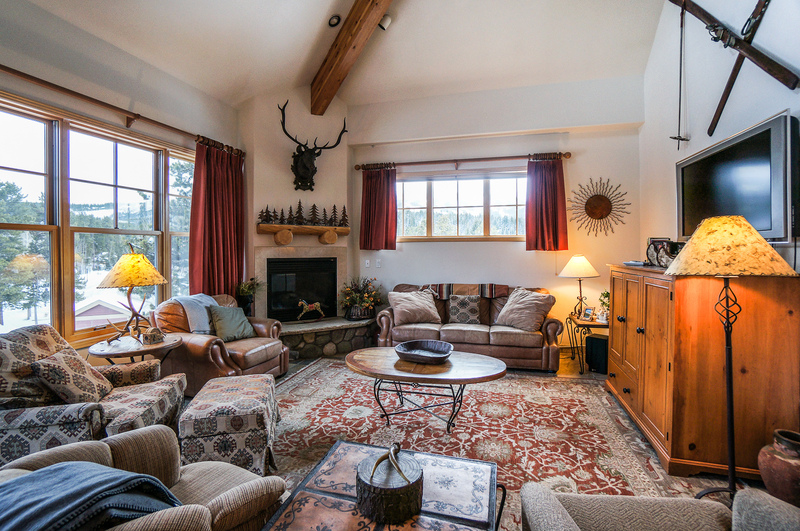 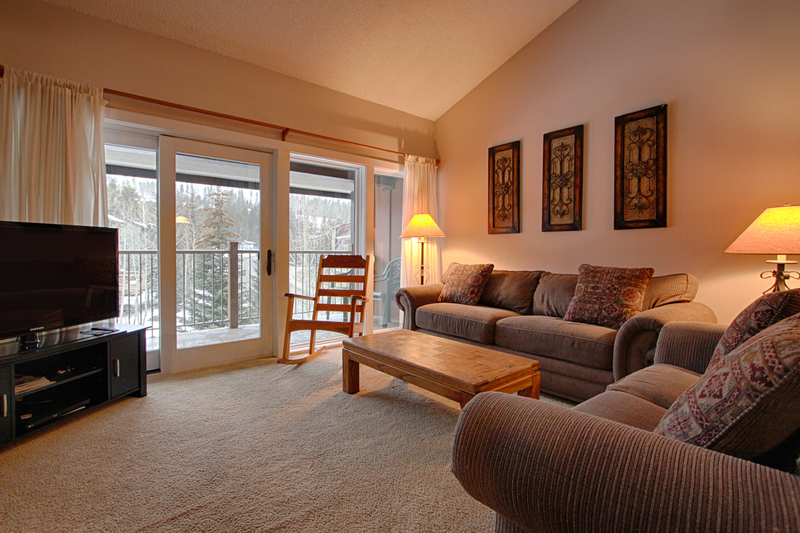 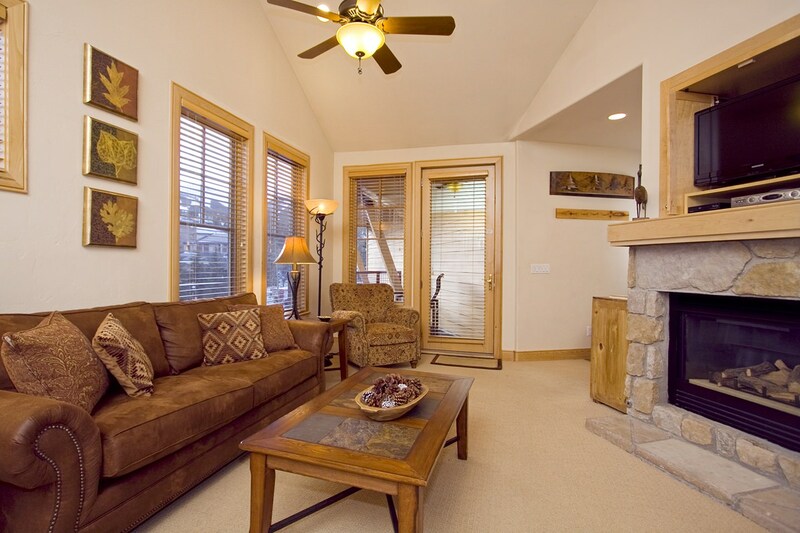 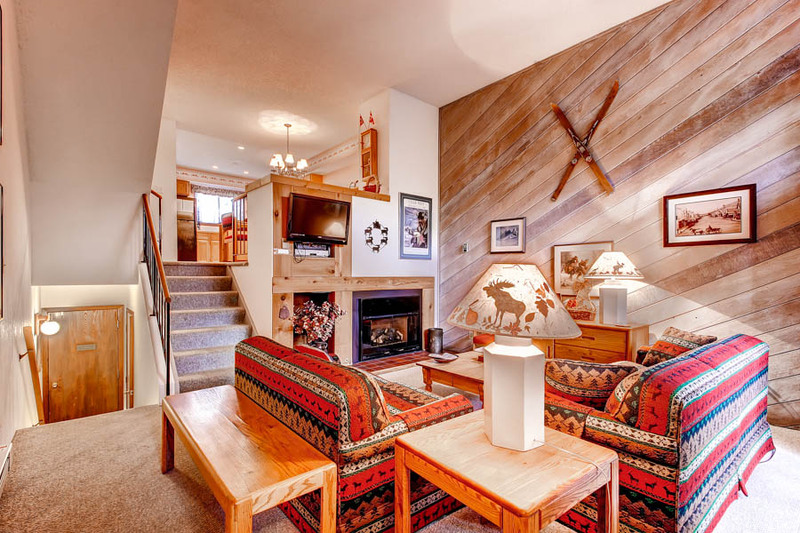 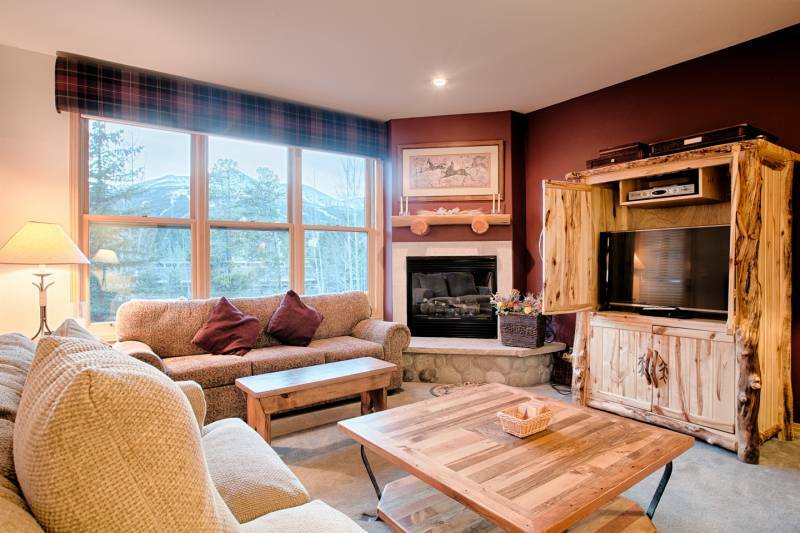 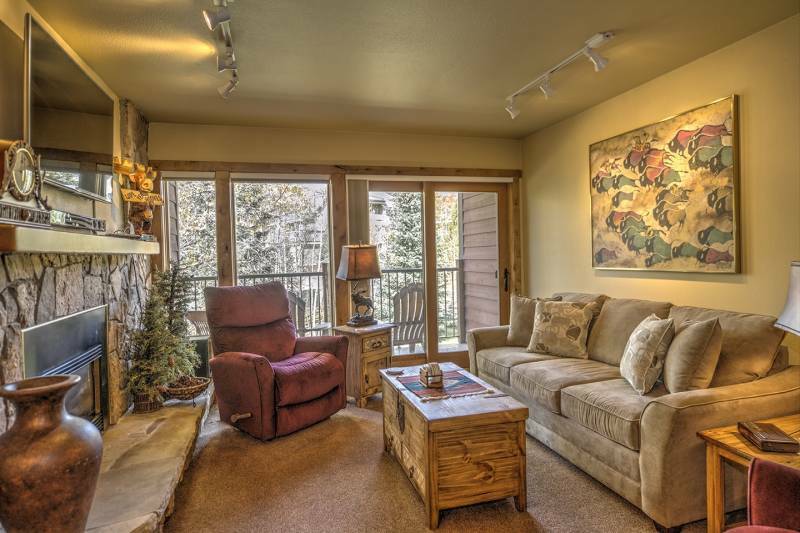 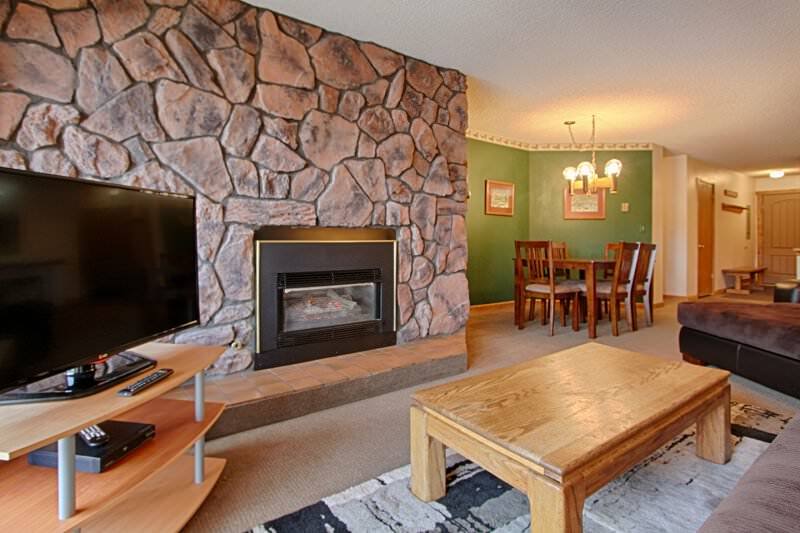 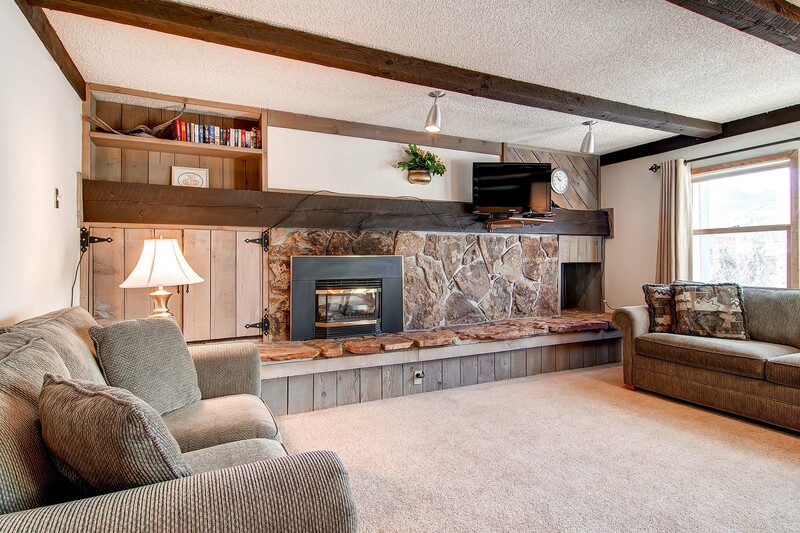 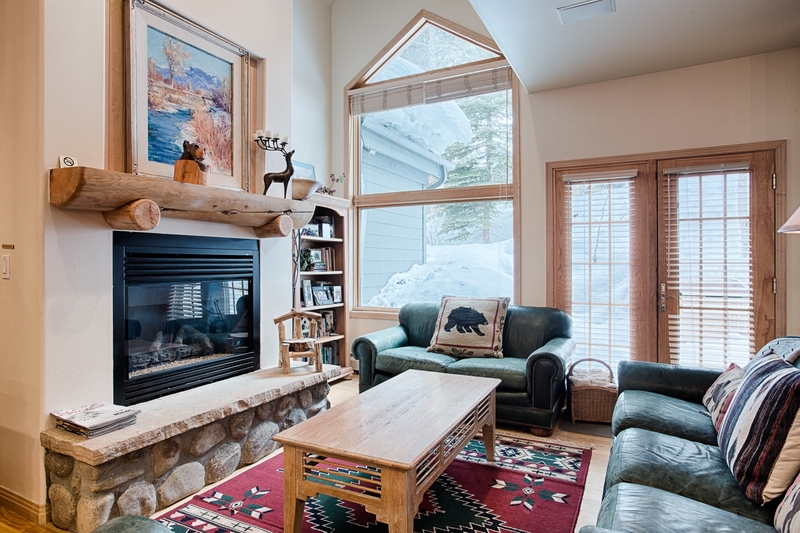 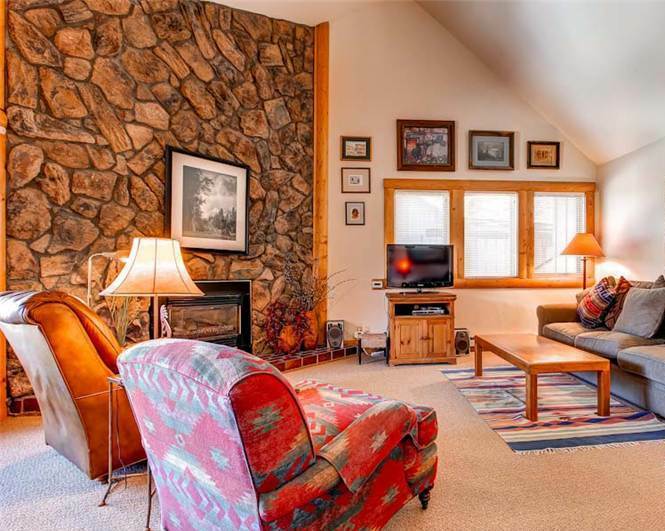 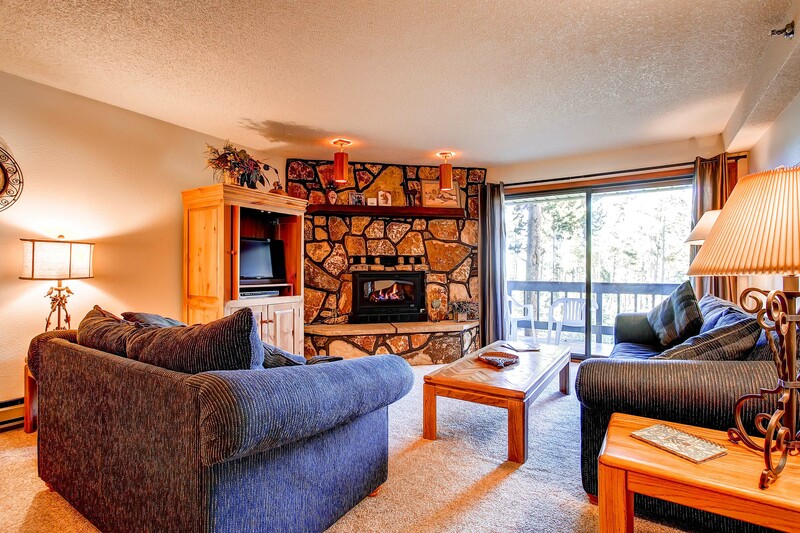 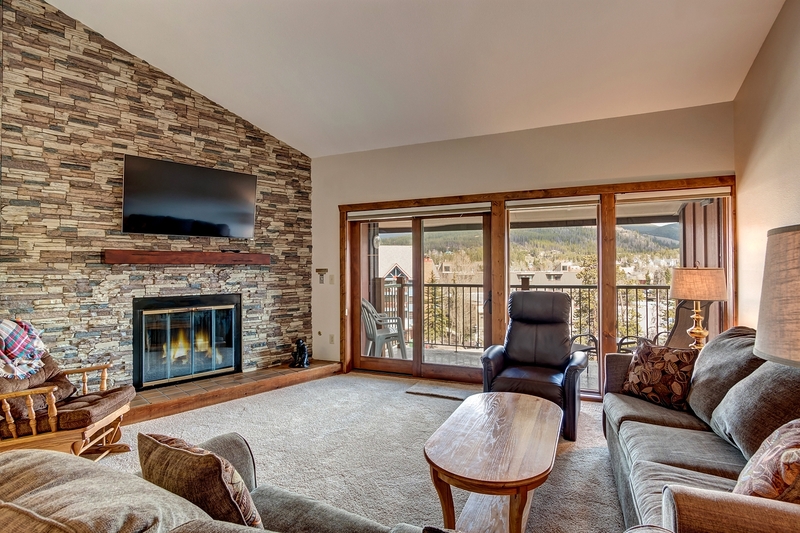 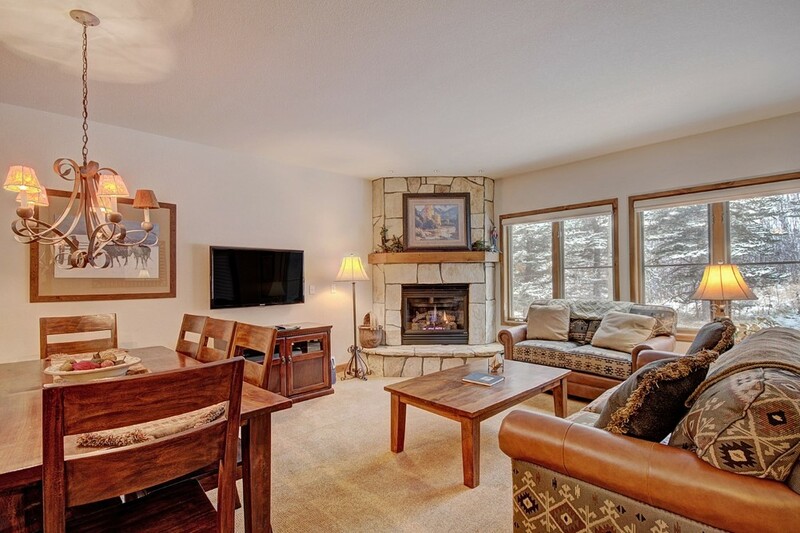 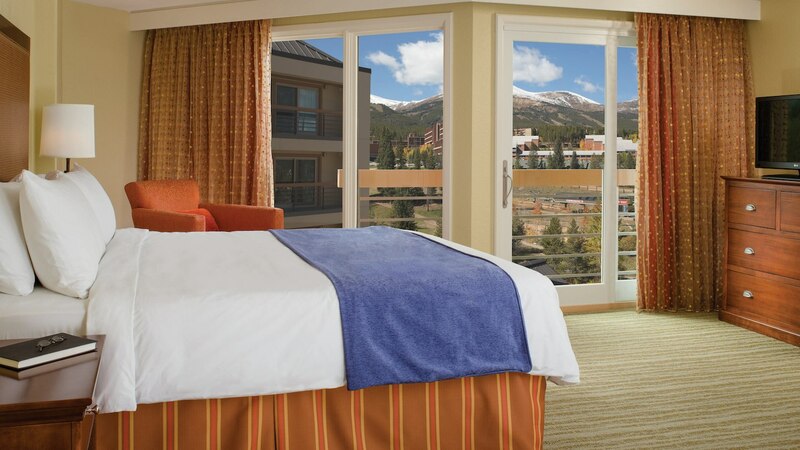 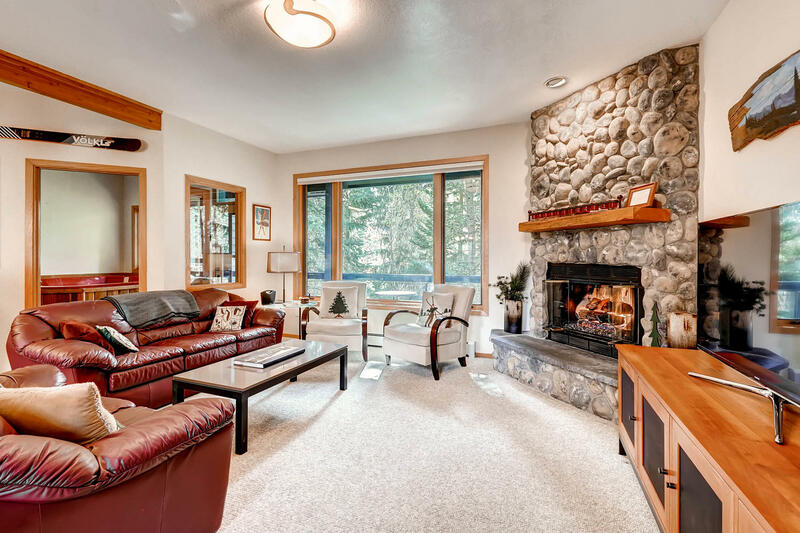 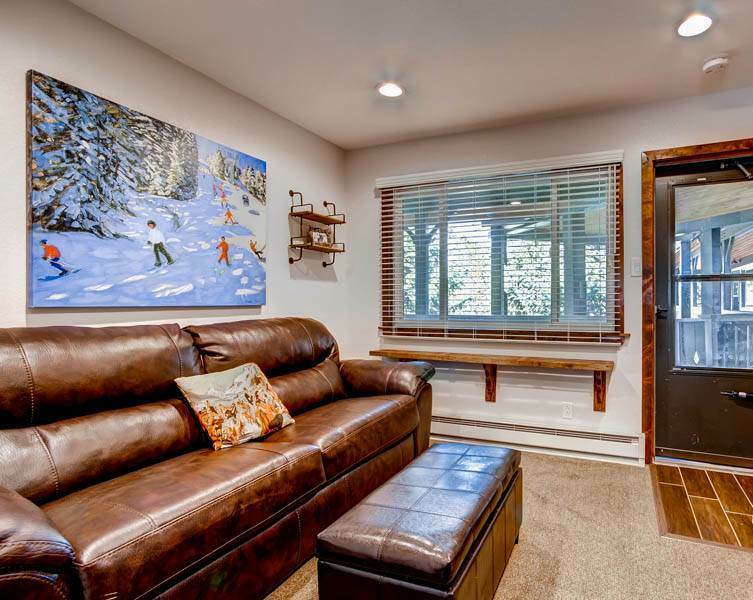 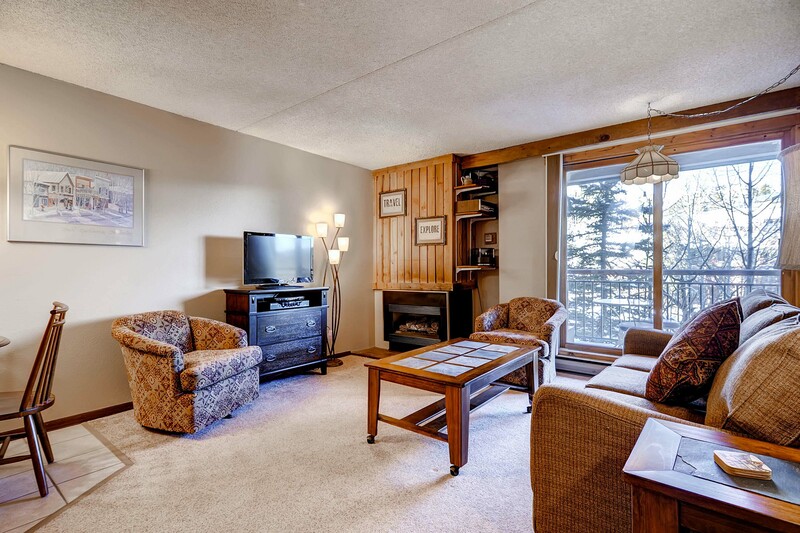 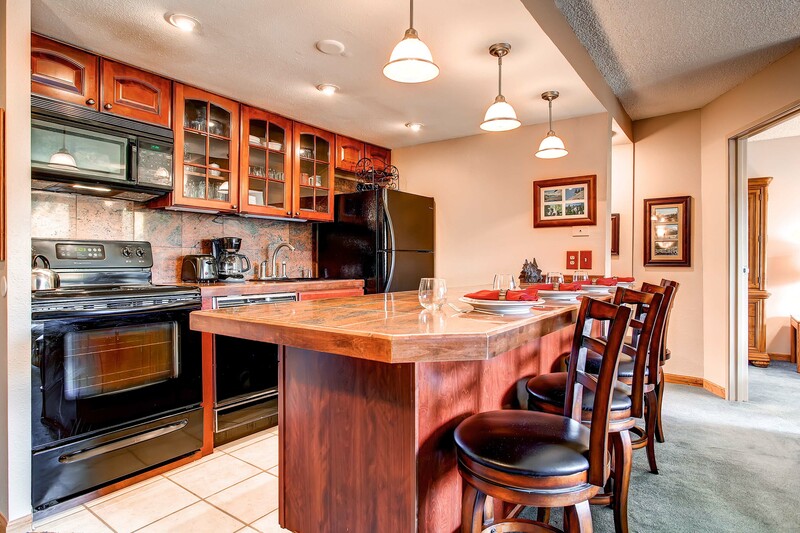 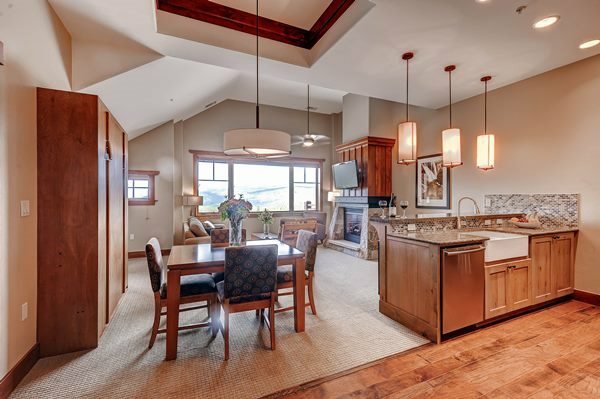 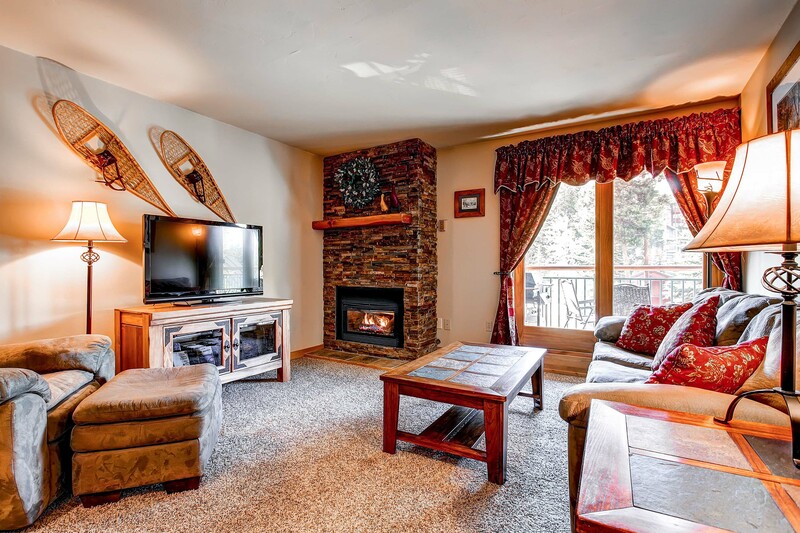 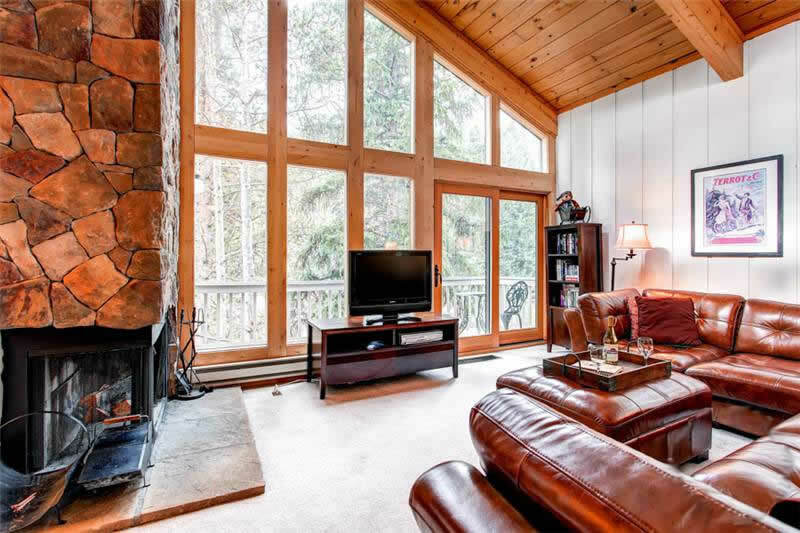 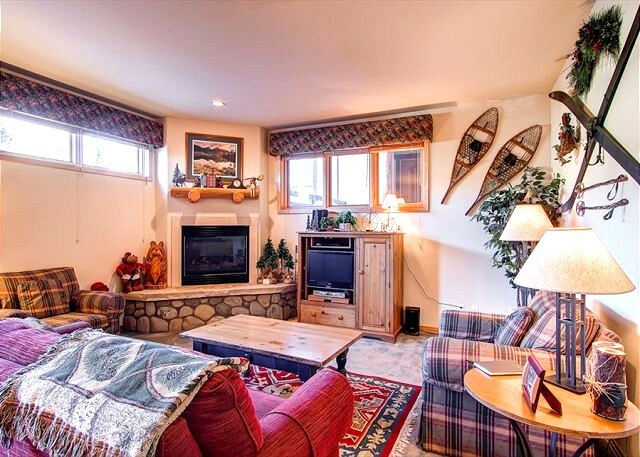 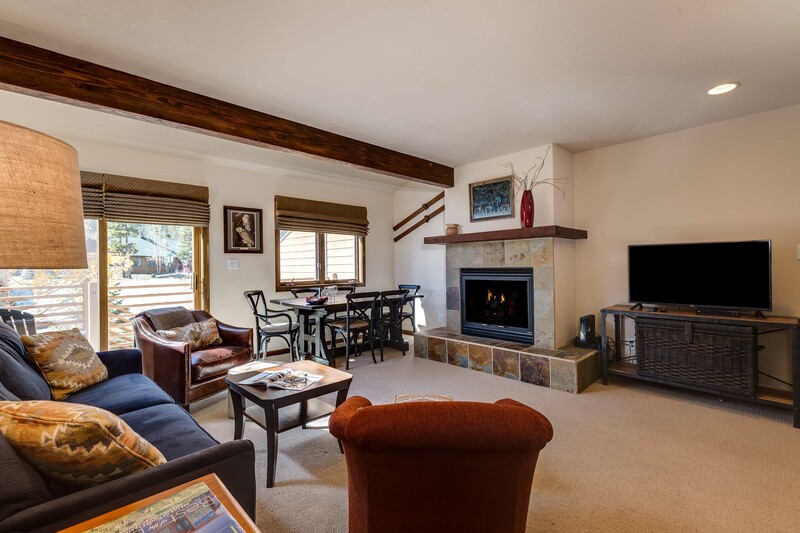 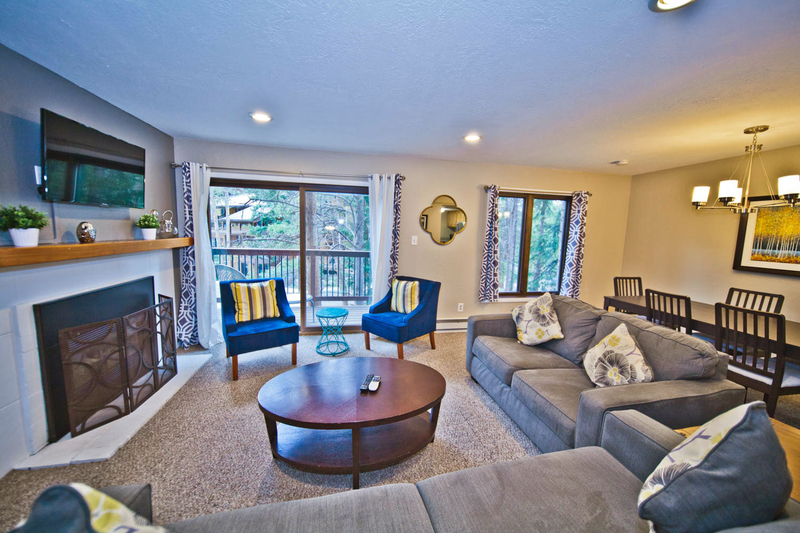 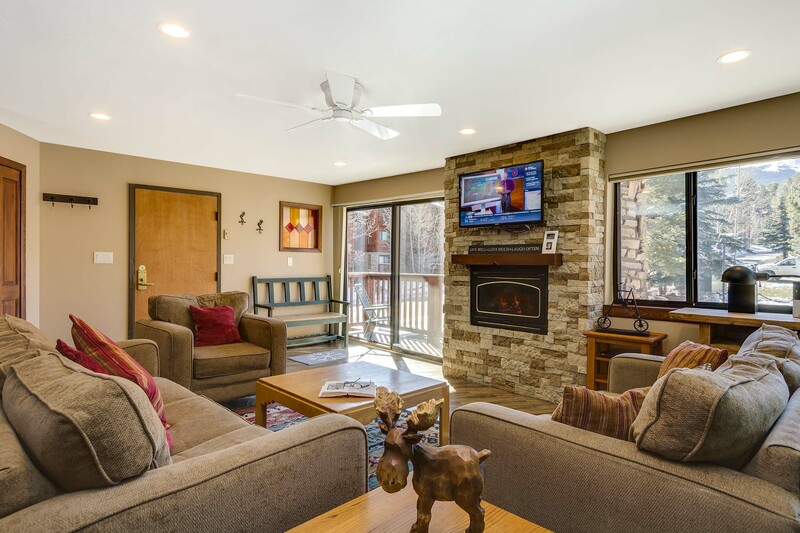 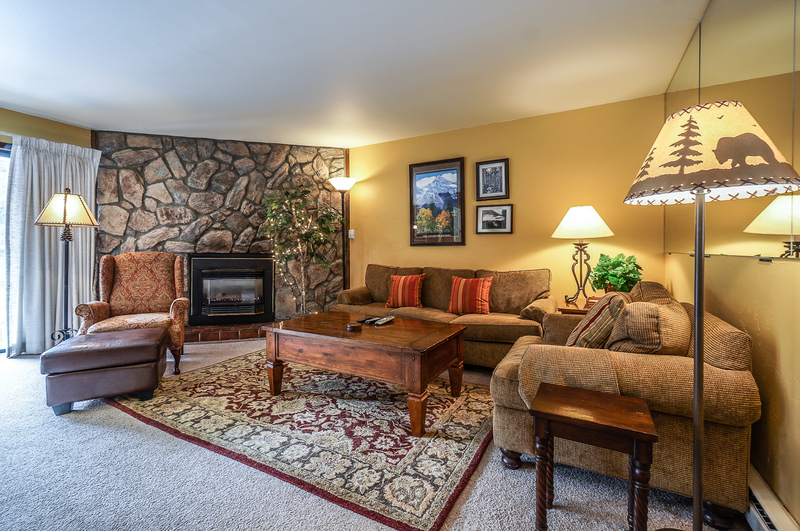 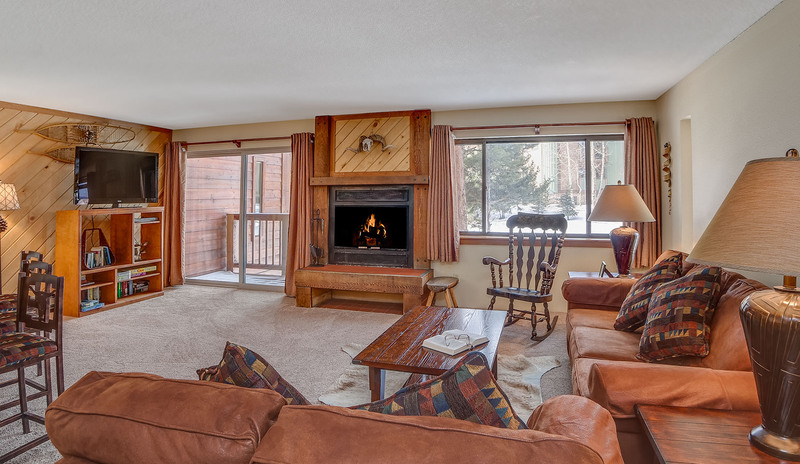 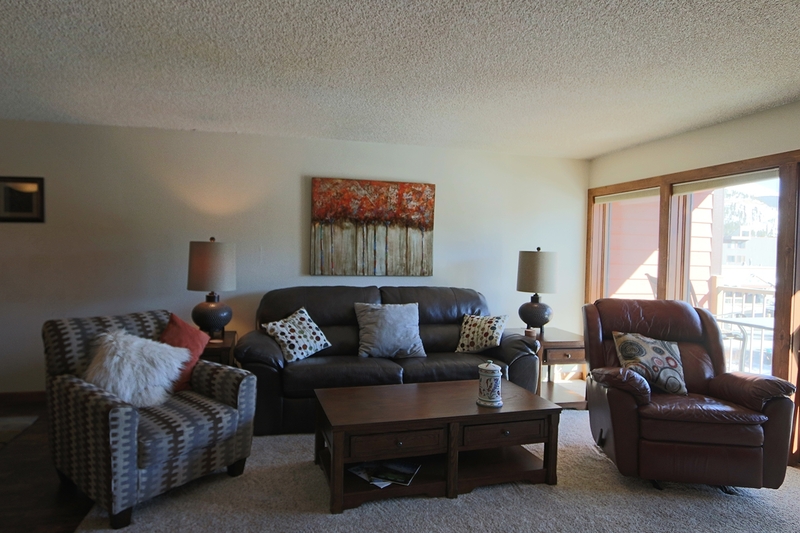 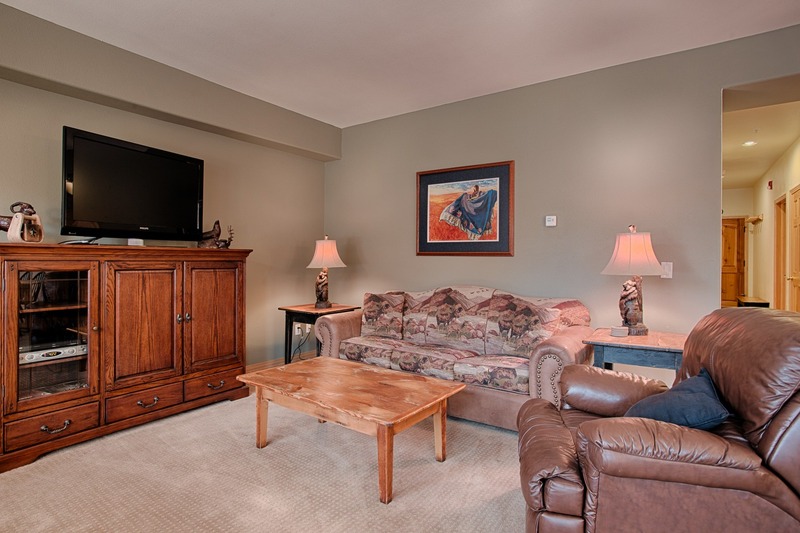 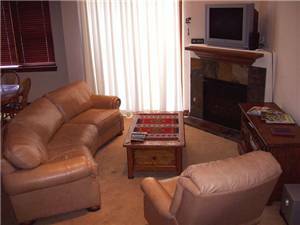 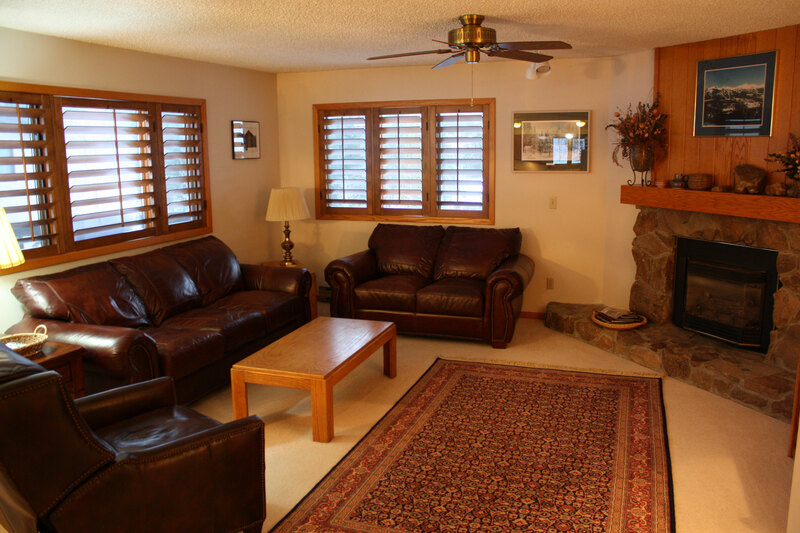 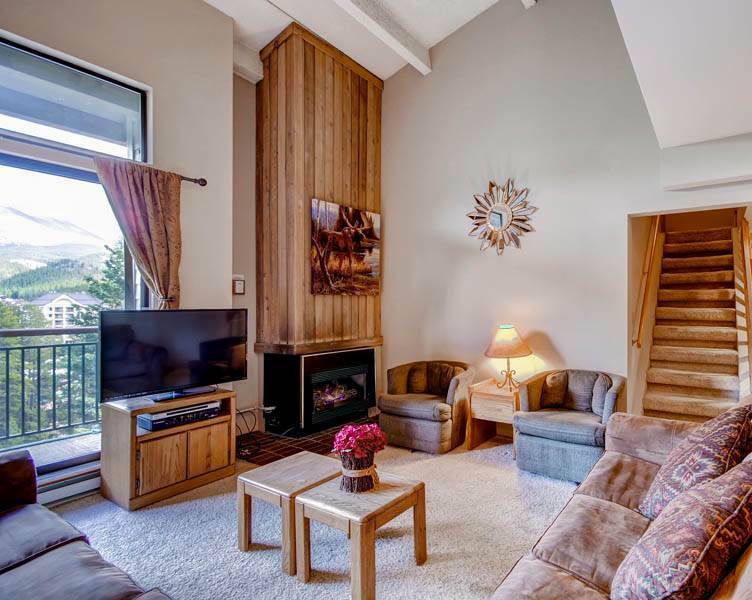 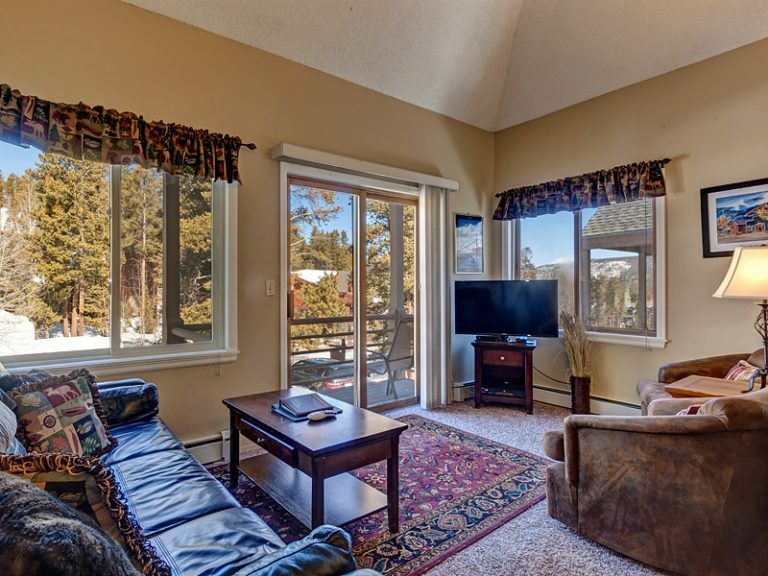 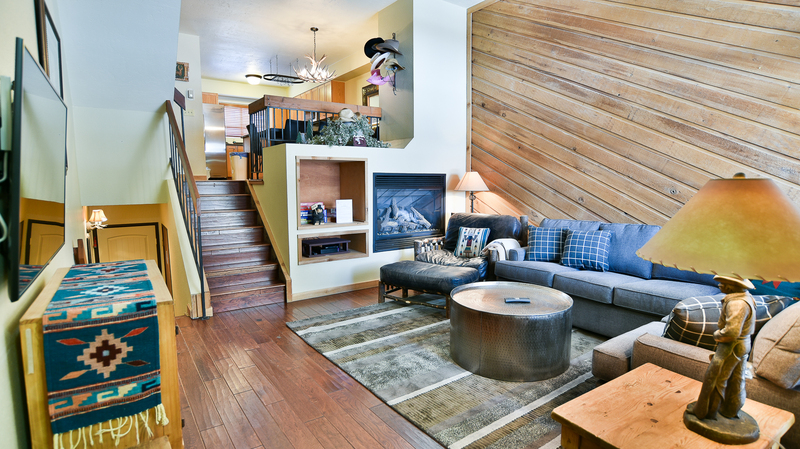 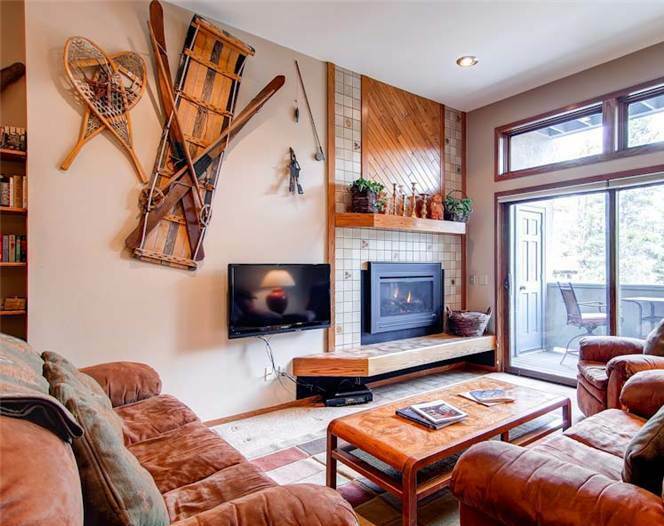 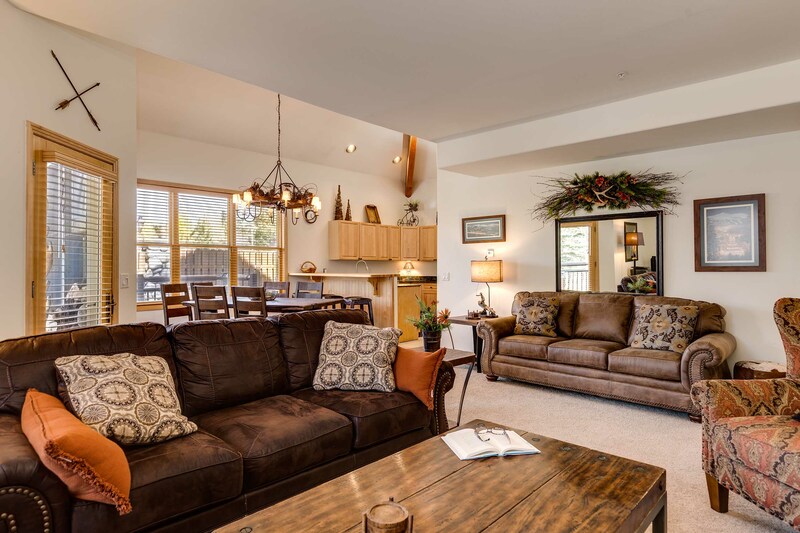 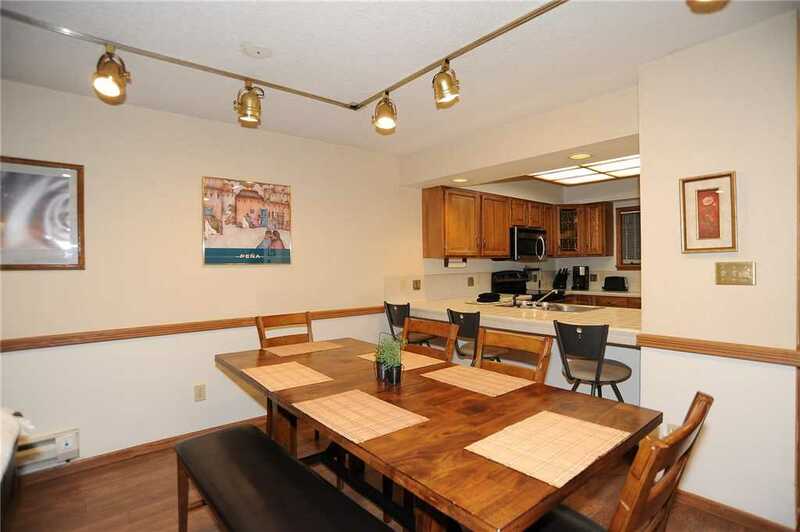 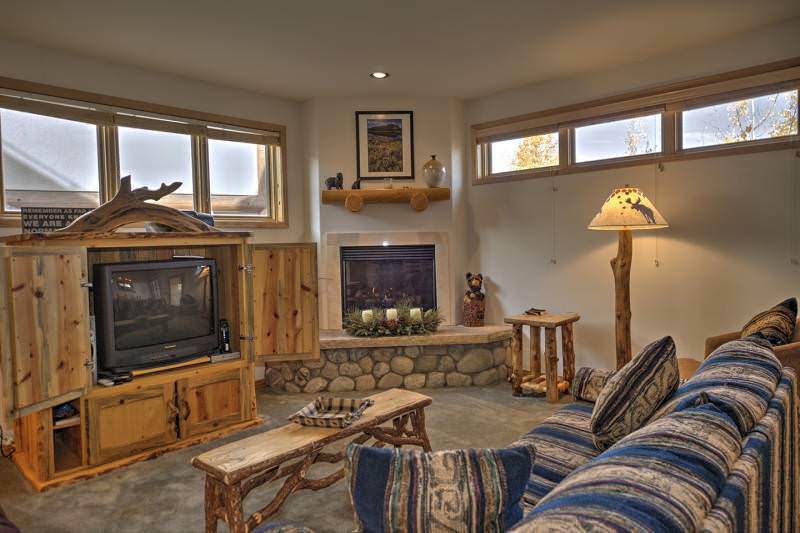 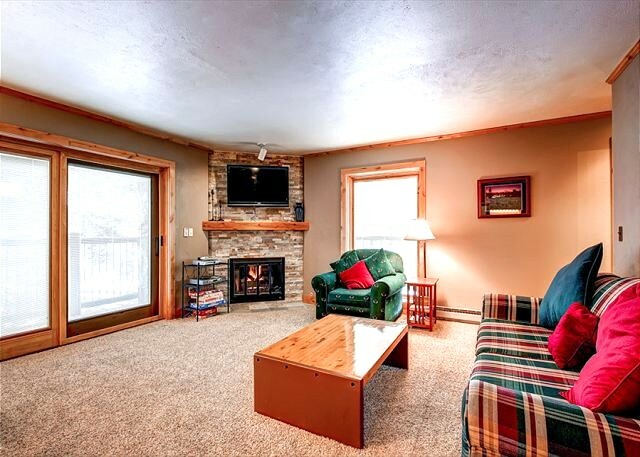 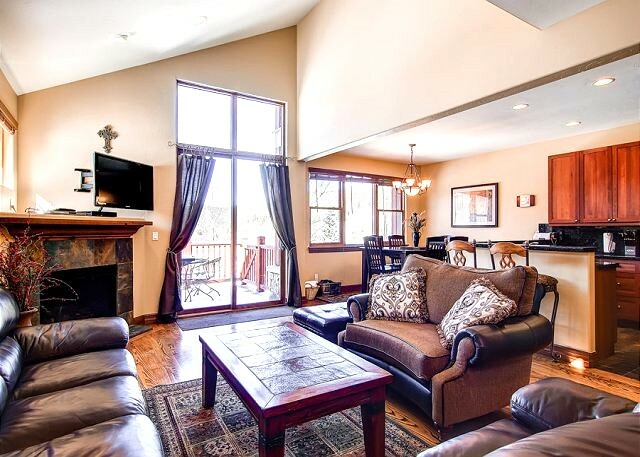 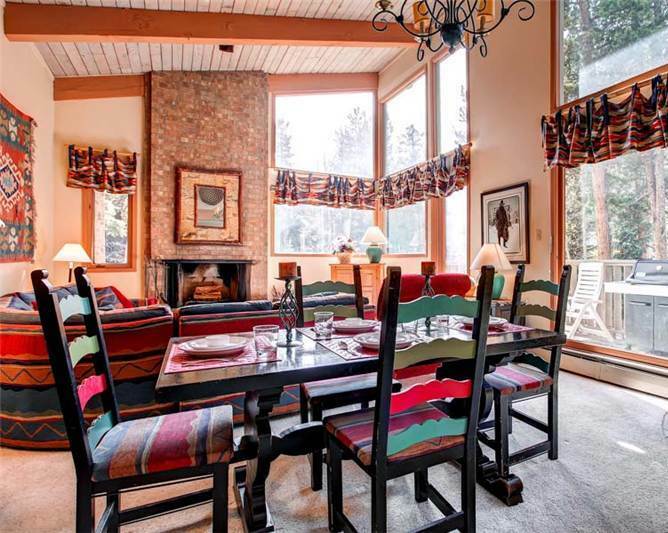 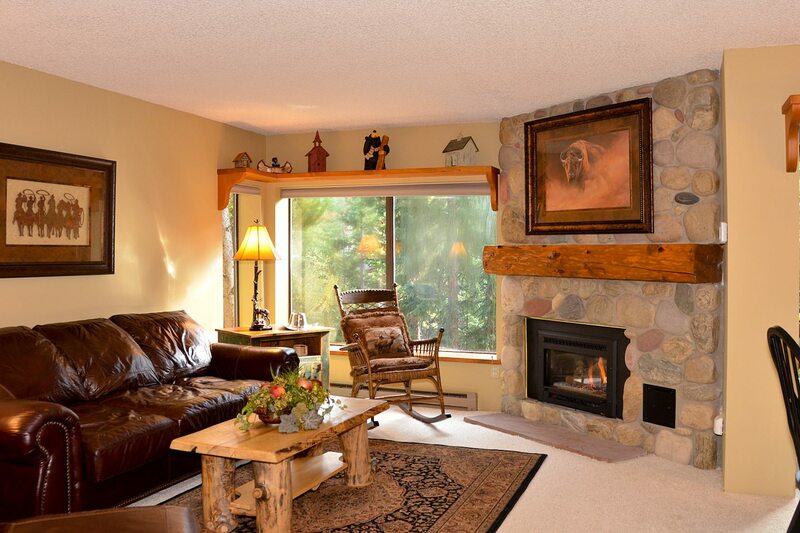 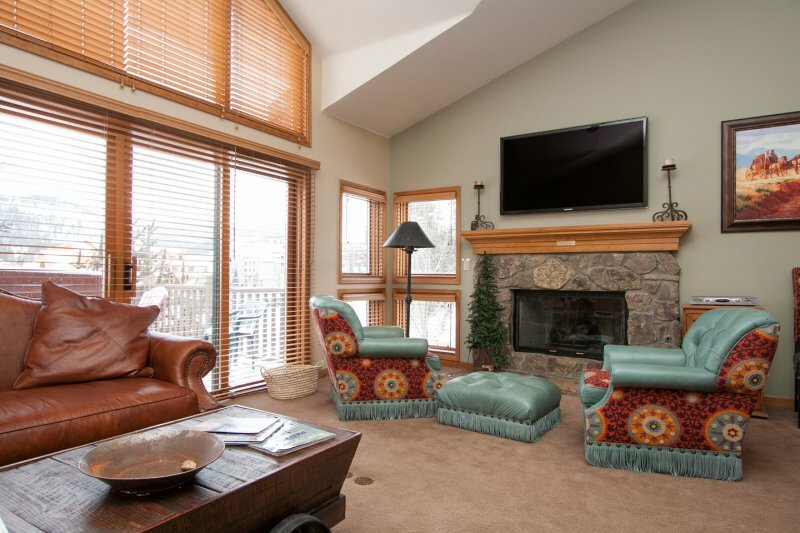 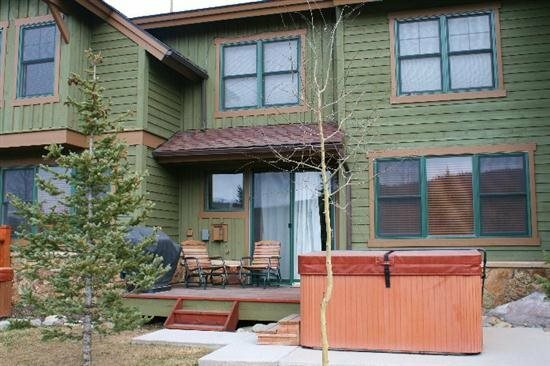 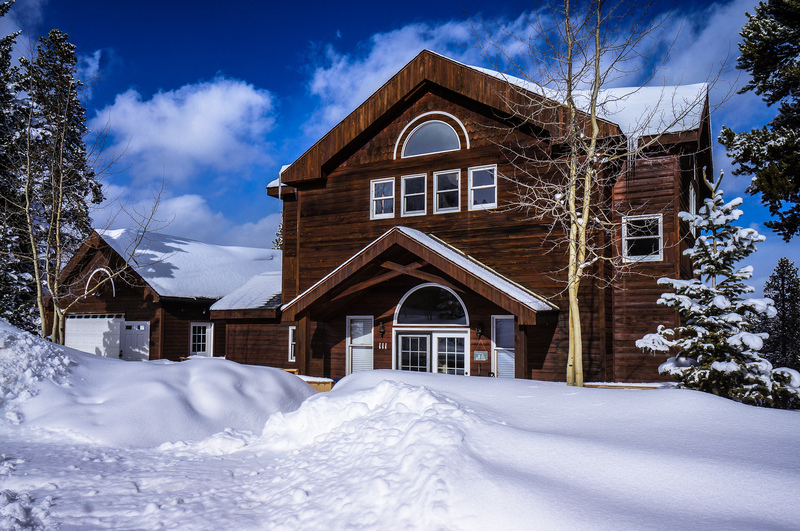 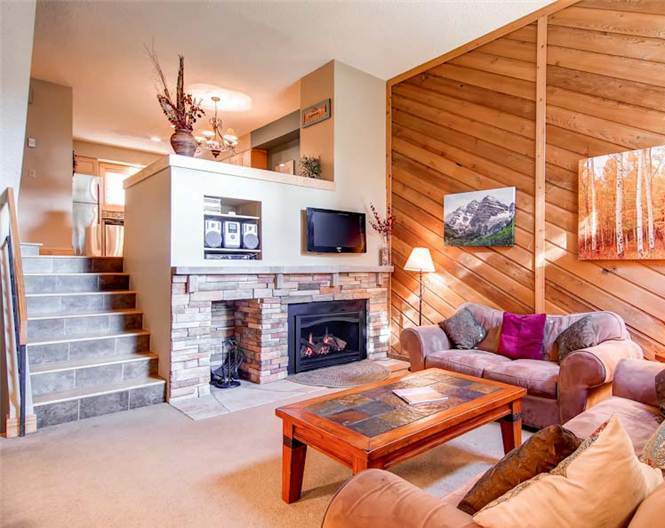 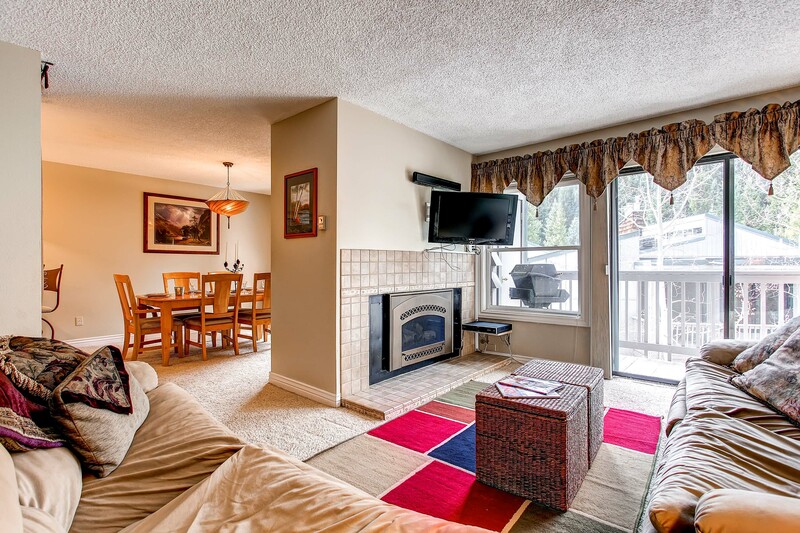 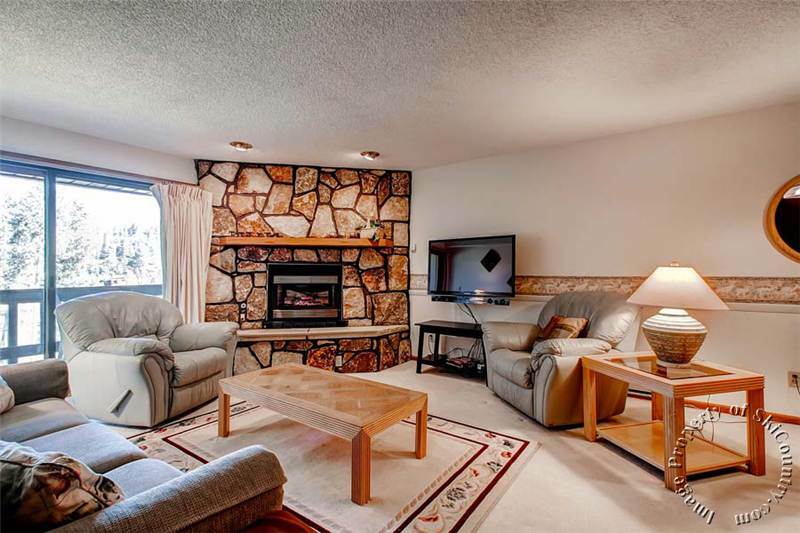 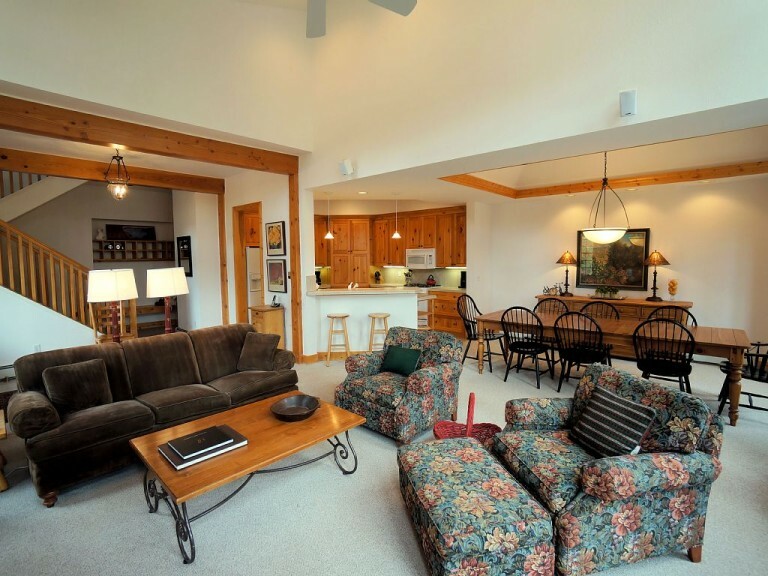 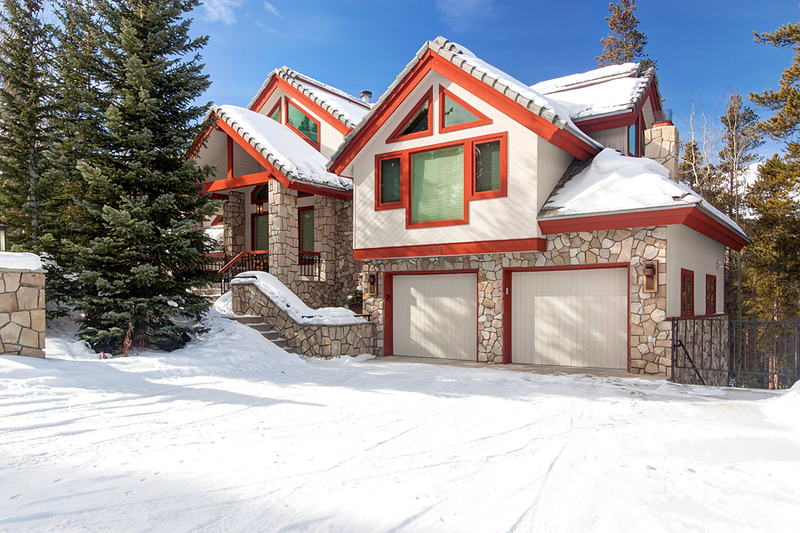 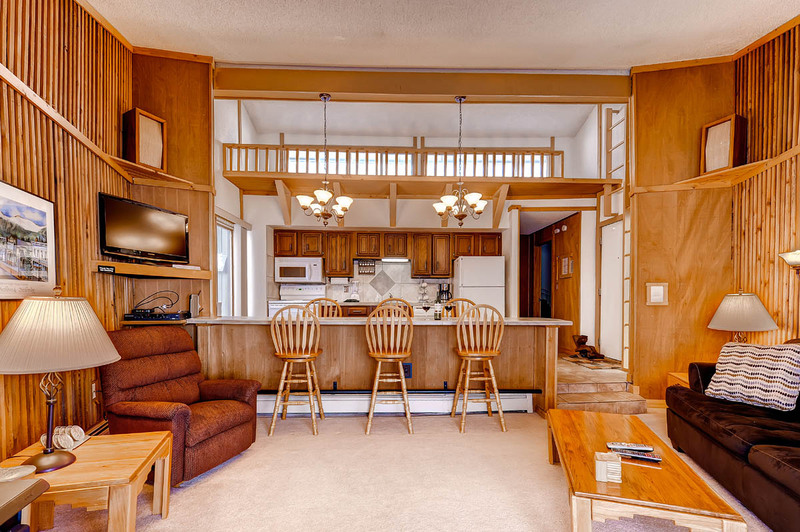 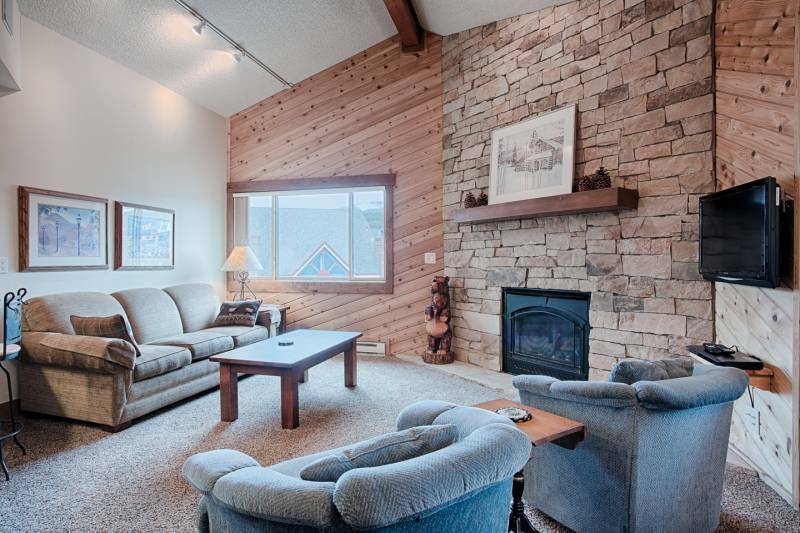 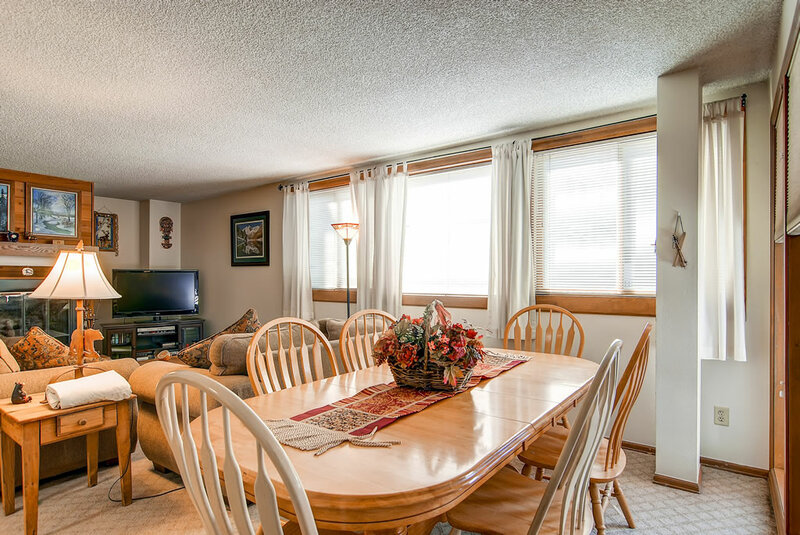 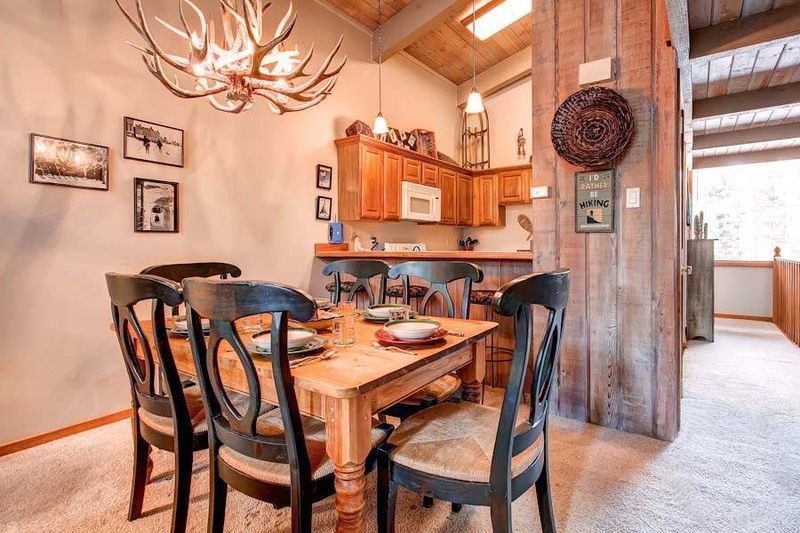 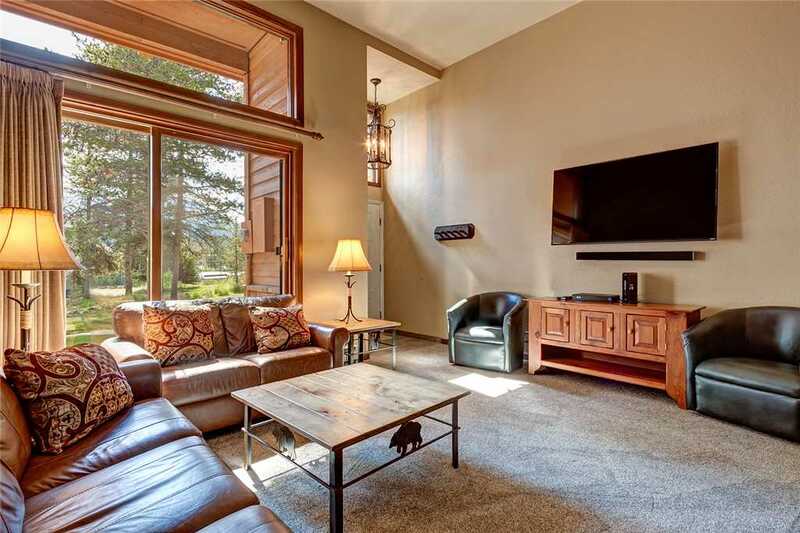 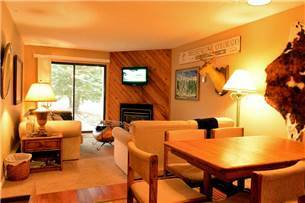 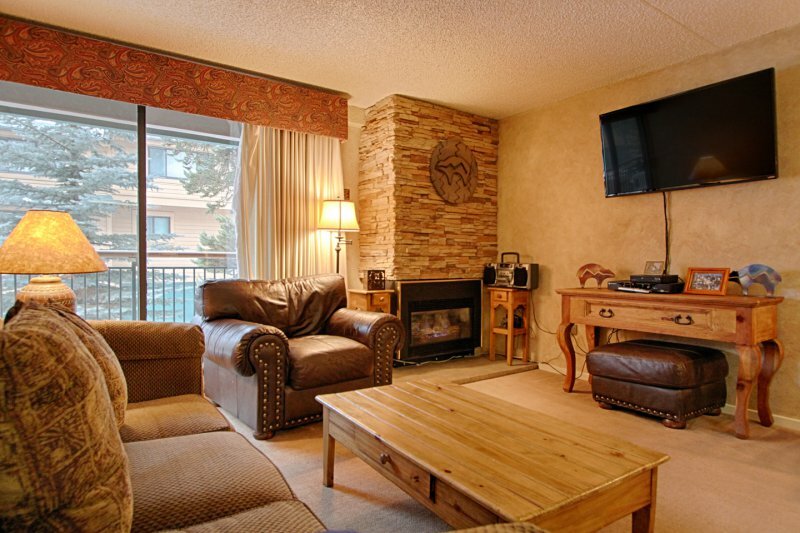 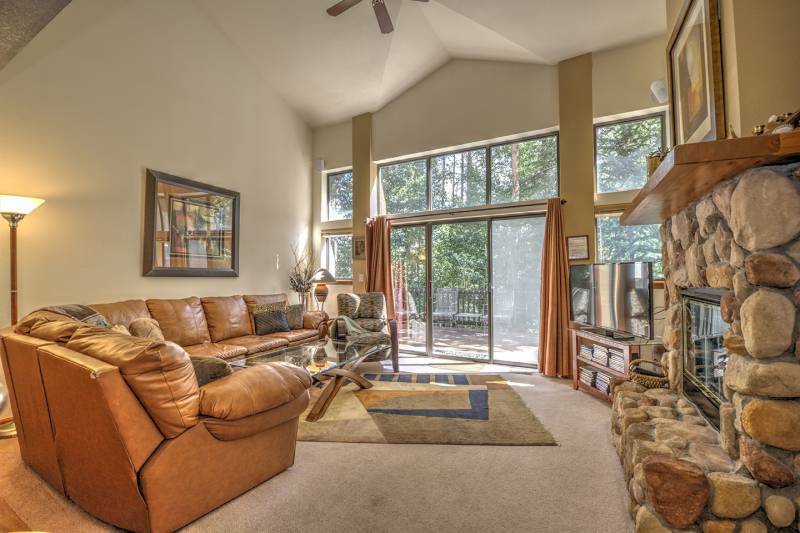 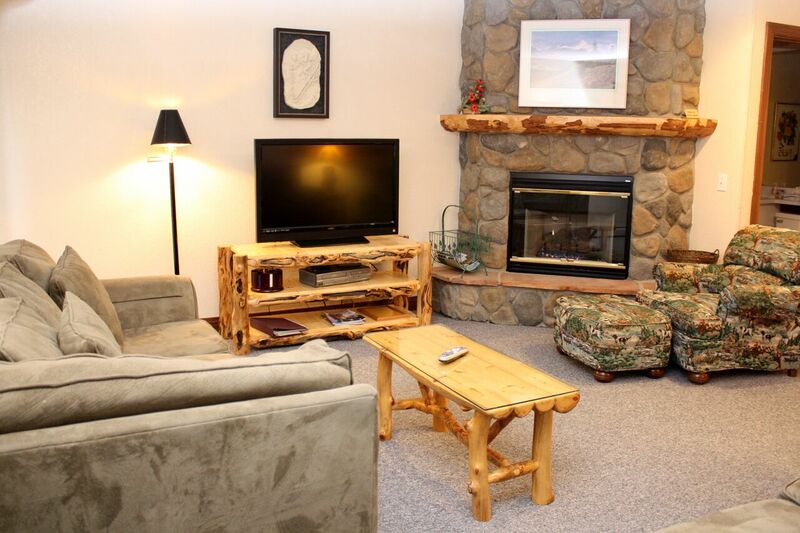 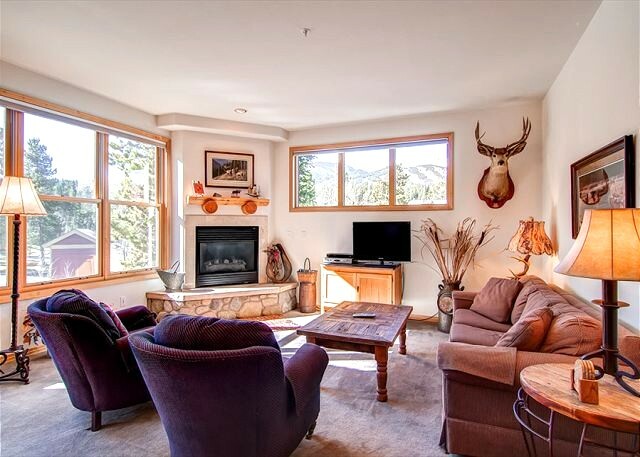 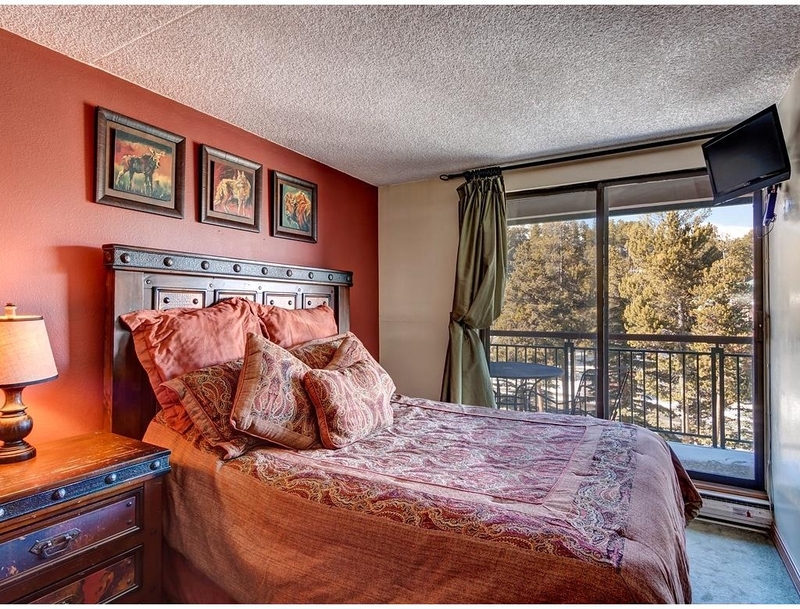 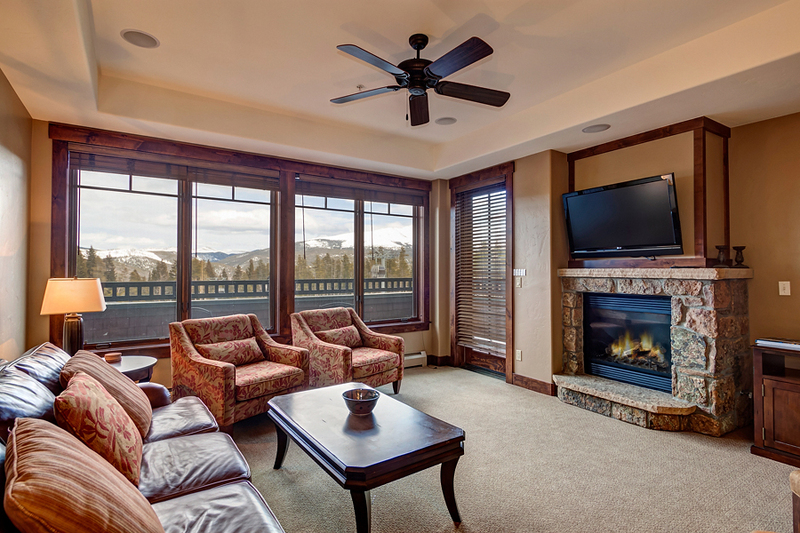 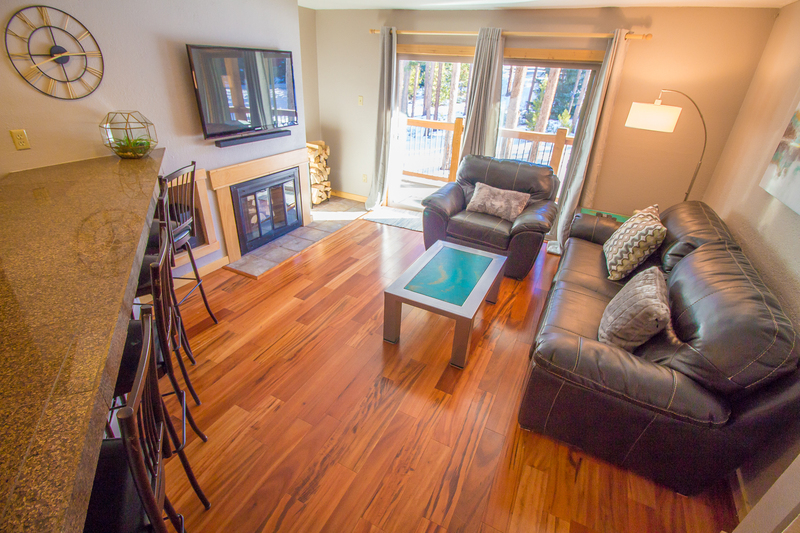 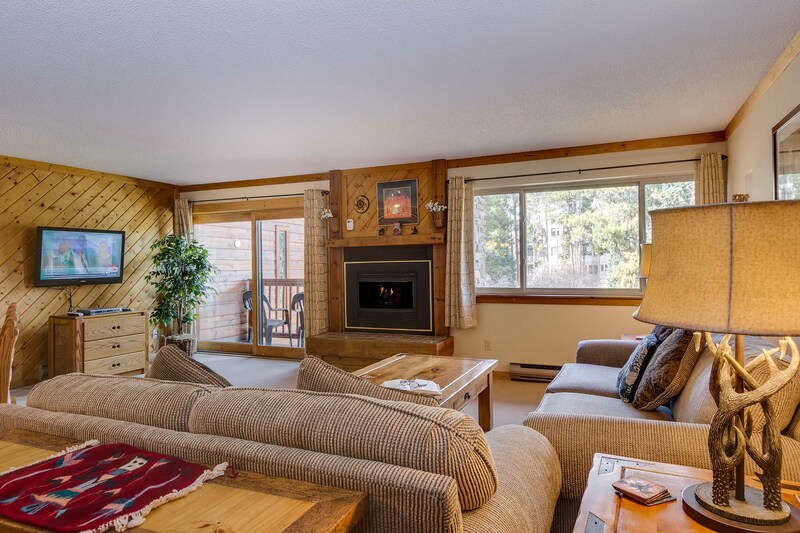 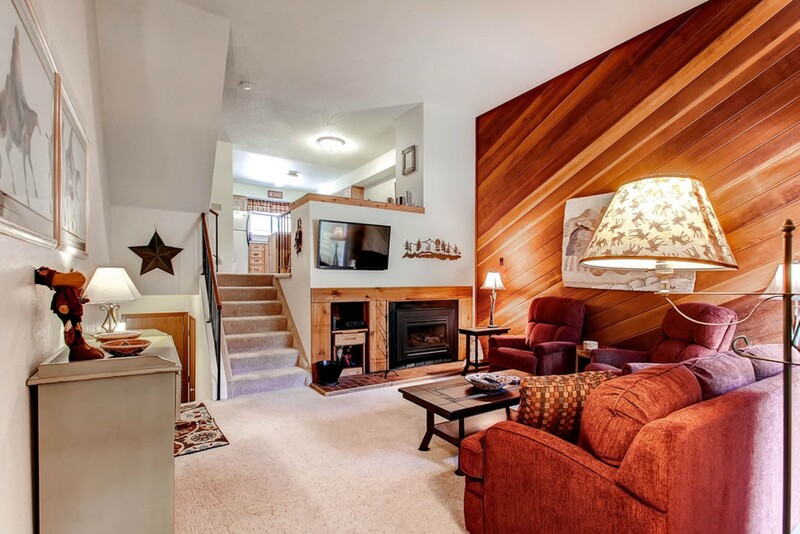 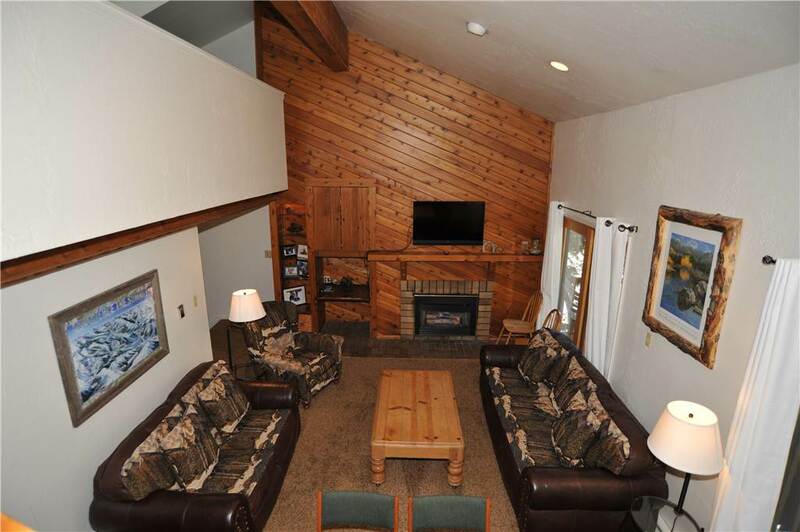 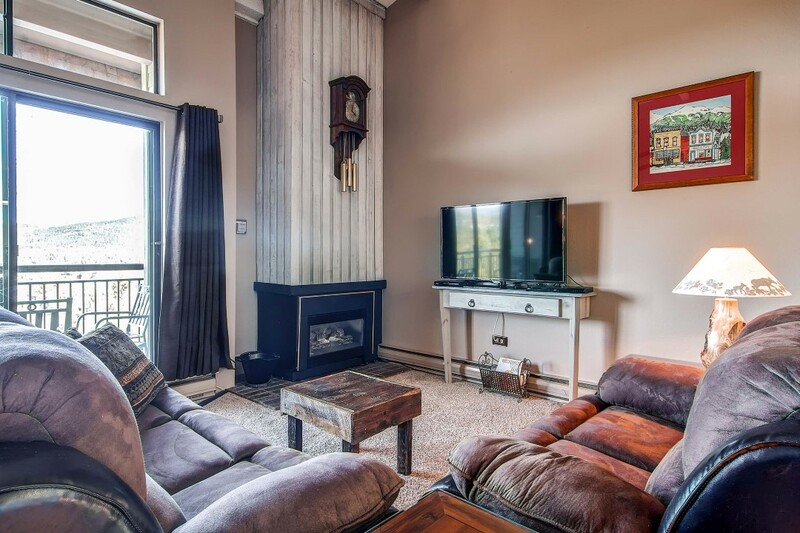 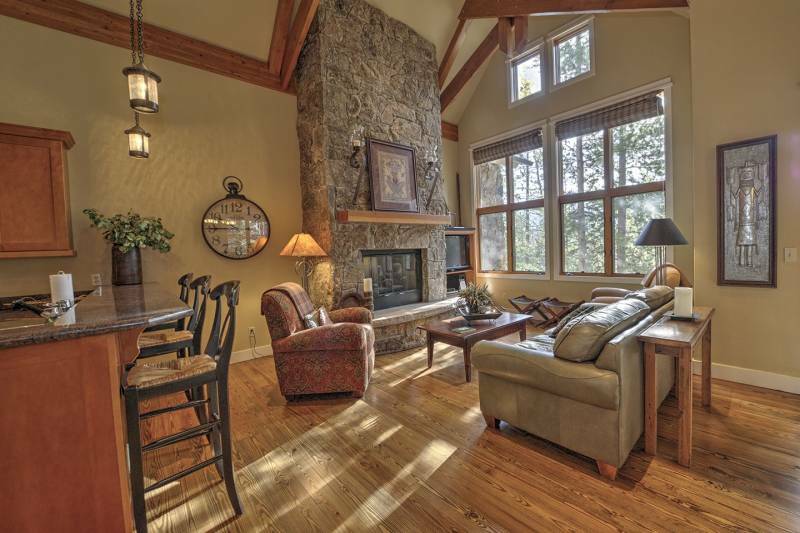 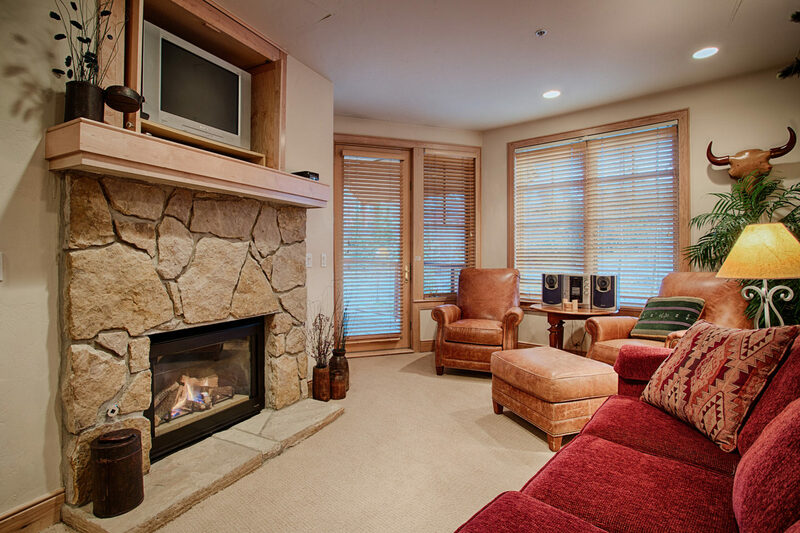 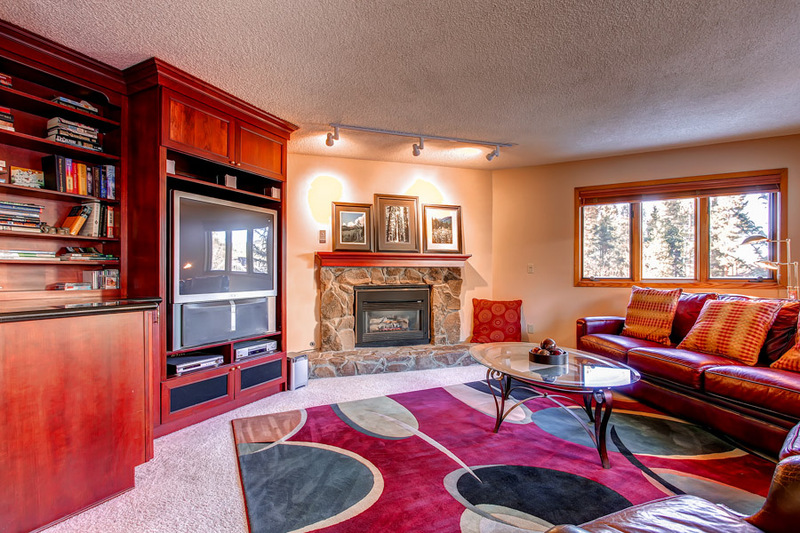 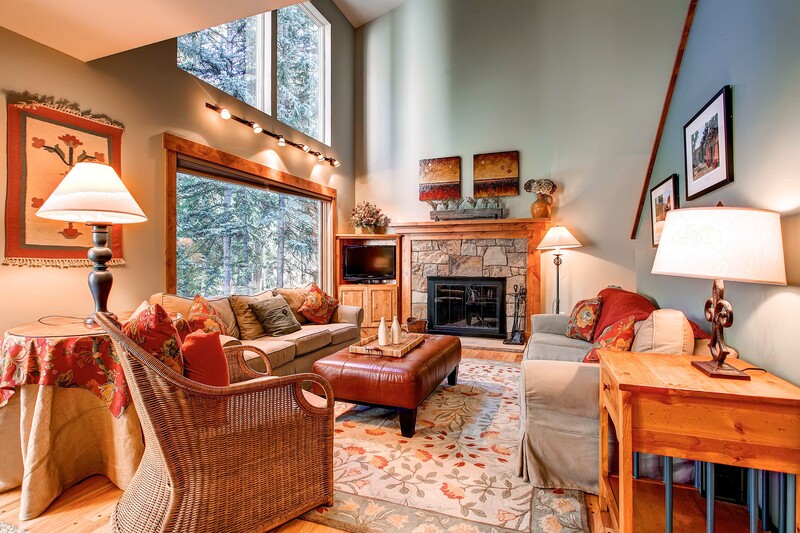 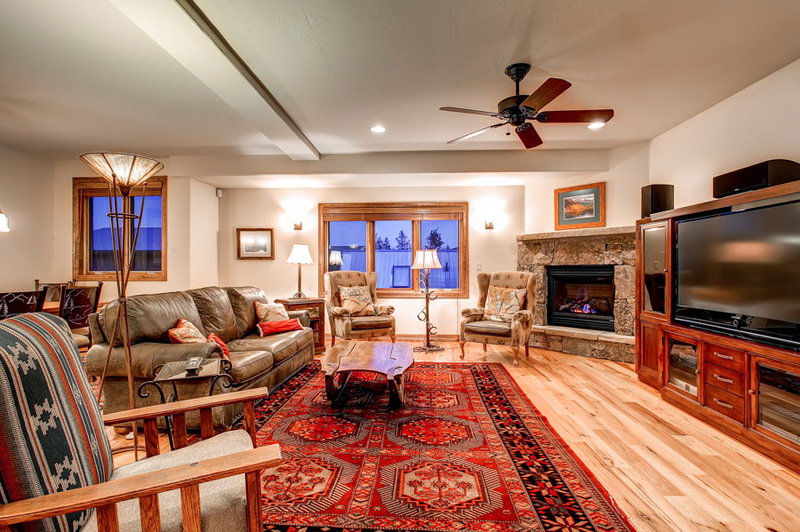 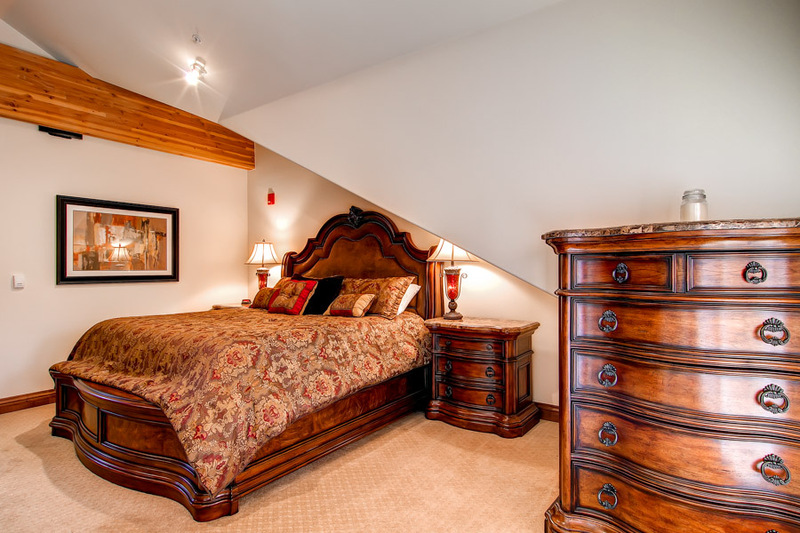 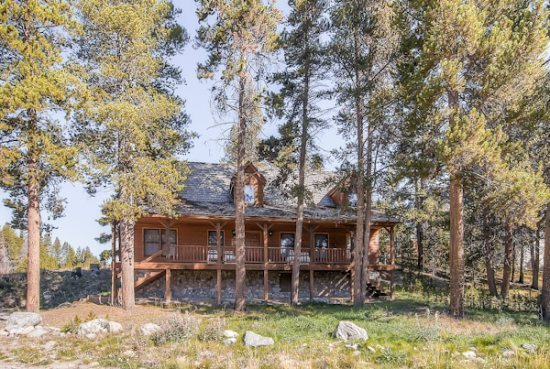 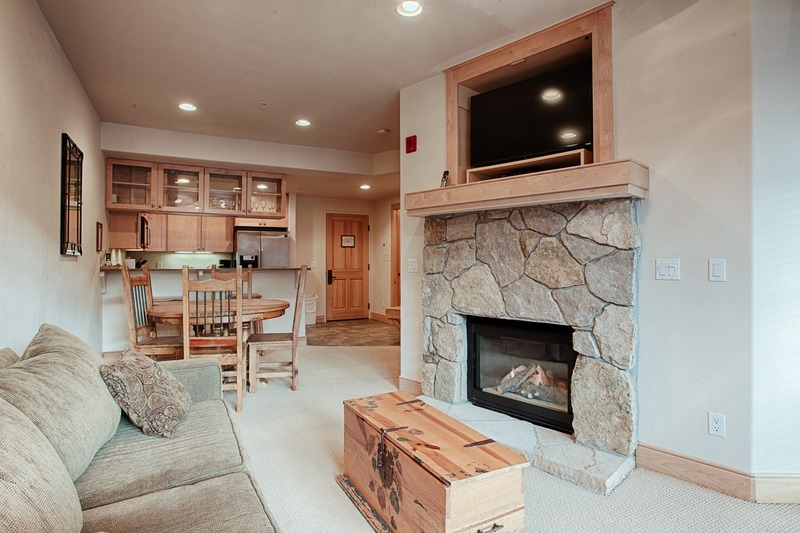 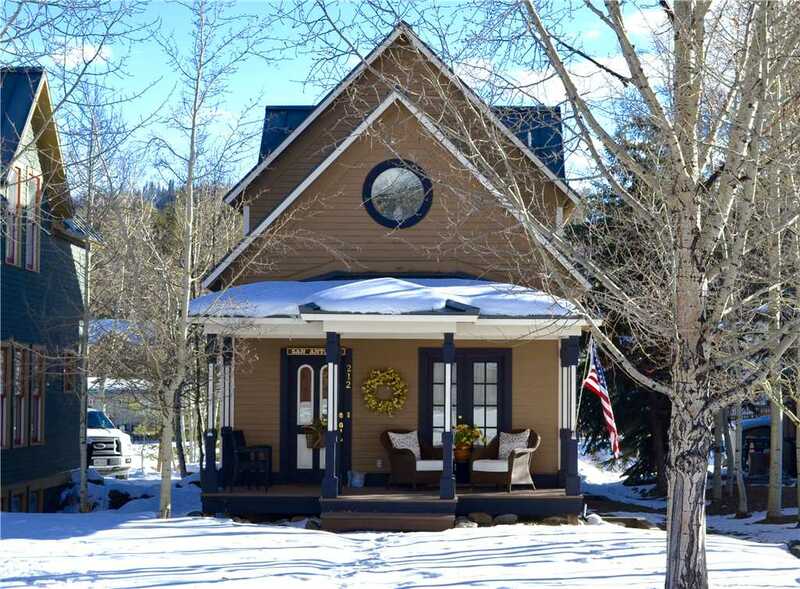 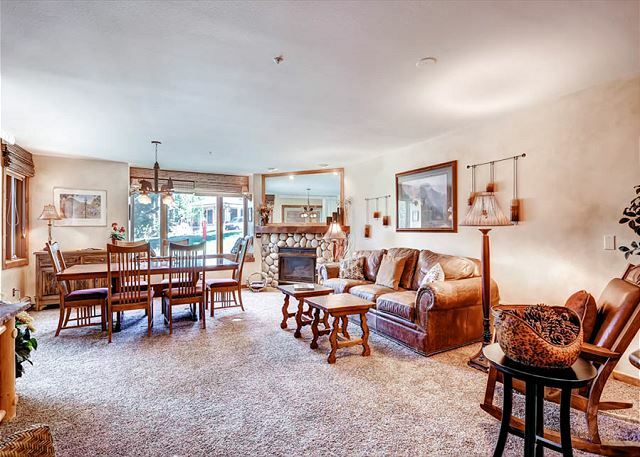 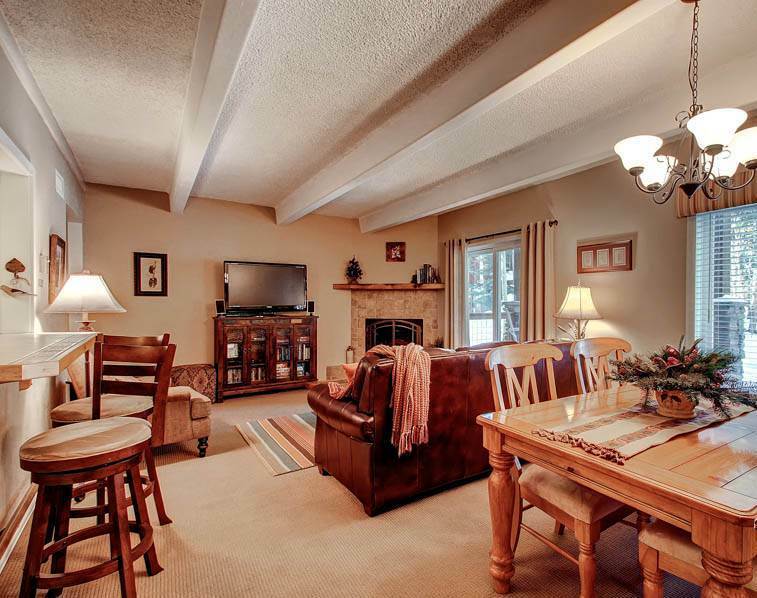 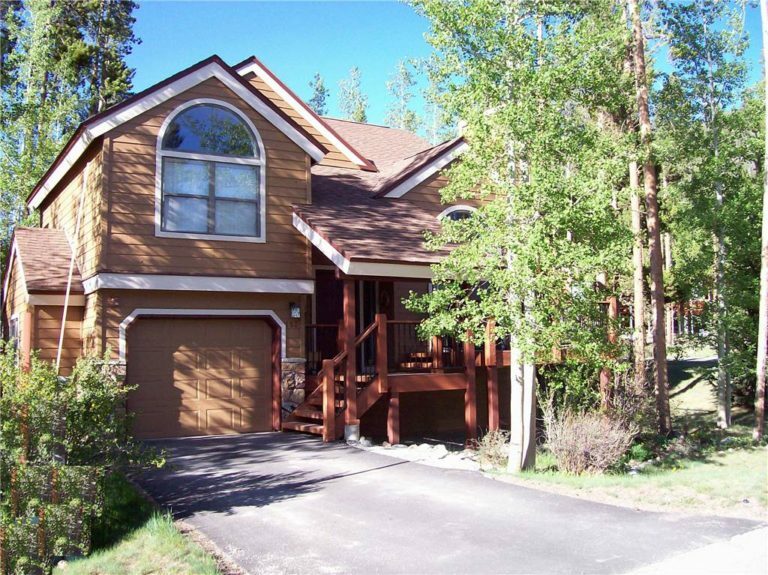 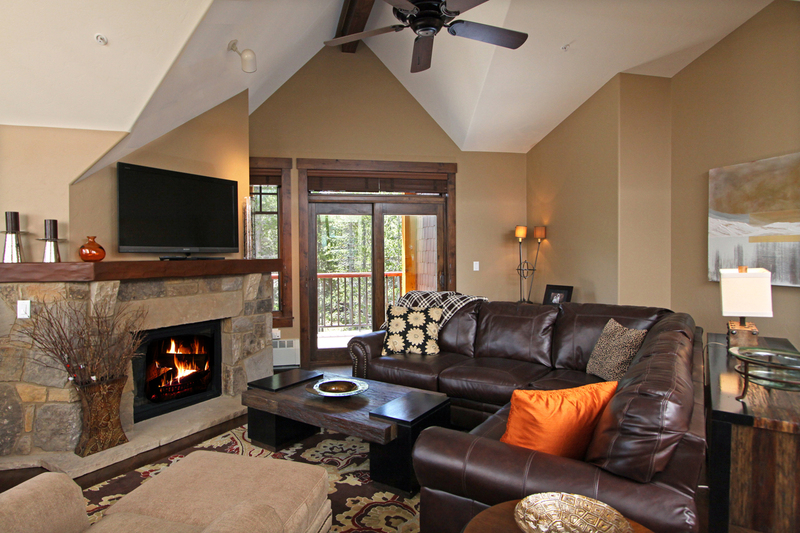 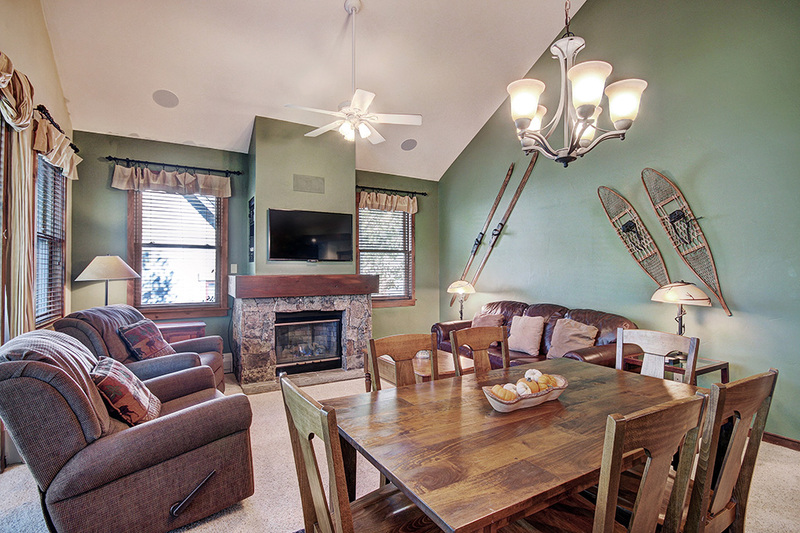 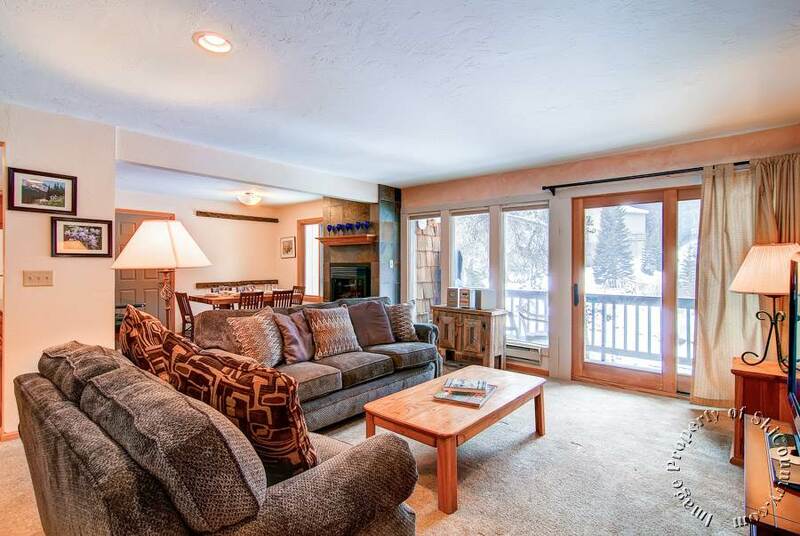 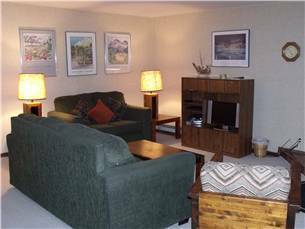 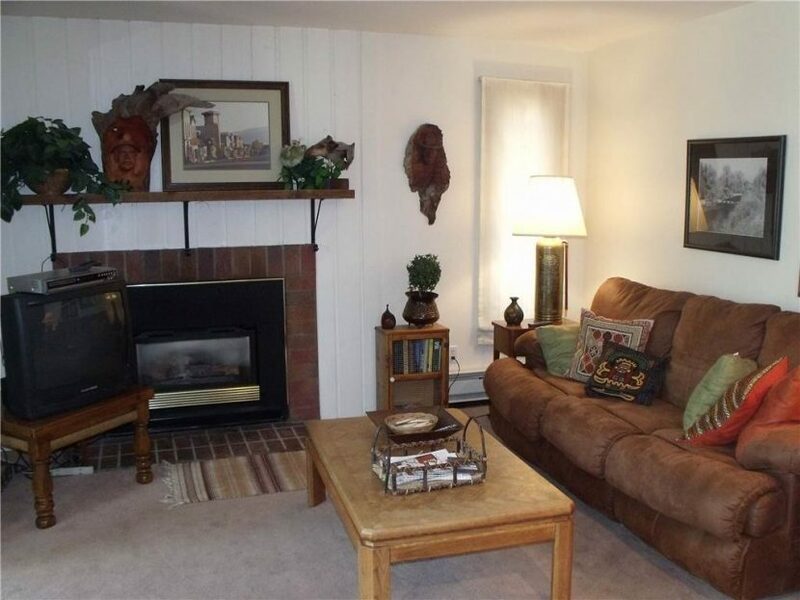 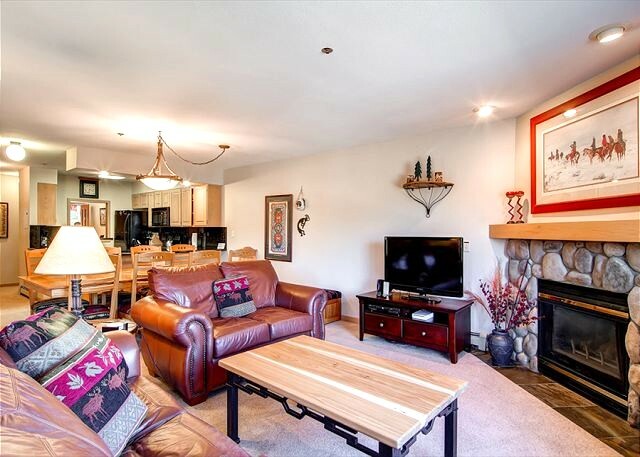 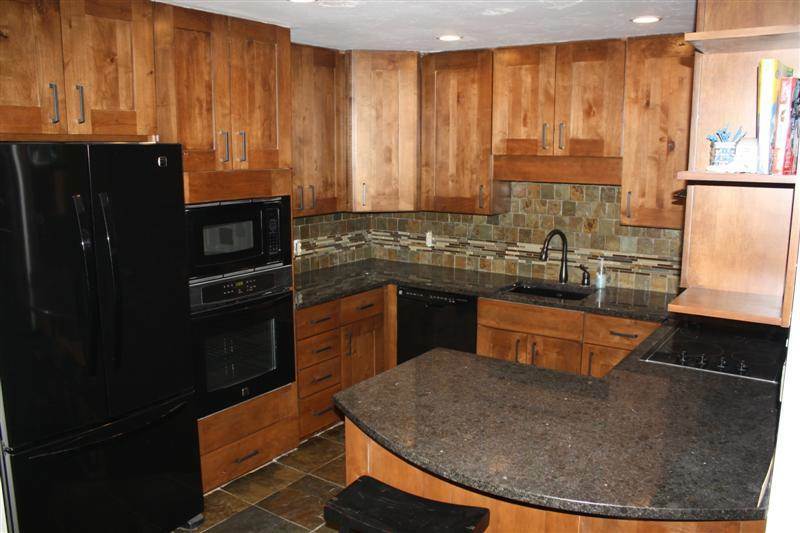 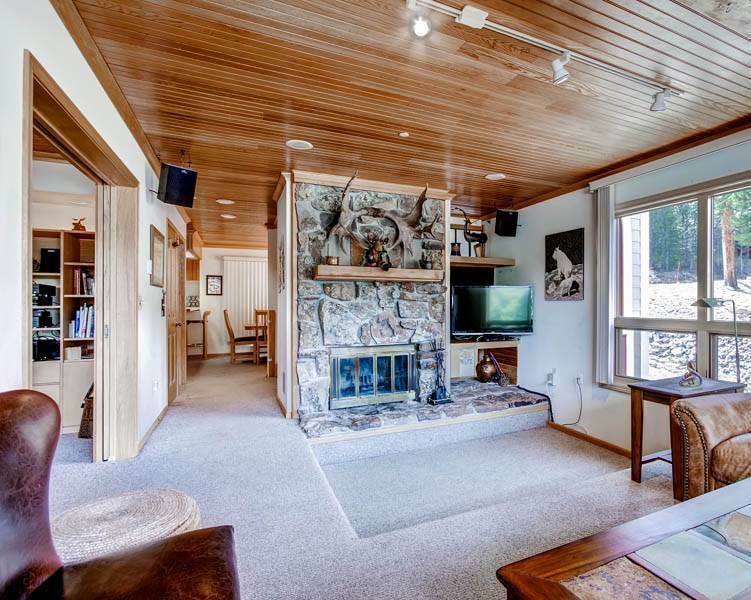 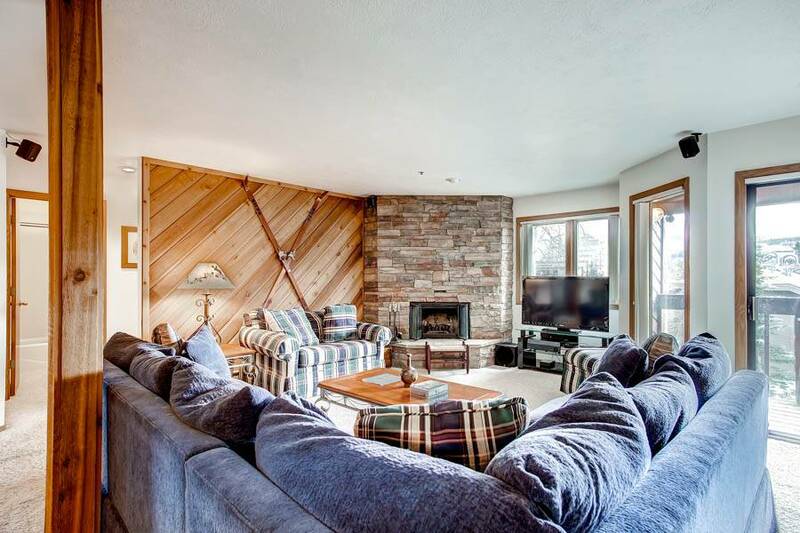 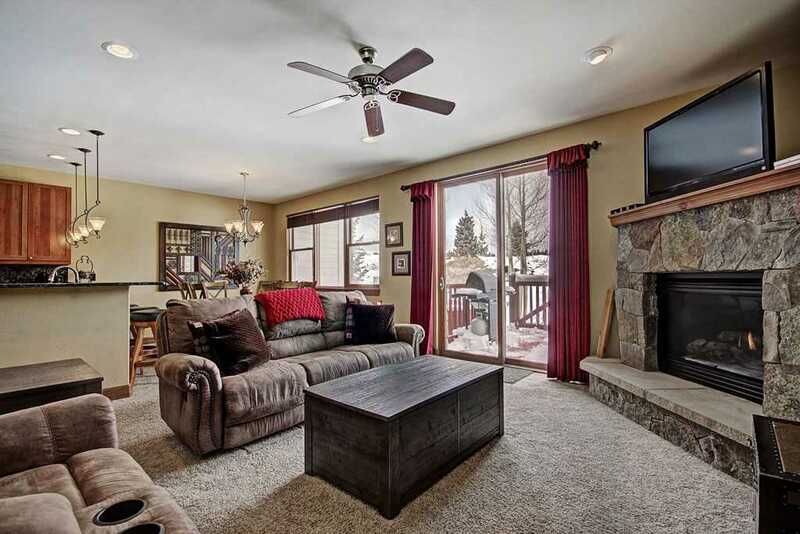 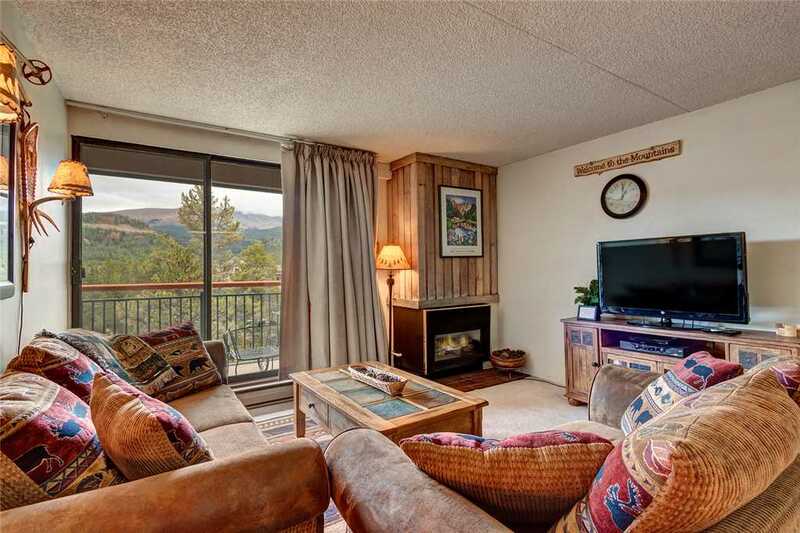 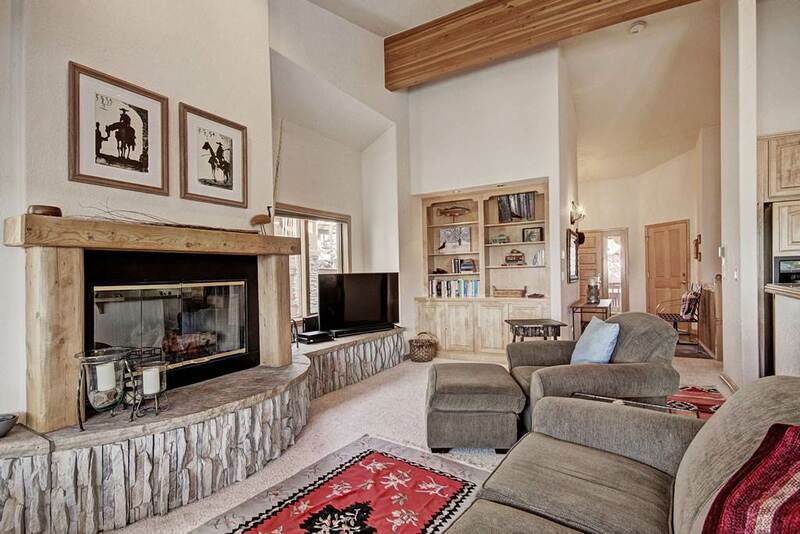 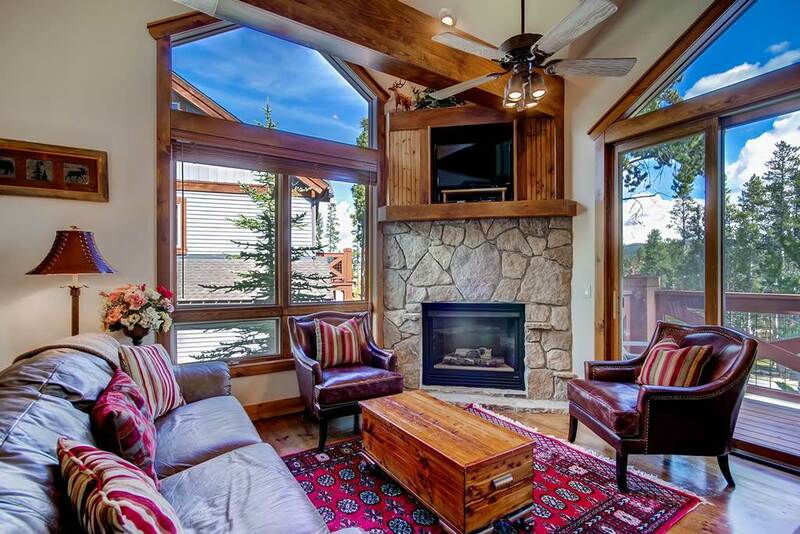 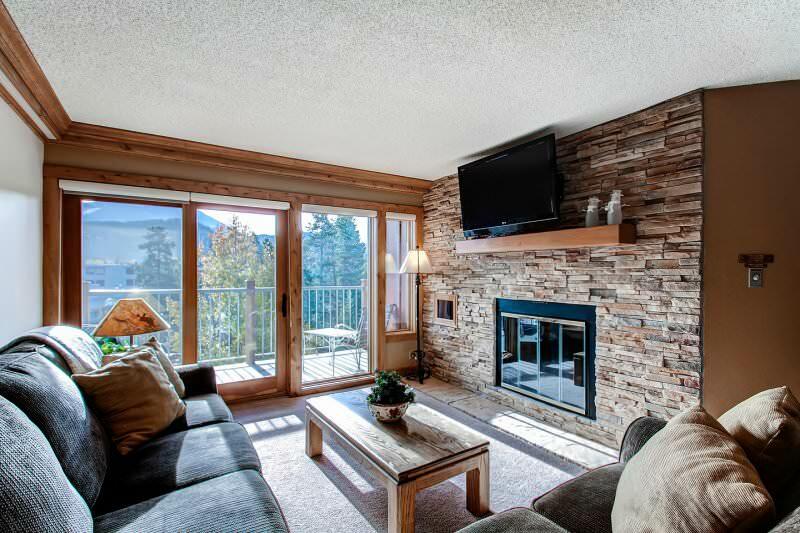 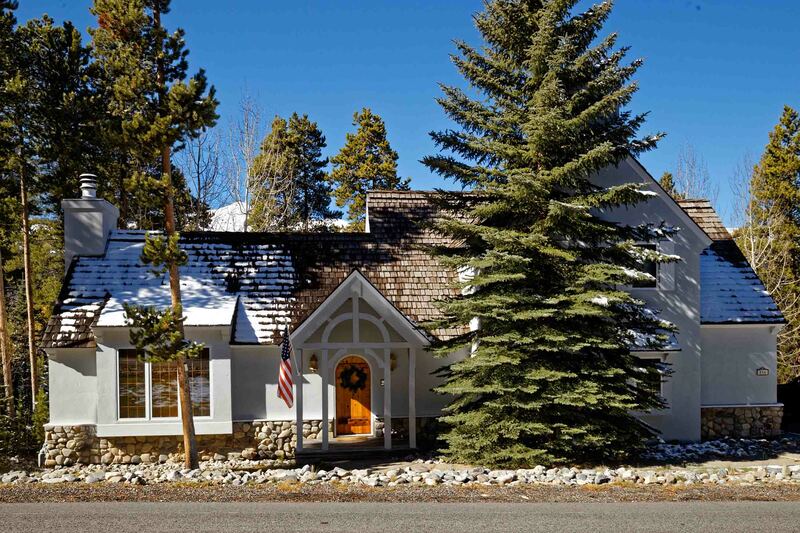 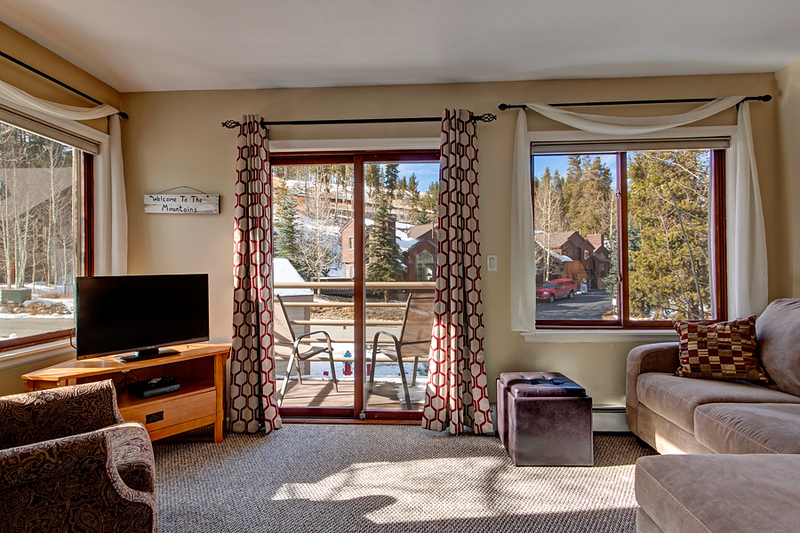 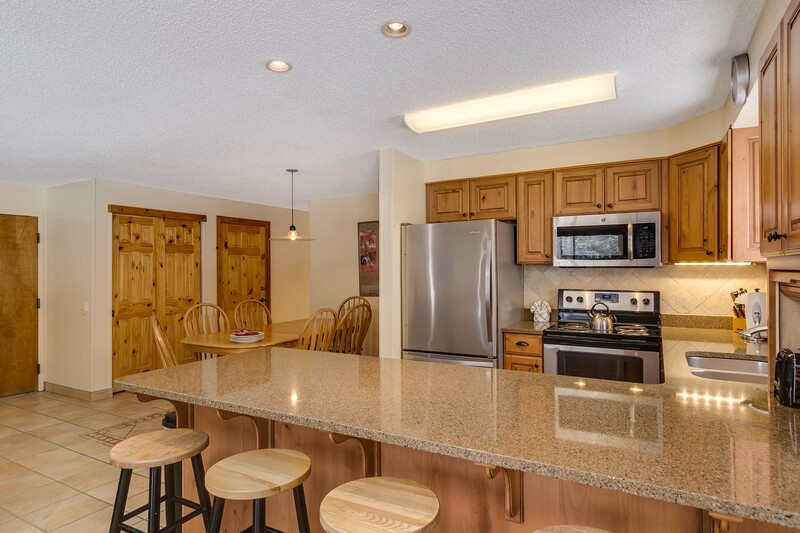 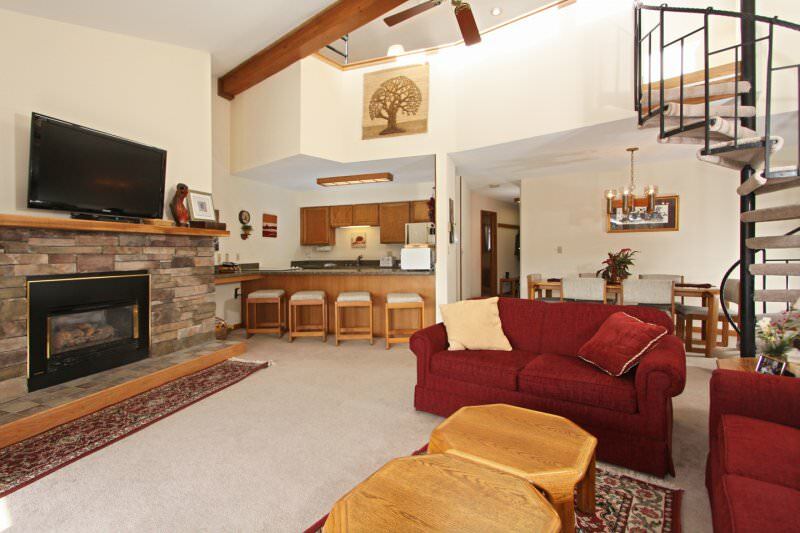 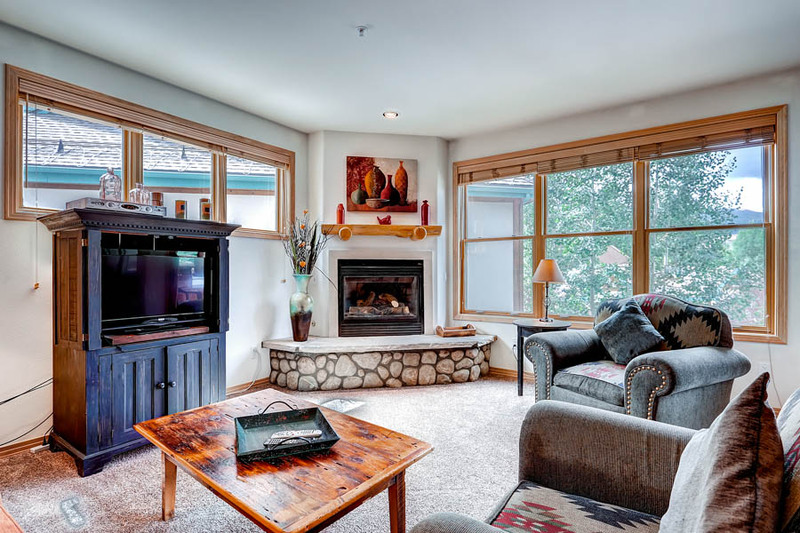 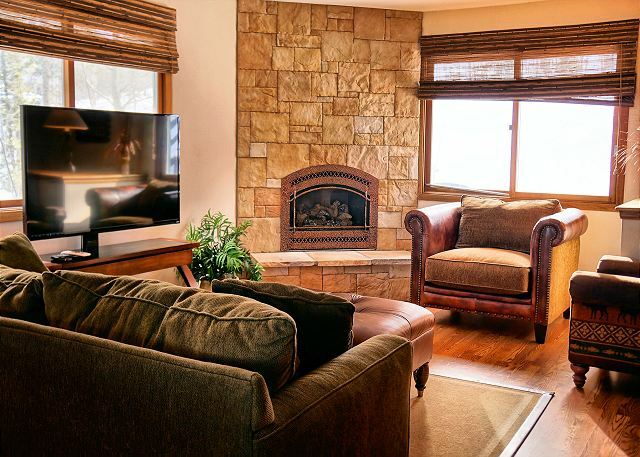 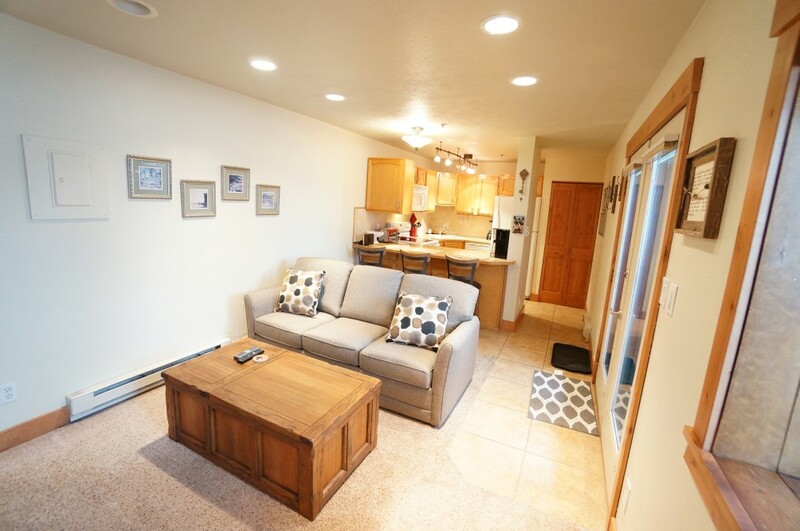 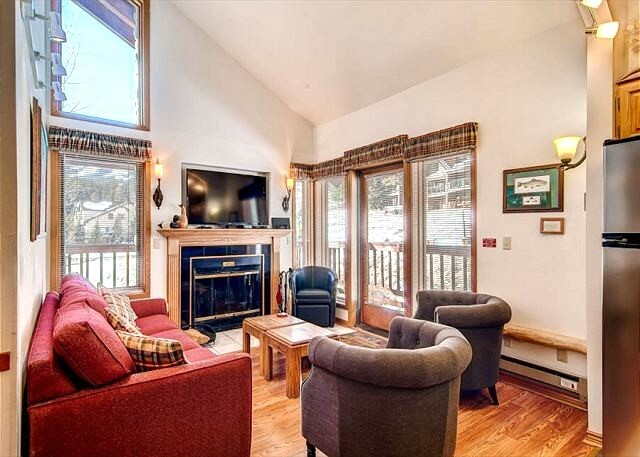 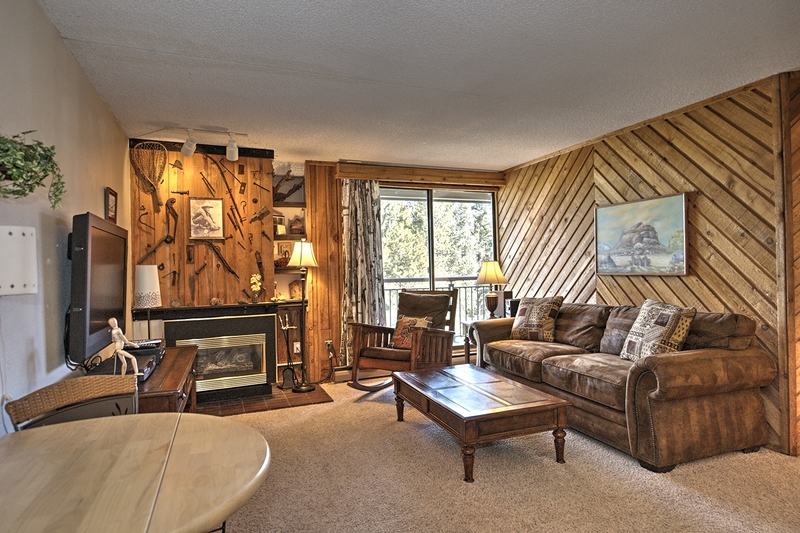 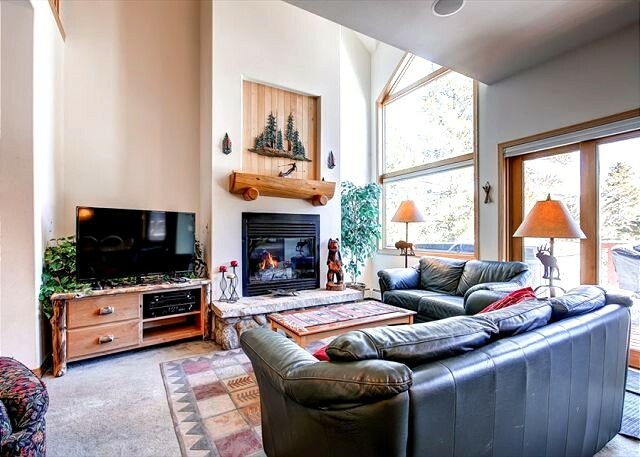 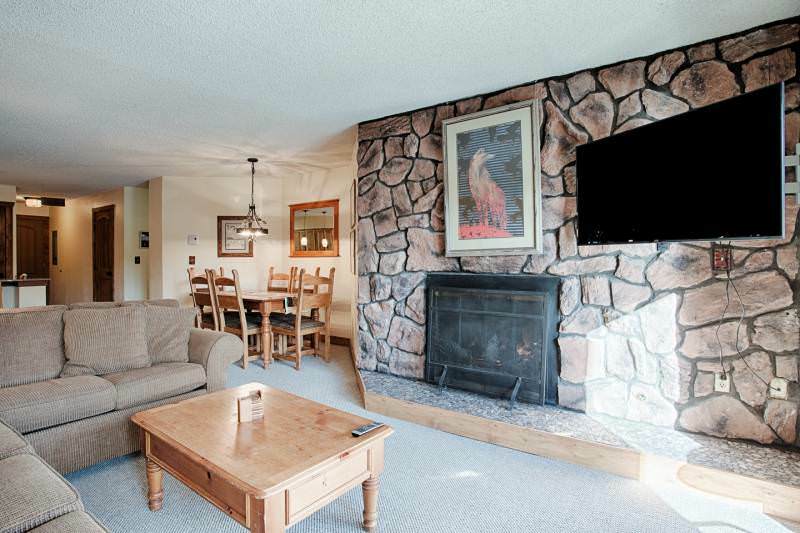 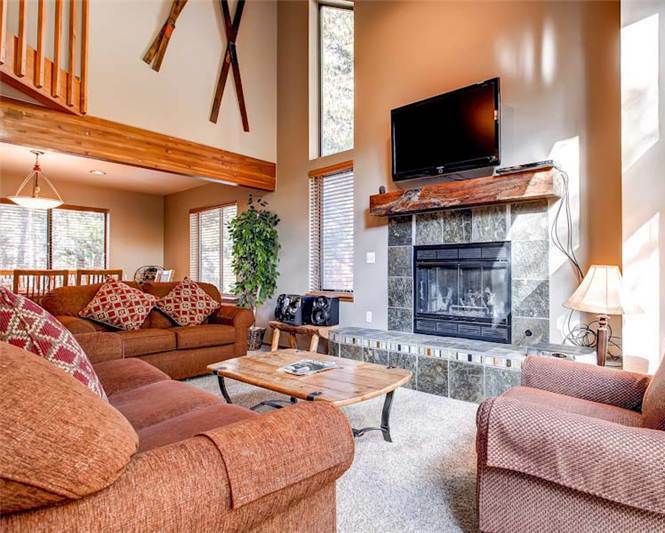 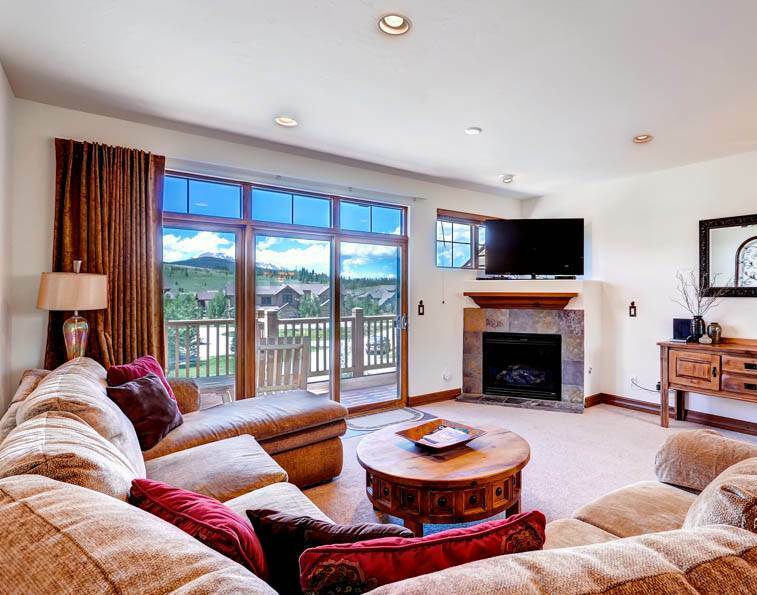 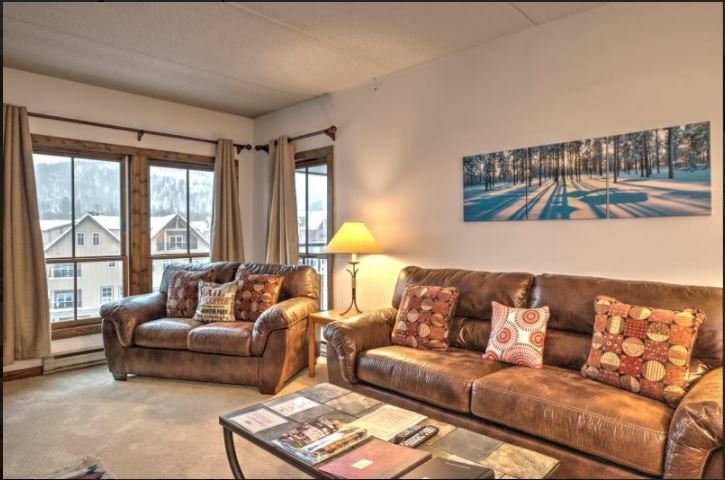 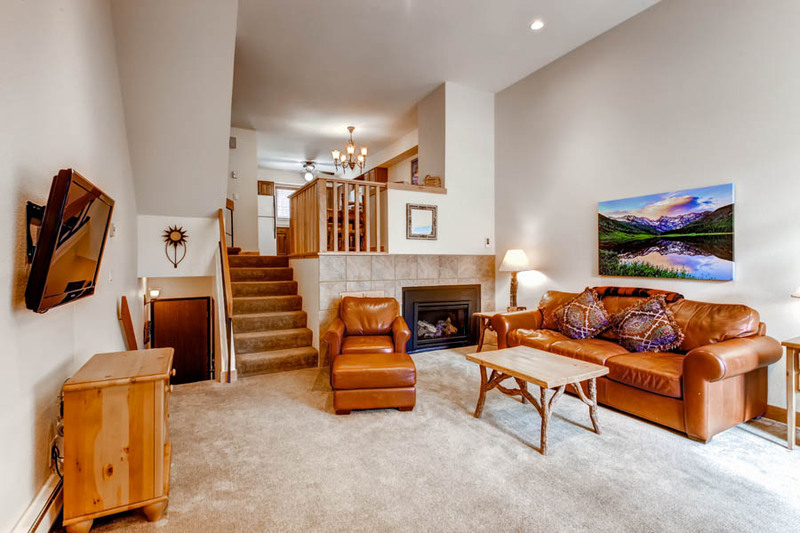 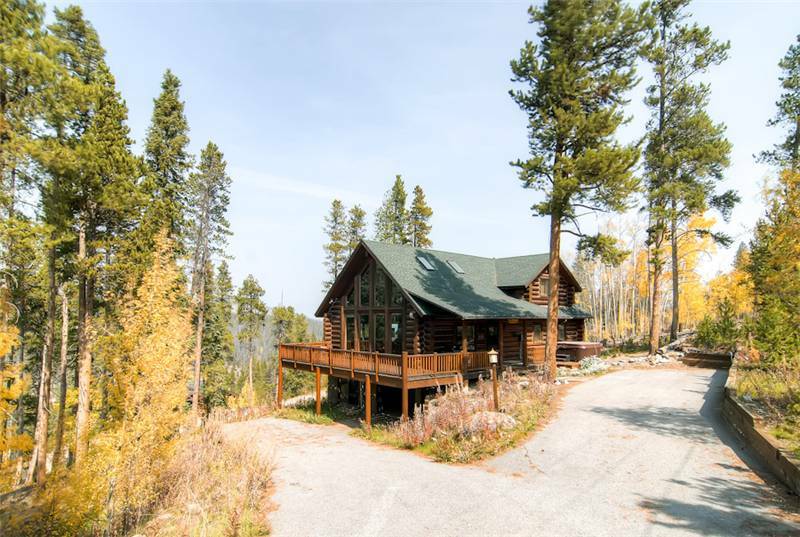 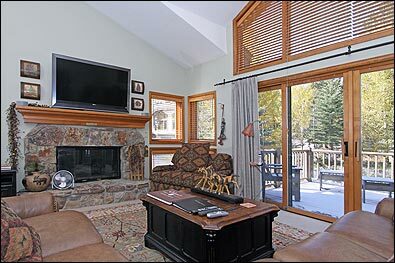 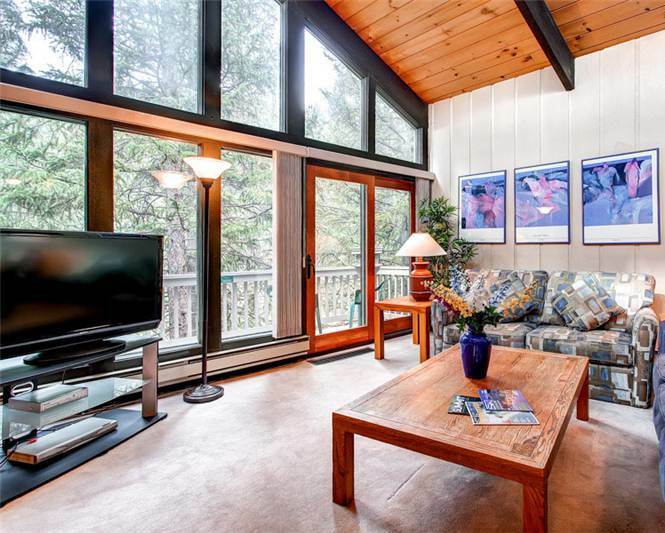 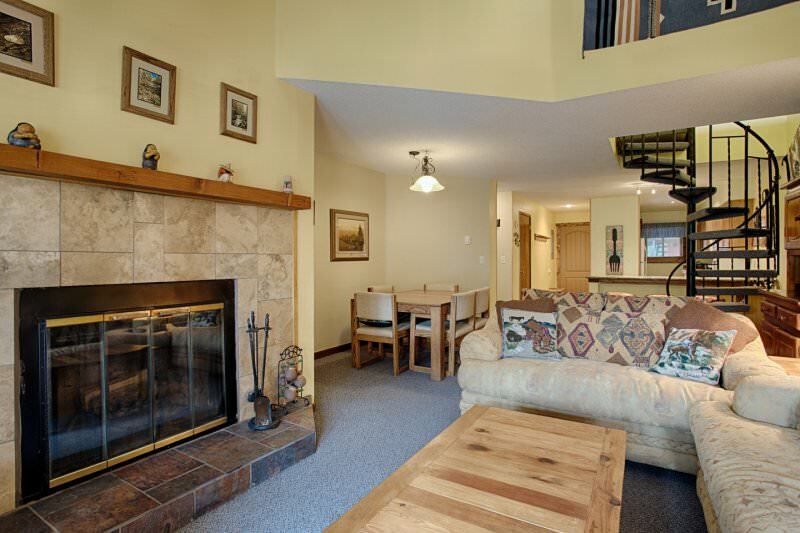 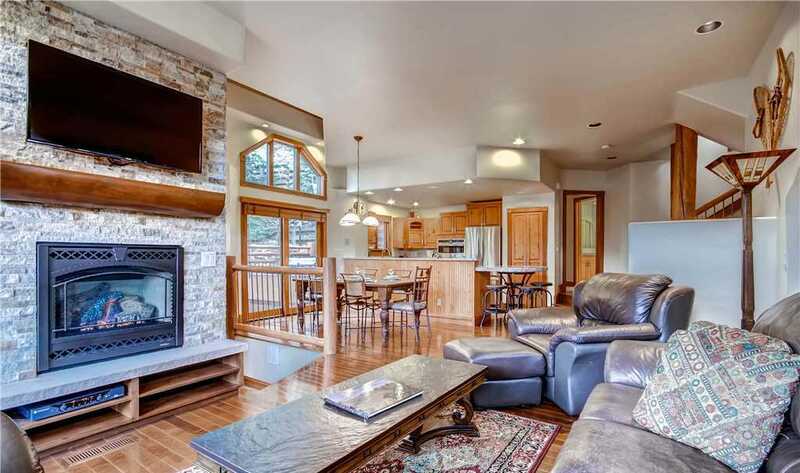 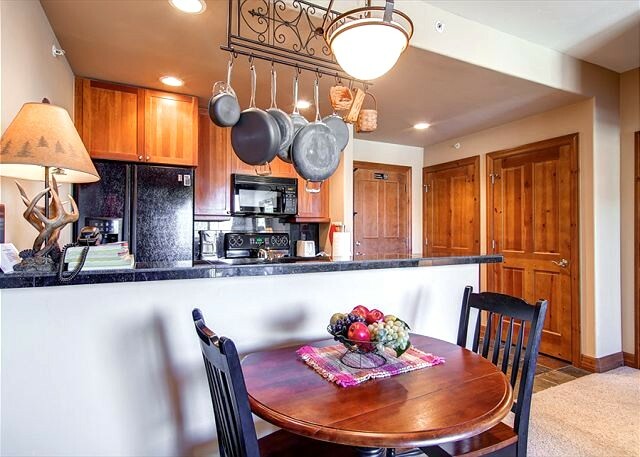 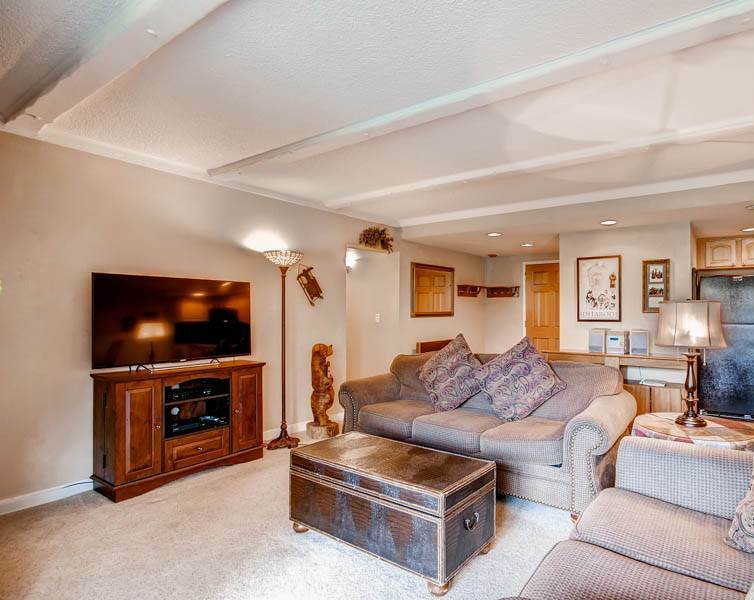 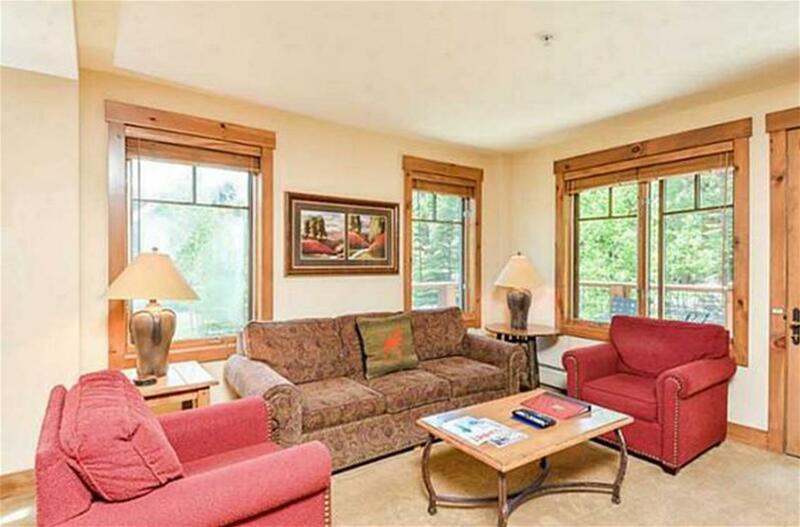 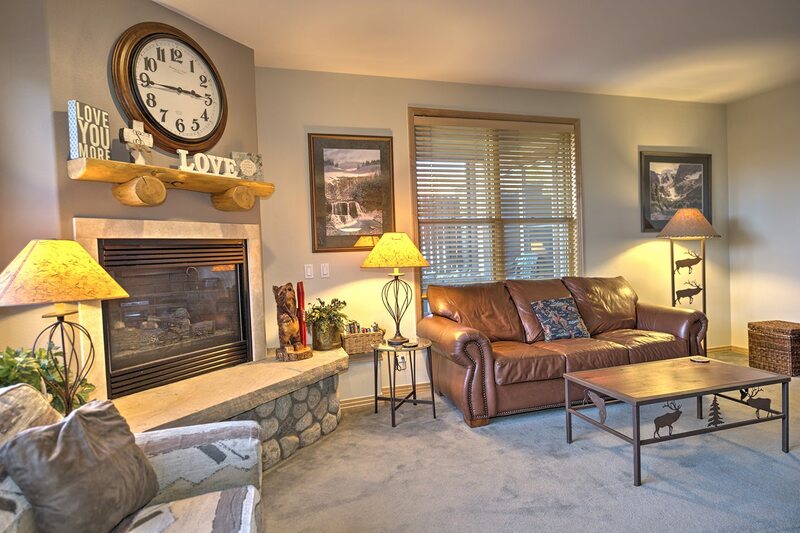 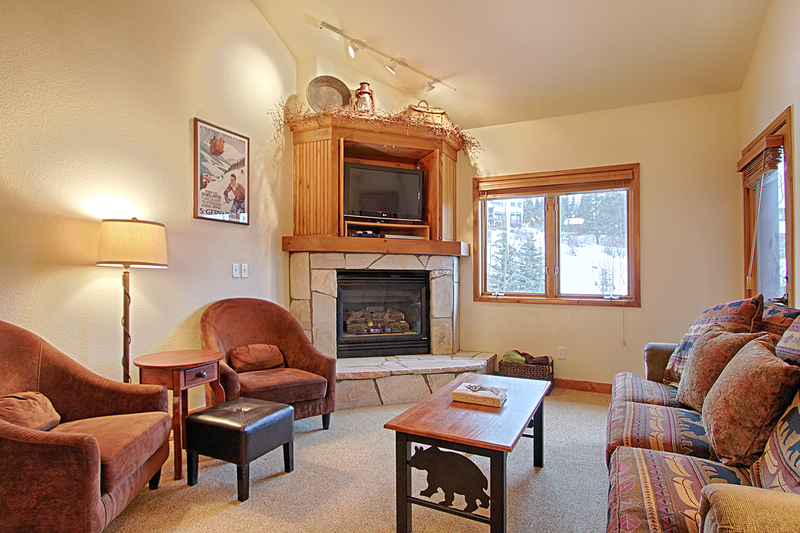 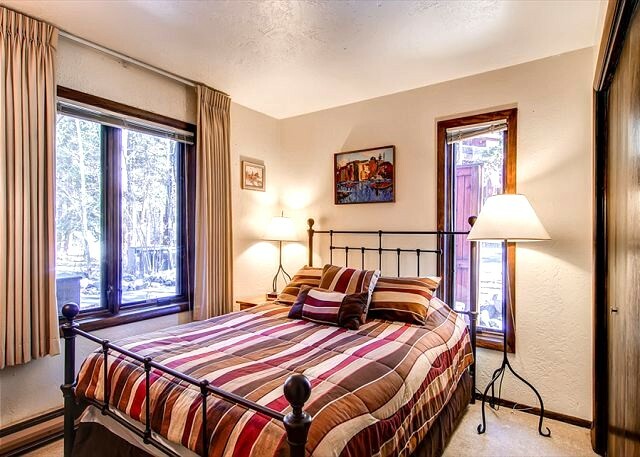 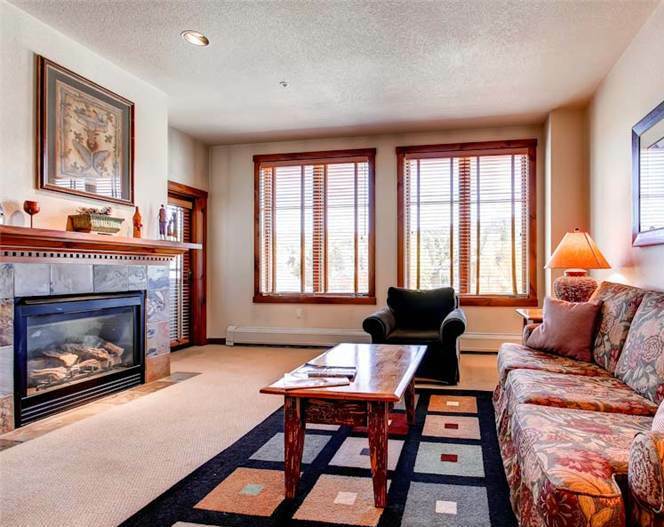 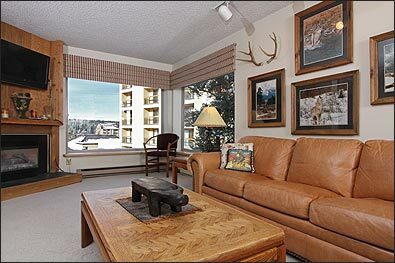 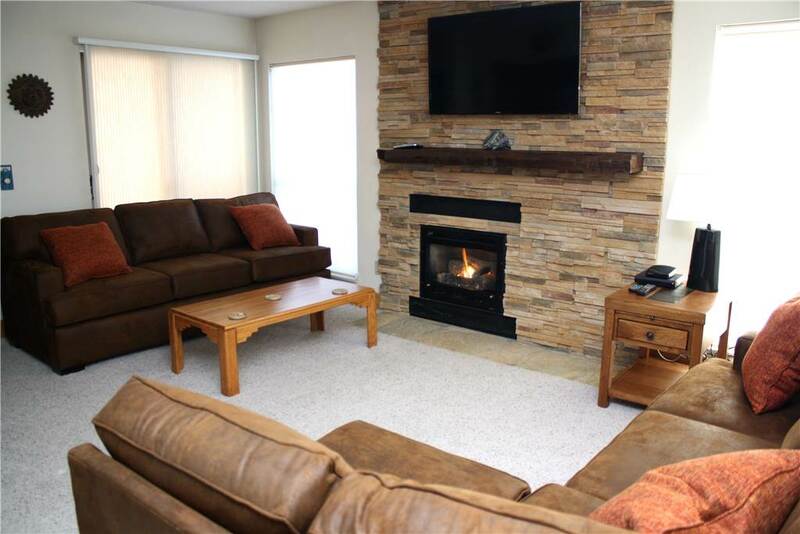 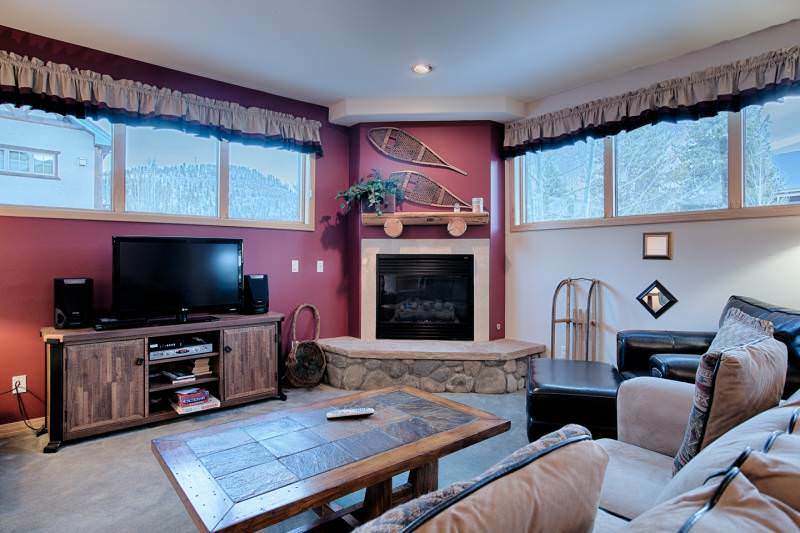 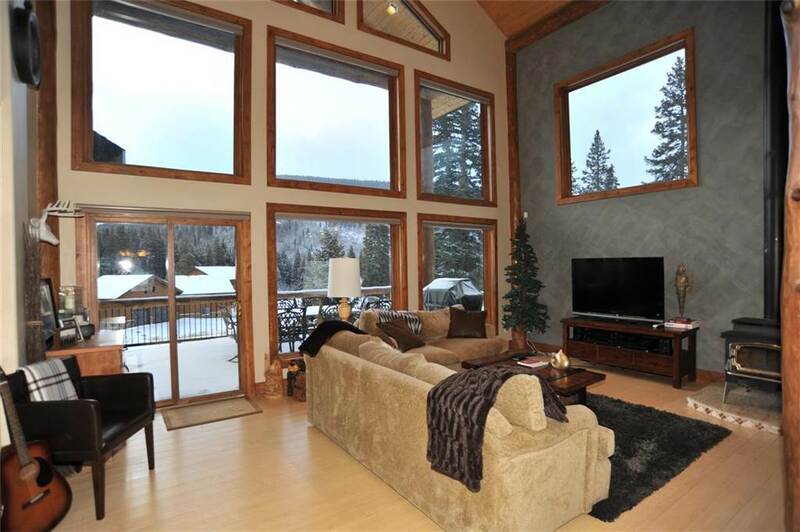 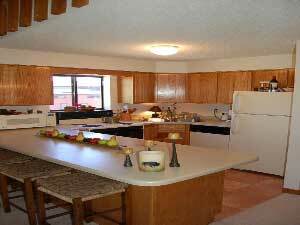 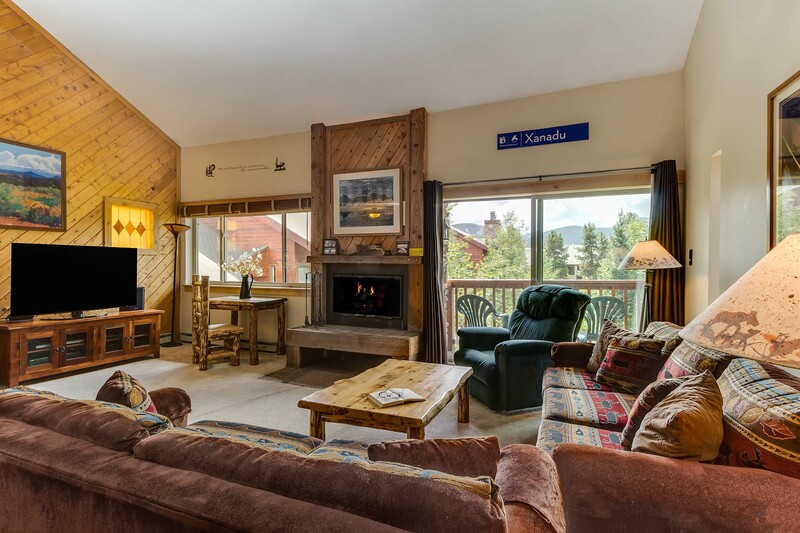 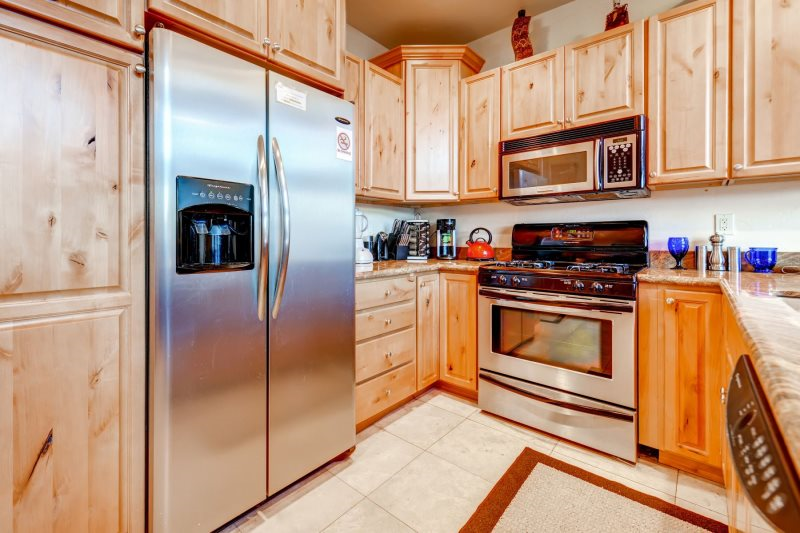 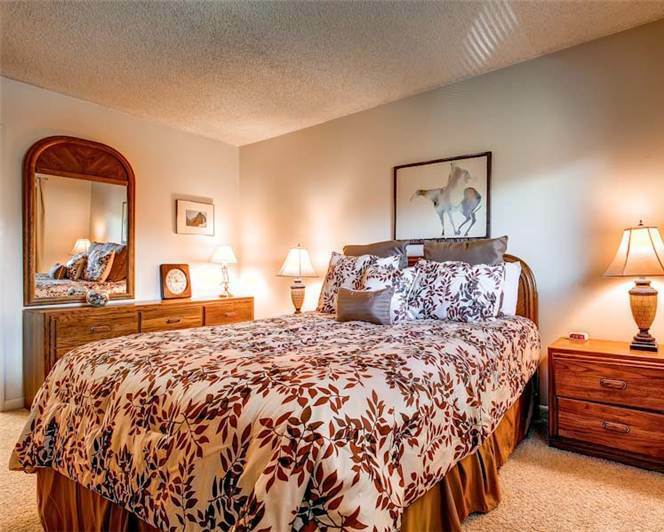 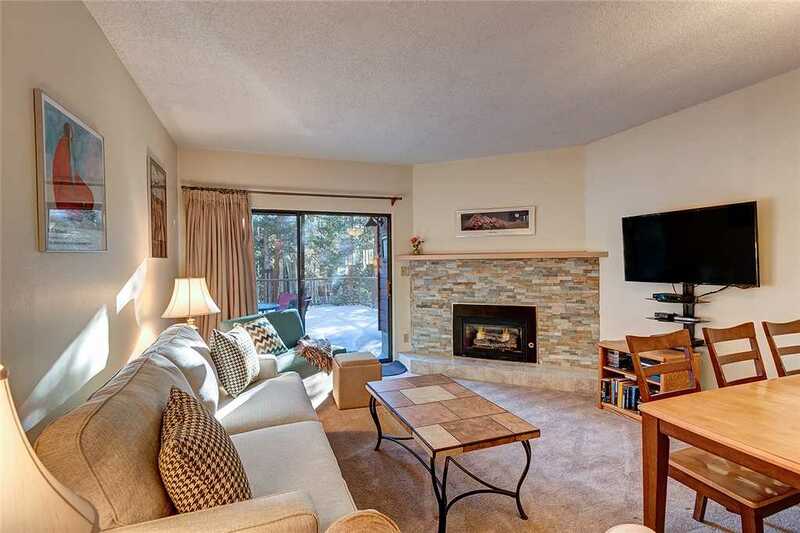 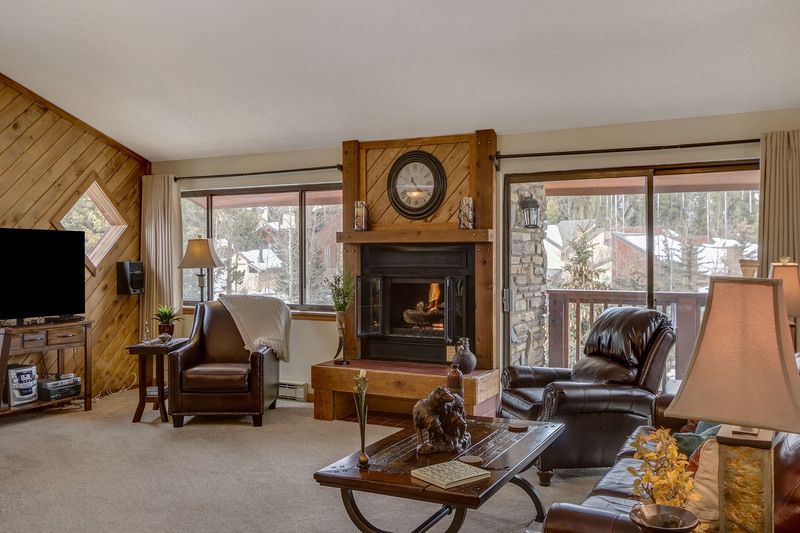 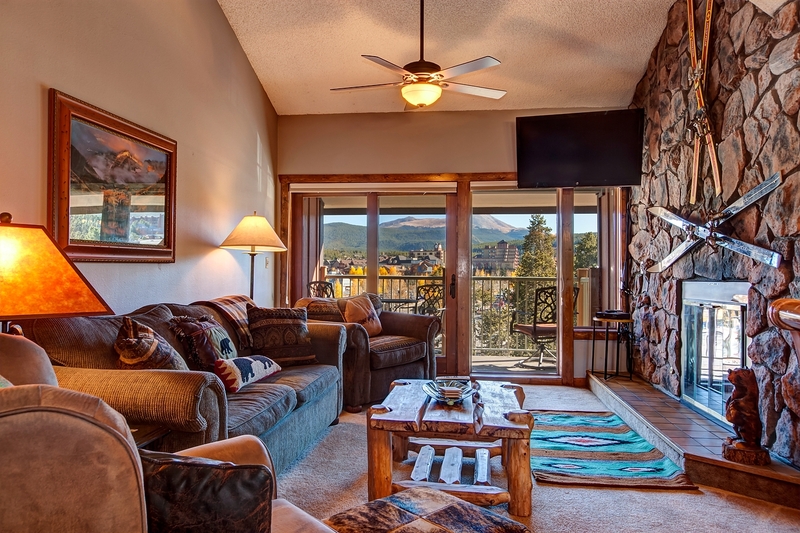 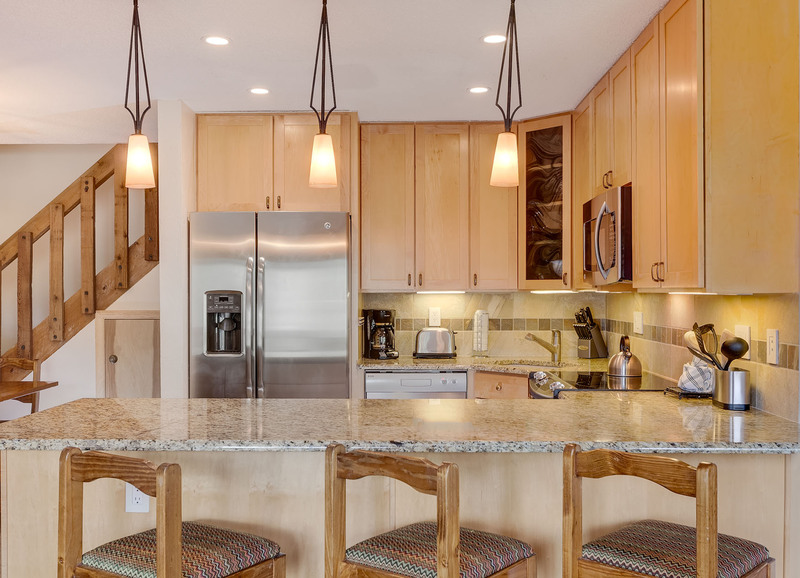 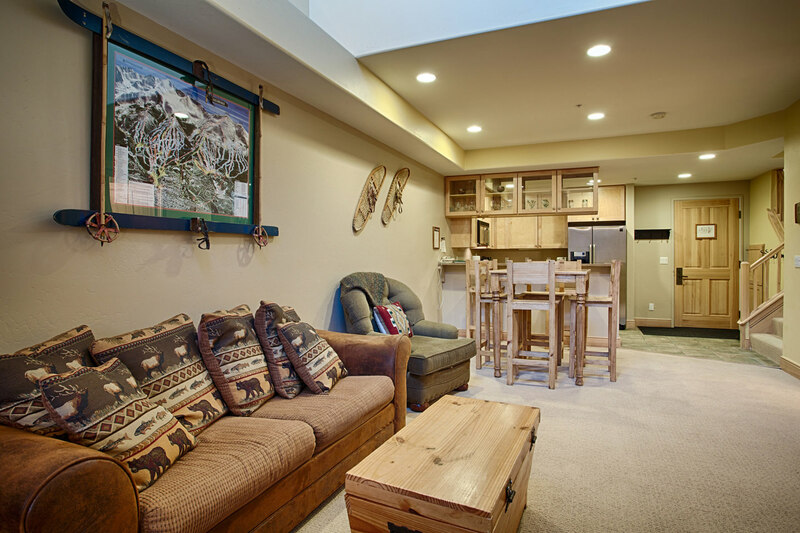 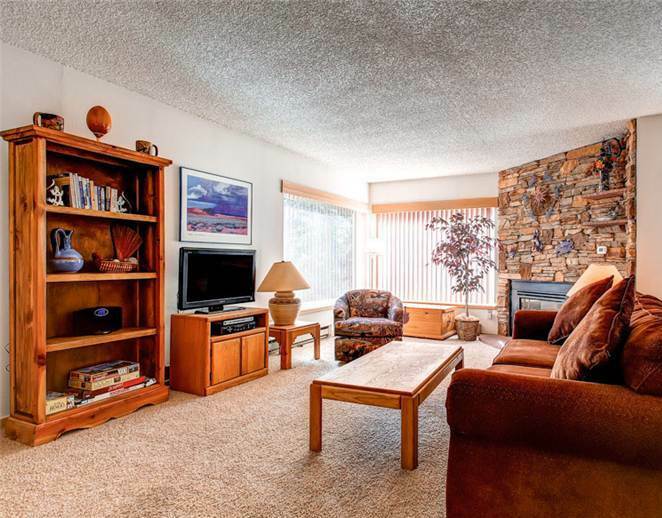 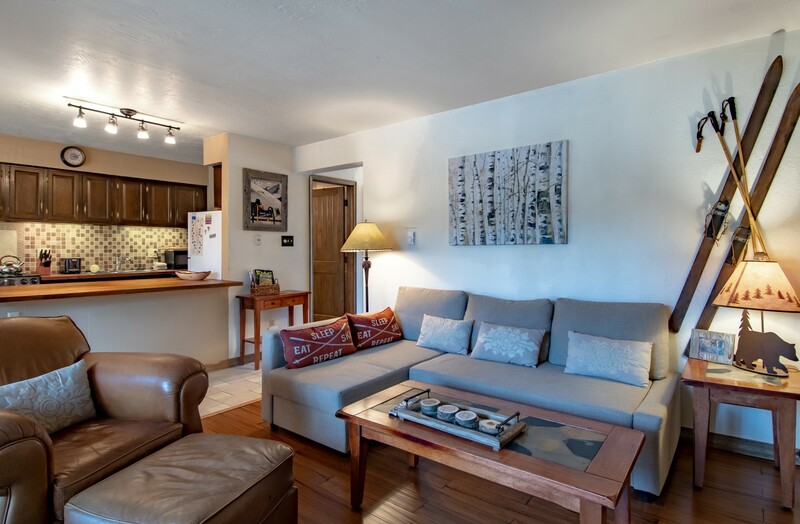 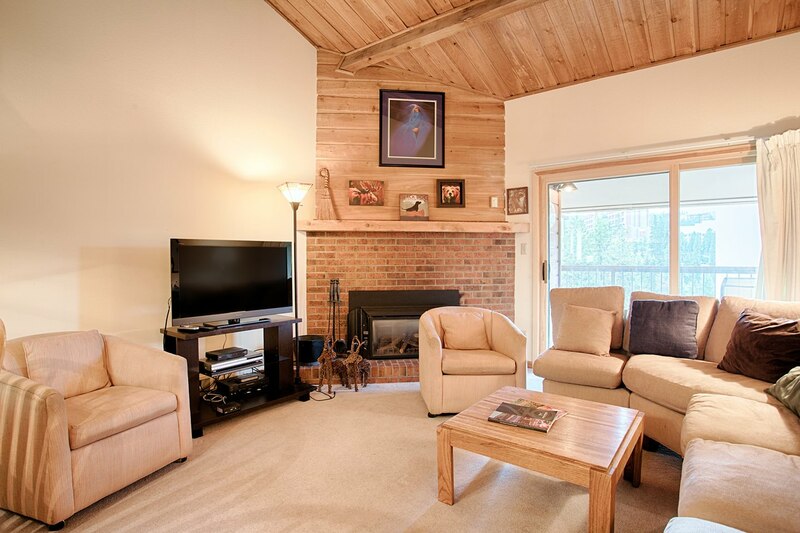 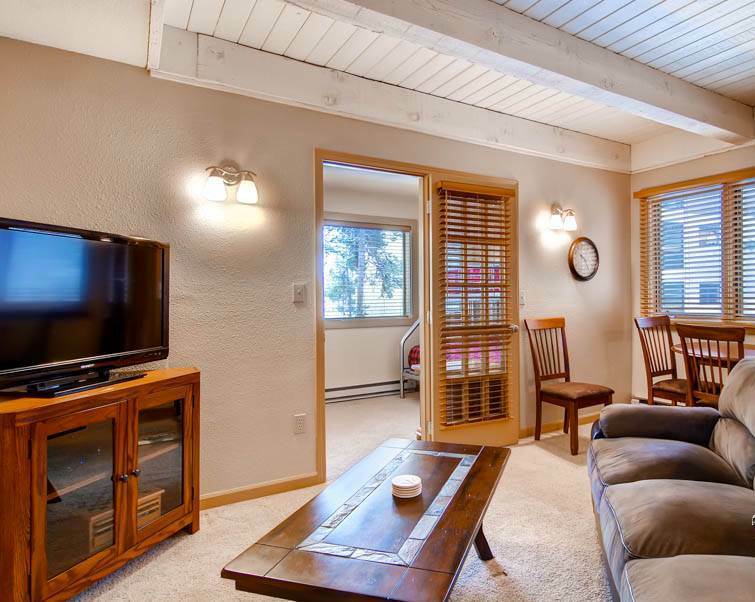 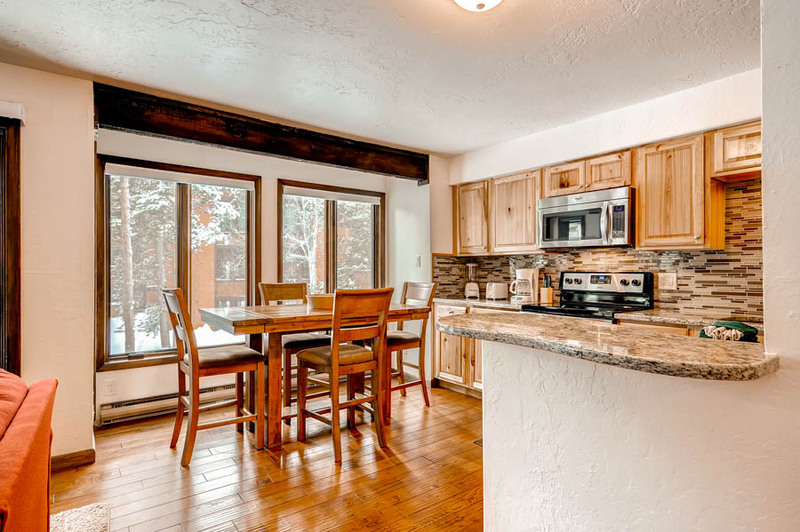 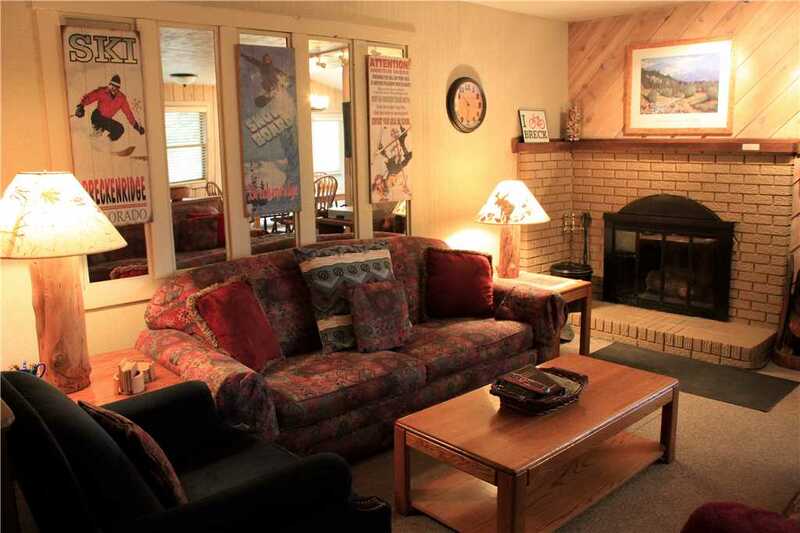 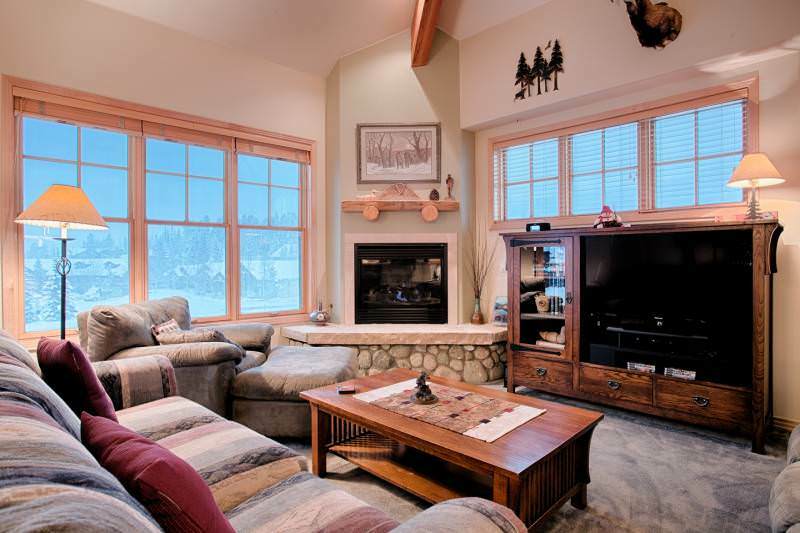 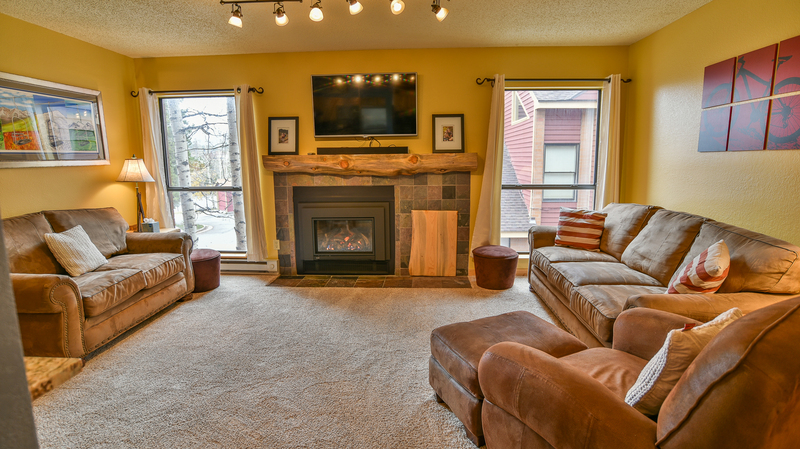 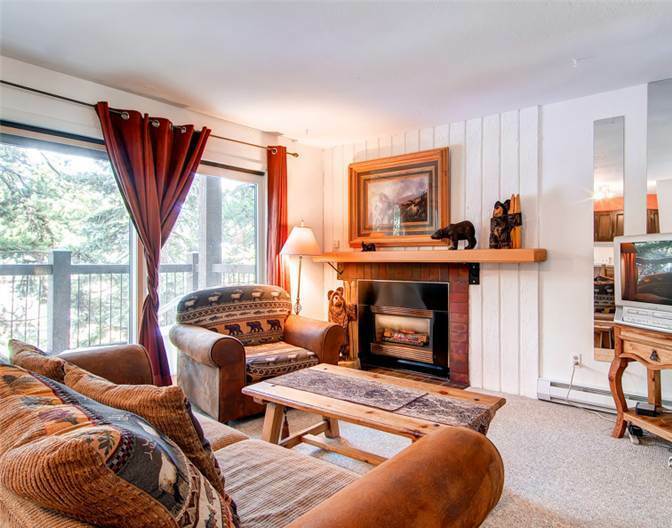 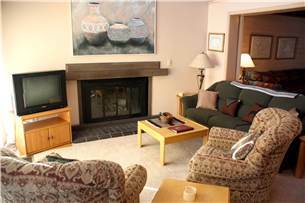 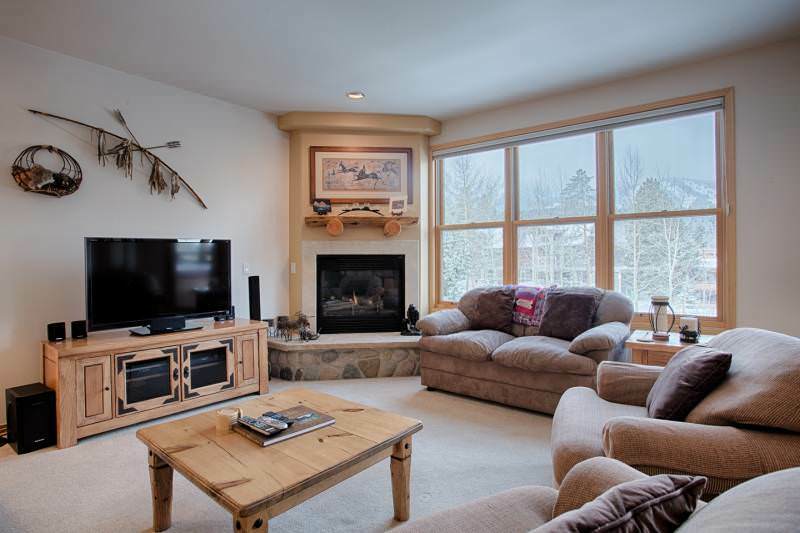 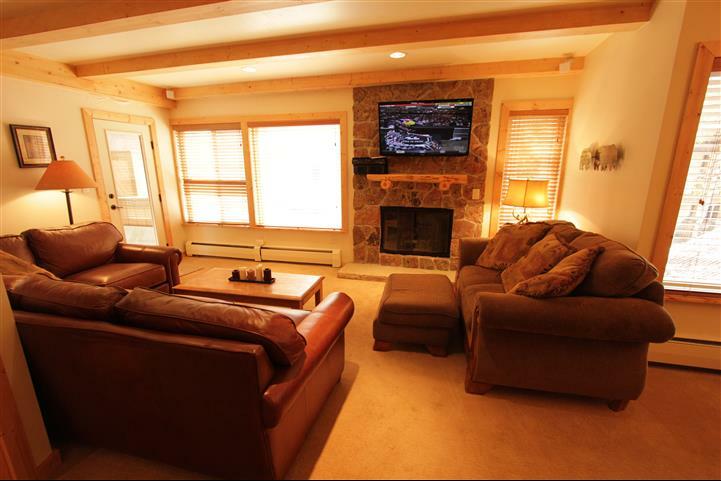 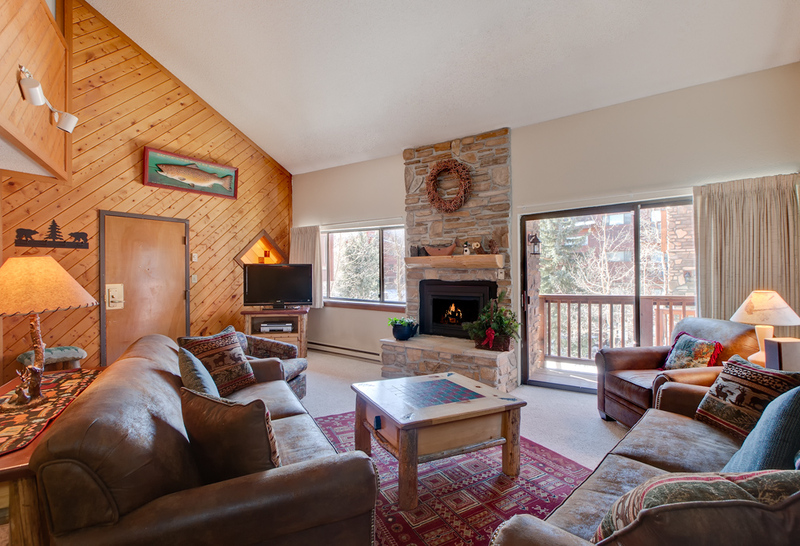 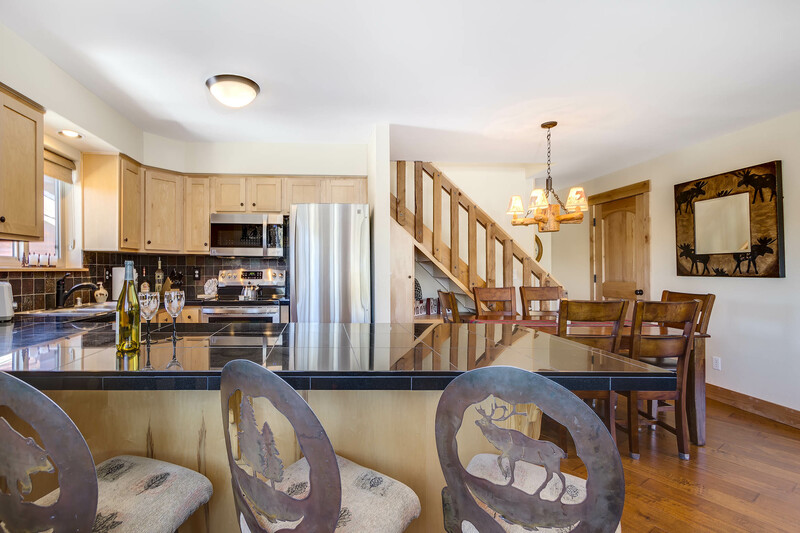 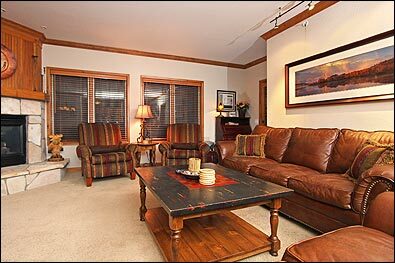 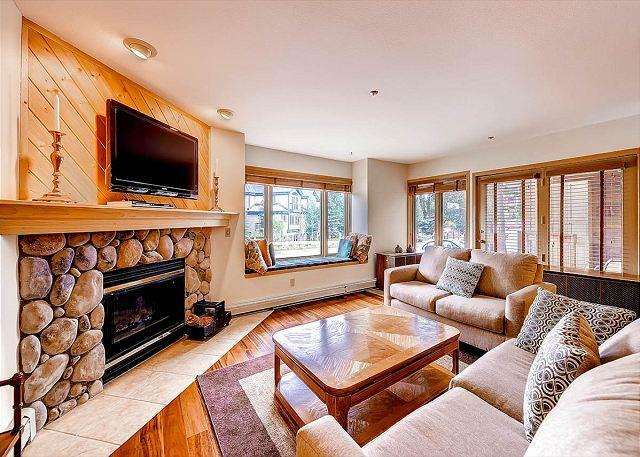 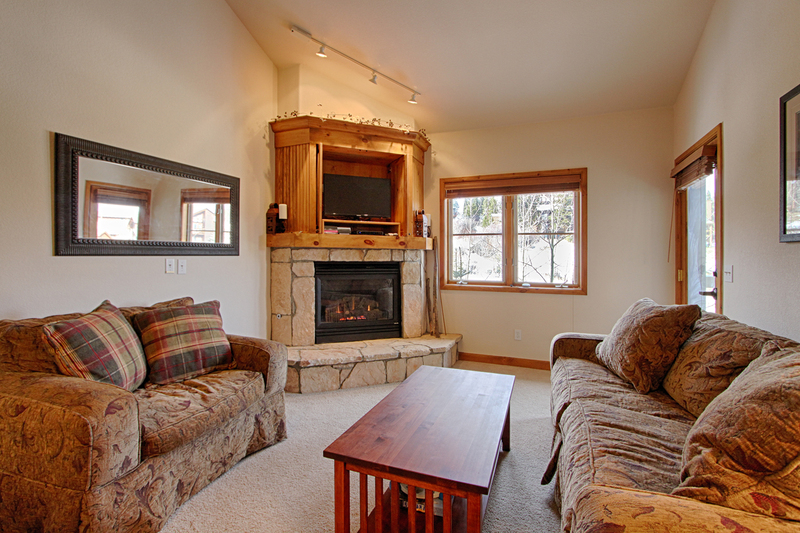 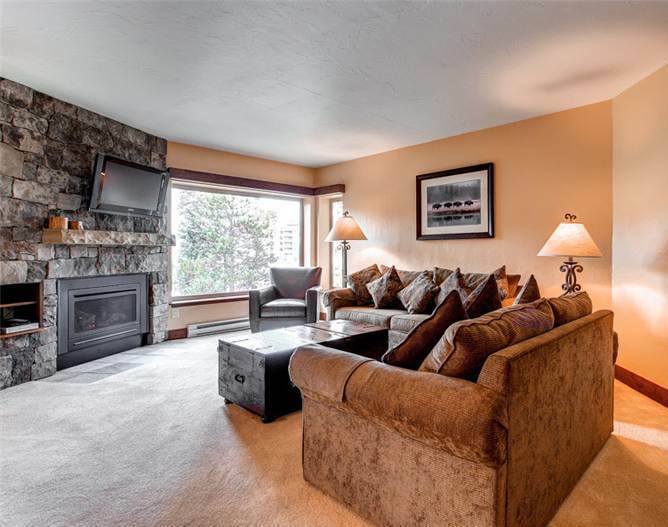 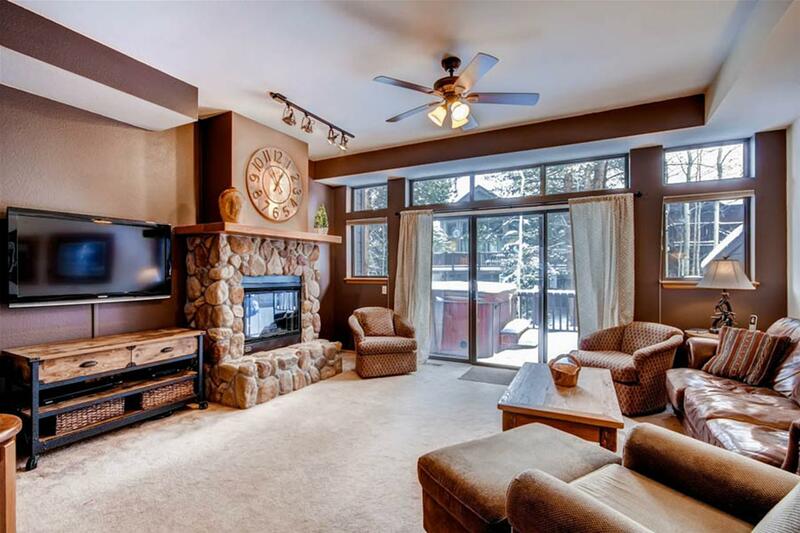 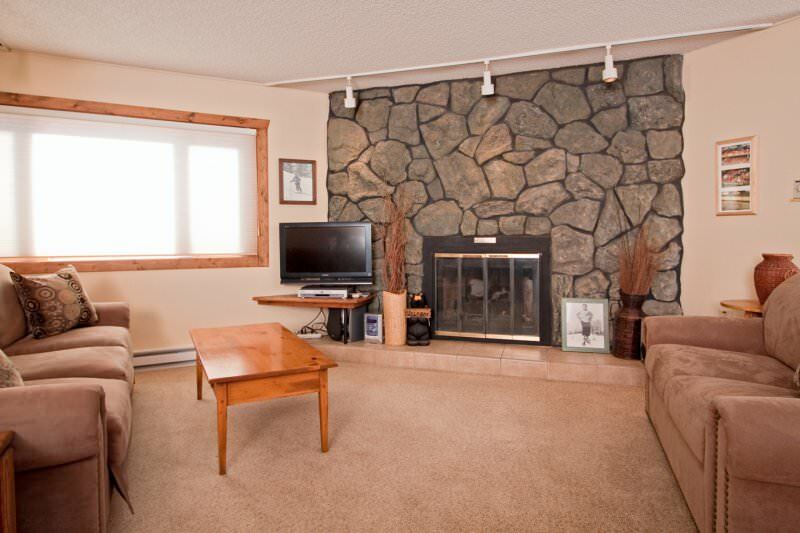 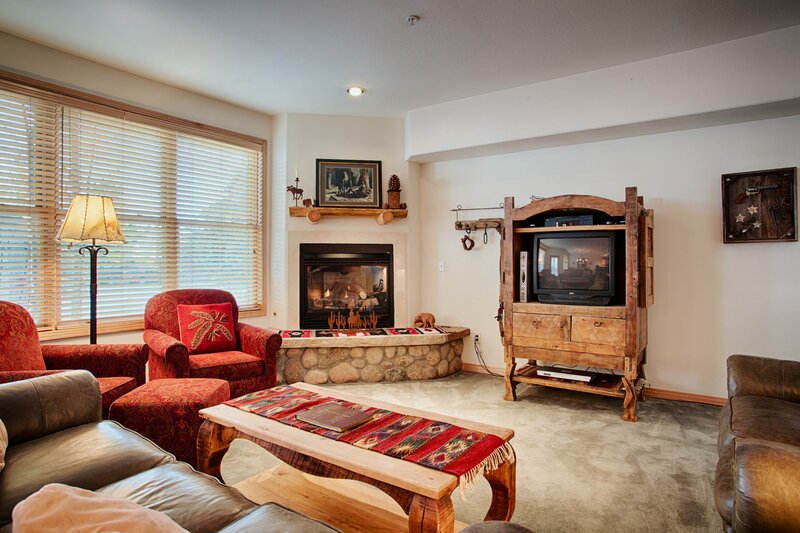 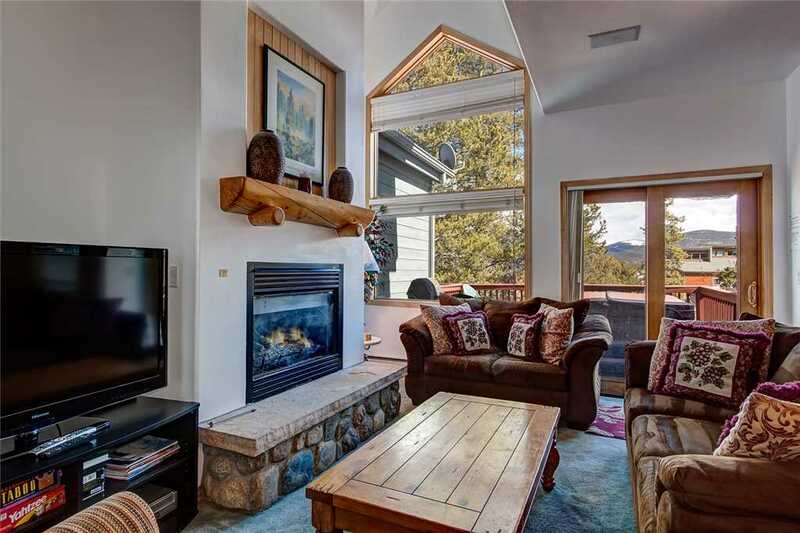 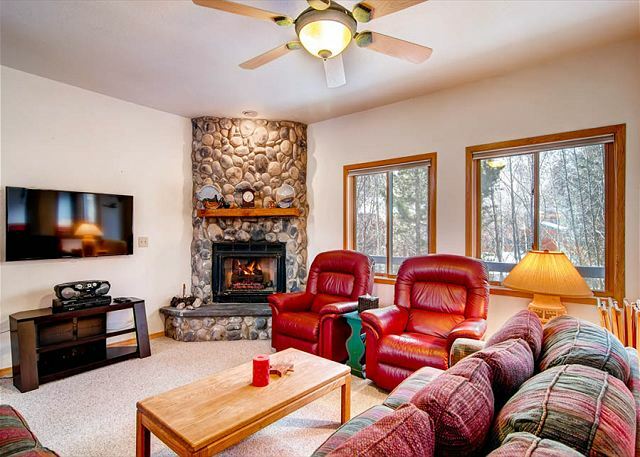 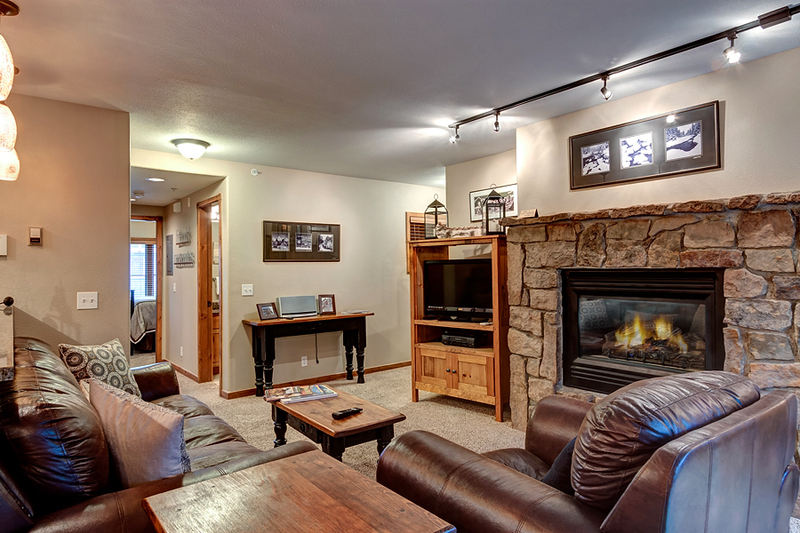 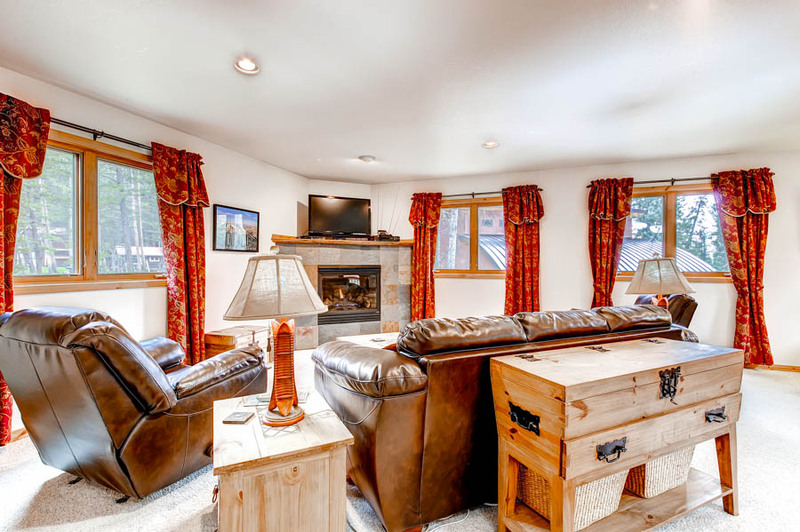 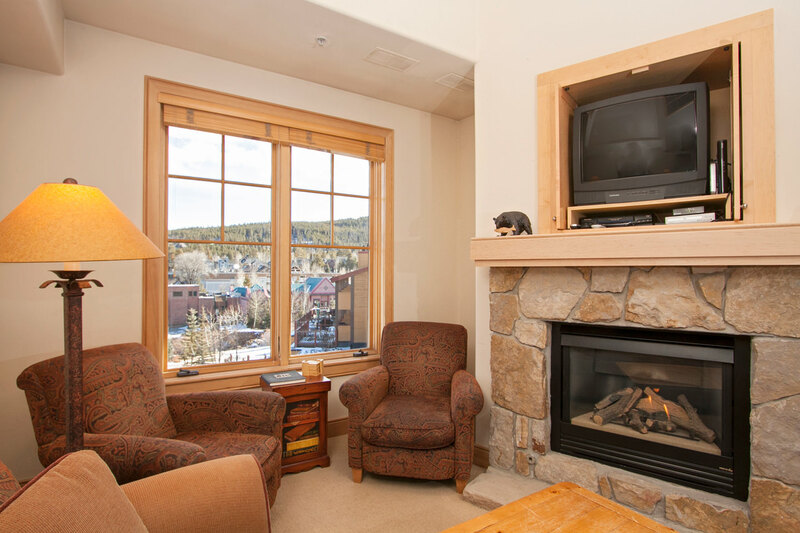 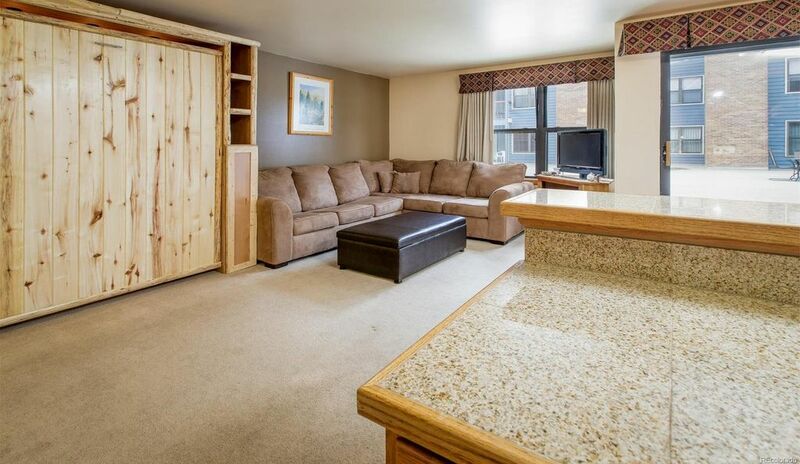 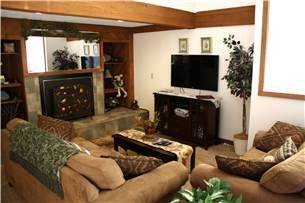 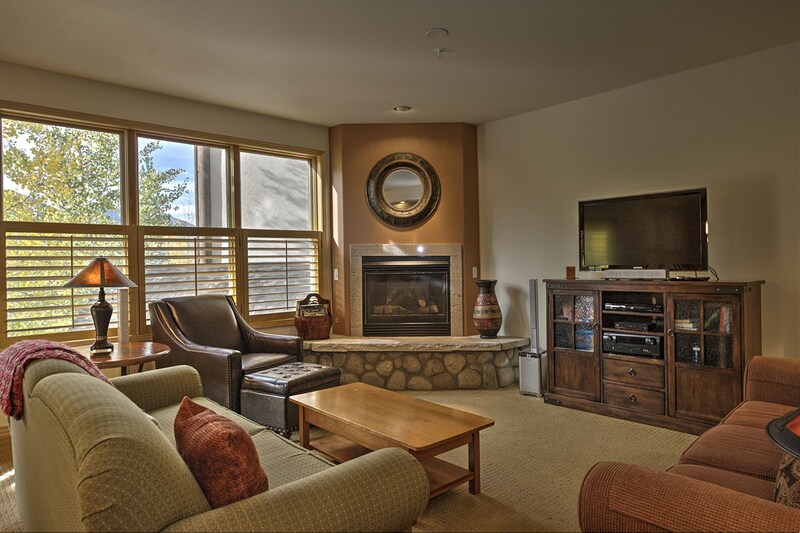 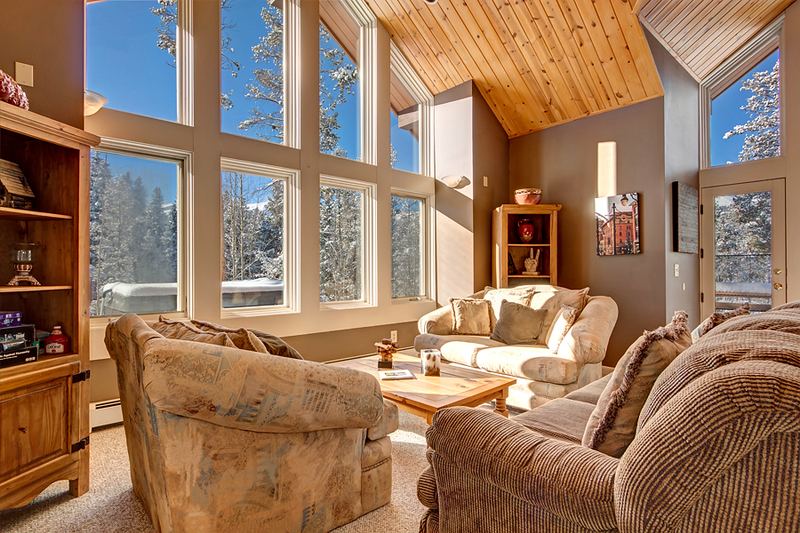 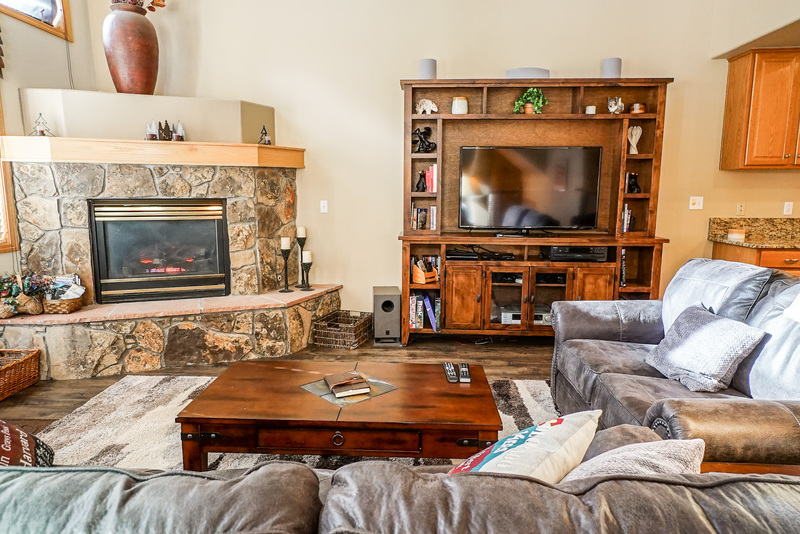 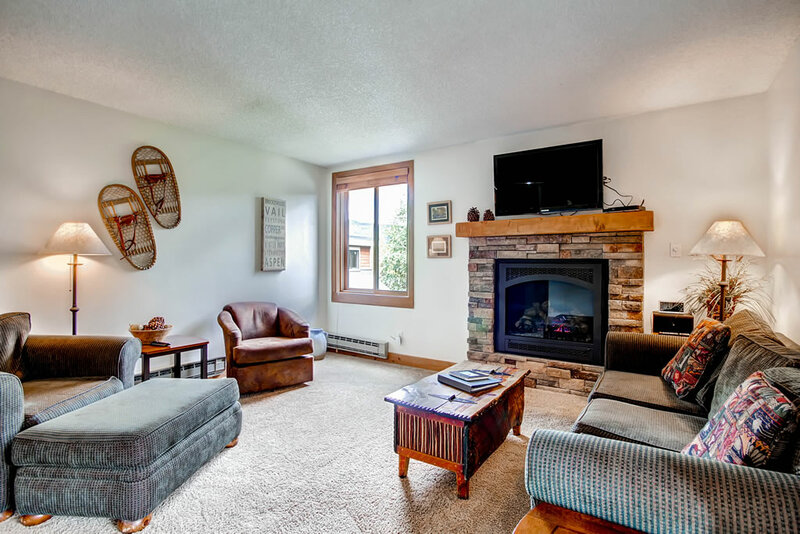 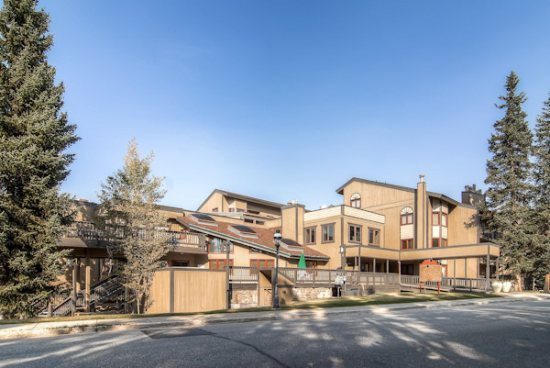 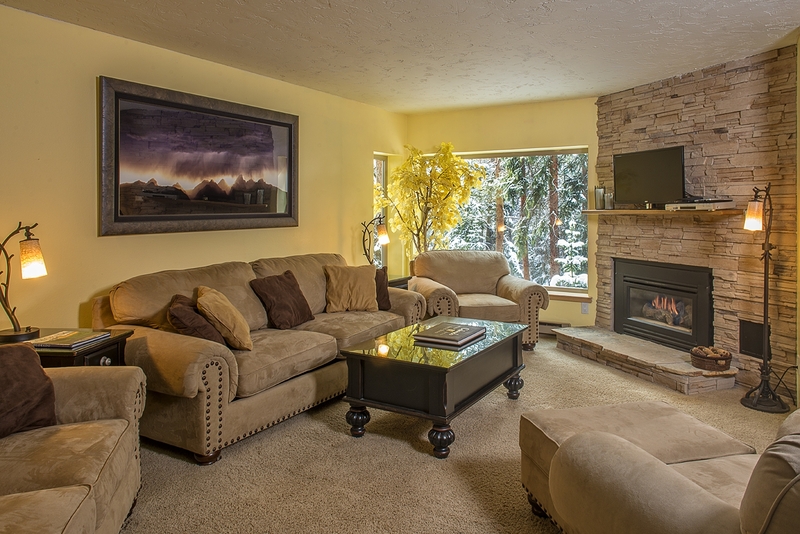 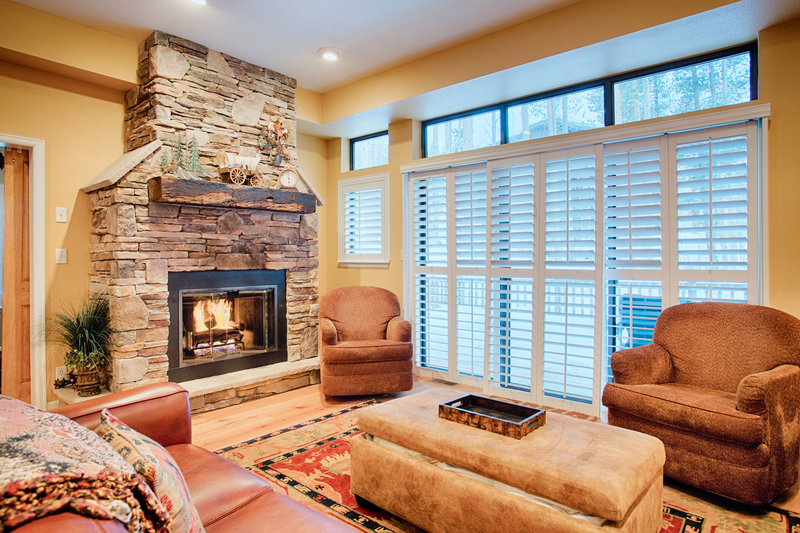 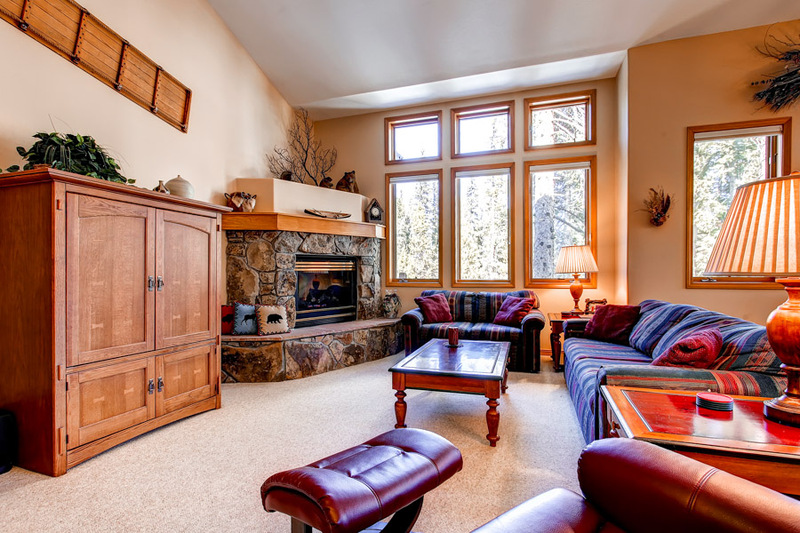 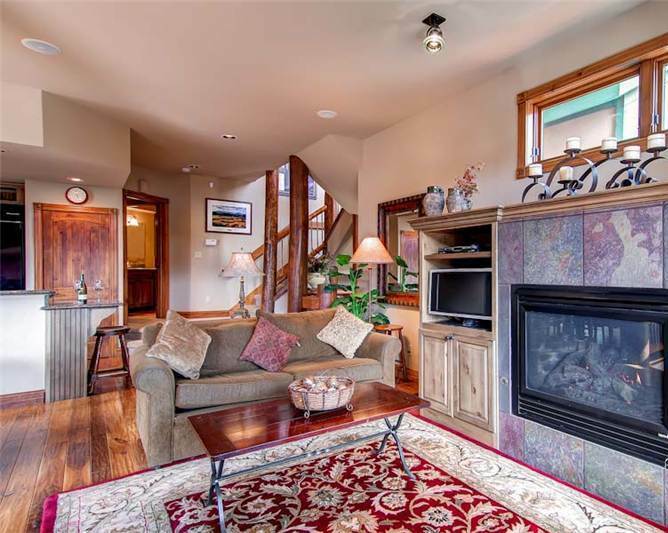 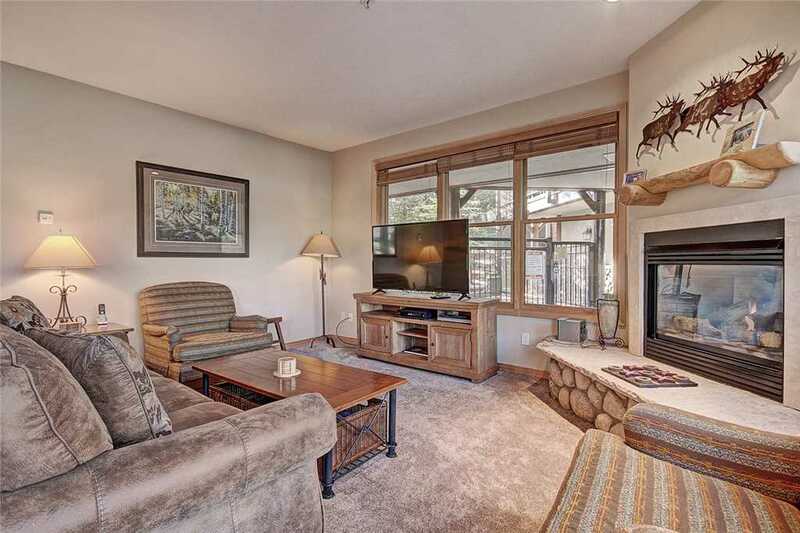 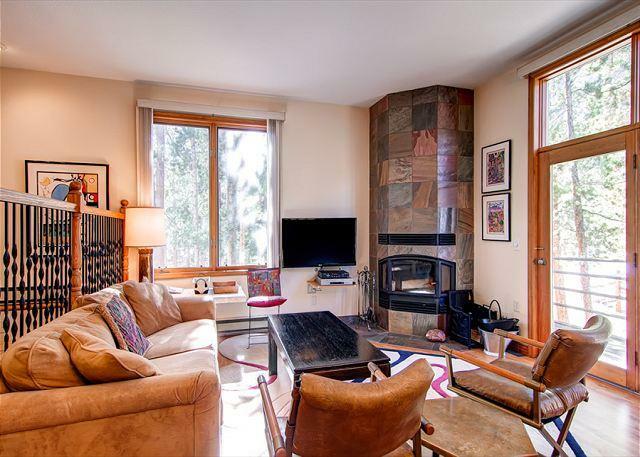 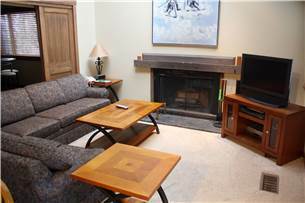 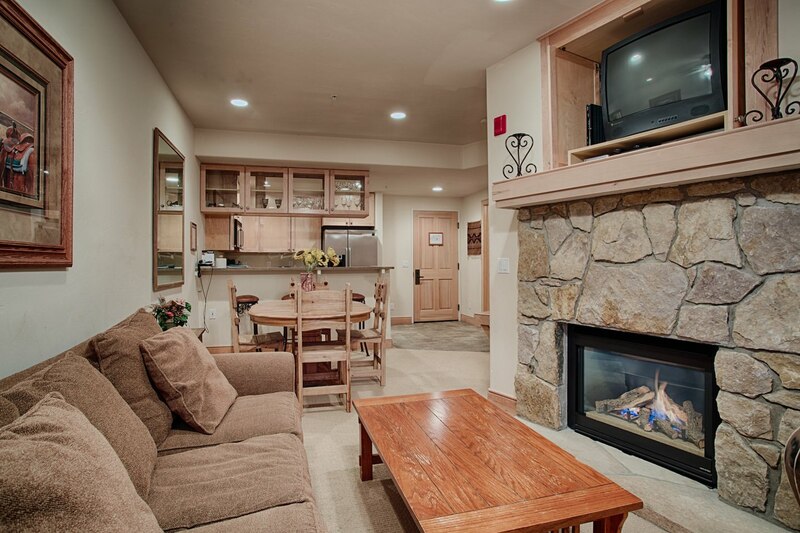 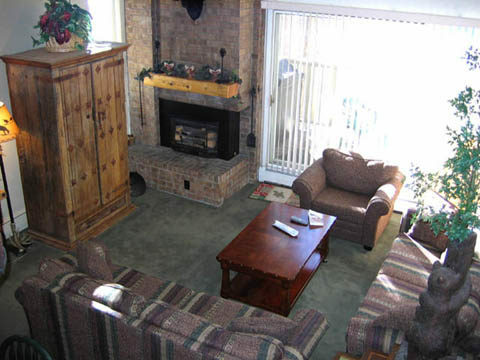 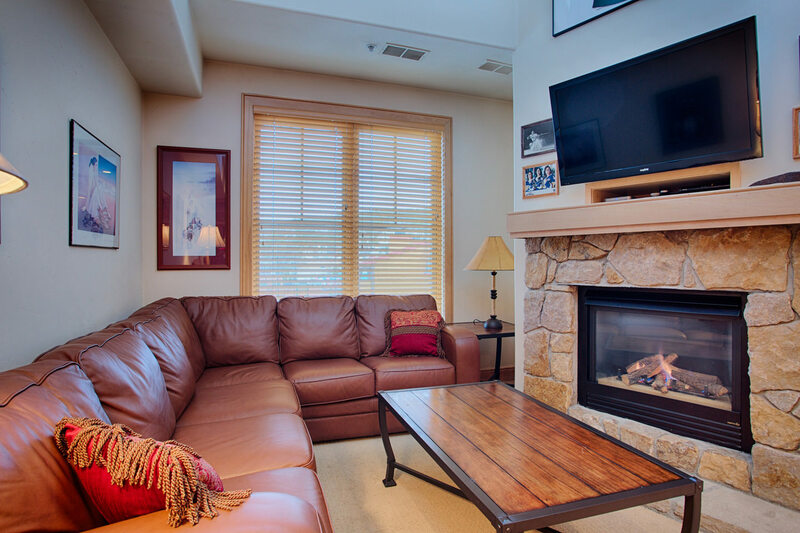 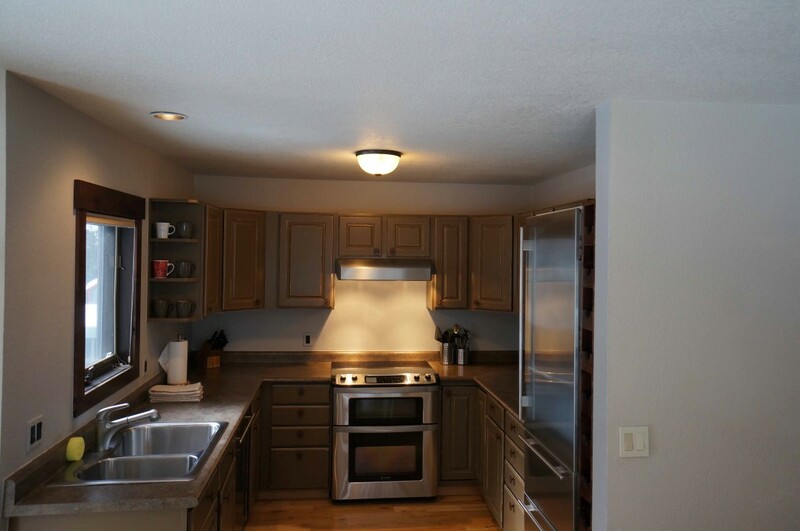 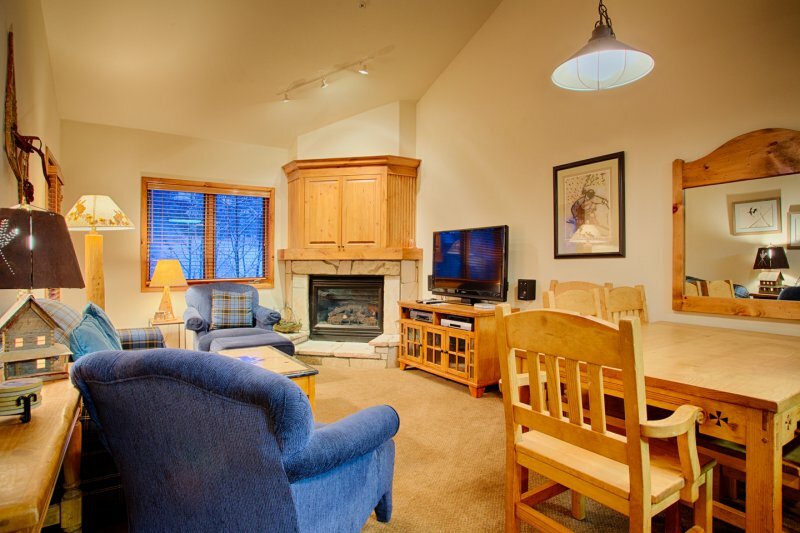 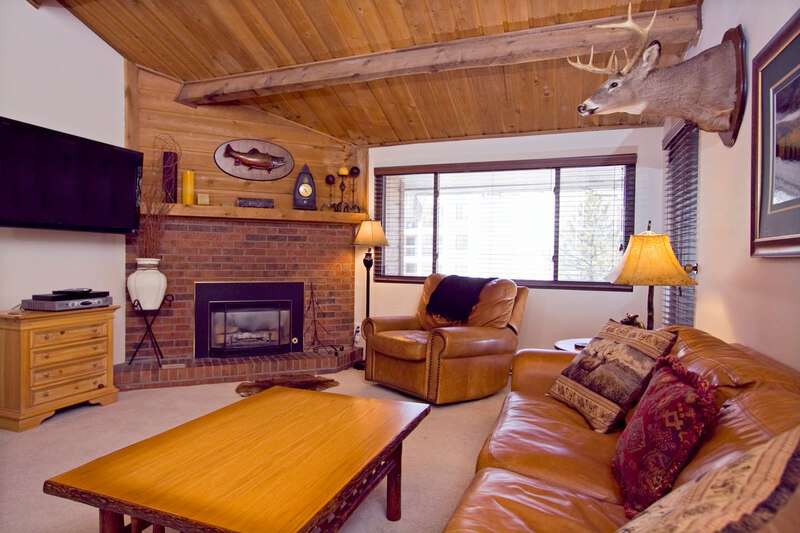 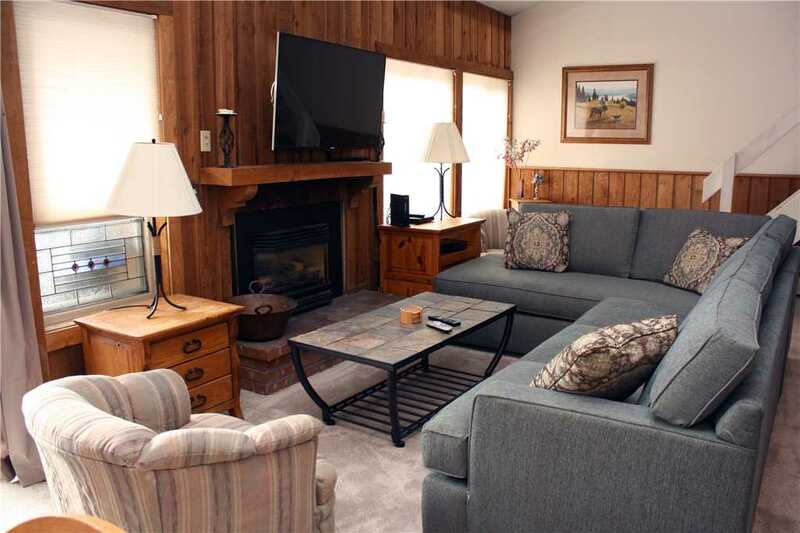 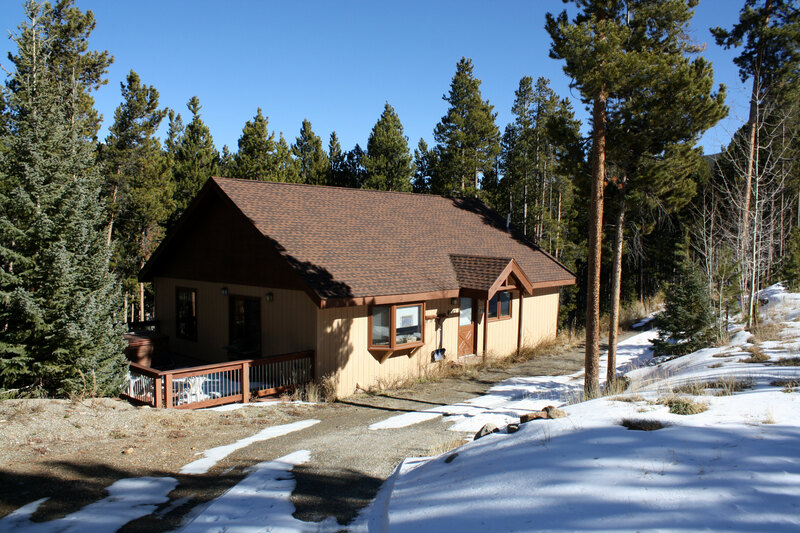 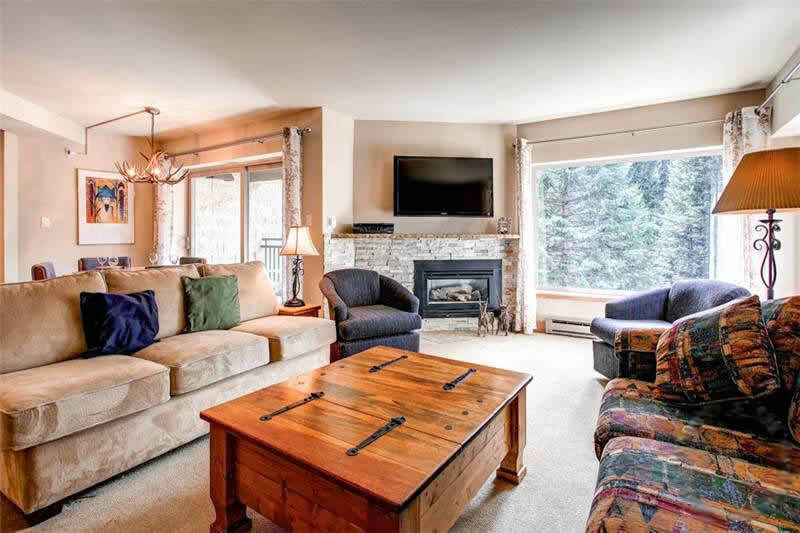 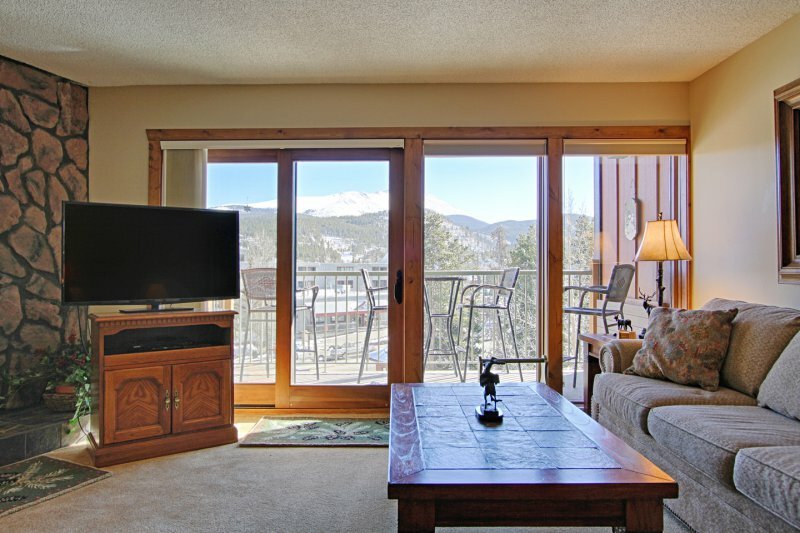 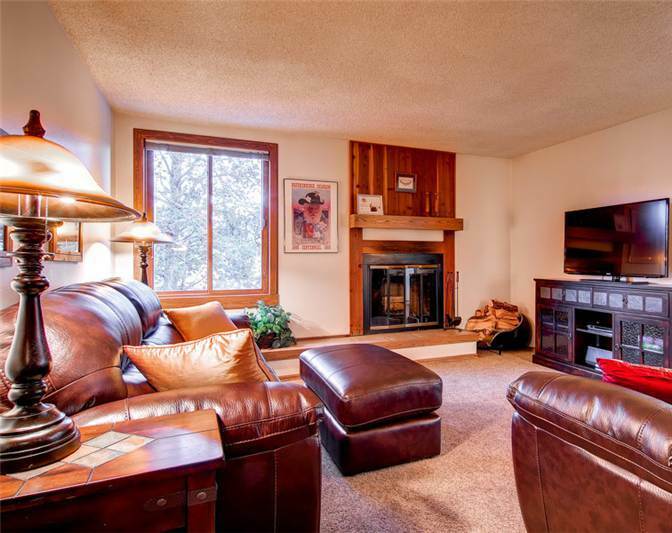 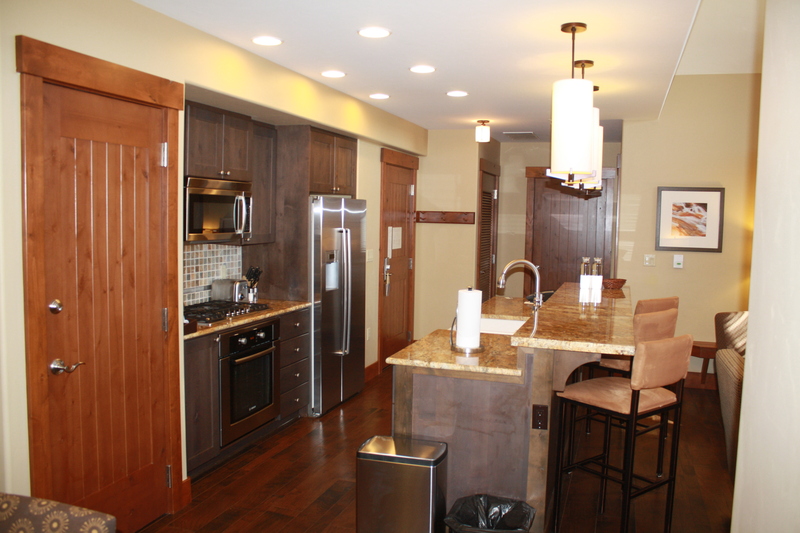 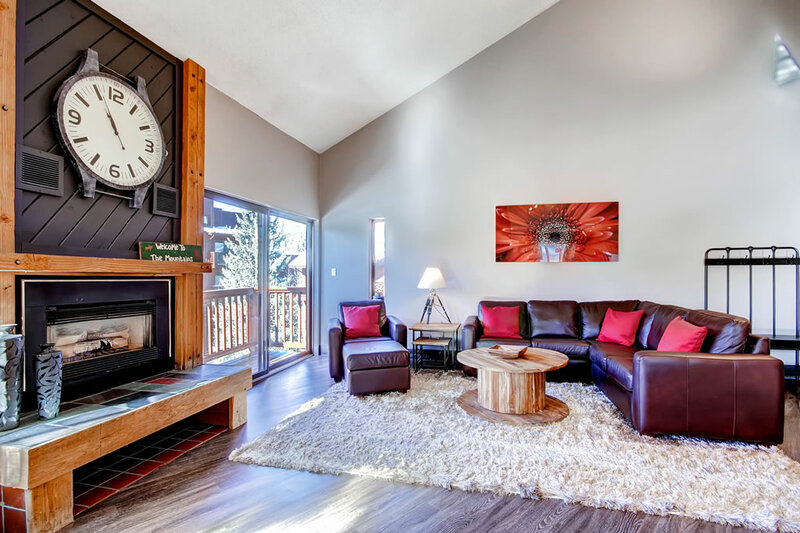 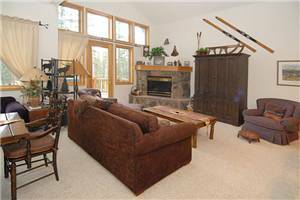 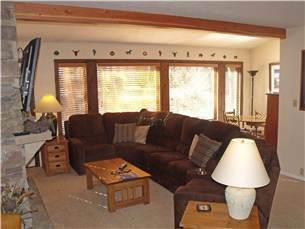 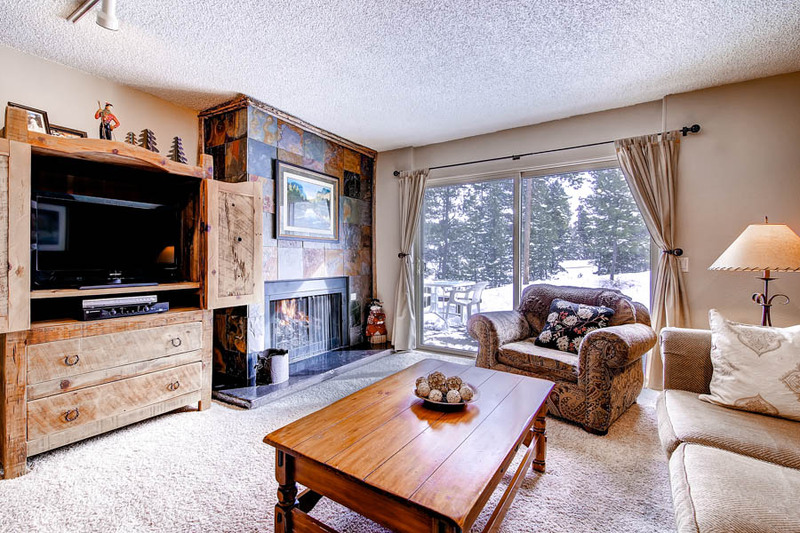 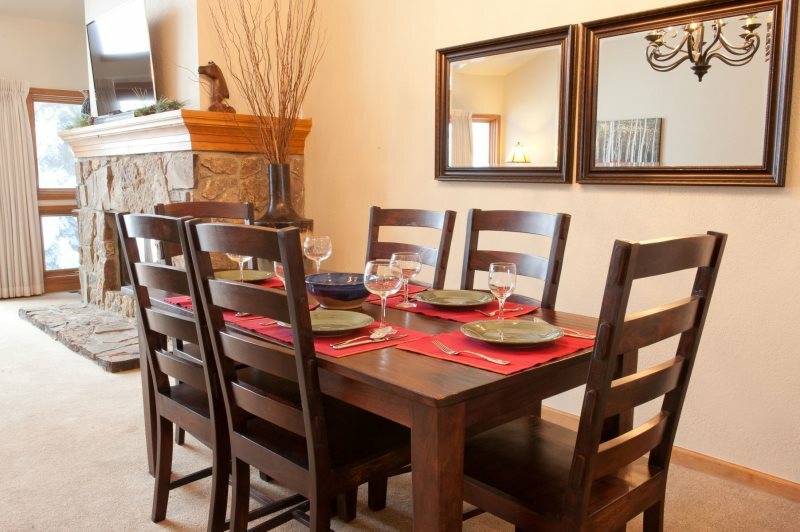 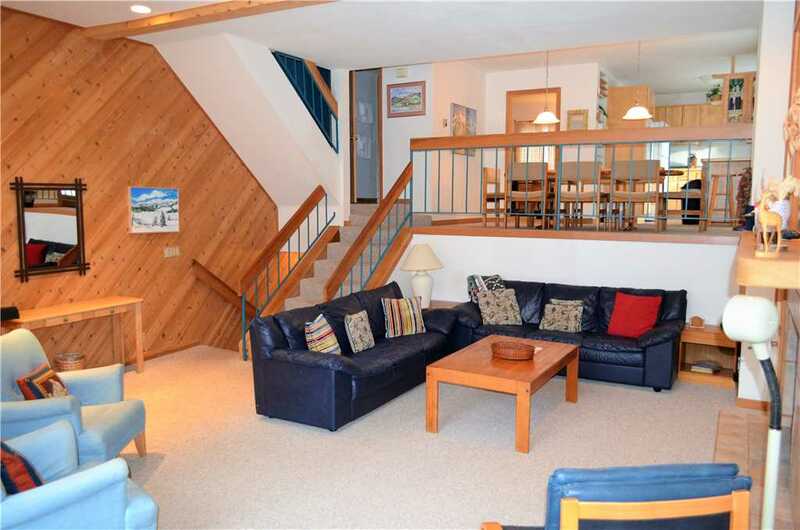 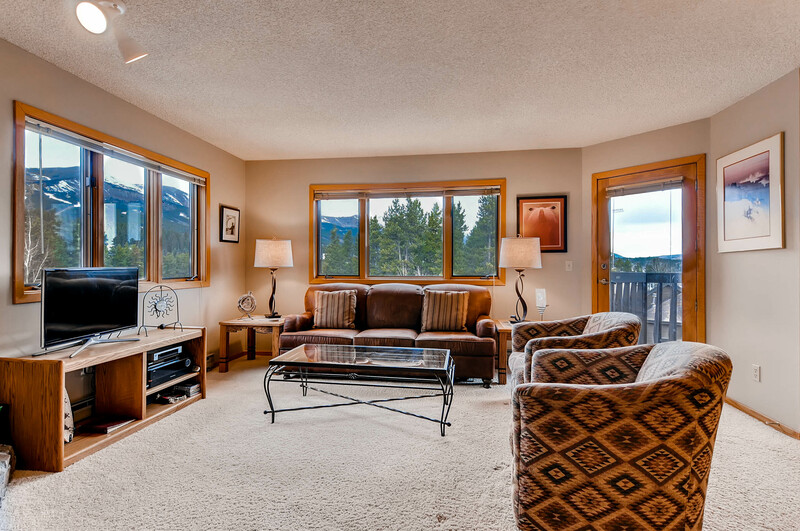 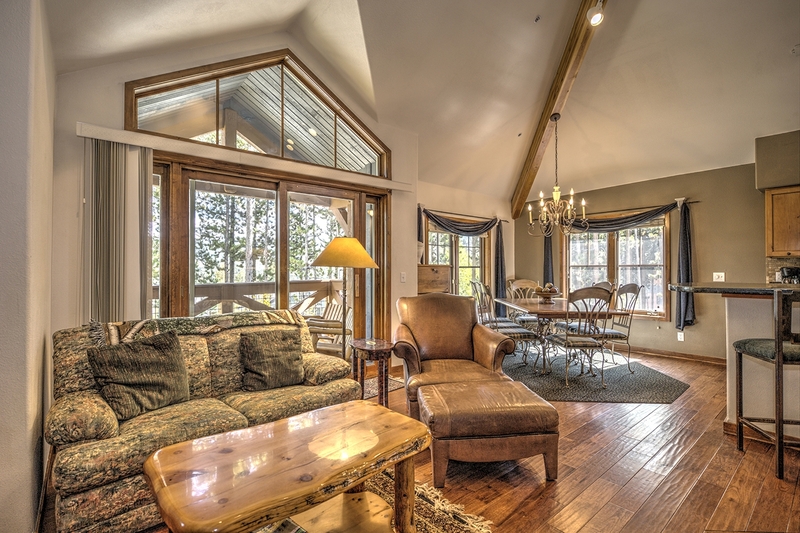 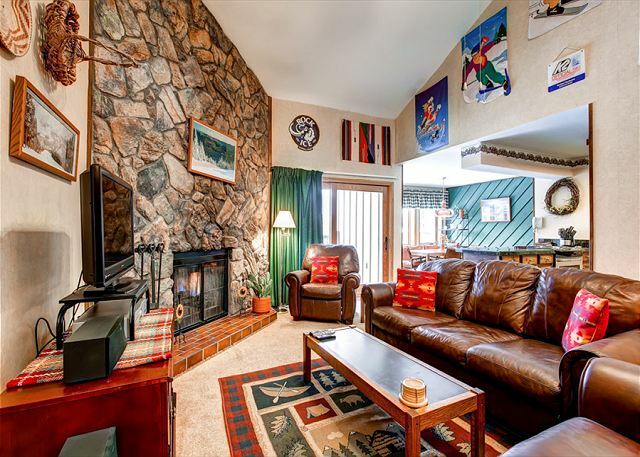 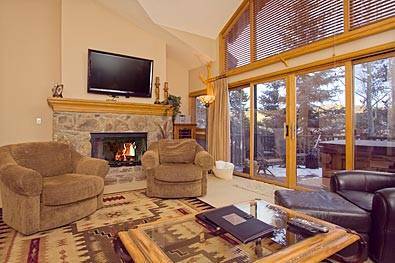 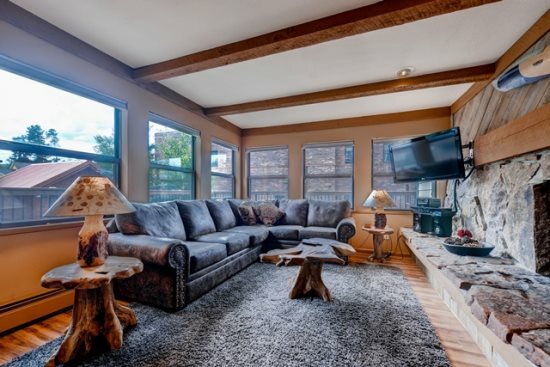 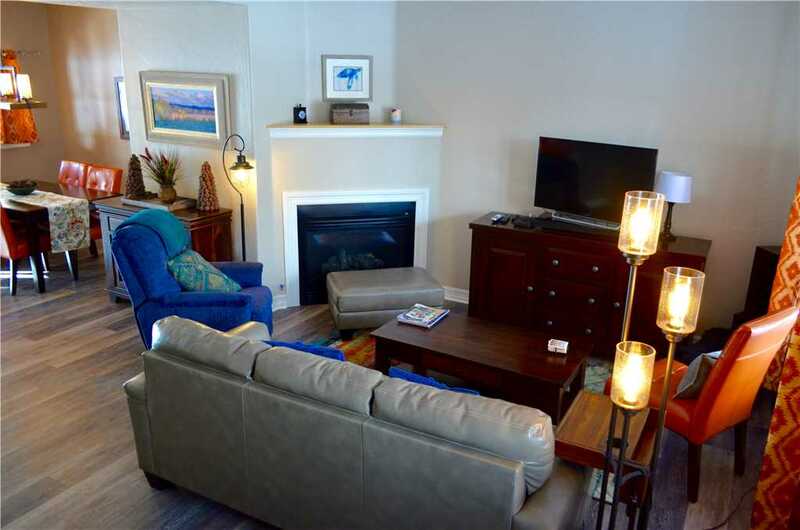 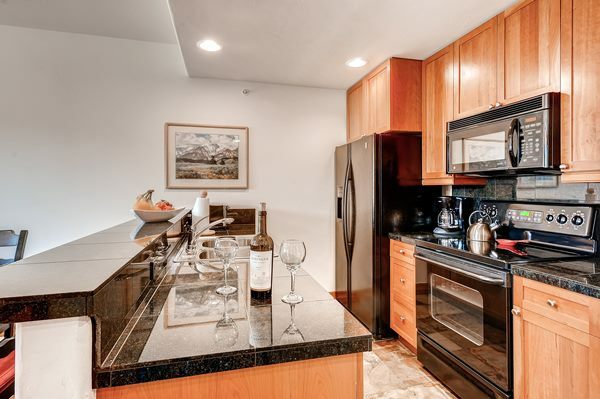 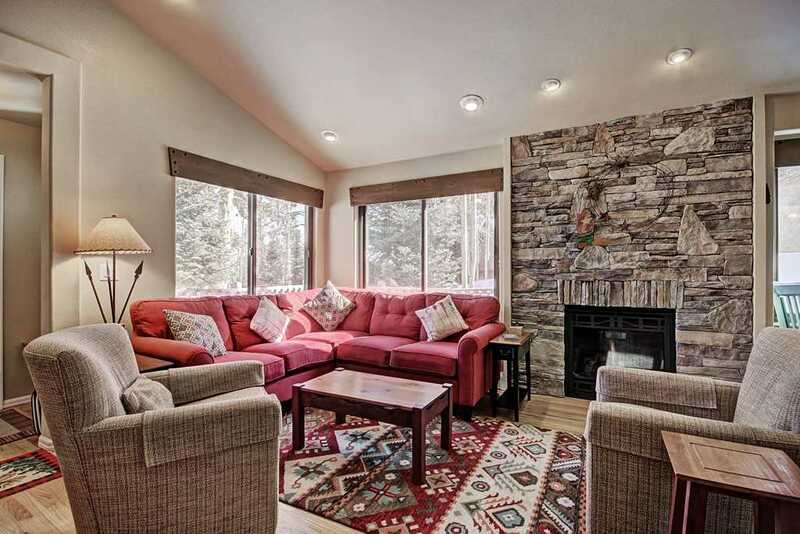 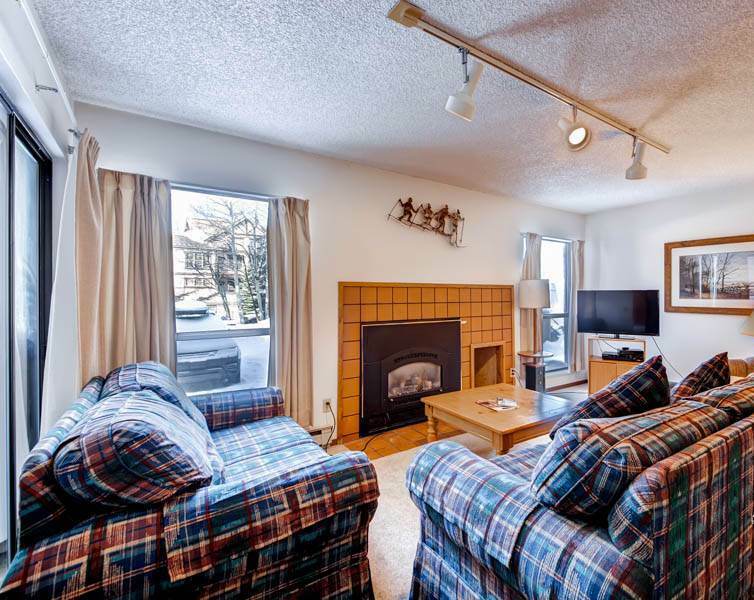 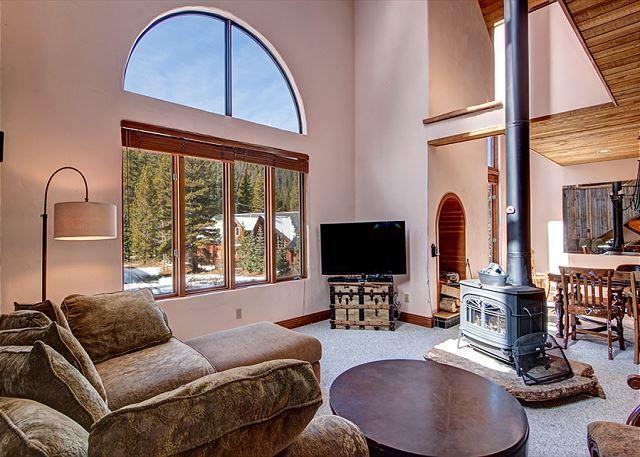 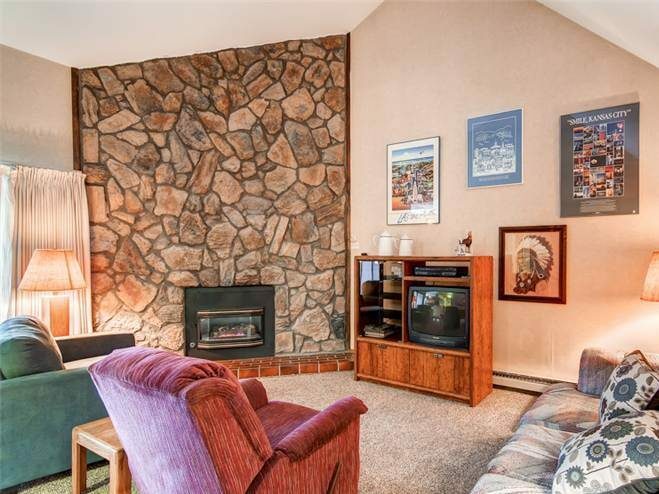 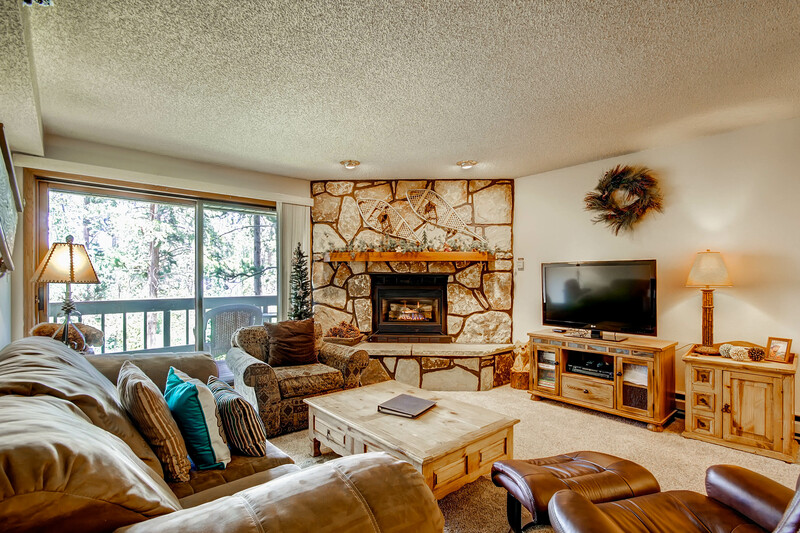 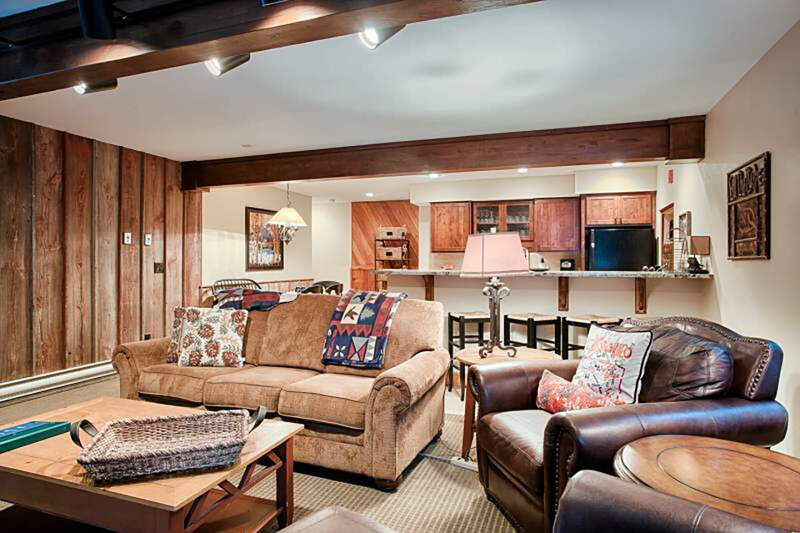 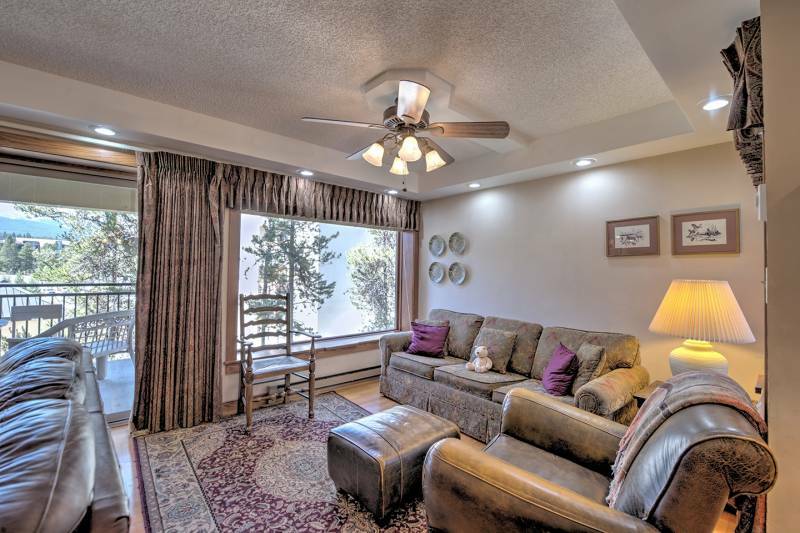 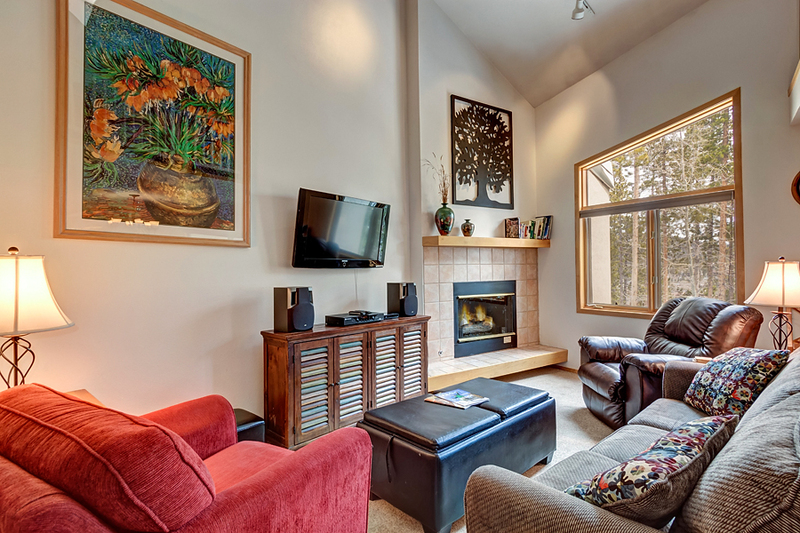 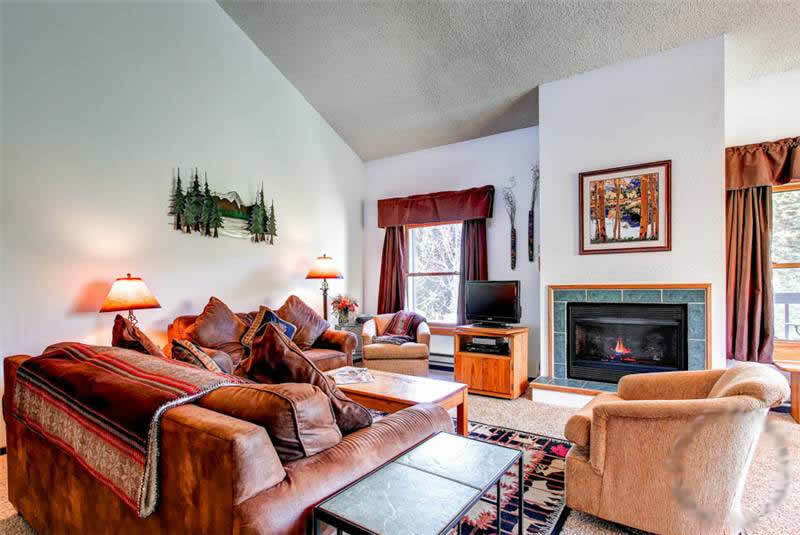 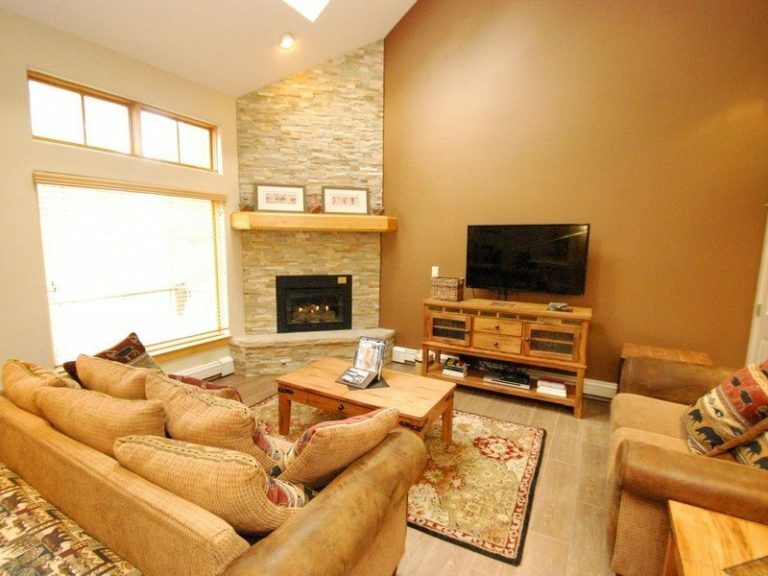 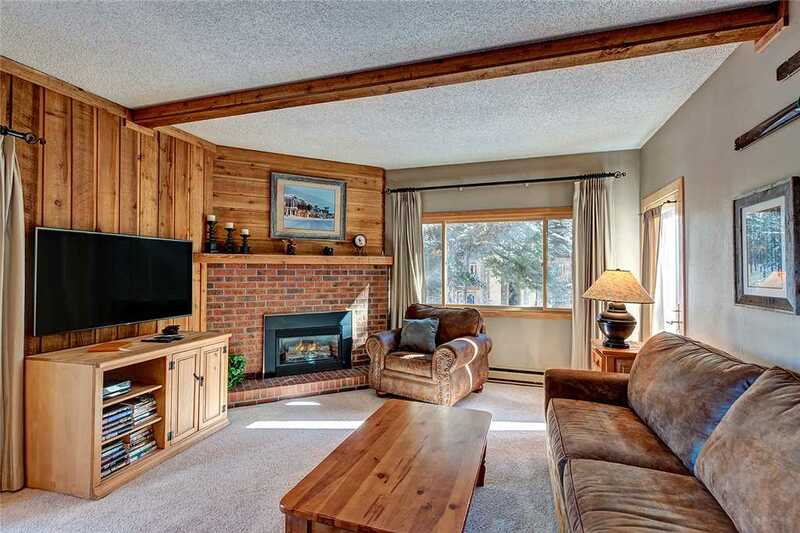 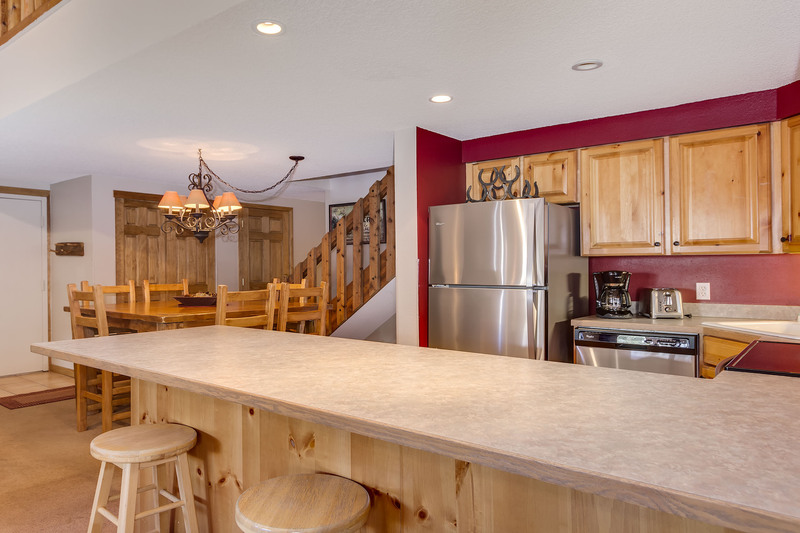 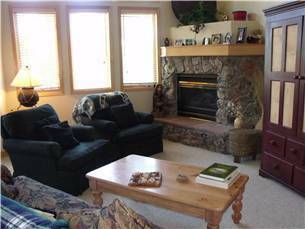 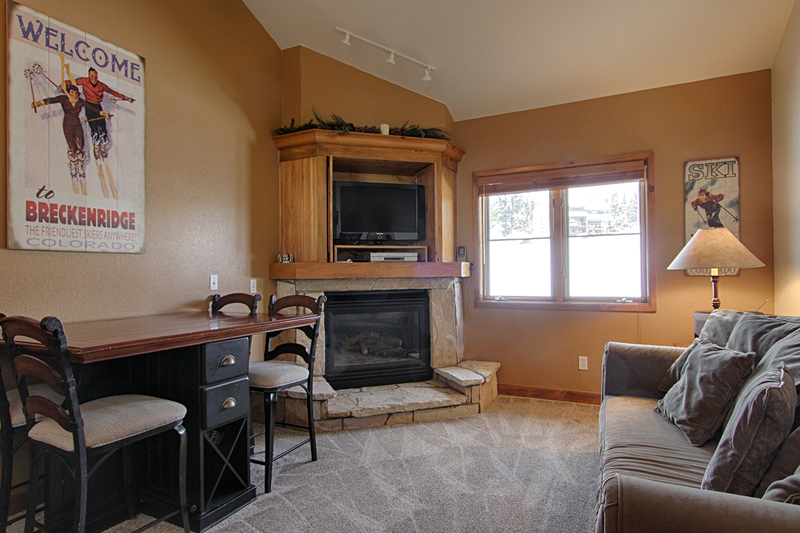 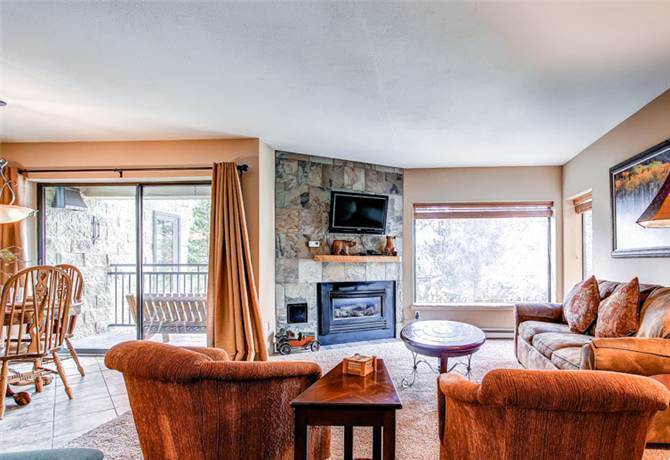 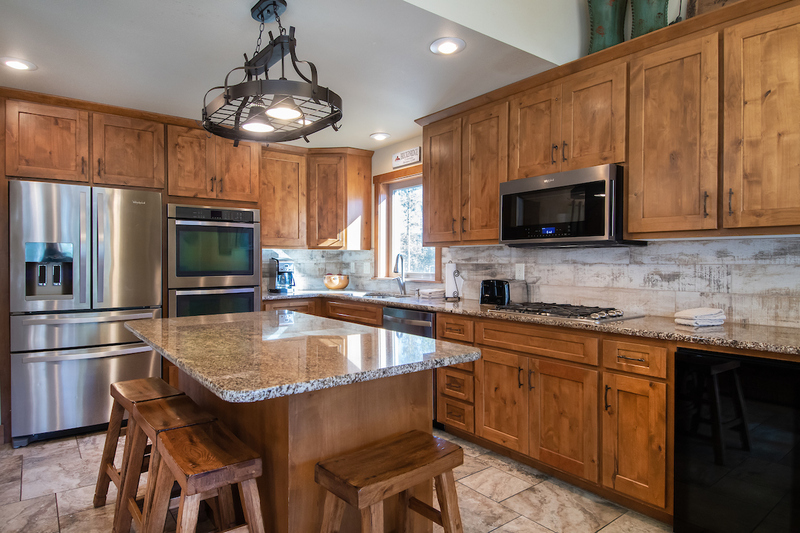 LOCATION – This townhome is located in the Charter Ridge complex above the picturesque town of Breckenridge on Baldy Mountain. 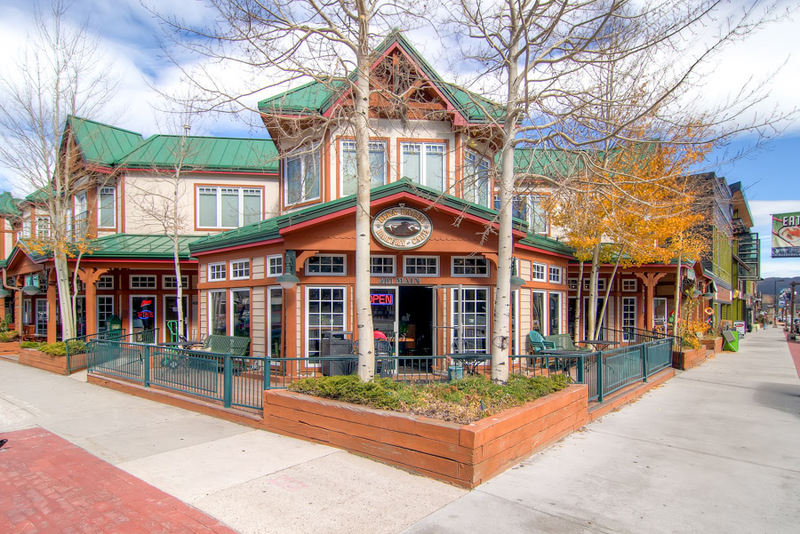 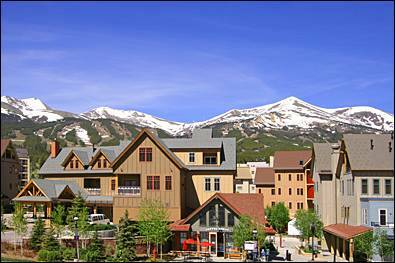 The free shuttle is located nearby that gives you access not only to Breckenridge but the surrounding Summit County area. 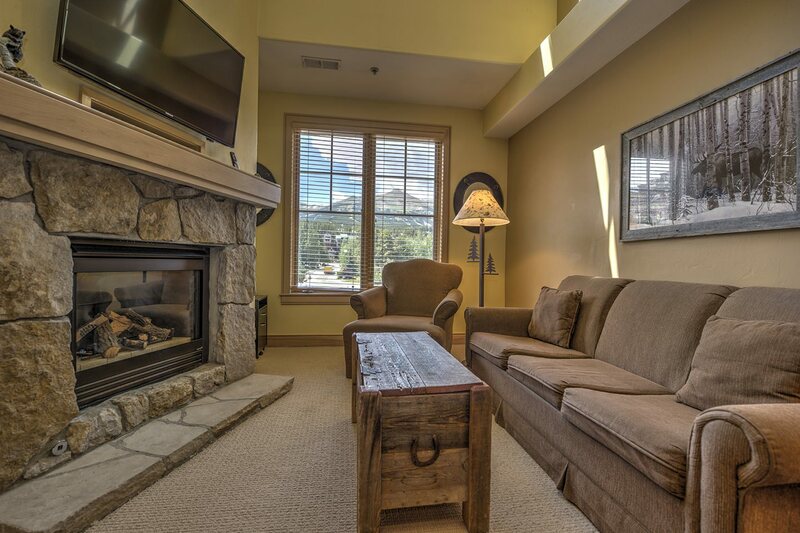 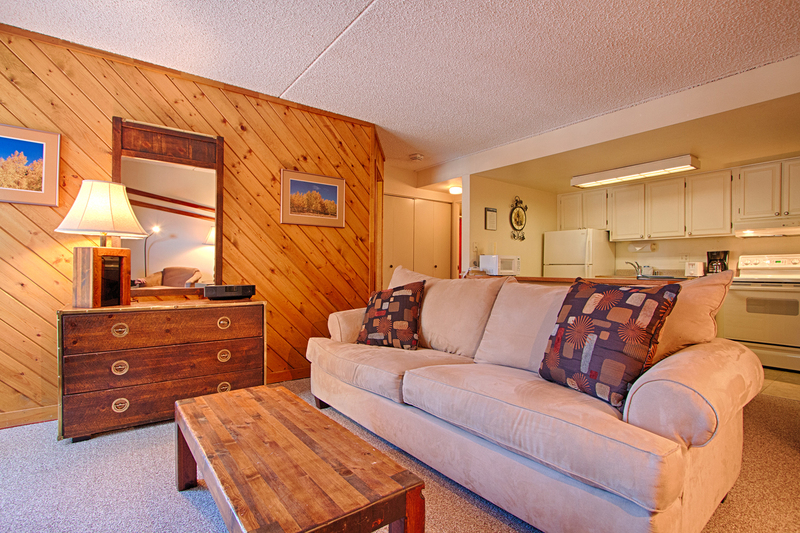 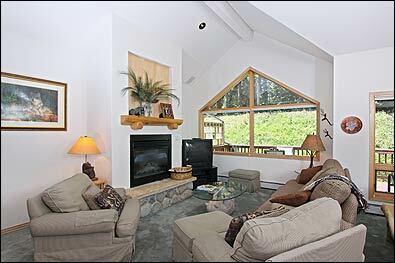 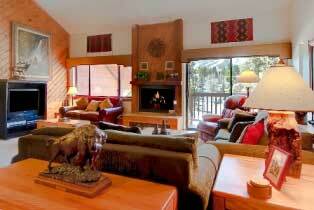 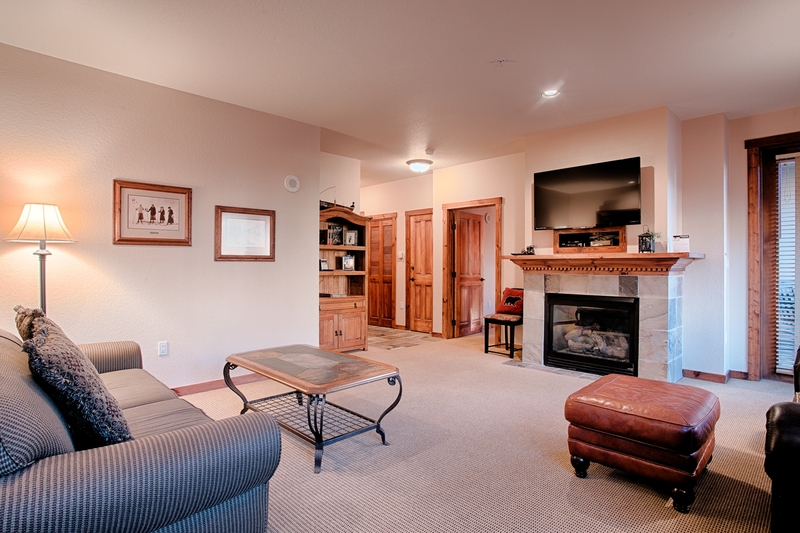 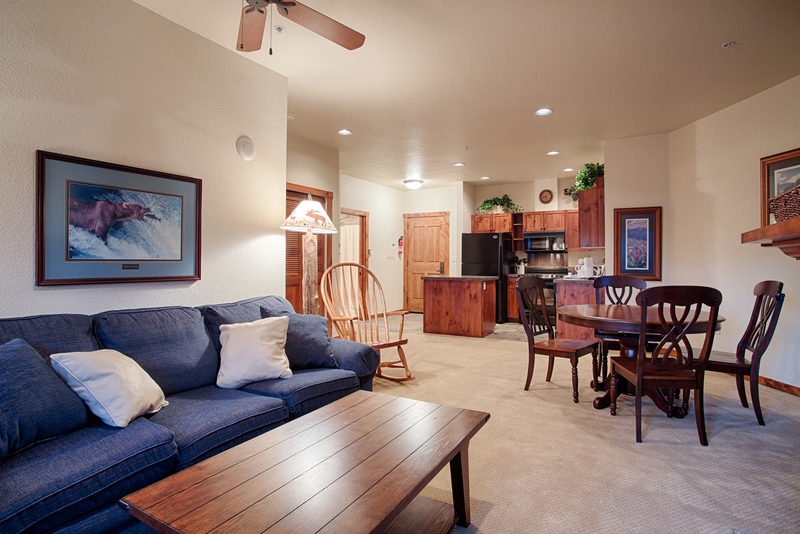 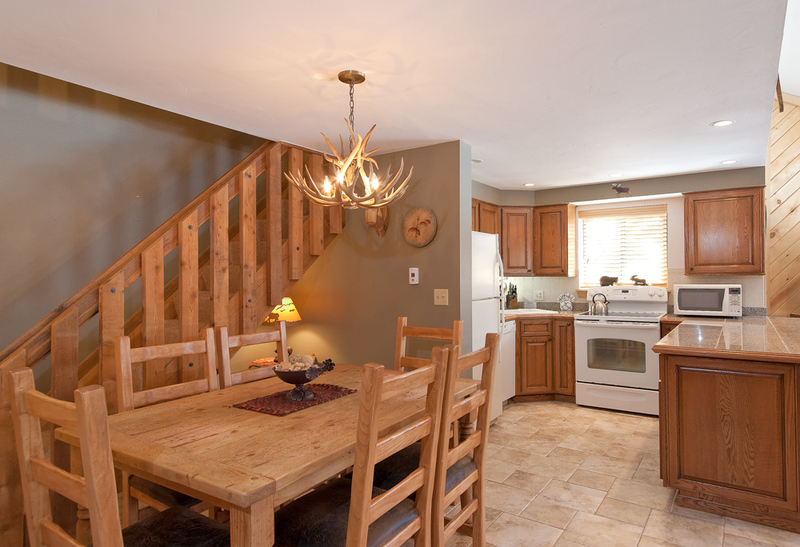 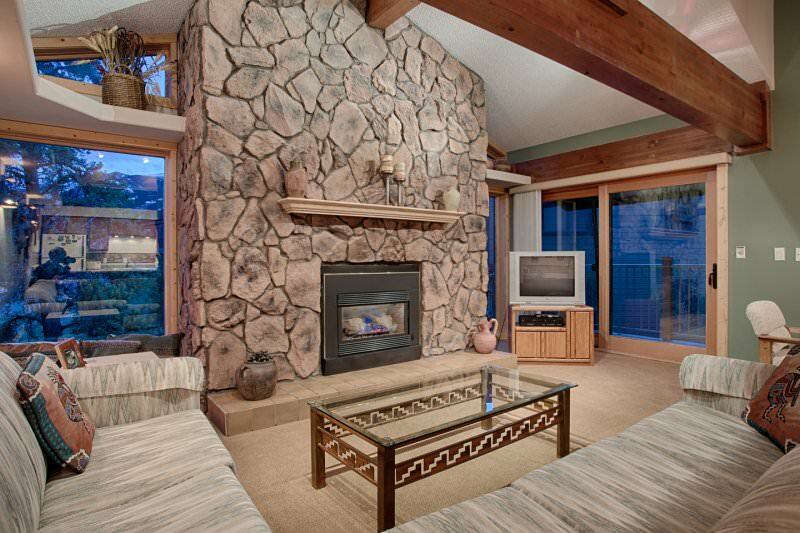 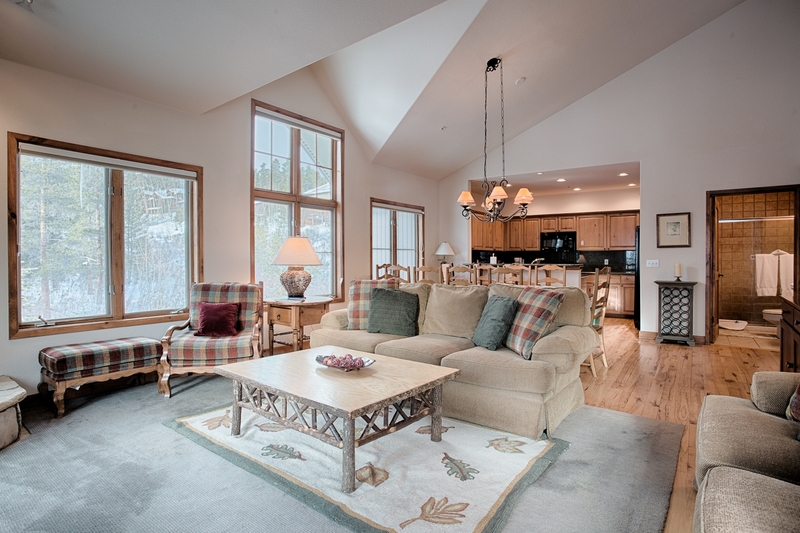 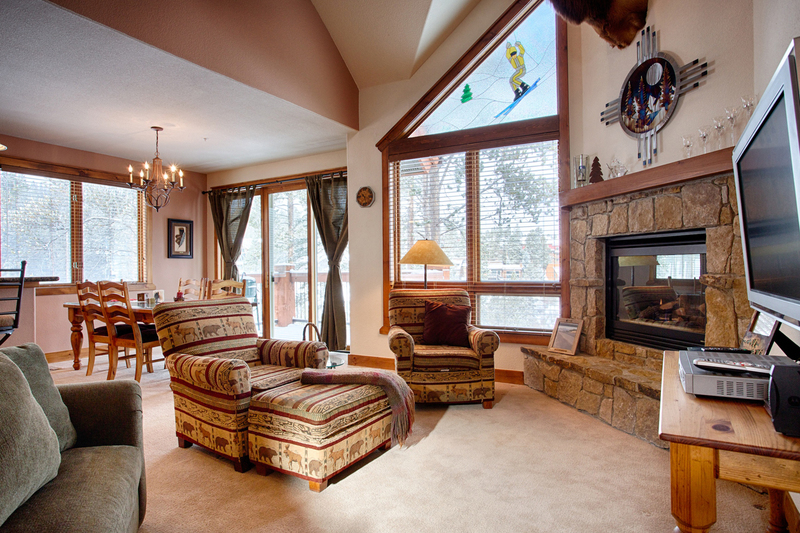 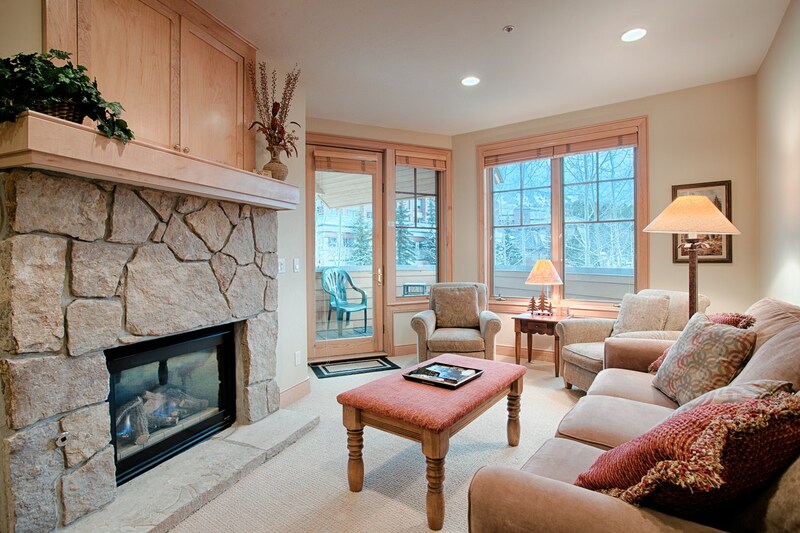 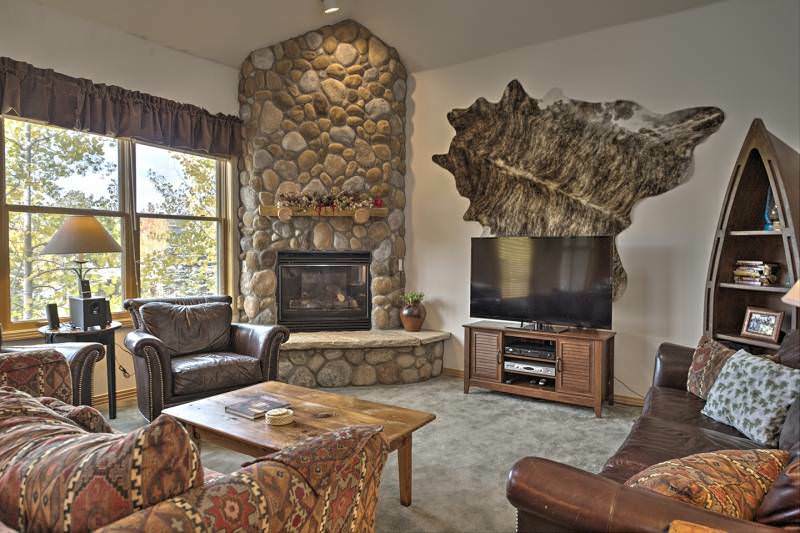 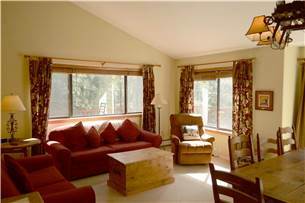 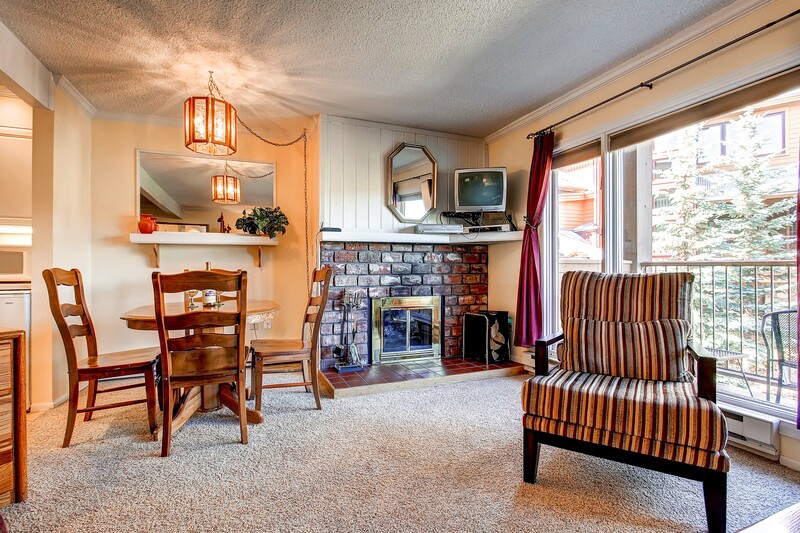 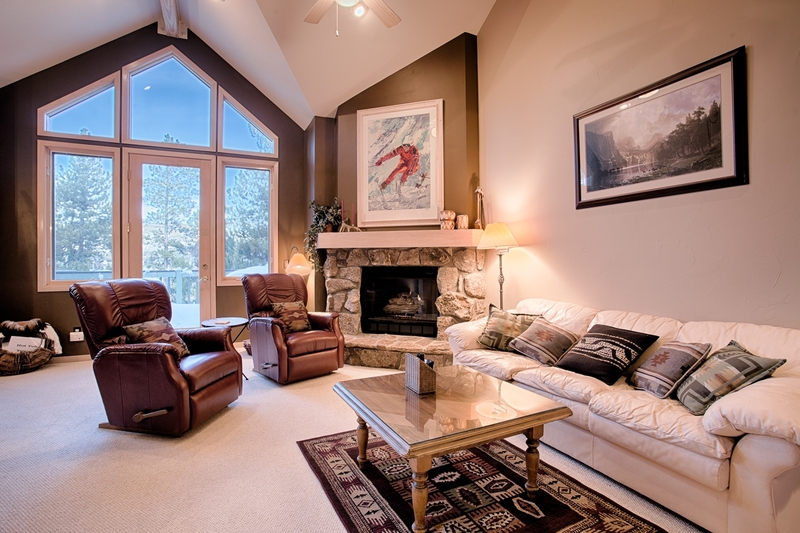 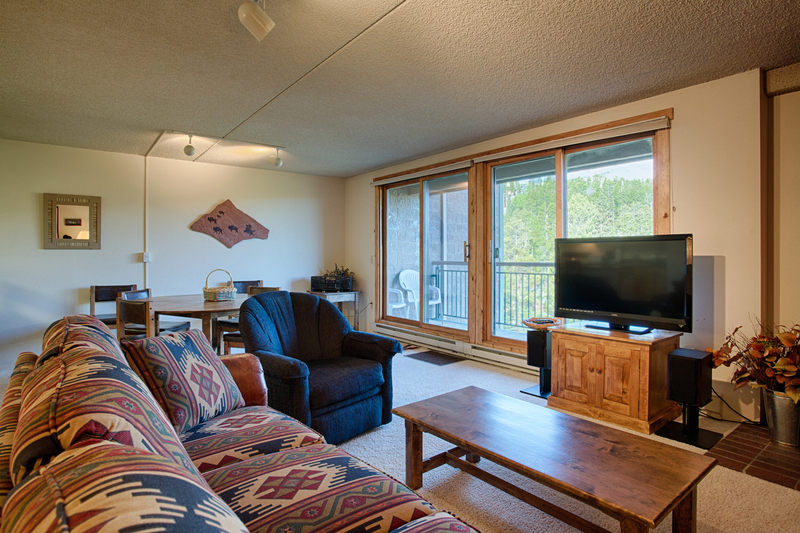 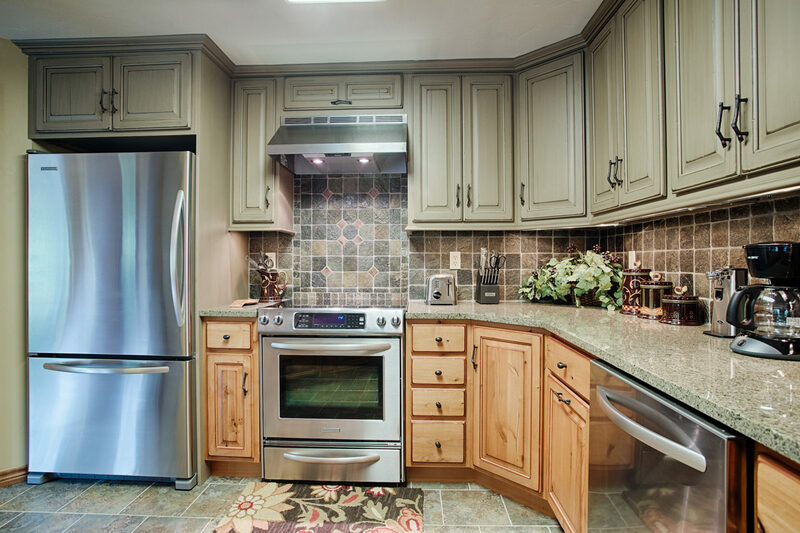 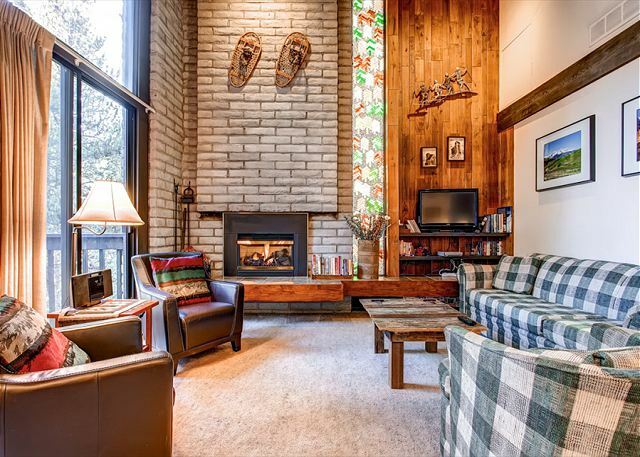 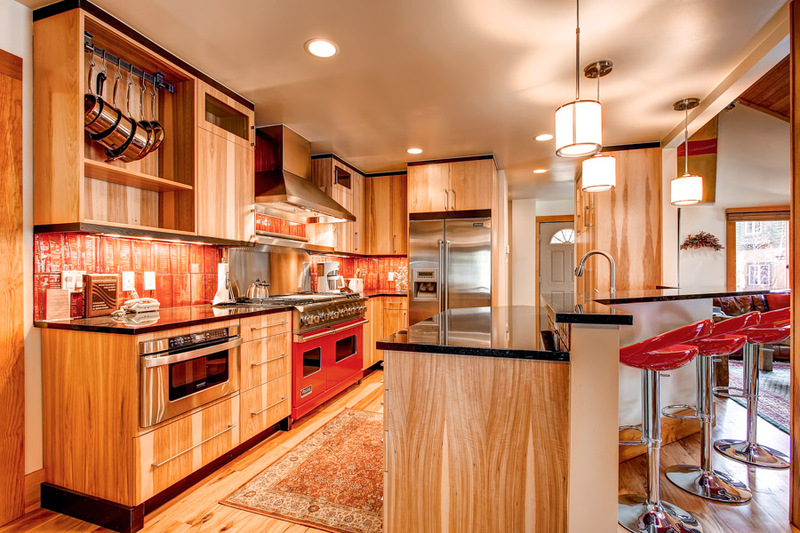 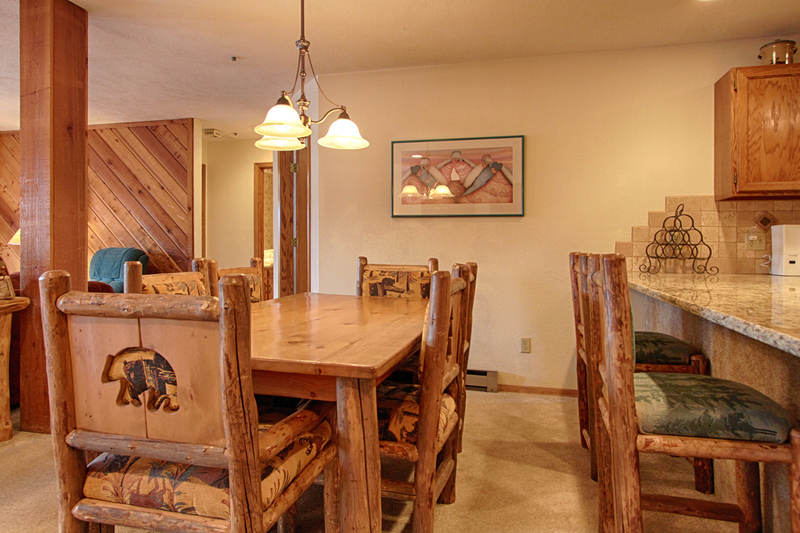 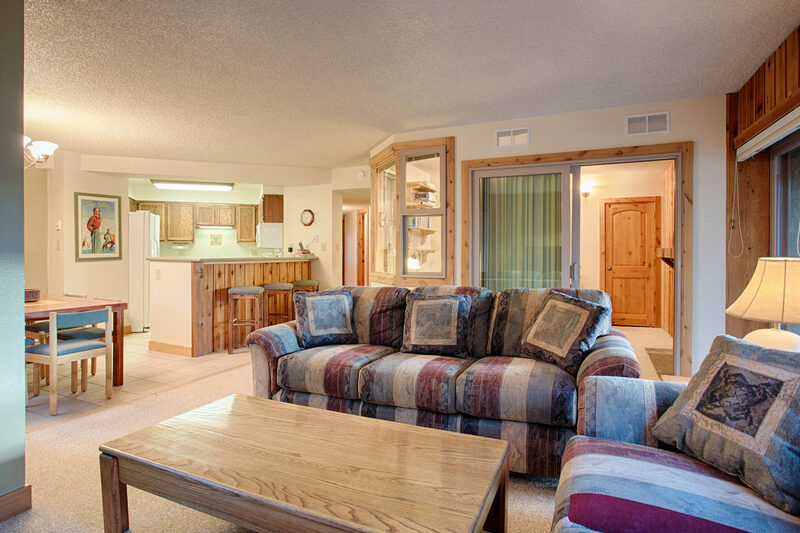 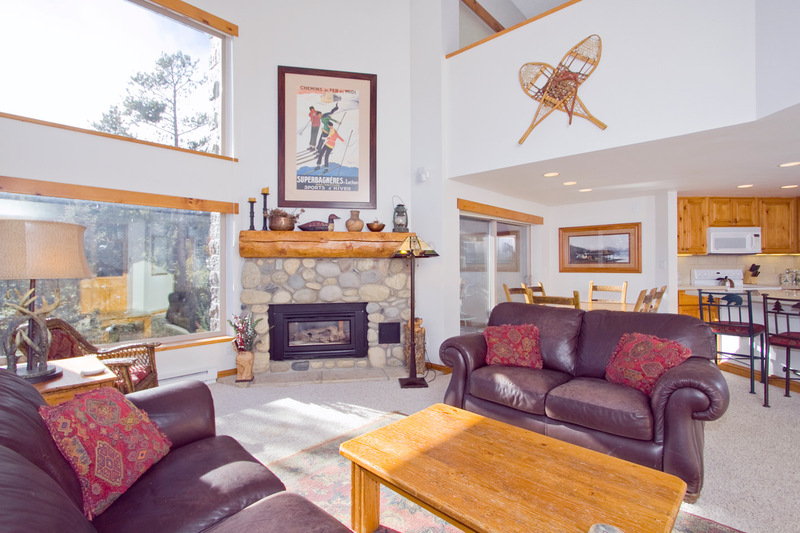 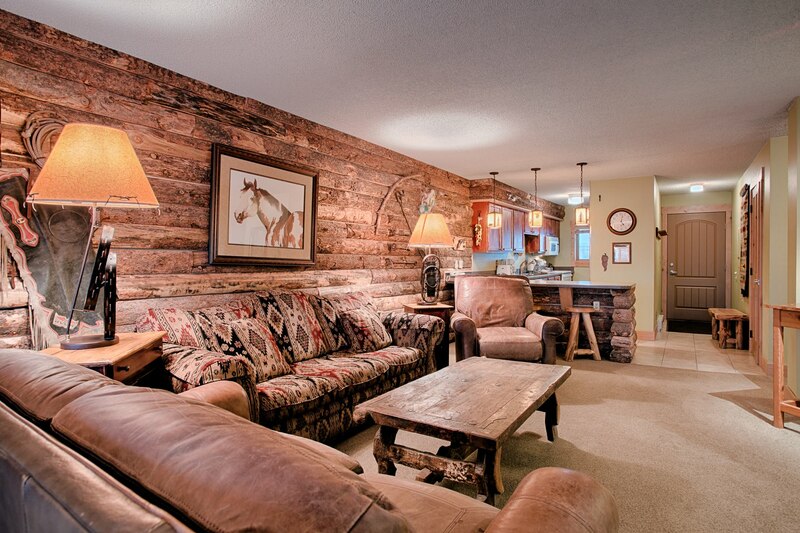 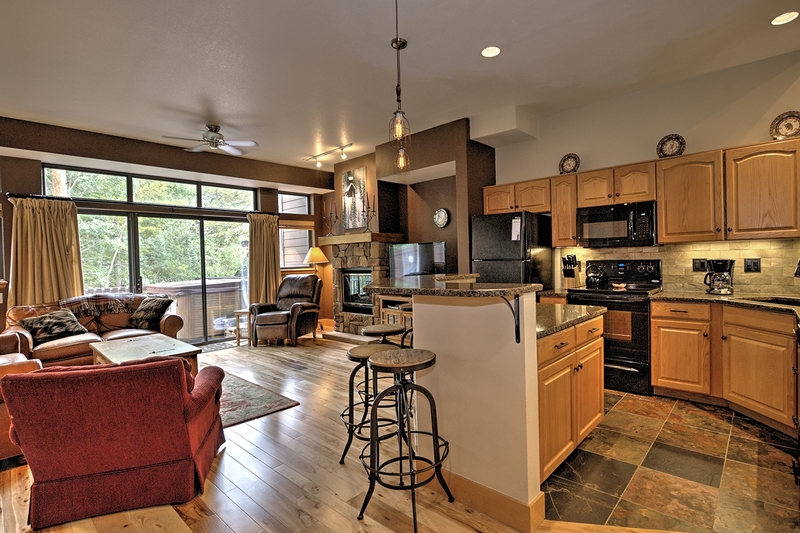 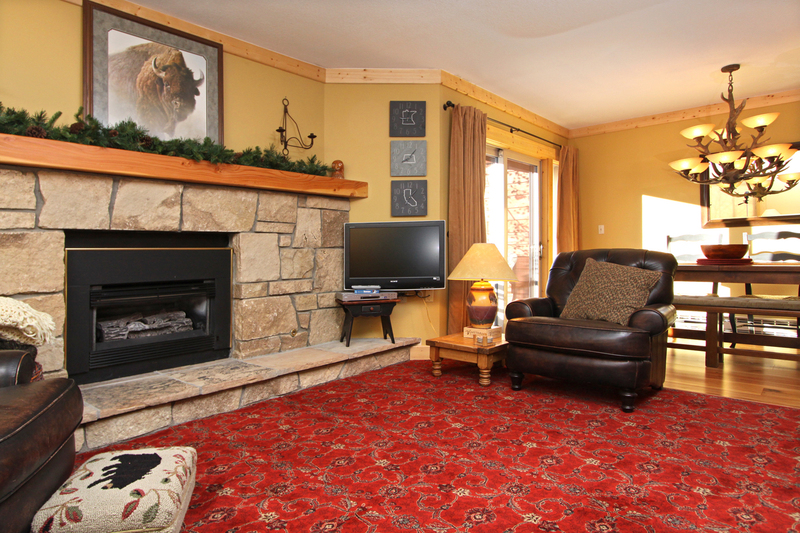 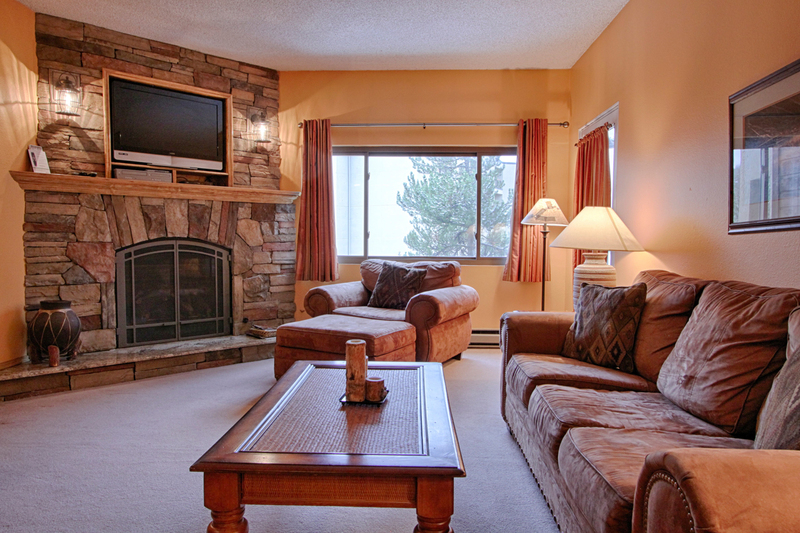 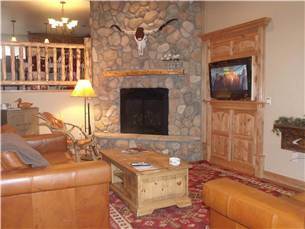 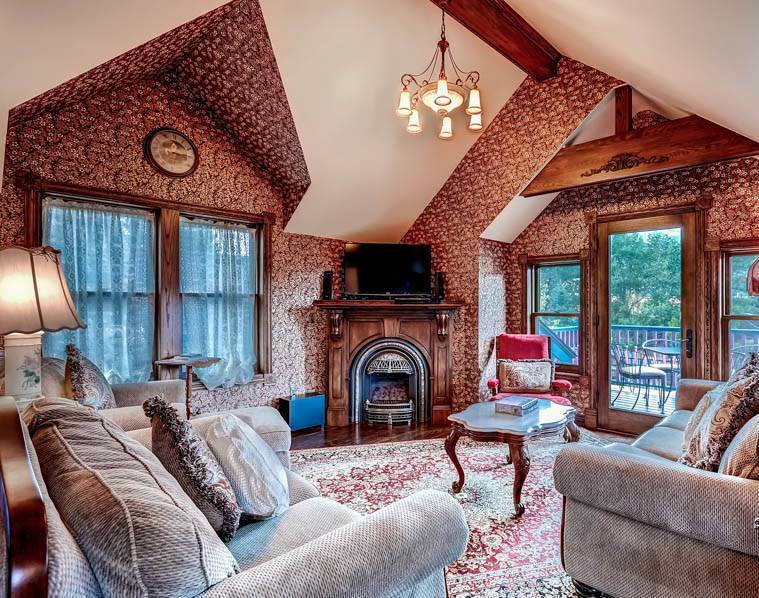 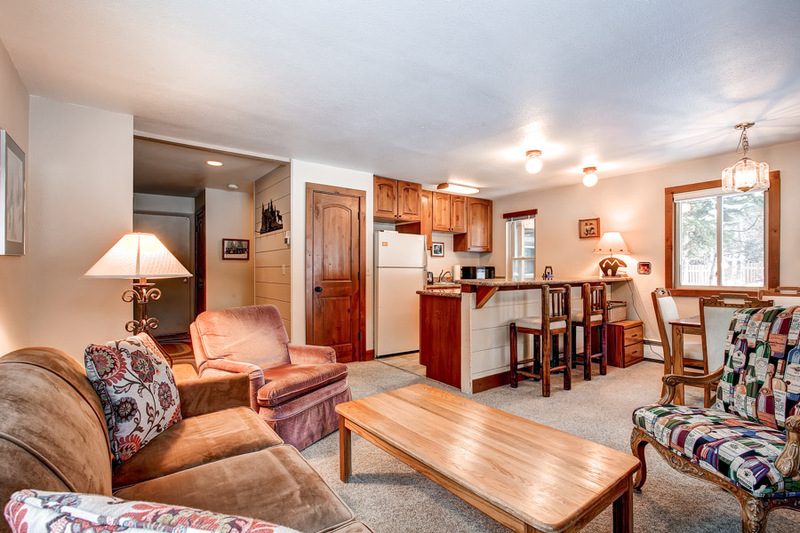 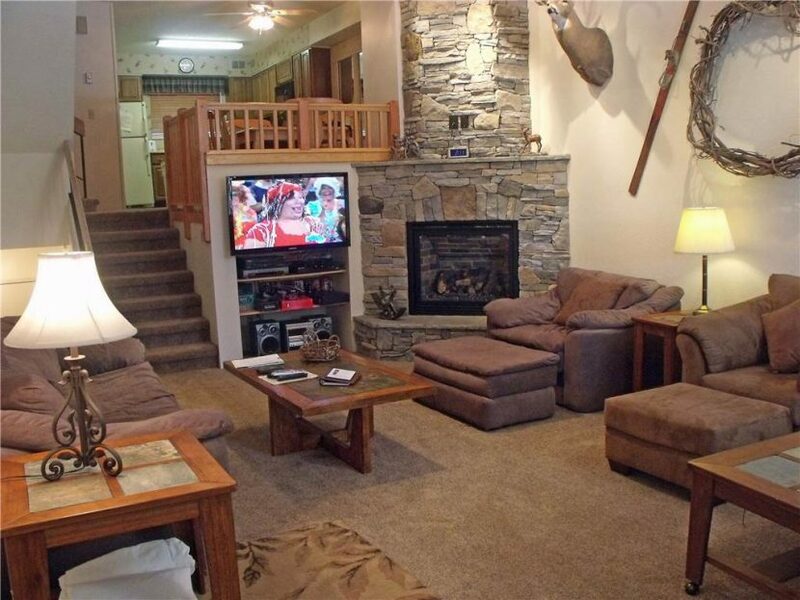 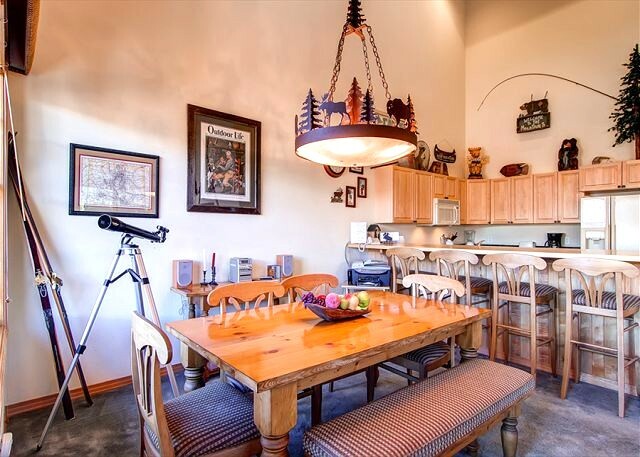 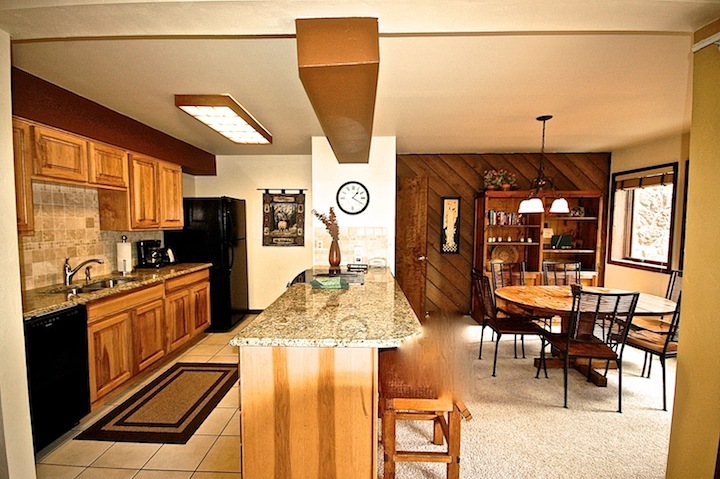 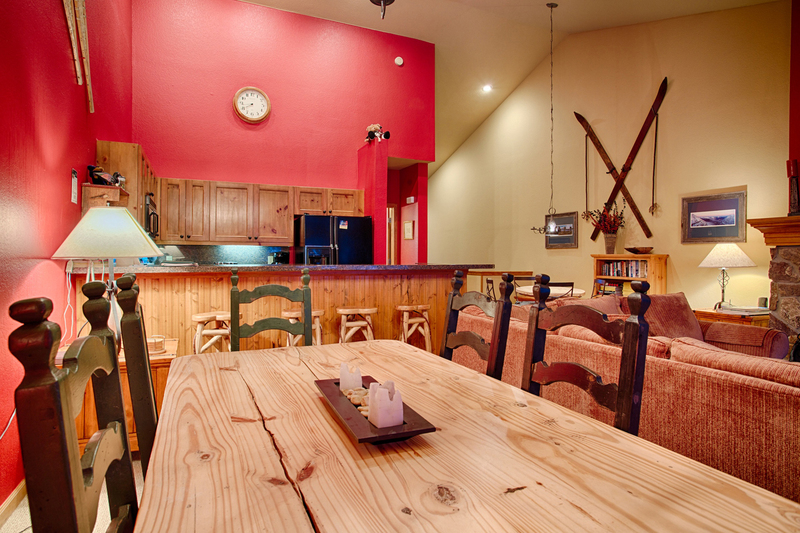 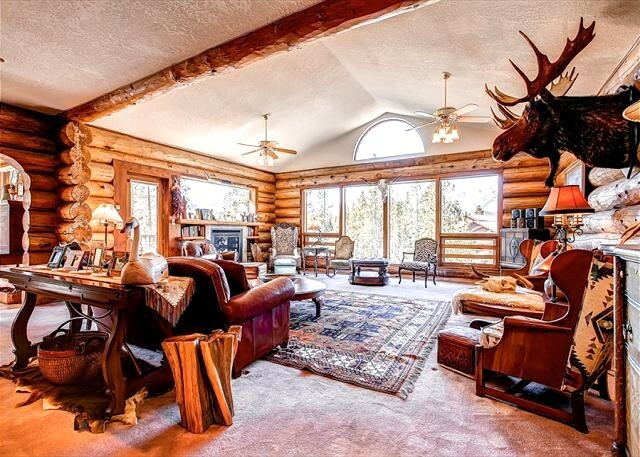 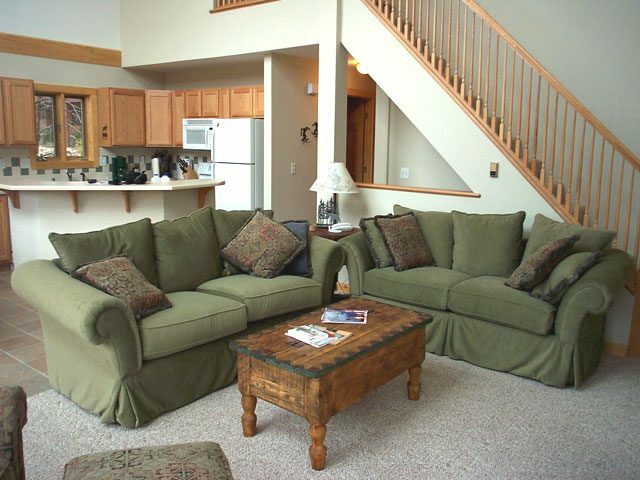 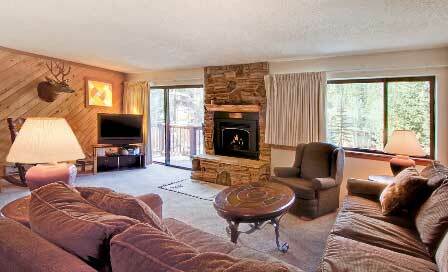 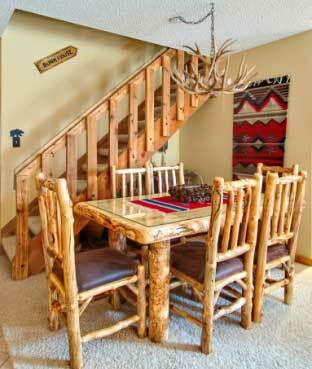 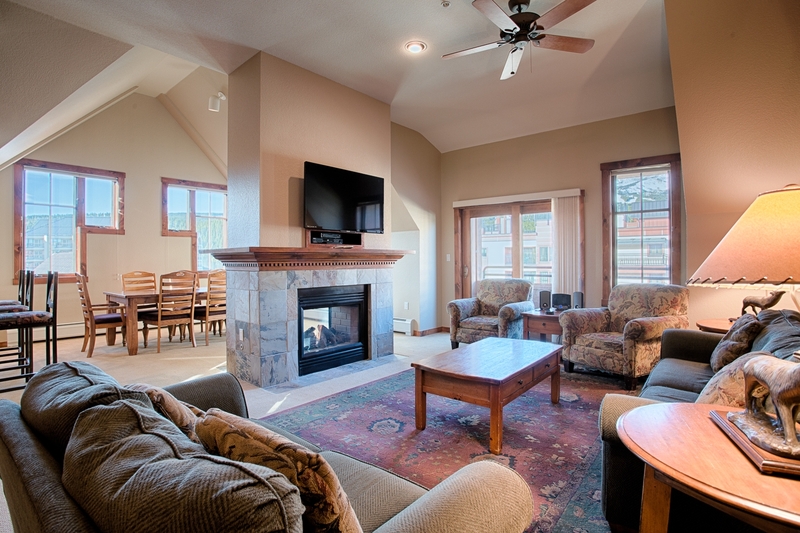 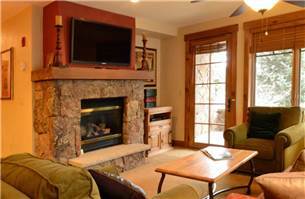 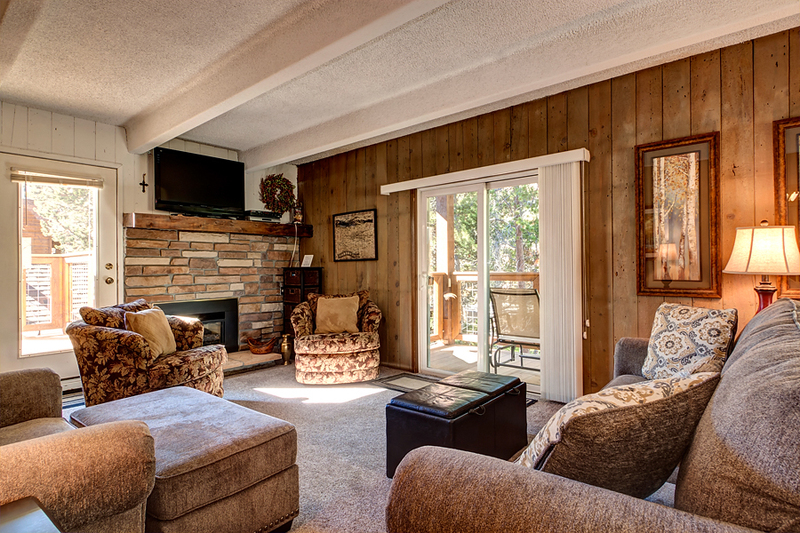 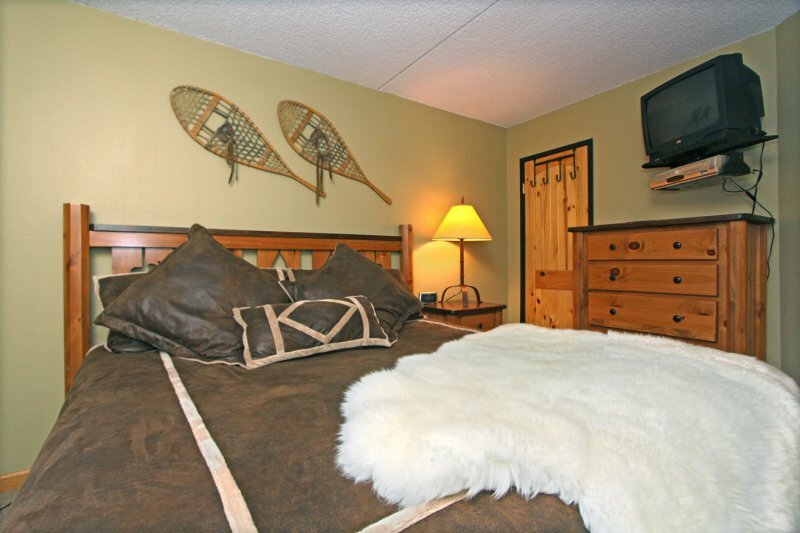 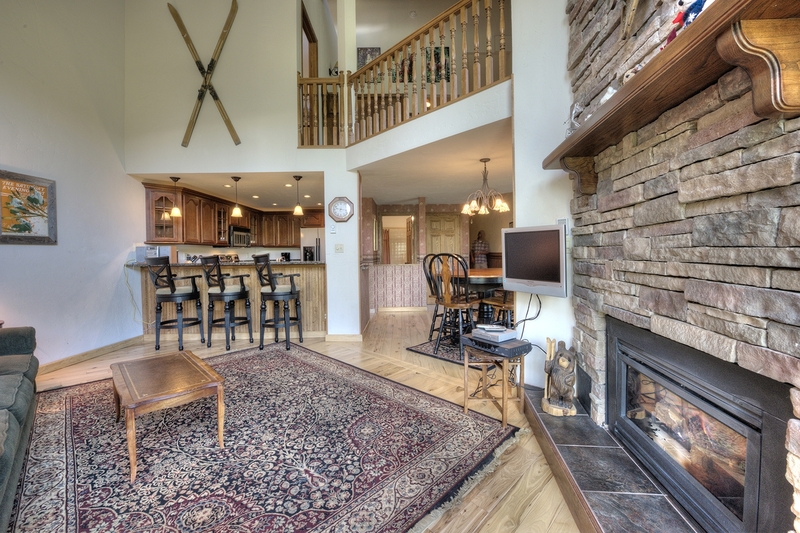 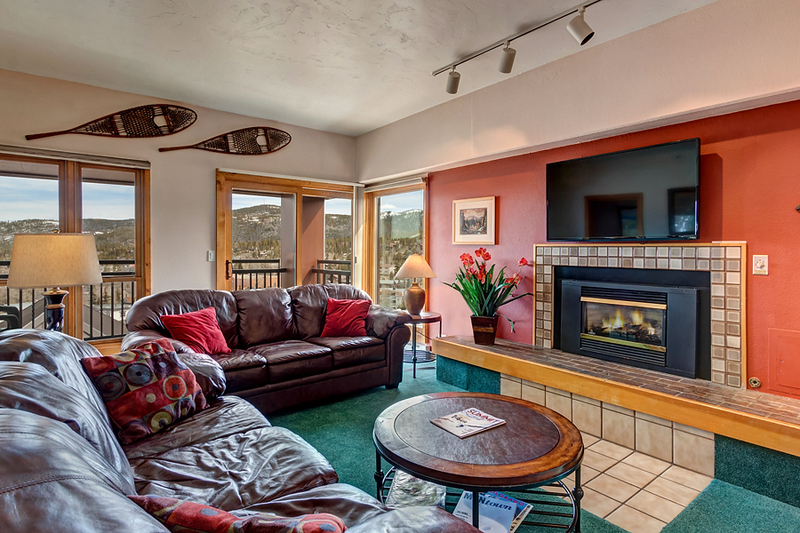 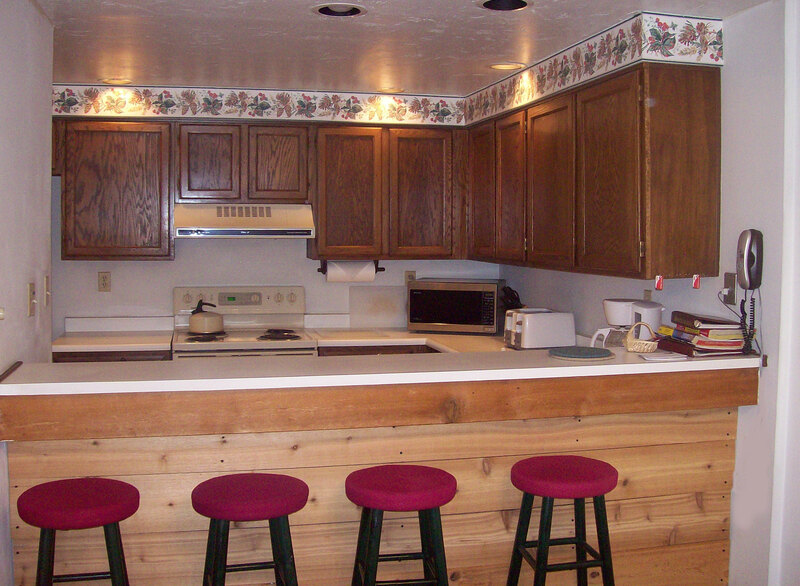 Endless activities abound year-round with miles of cross-country, hiking and biking trails right out the back door. 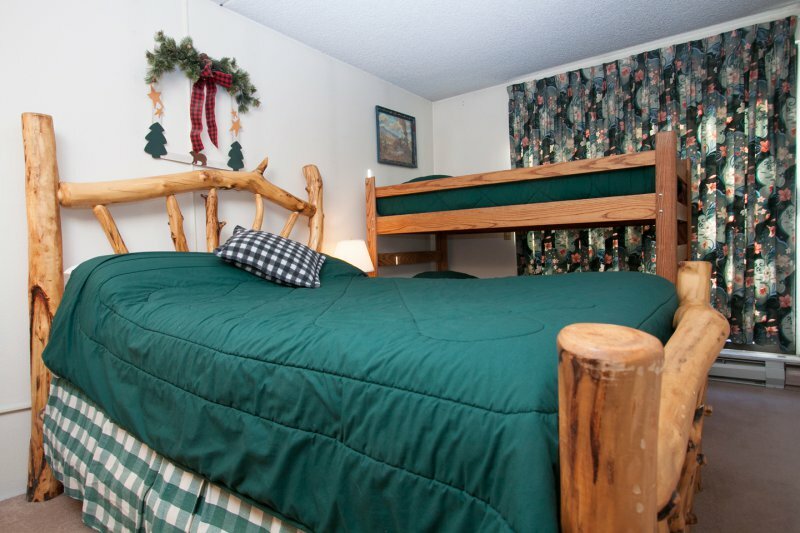 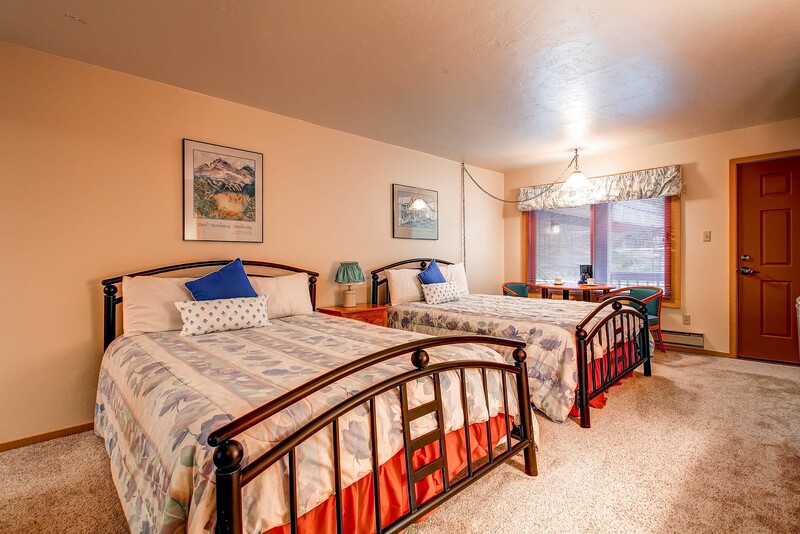 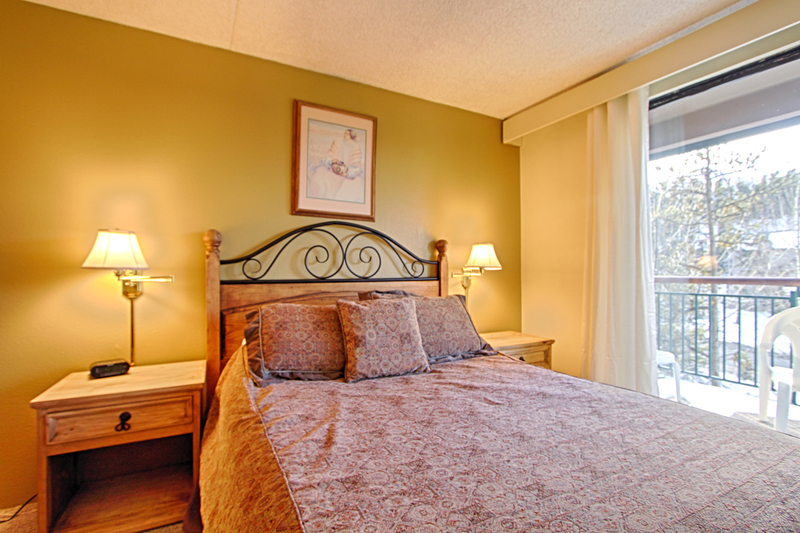 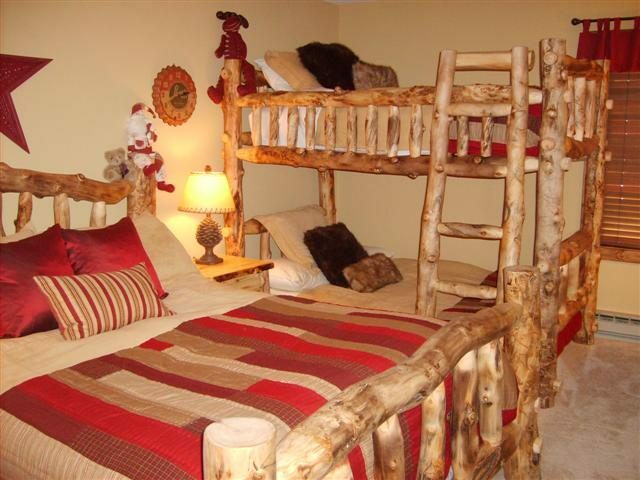 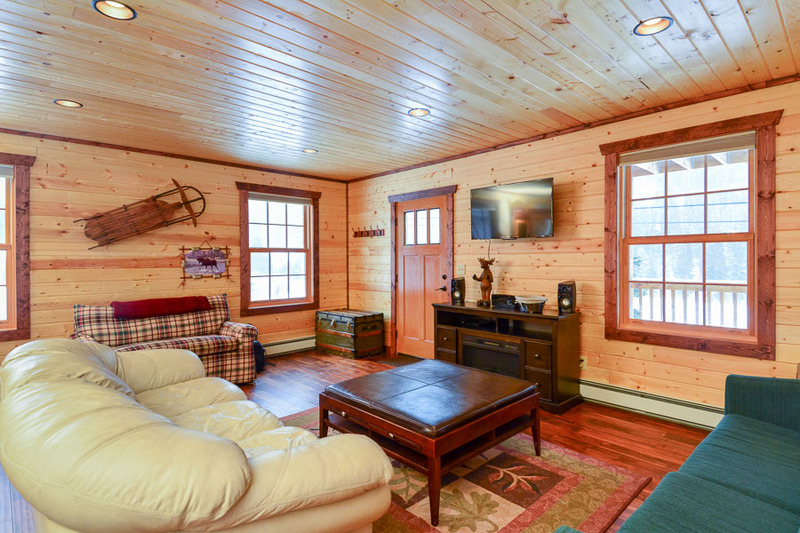 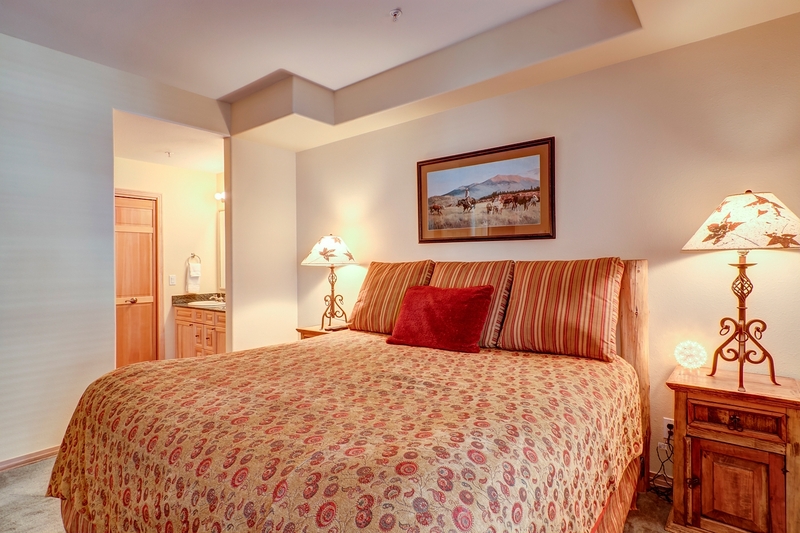 AMENITIES – There are three bedrooms including a master king bedroom, two queen bedrooms with additional sleeping space in the den. 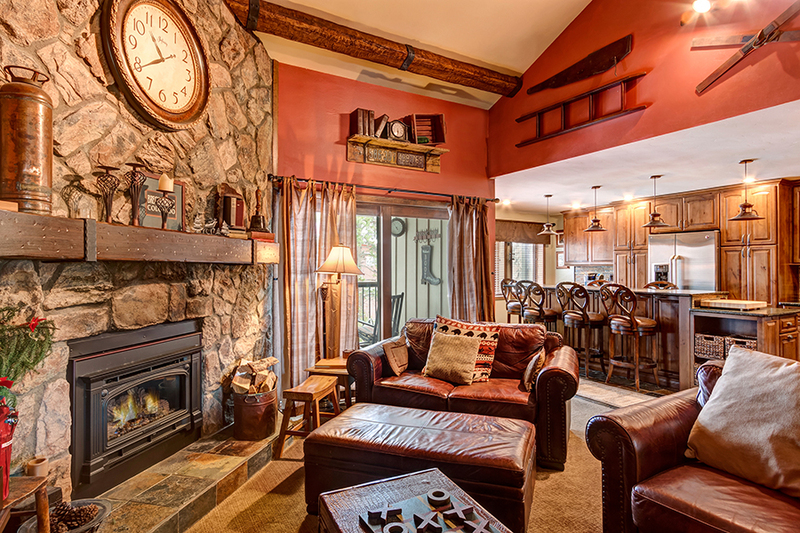 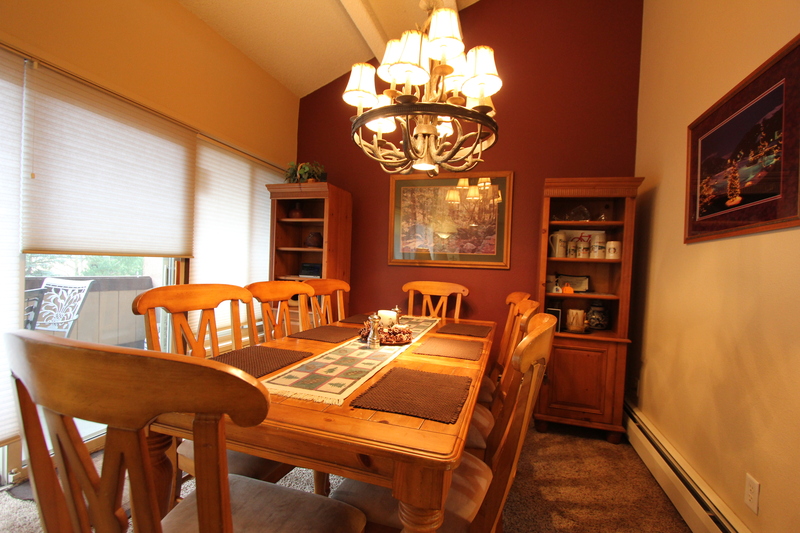 The main level area is a great space for your group to gather for meals and entertainment. 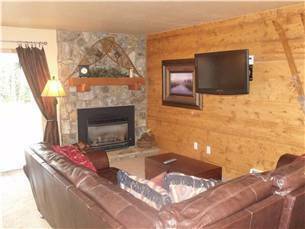 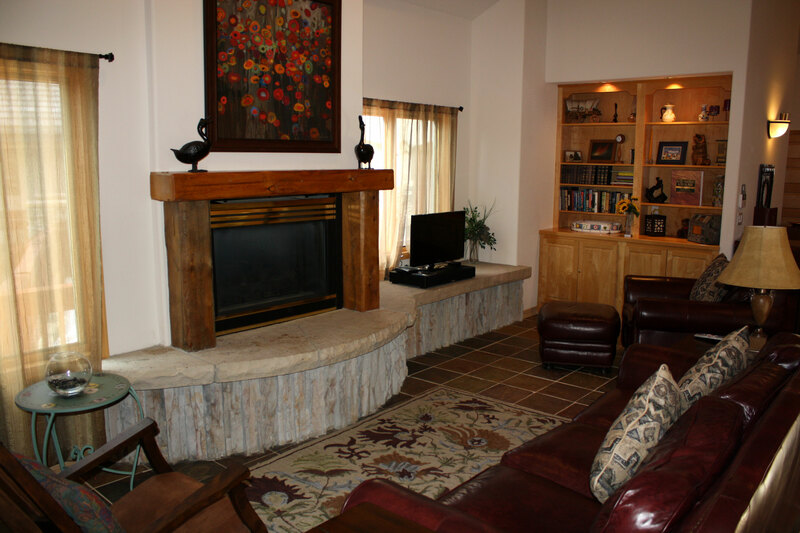 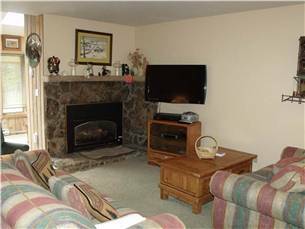 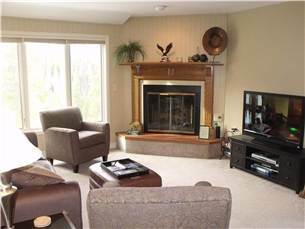 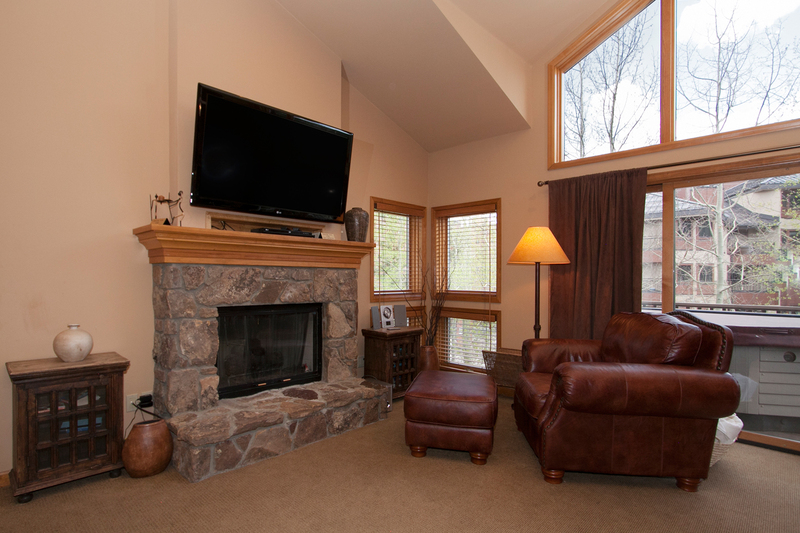 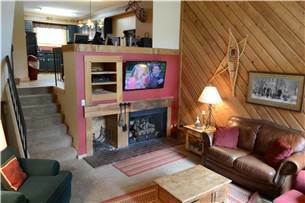 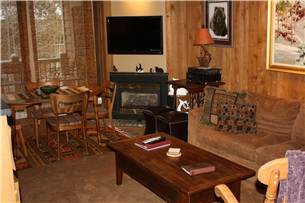 Cozy up in front of the fireplace to relax with a good book, watch a movie on the flat screen TV or enjoy music on the Sonos audio system. 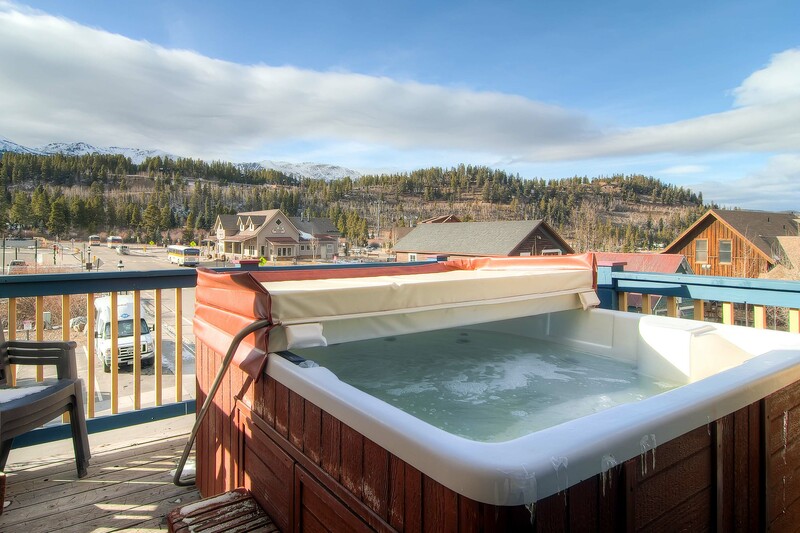 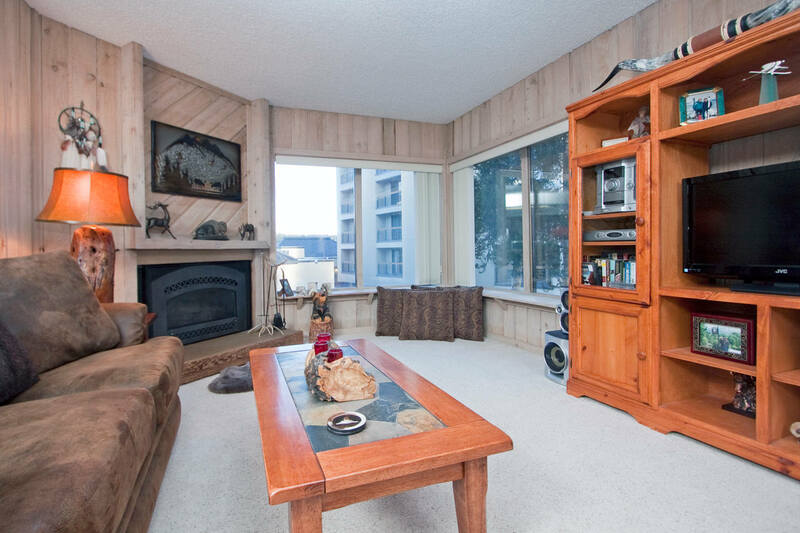 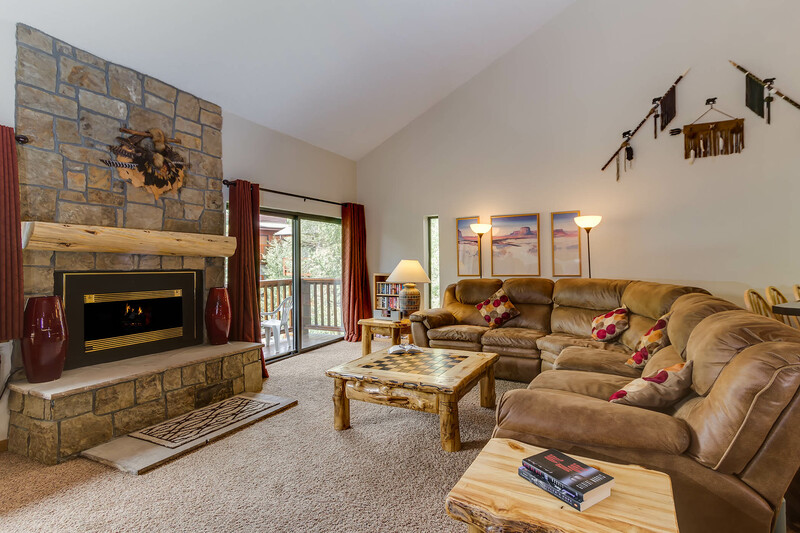 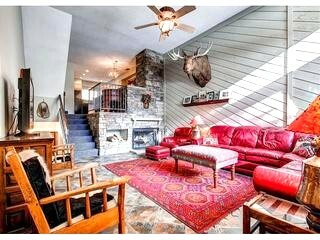 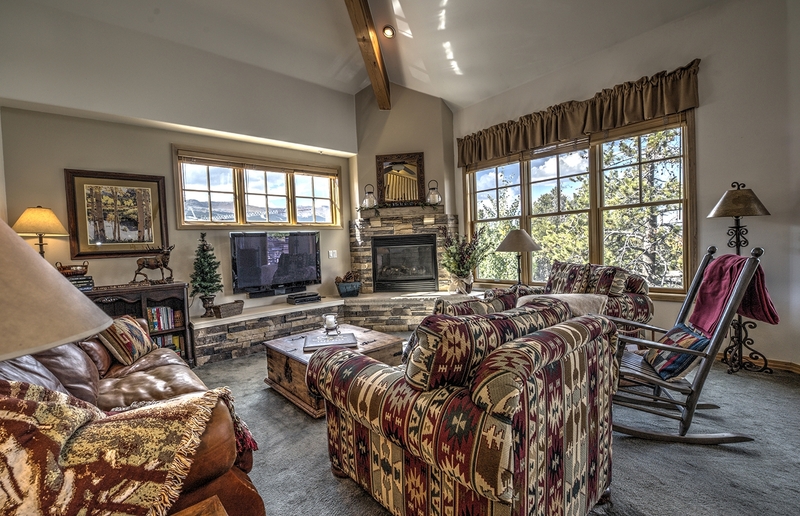 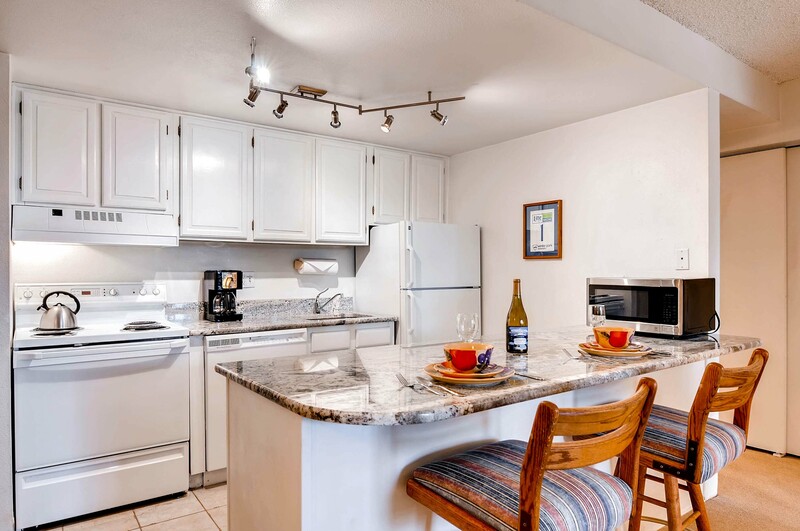 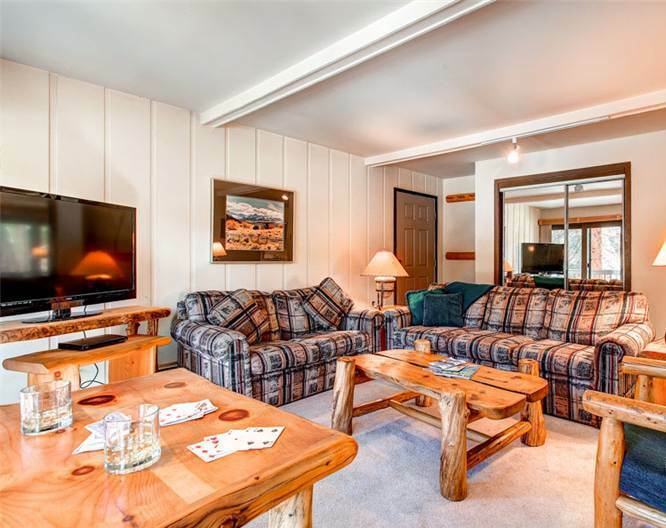 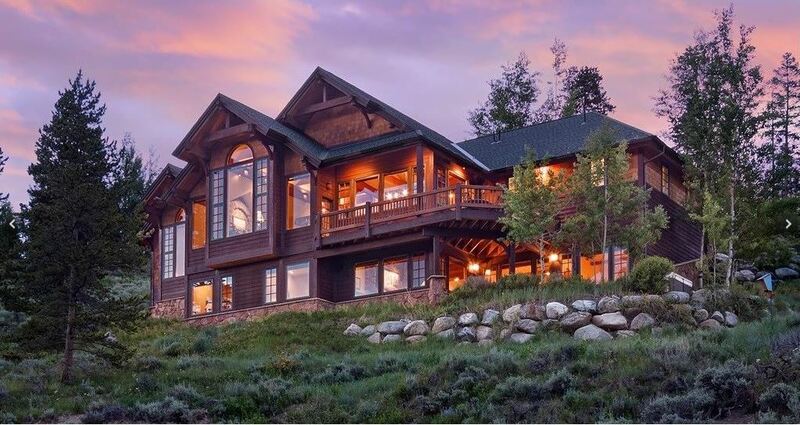 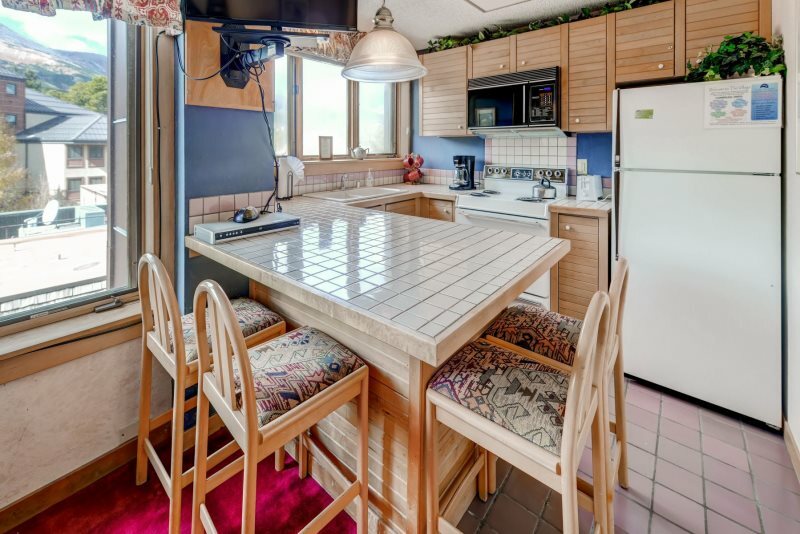 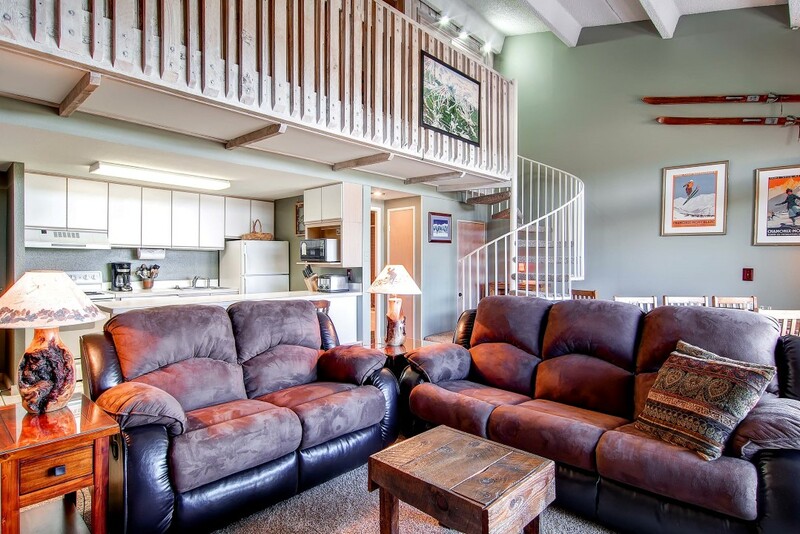 There are multiple decks so you won’t want to miss taking in the breathtaking mountain views, soaking in the outdoor hot tub or grilling up dinner to enjoy with friends and family. 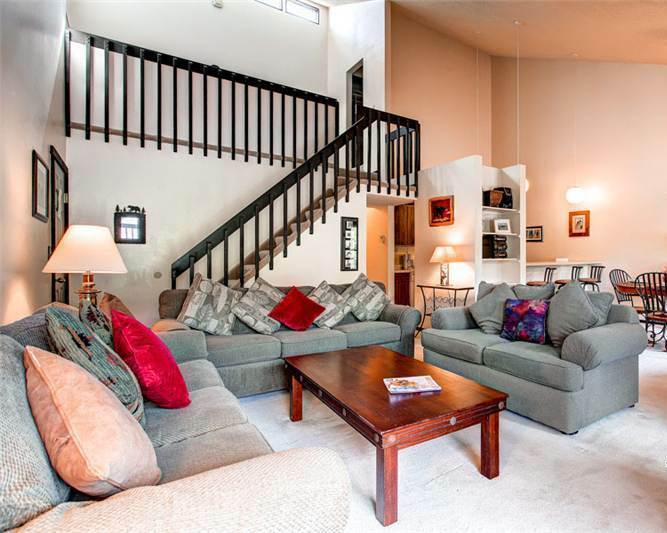 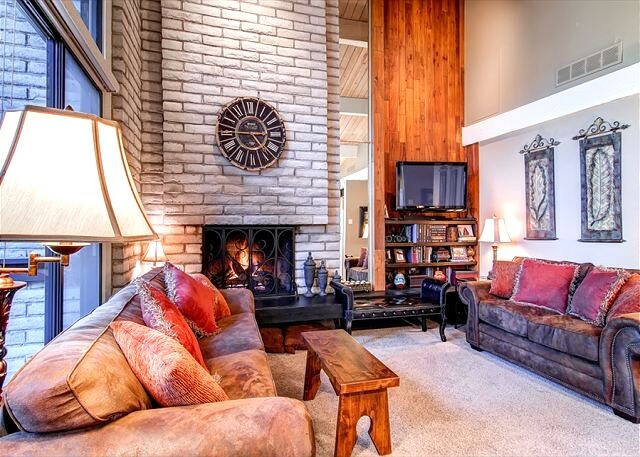 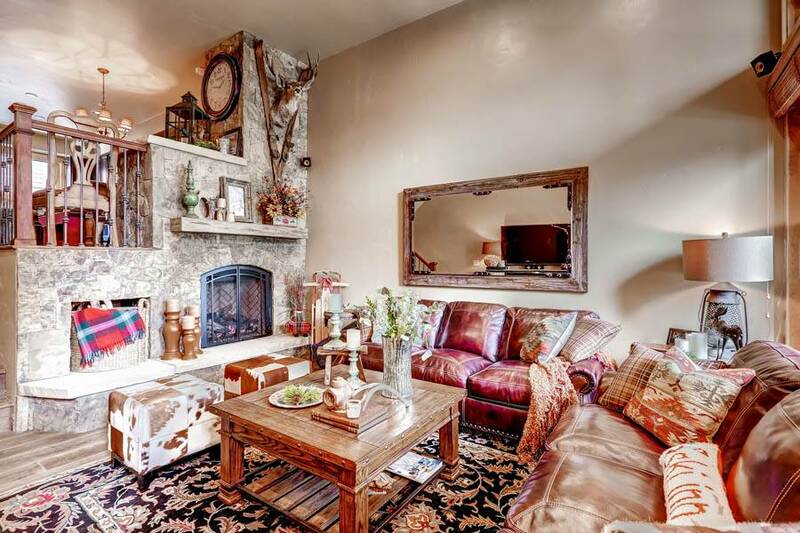 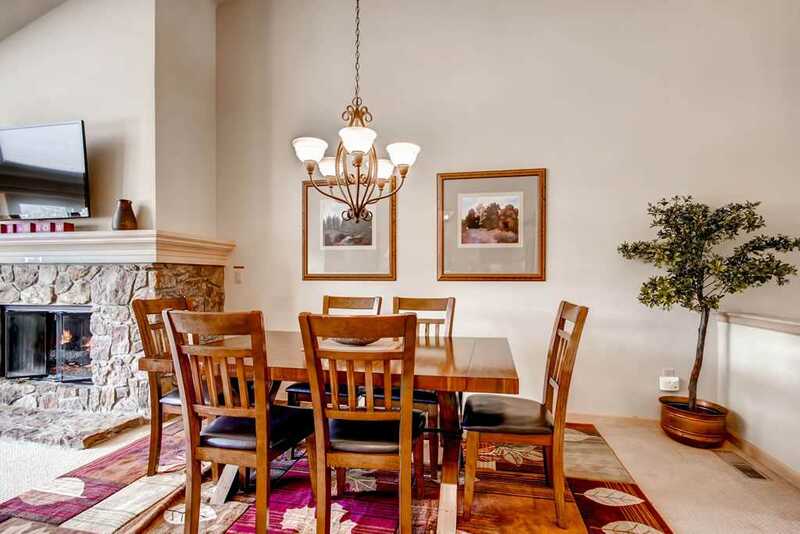 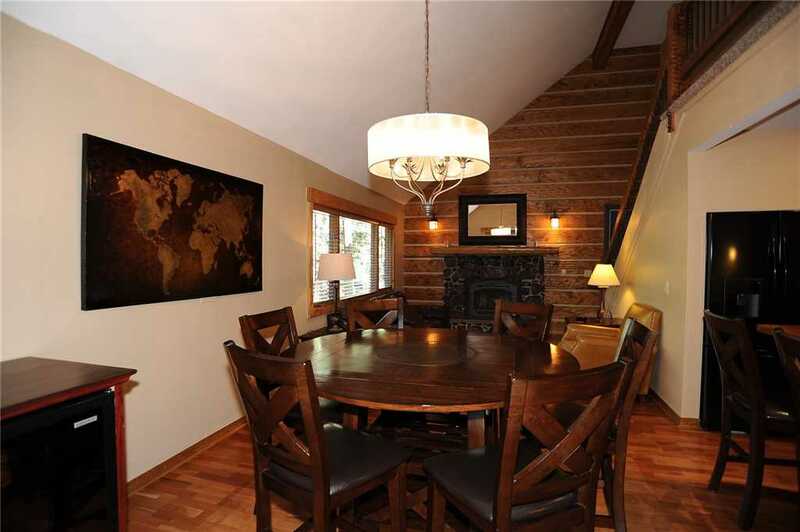 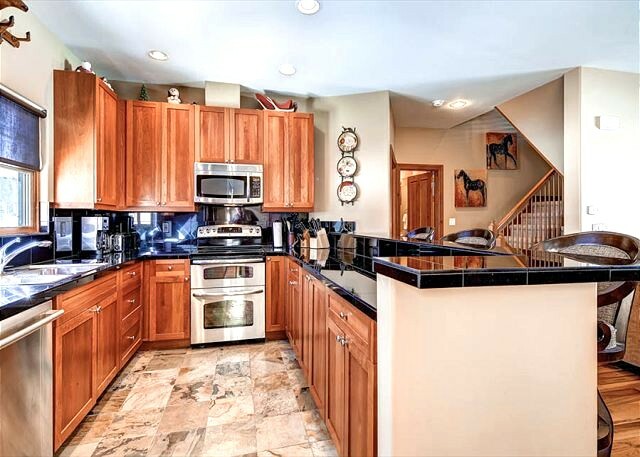 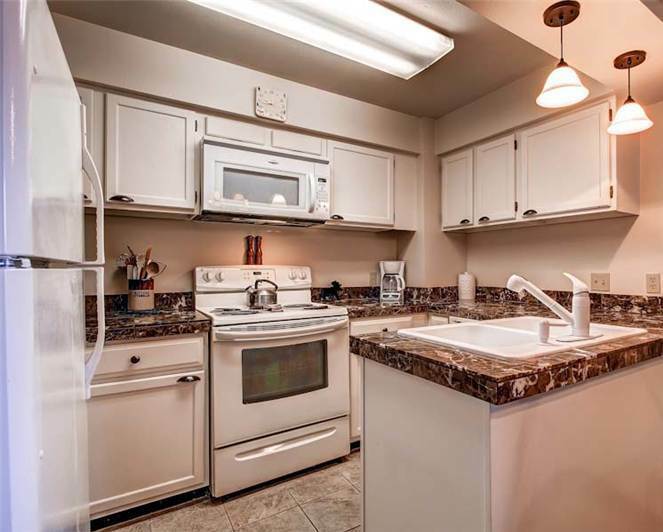 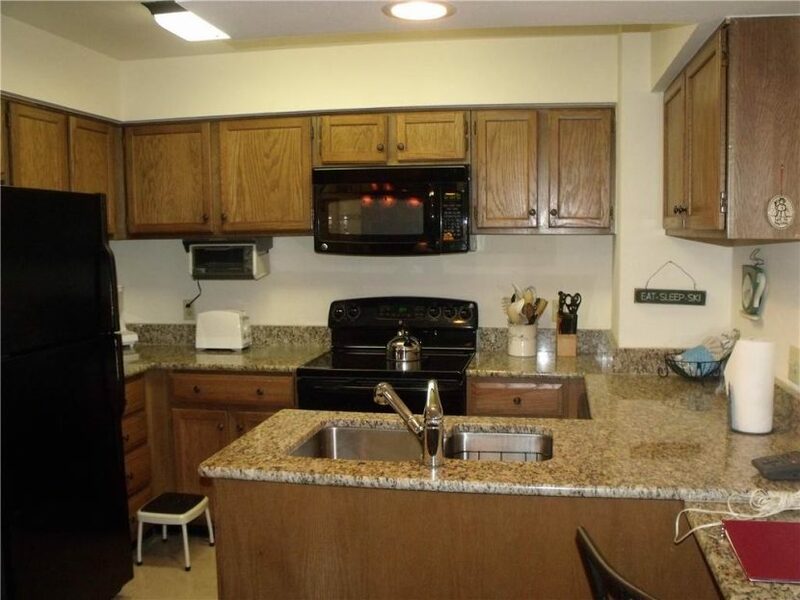 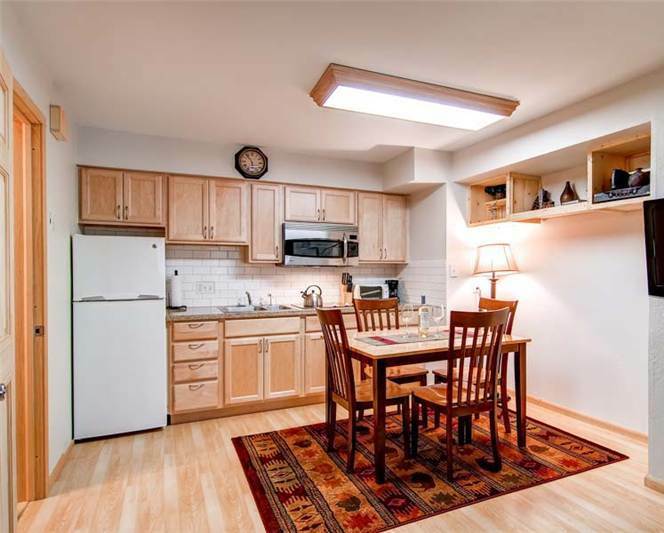 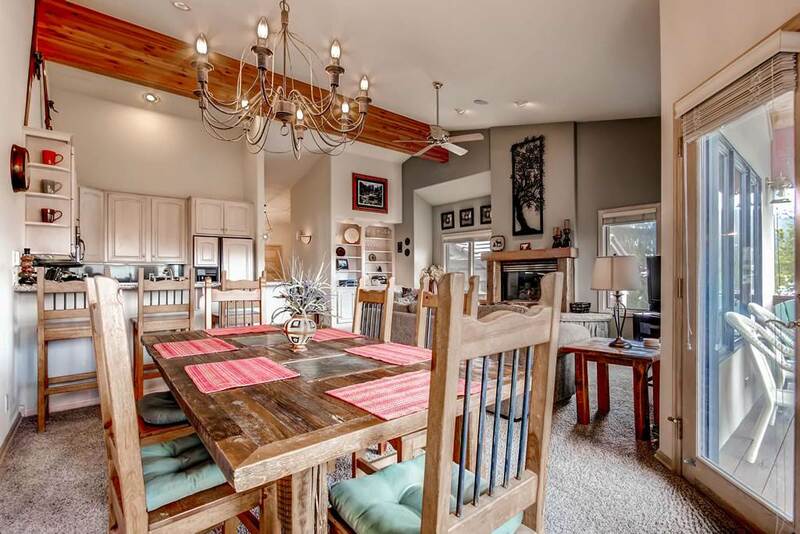 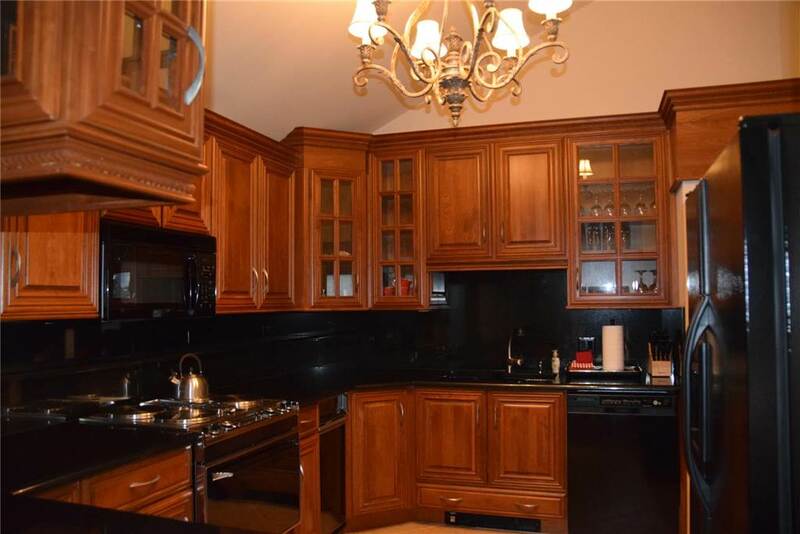 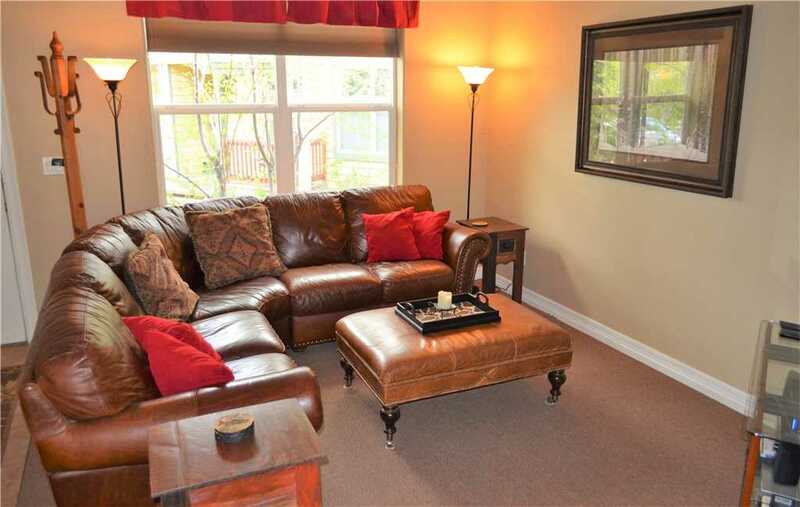 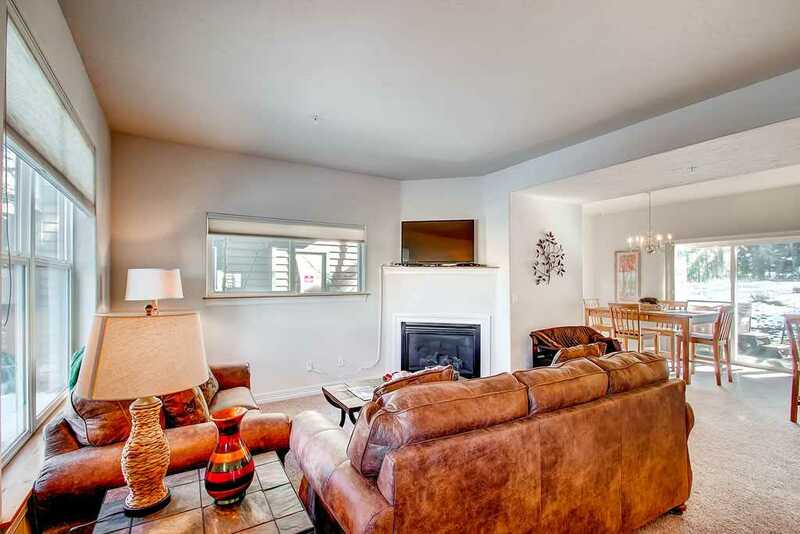 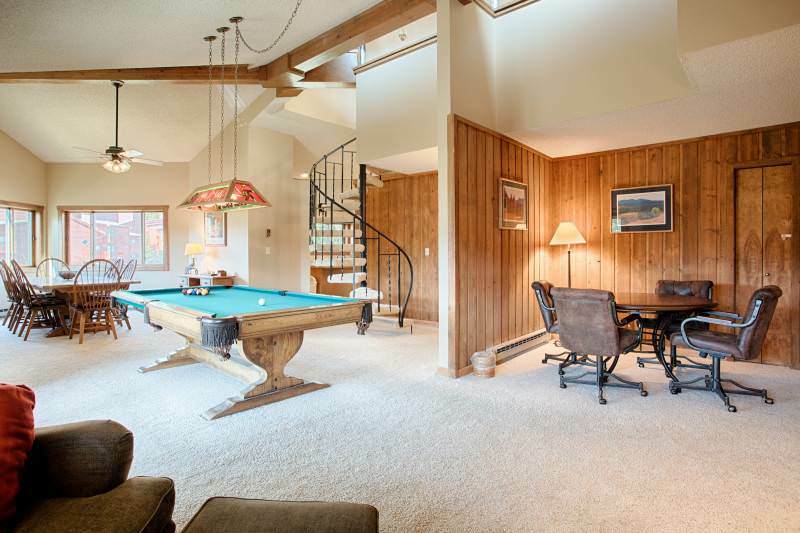 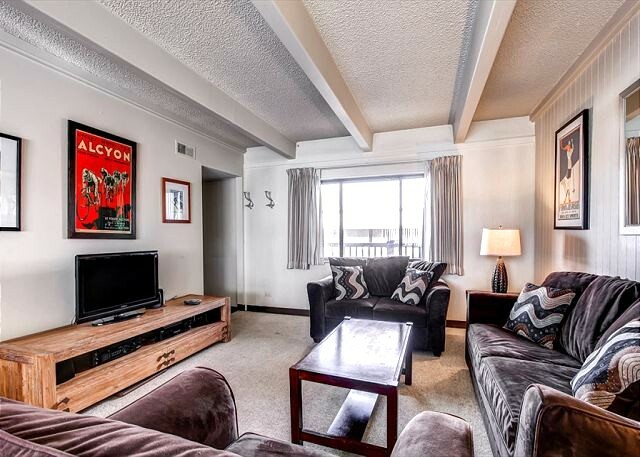 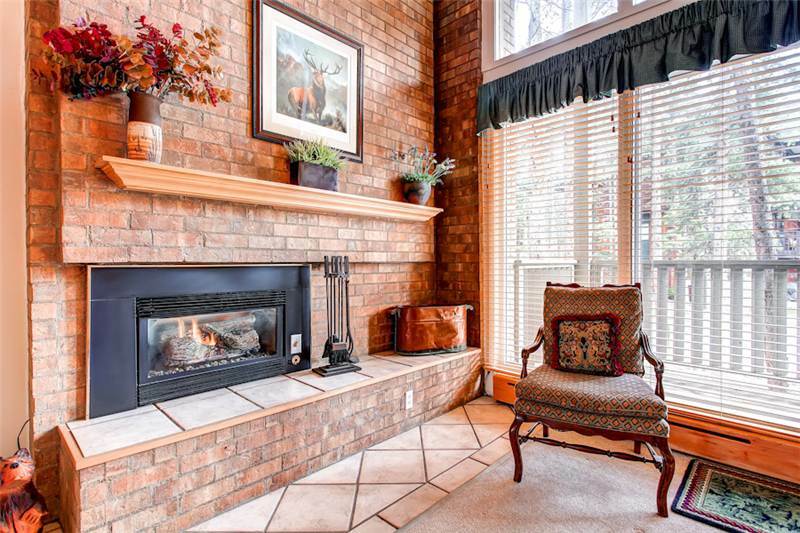 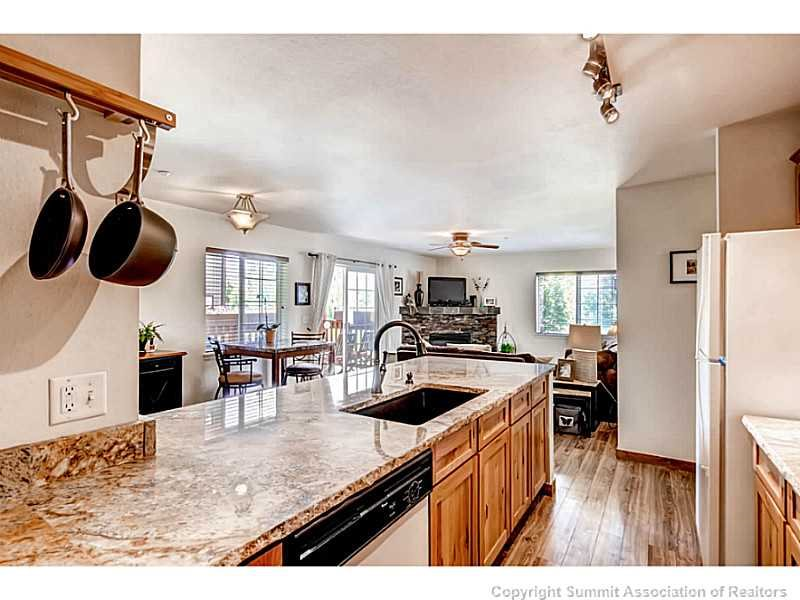 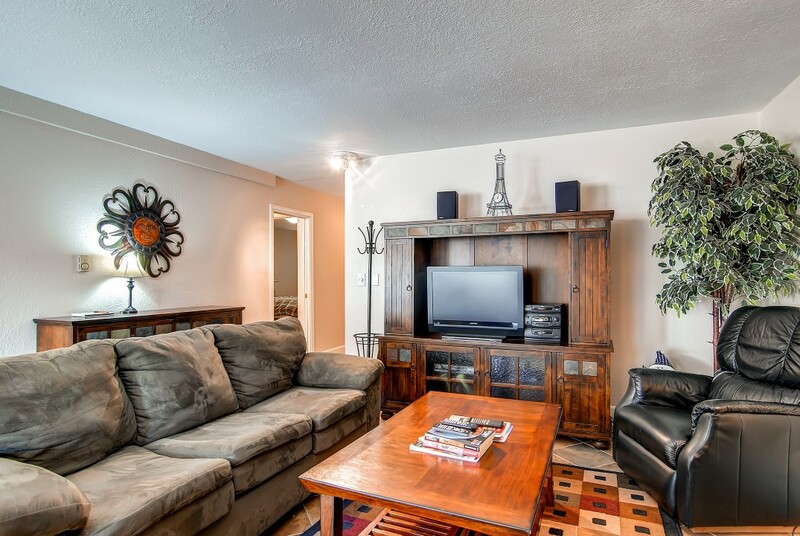 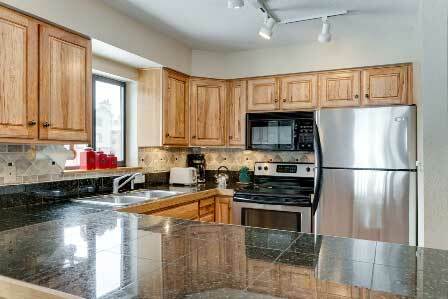 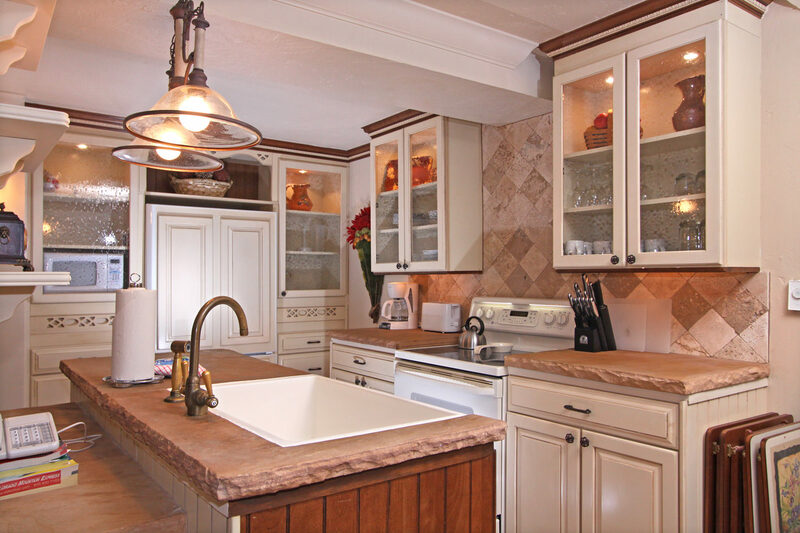 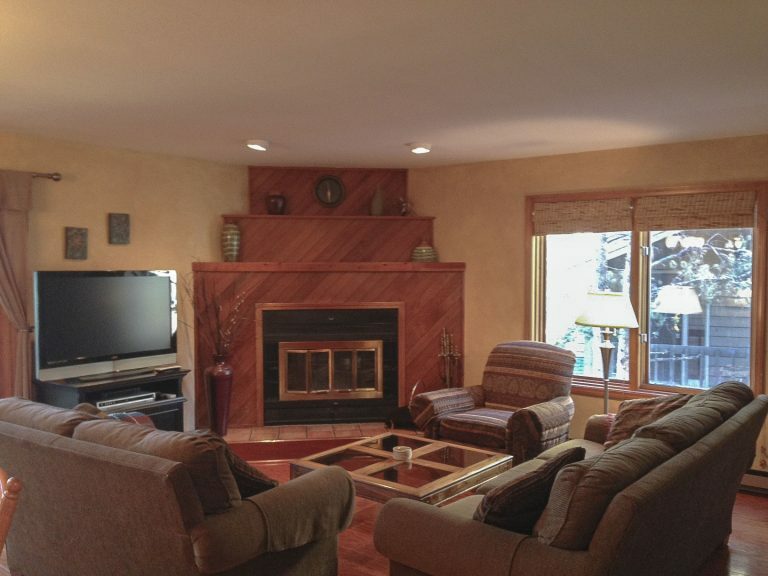 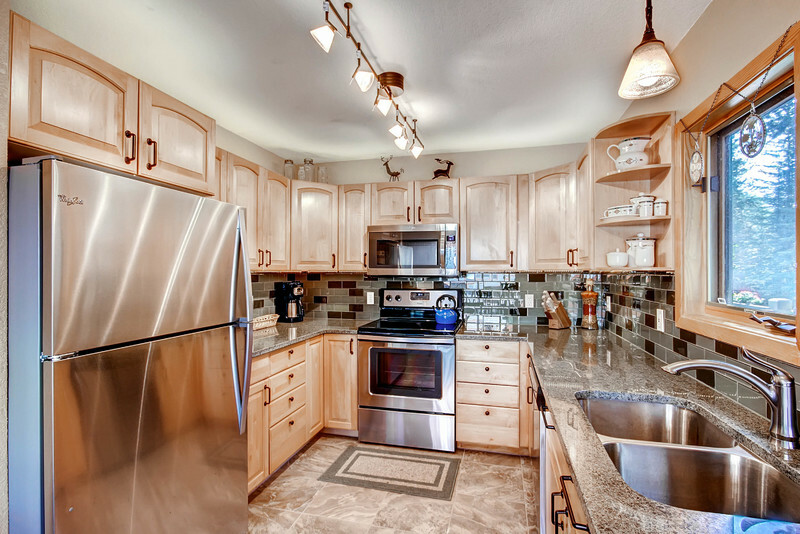 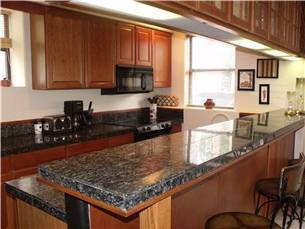 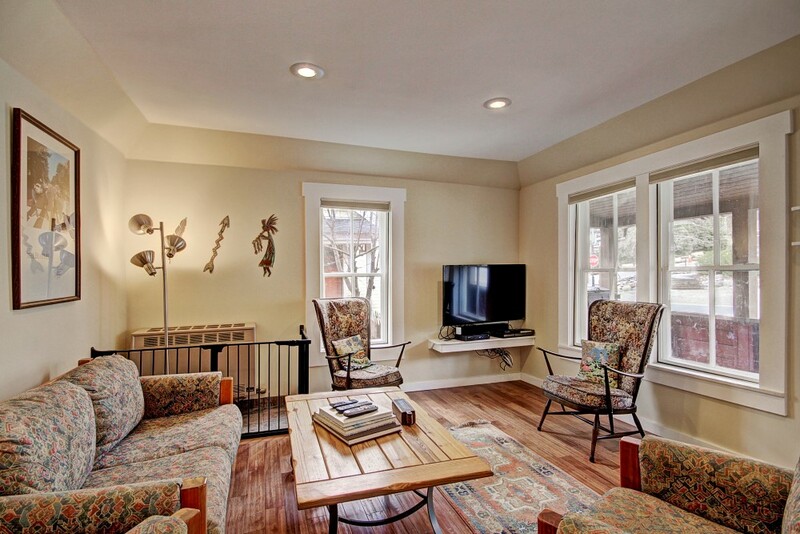 • 3 Bedrooms + Den / 3.5 Bath (3 Full/1 Half – located on main level) / 2,361 s.f. 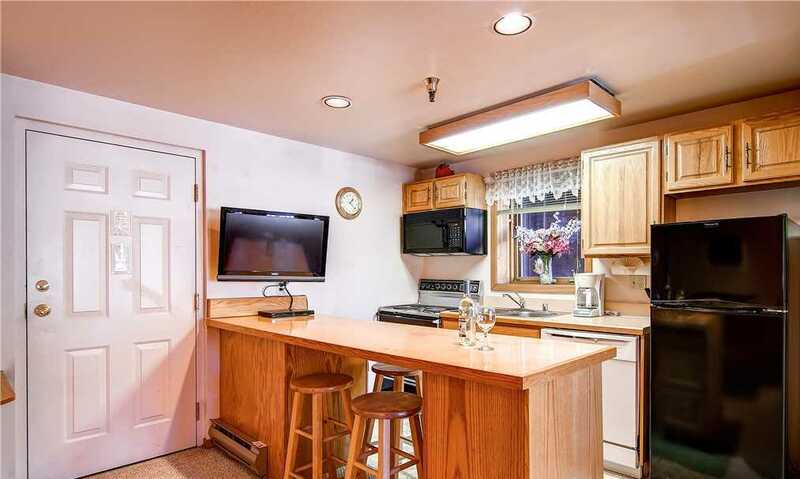 o Shuttle – 0.1 mile (4 min. 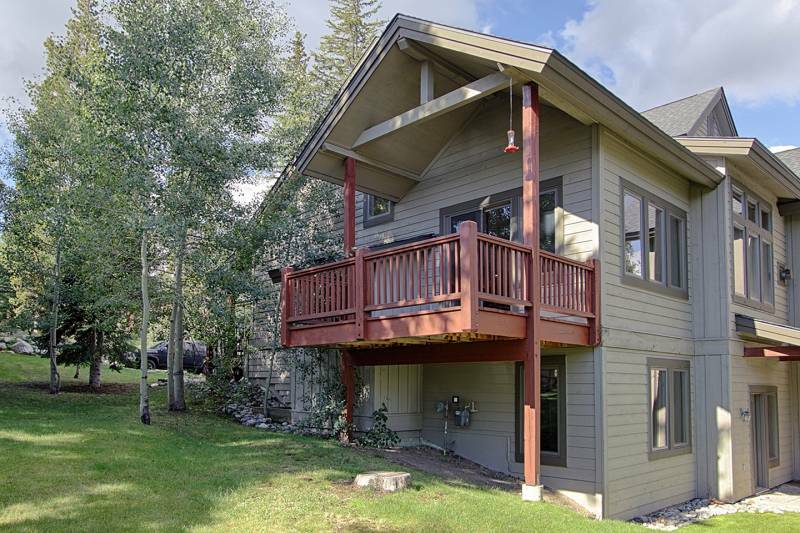 walk) to shuttle located on Baldy Rd.